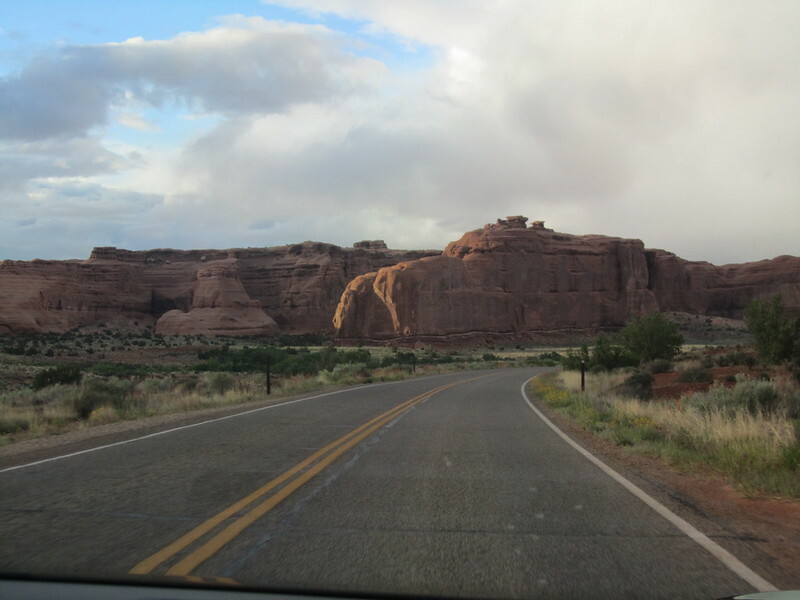 A quick note of thanks to the Beatles for inspiring the title for this series of posts. 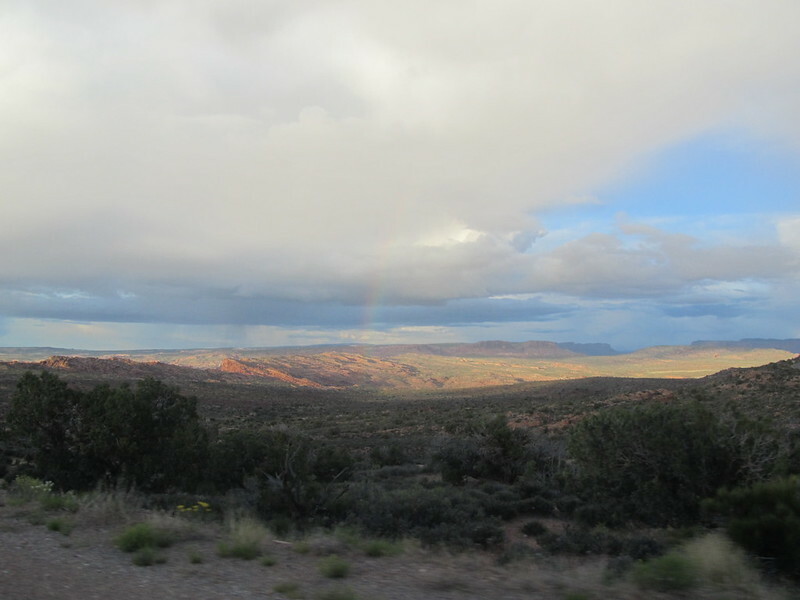 This is the twenty-third in a series of posts written about our trip that will be published four weeks to the day of the trip. 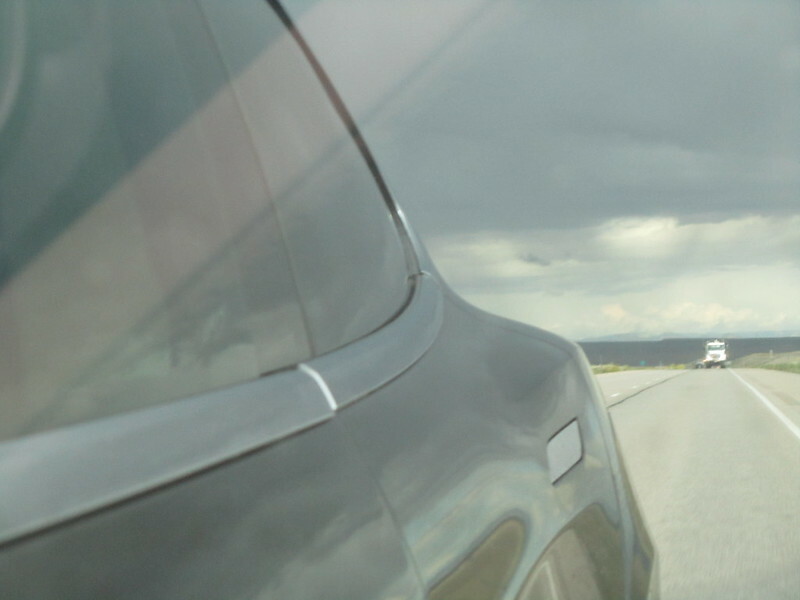 Missed Day 22, click here. 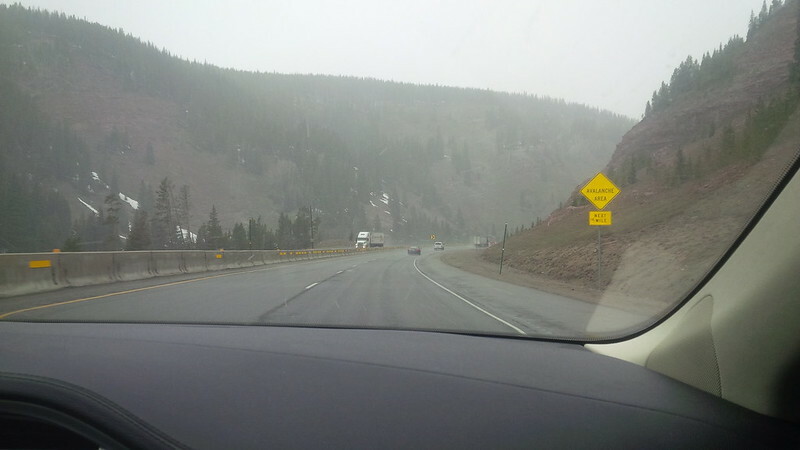 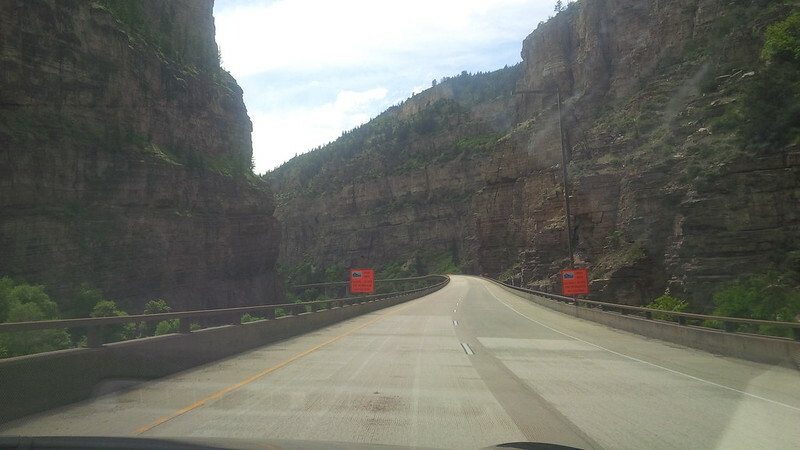 Yesterday’s drive was fun and scary at the same time. 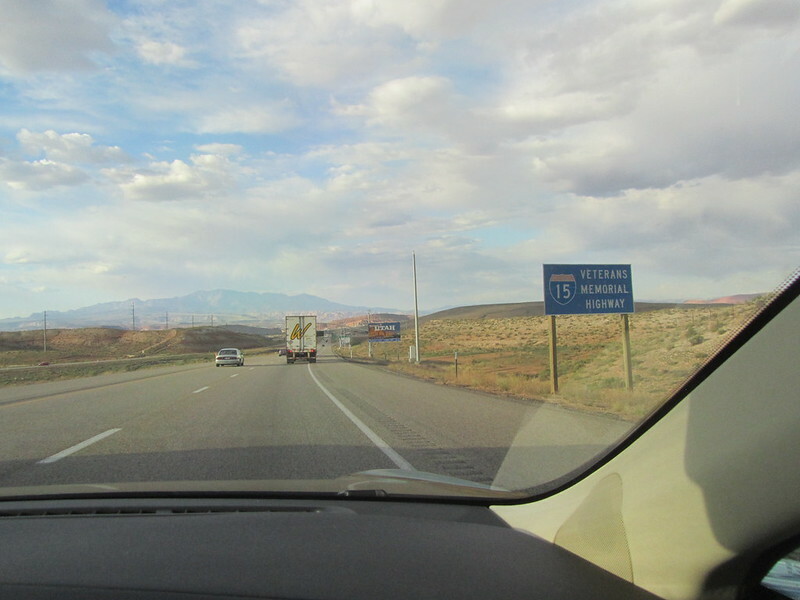 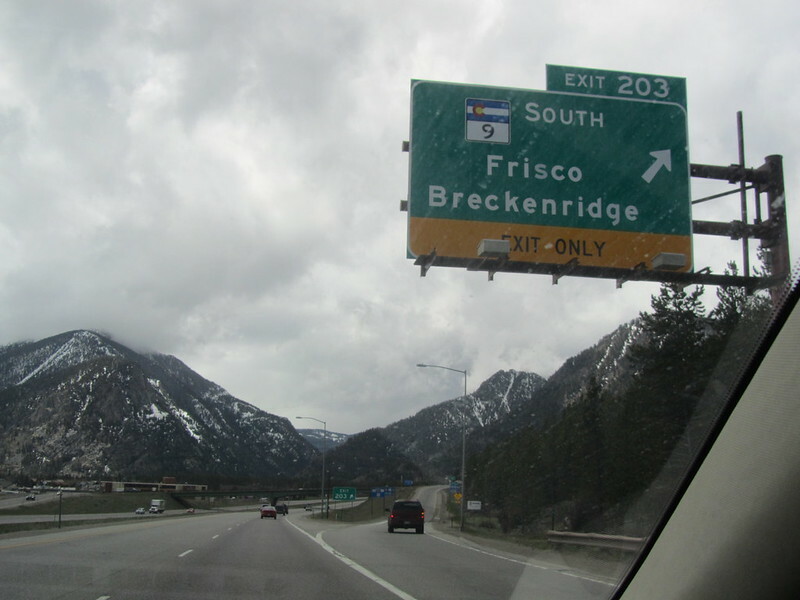 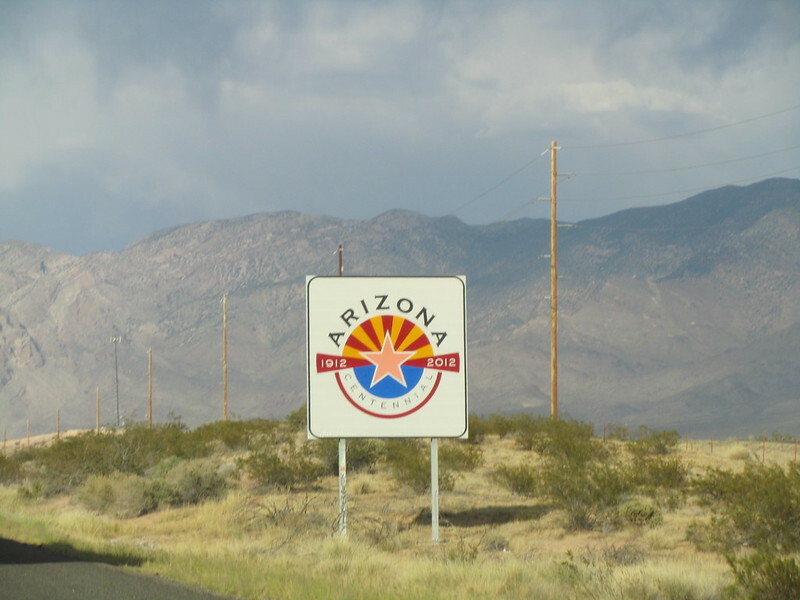 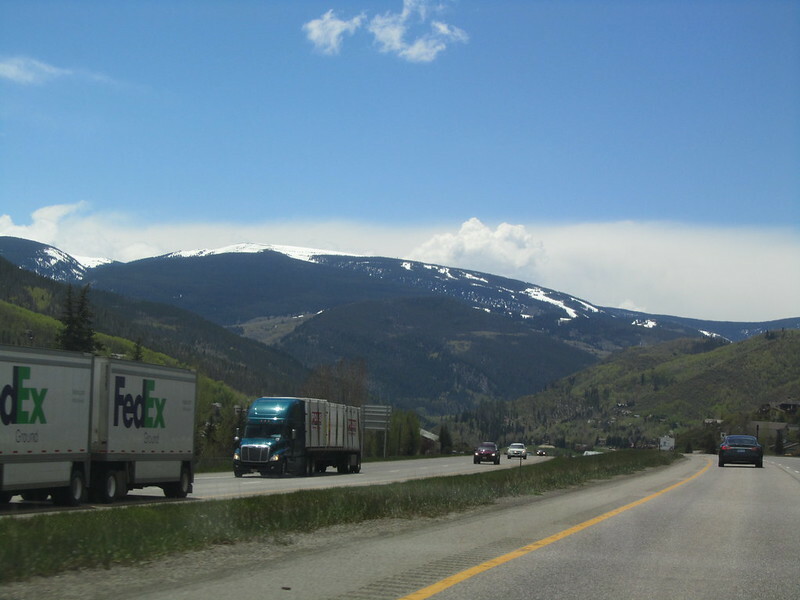 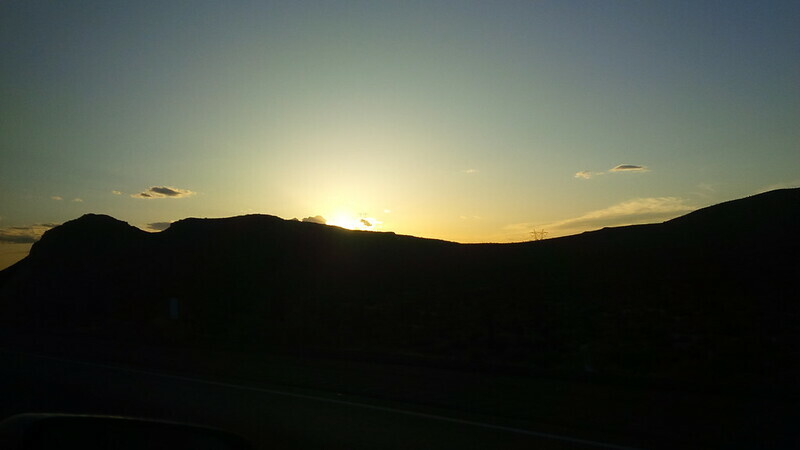 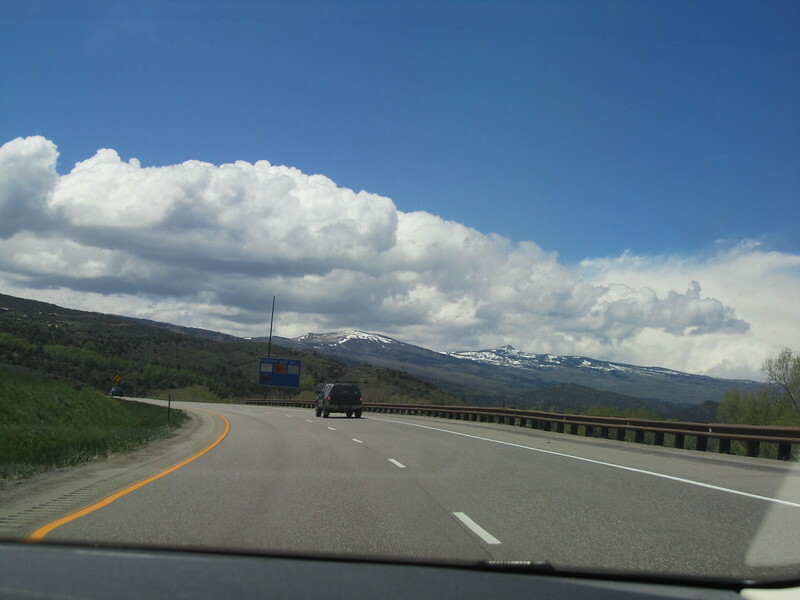 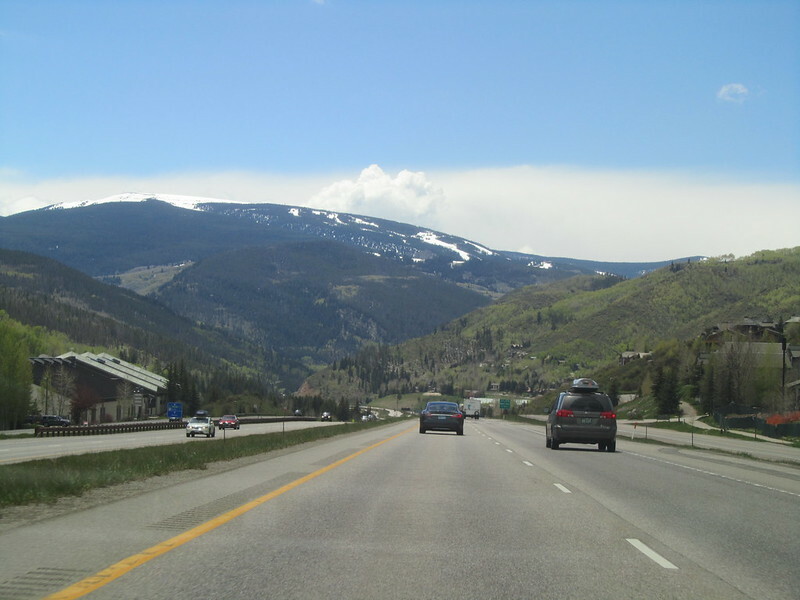 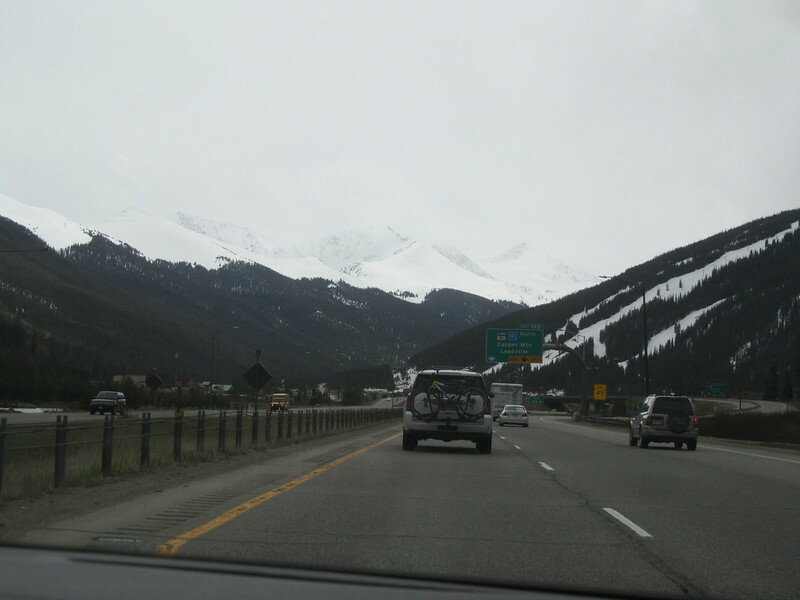 We decided to head South on I-15 when we reach it rather than North and through a longer way back to Southern California. 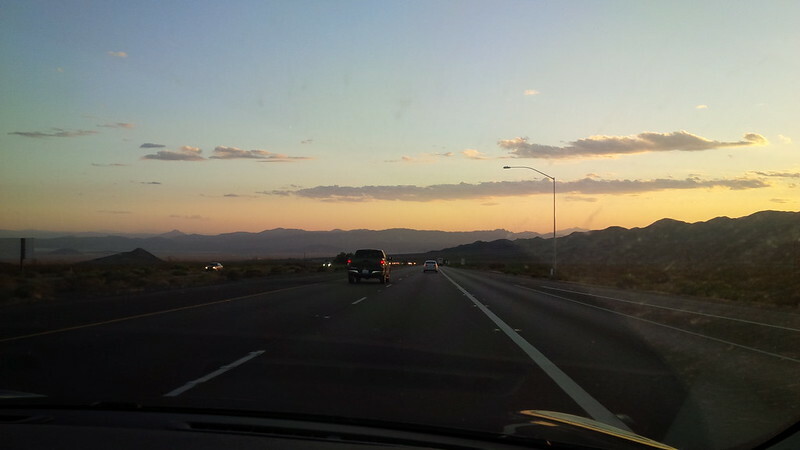 The question at the start of the day is where do we stop tonight? 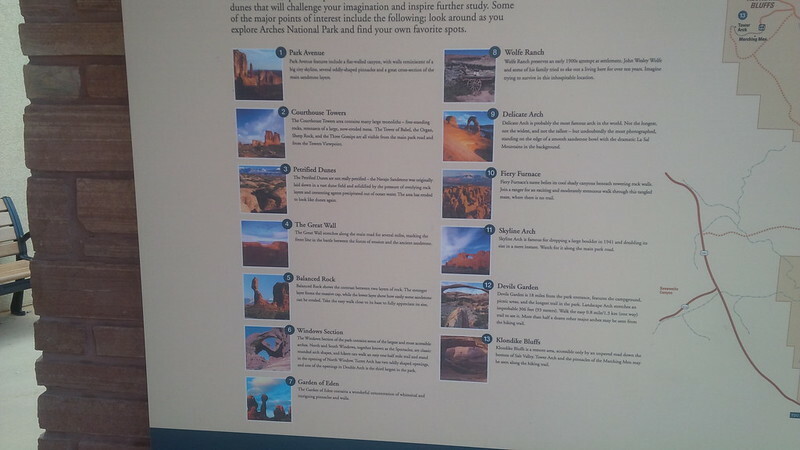 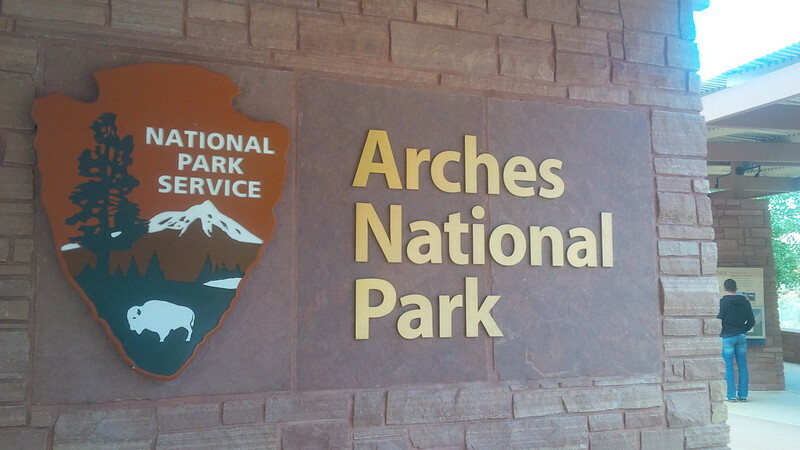 There are many National Parks to visit in Utah and we got to the one that was top of my list. 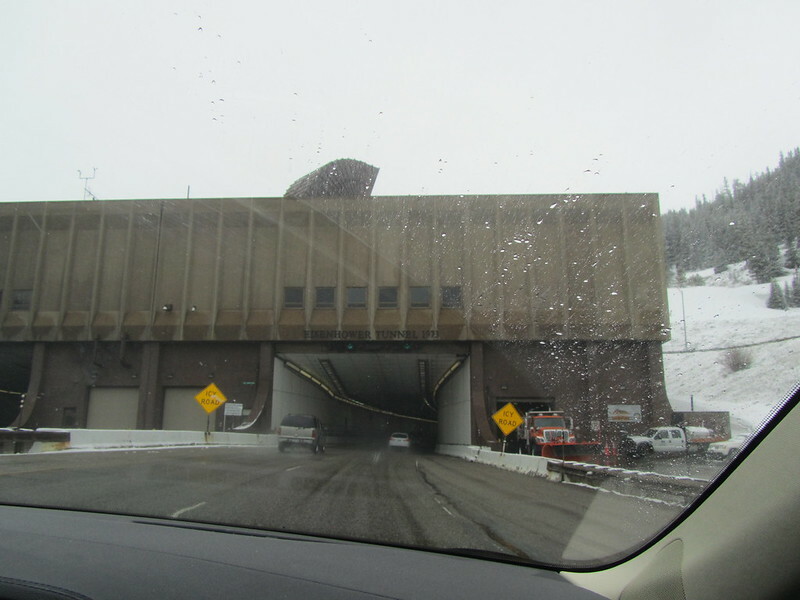 Mainly because I like to drive through this process and not necessarily get out of the car, I’m kind of funny that way. 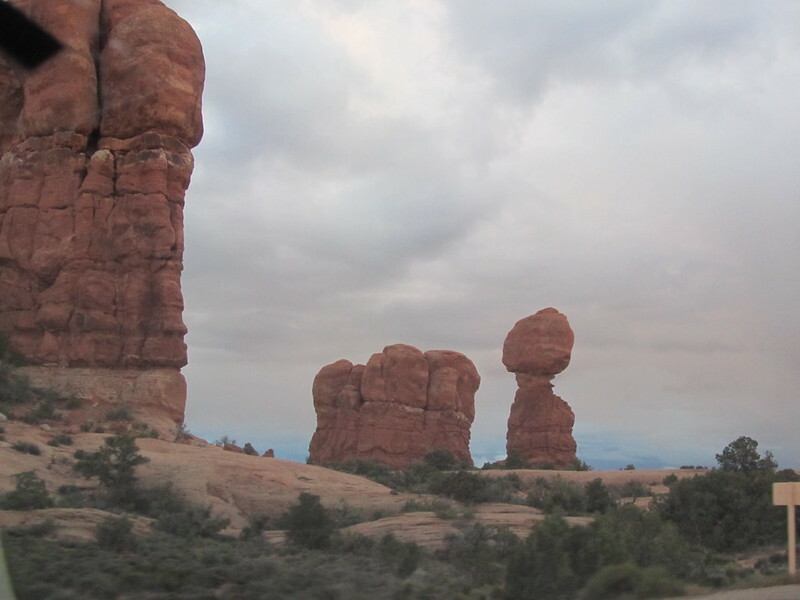 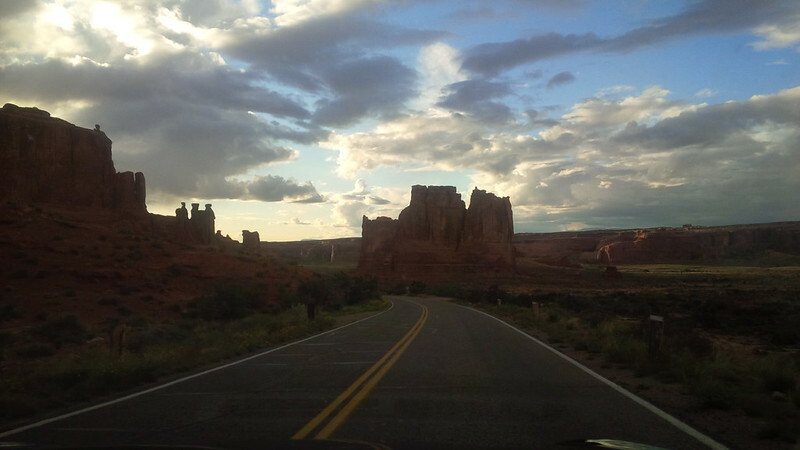 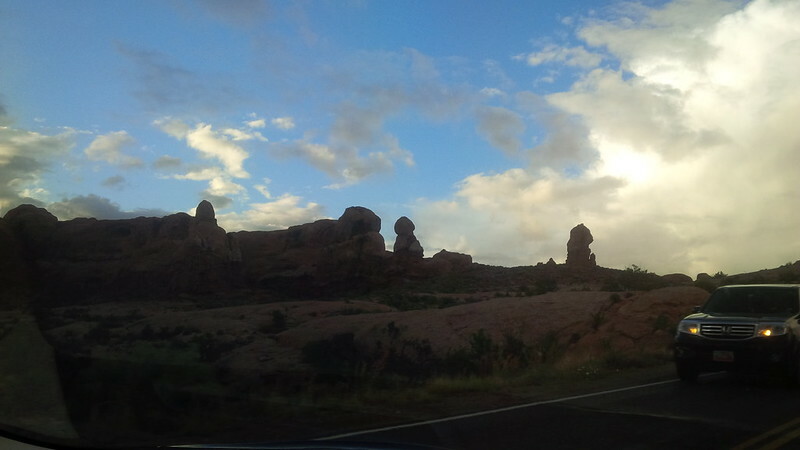 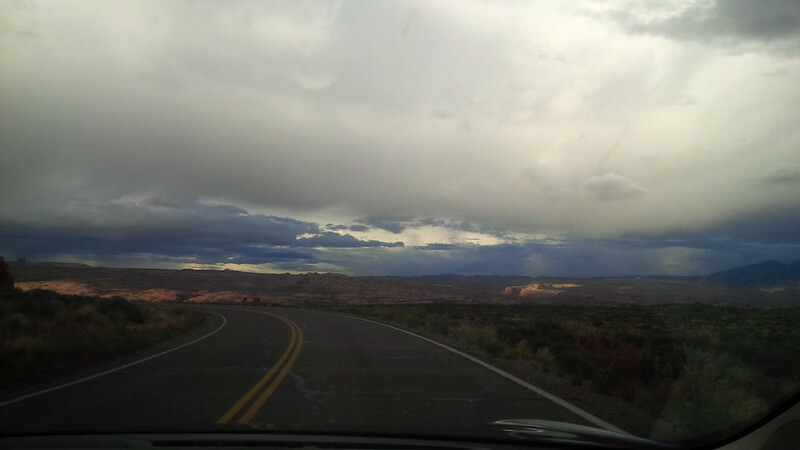 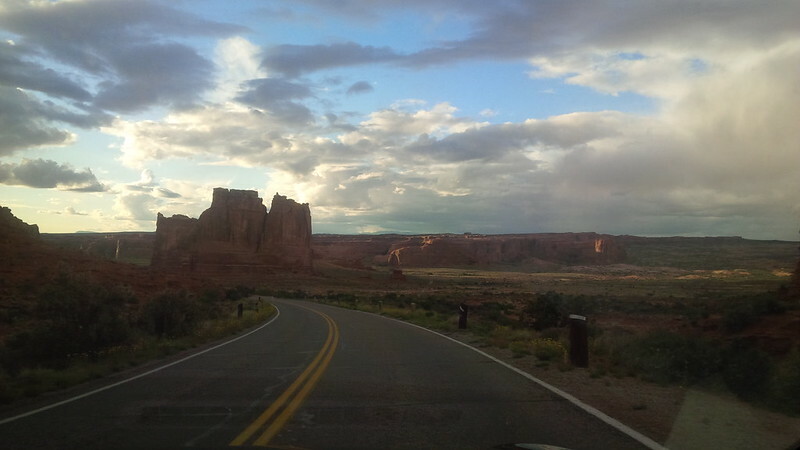 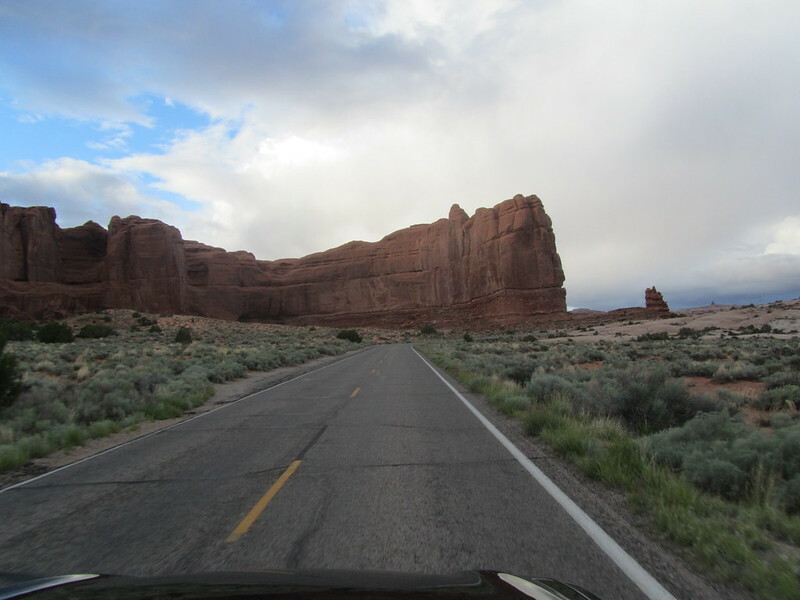 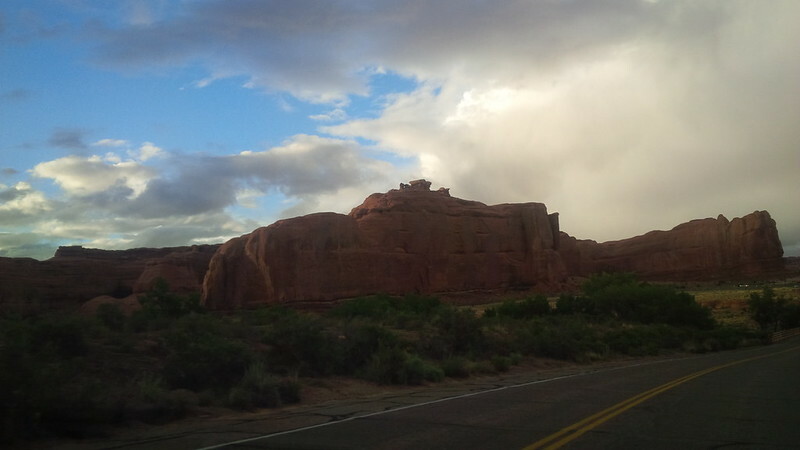 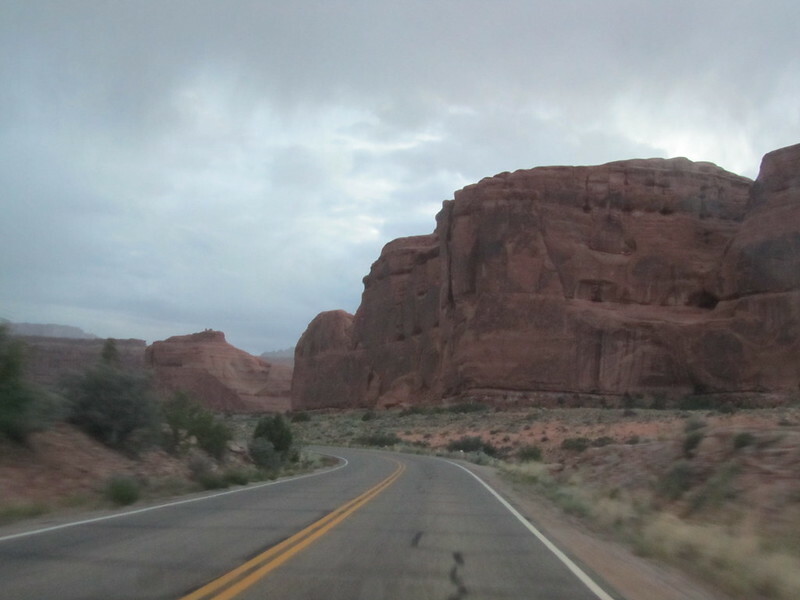 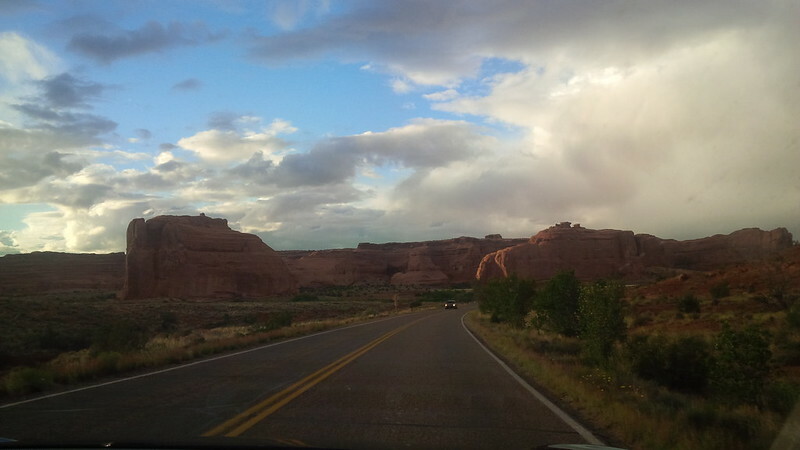 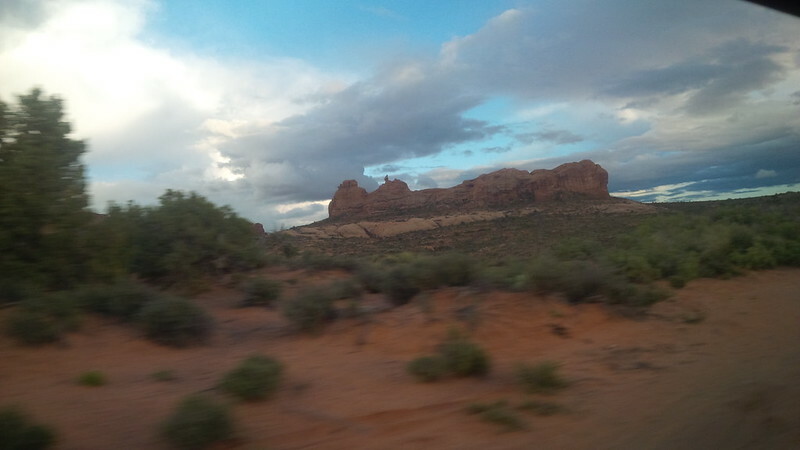 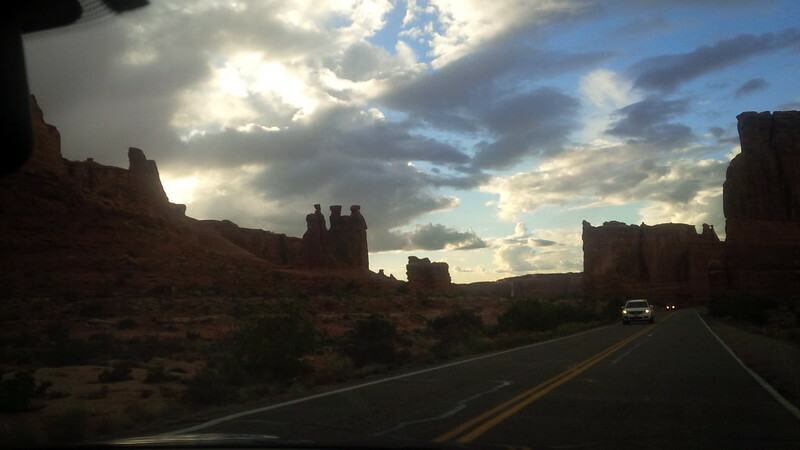 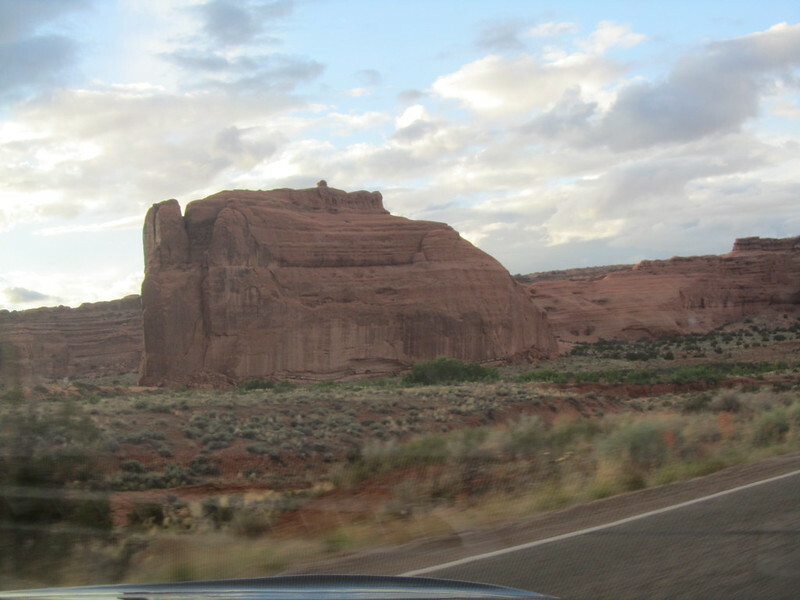 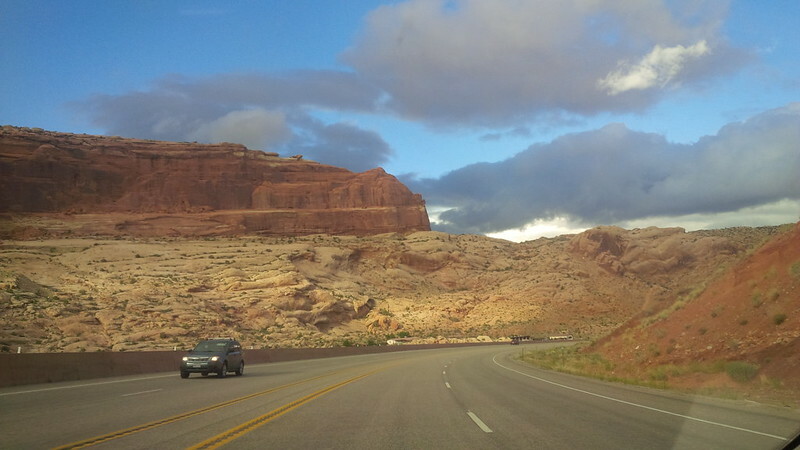 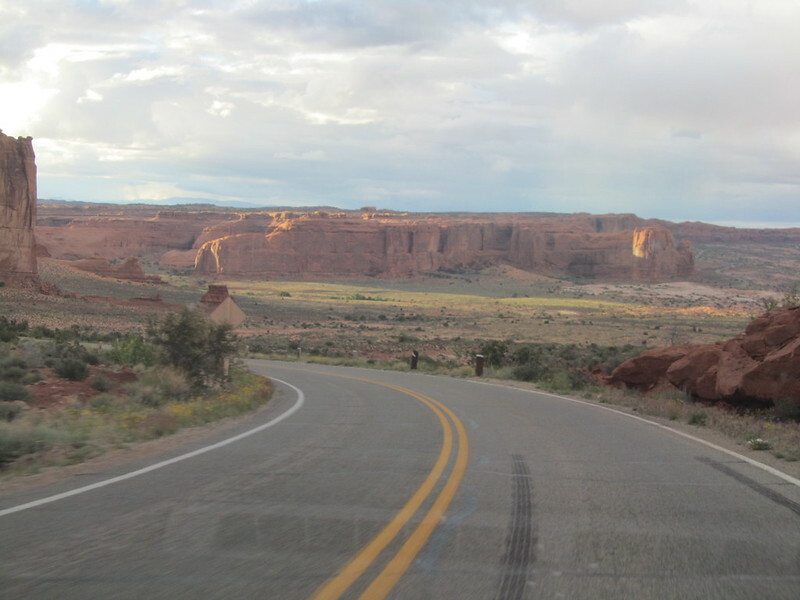 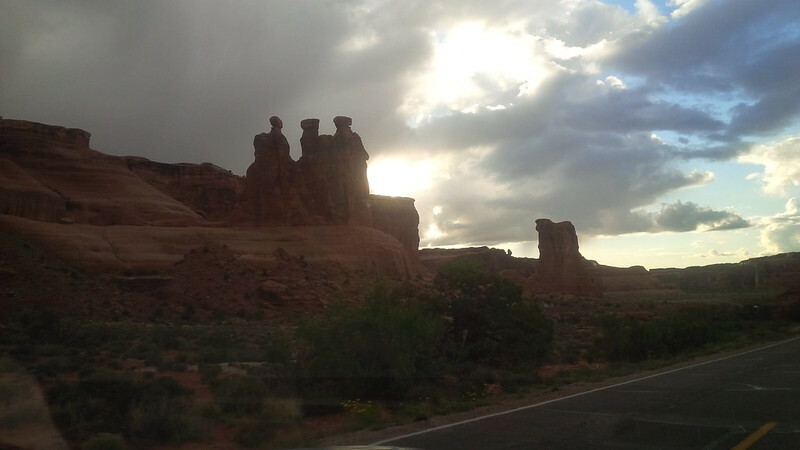 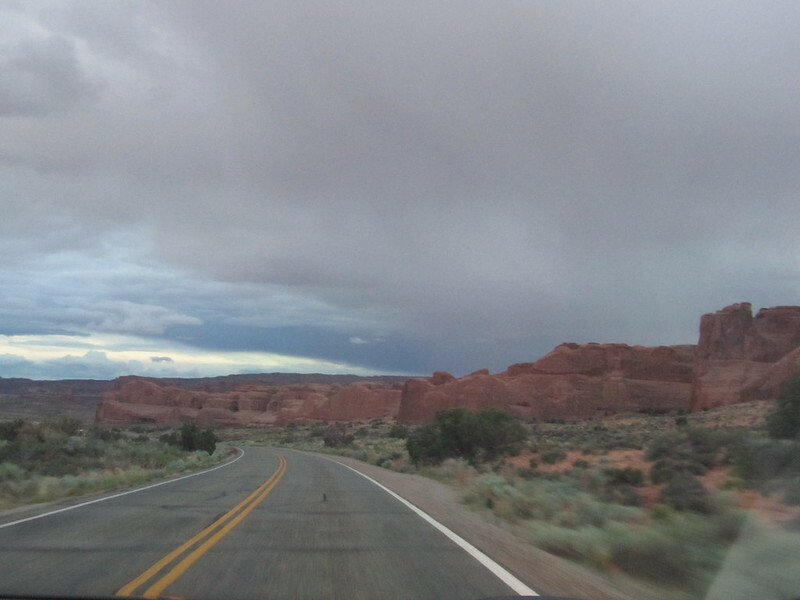 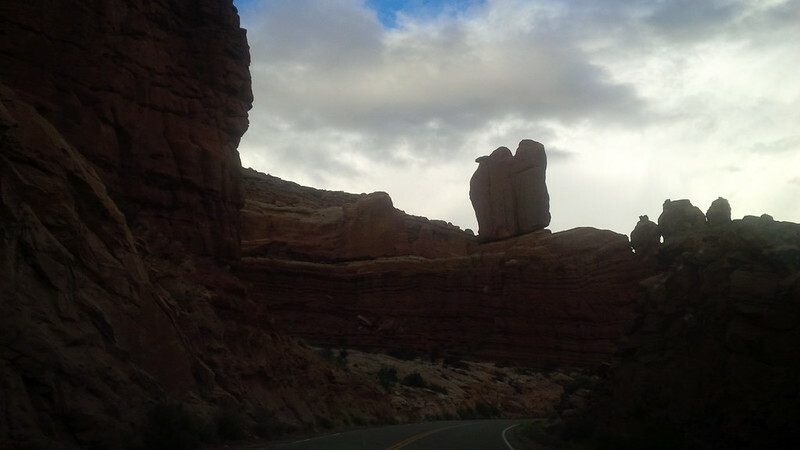 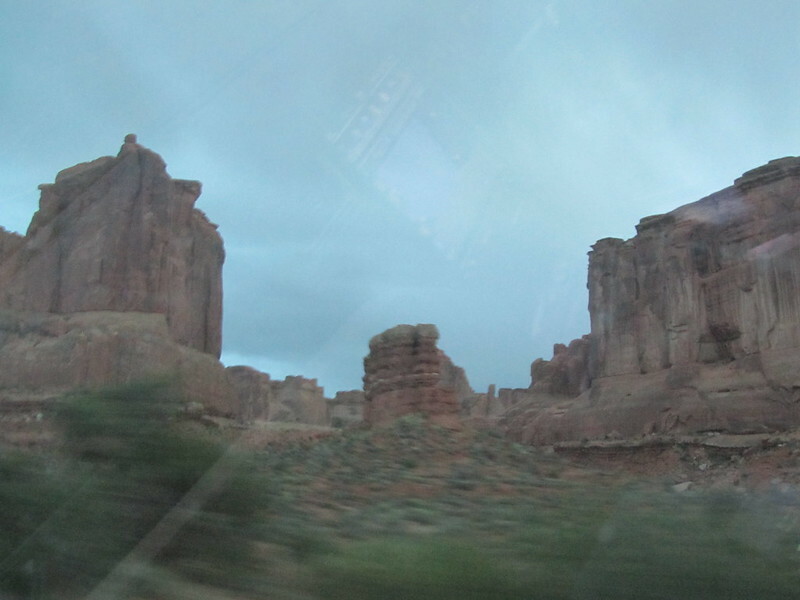 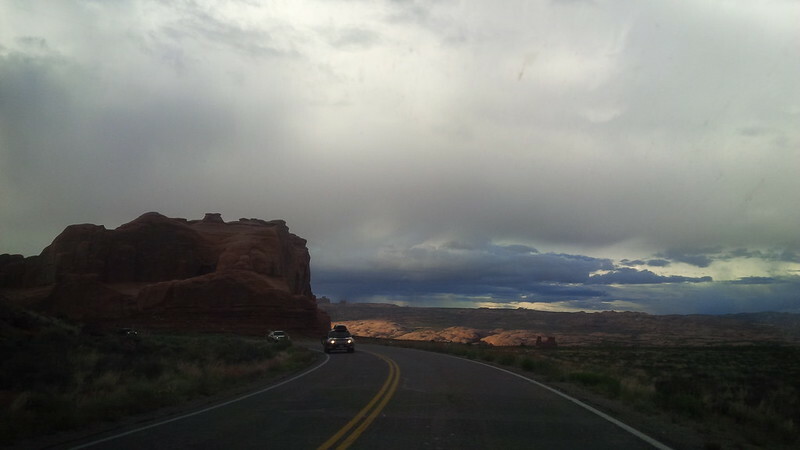 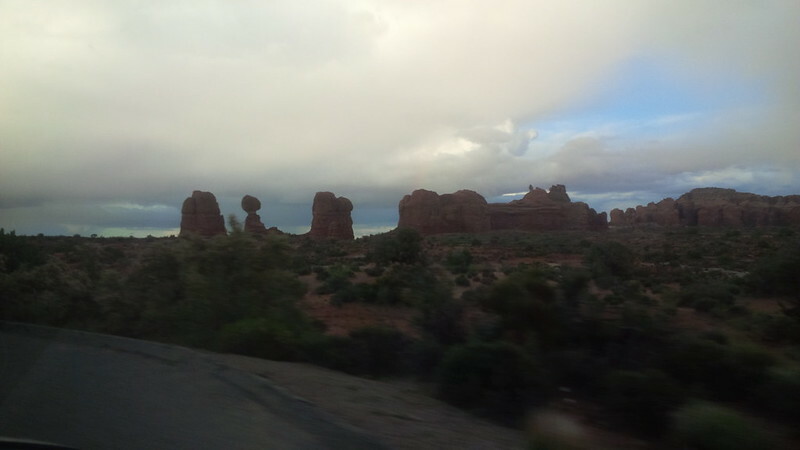 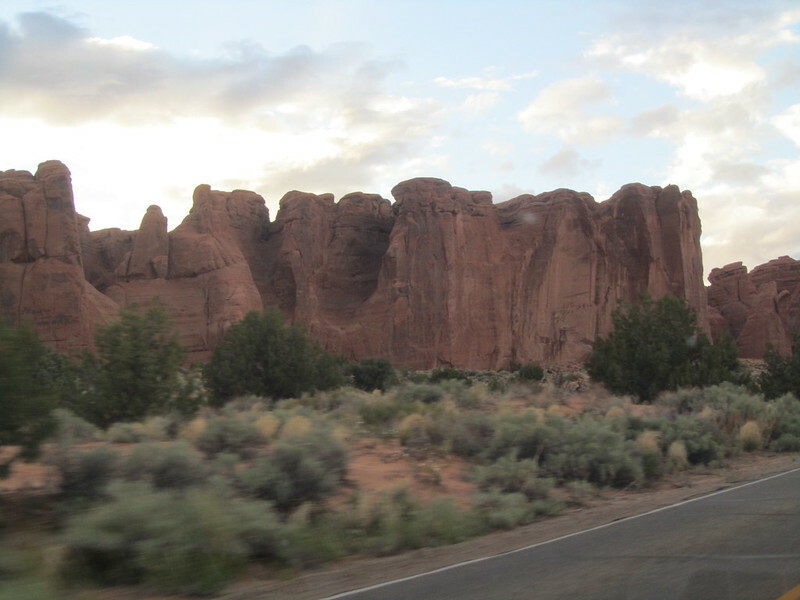 The only other place I wanted to drive through in Utah was Monument Valley. 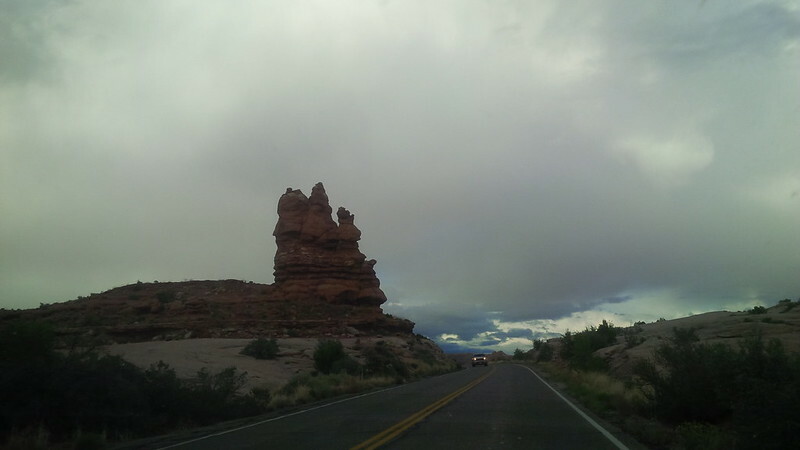 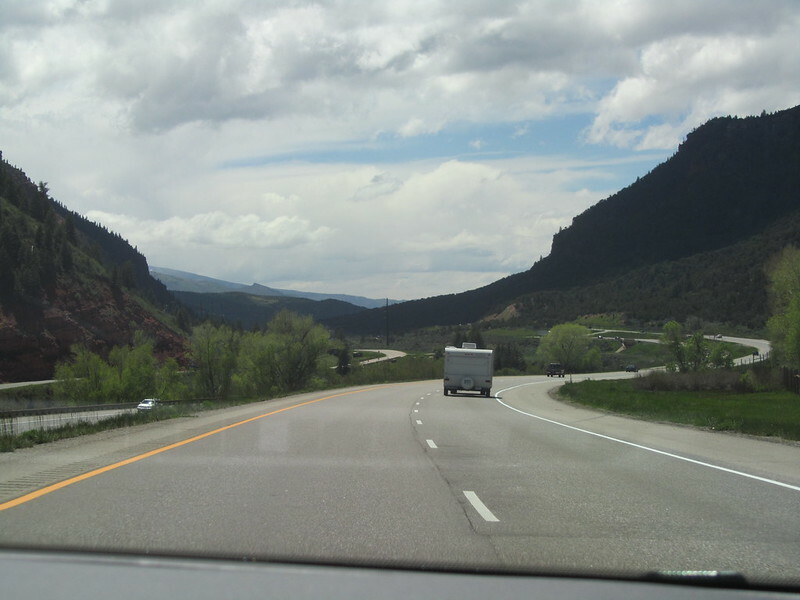 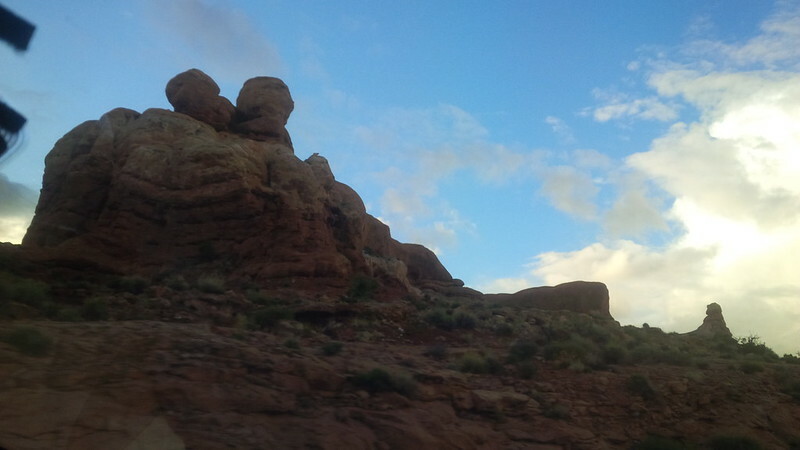 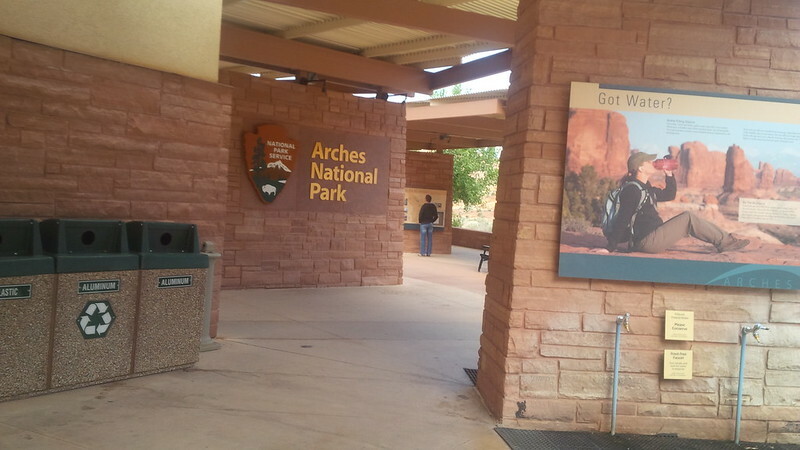 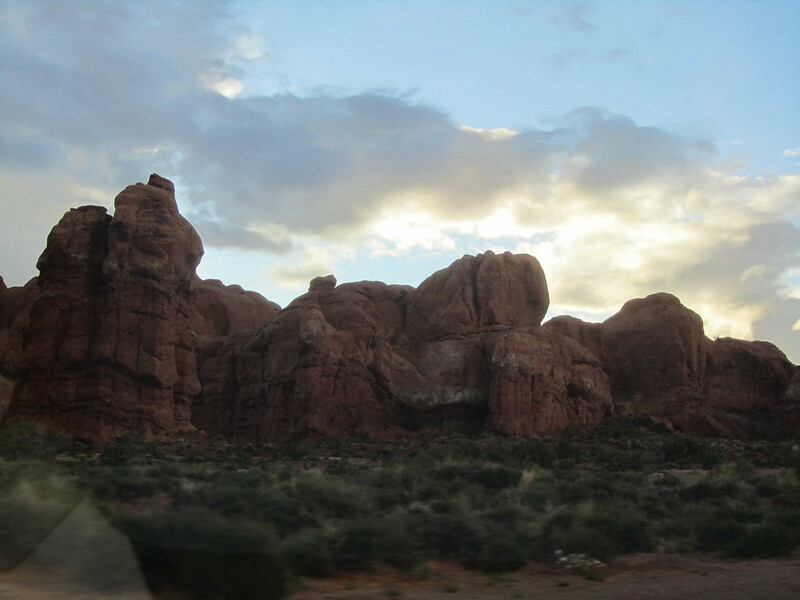 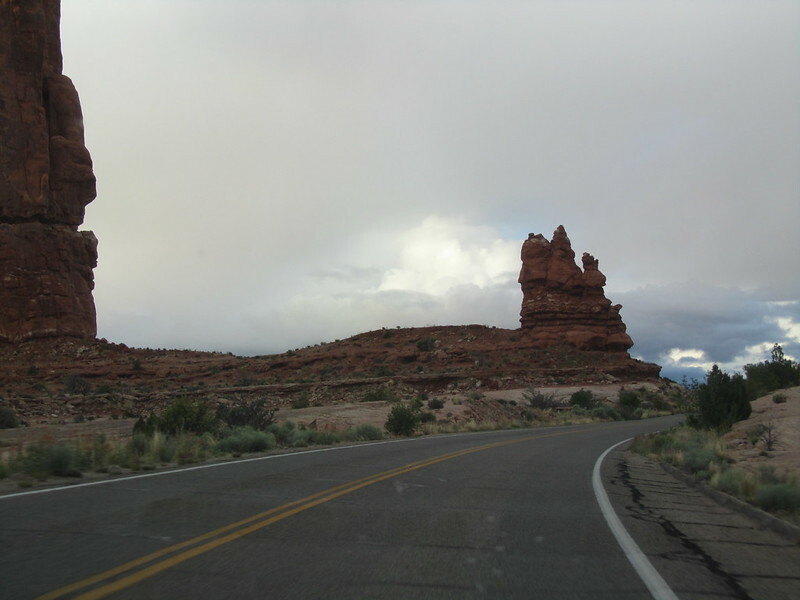 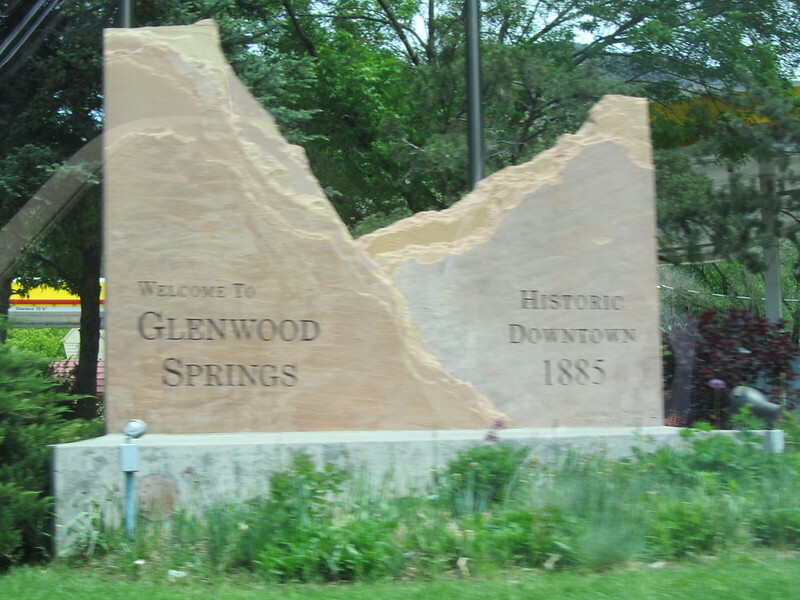 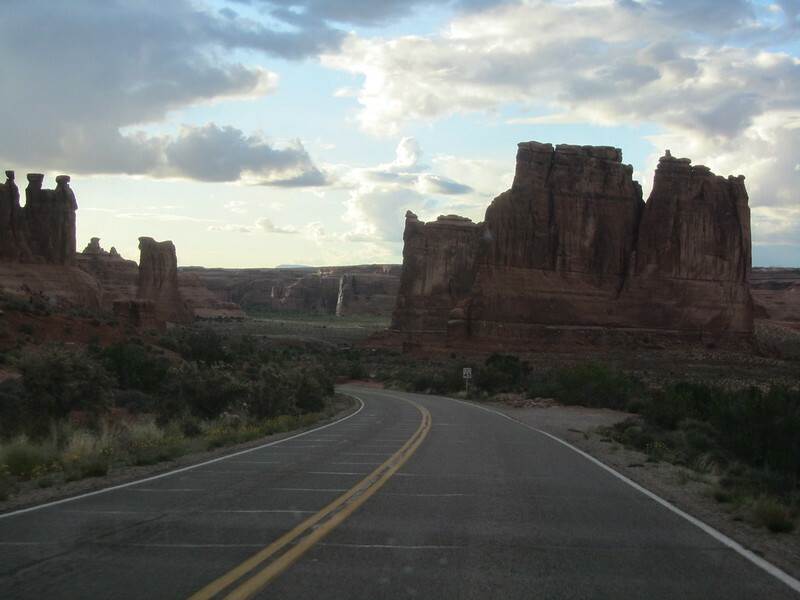 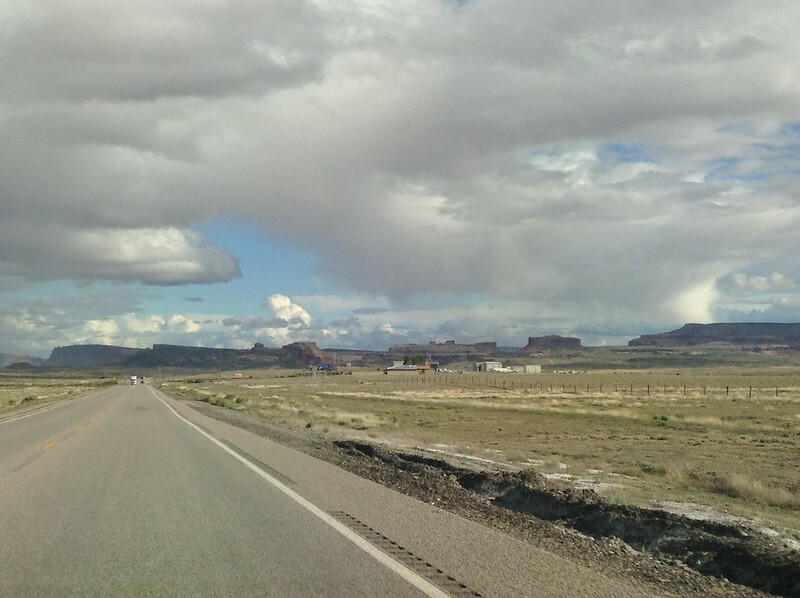 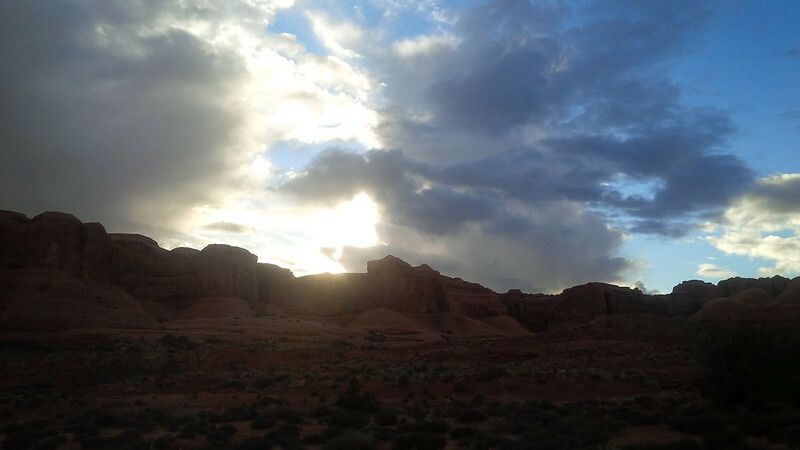 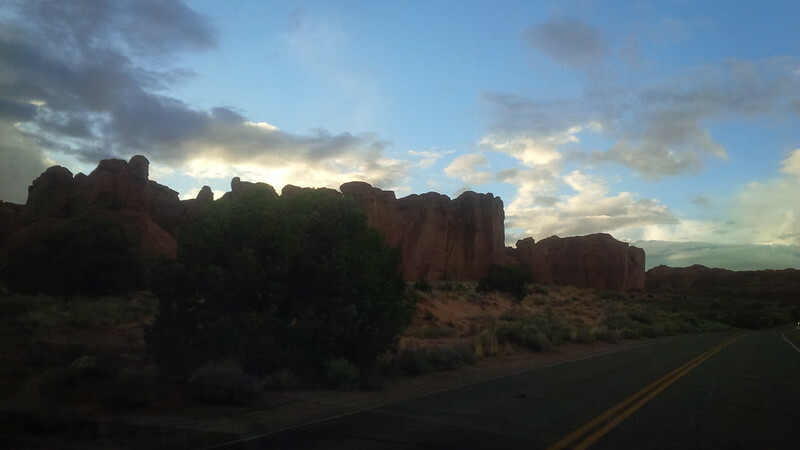 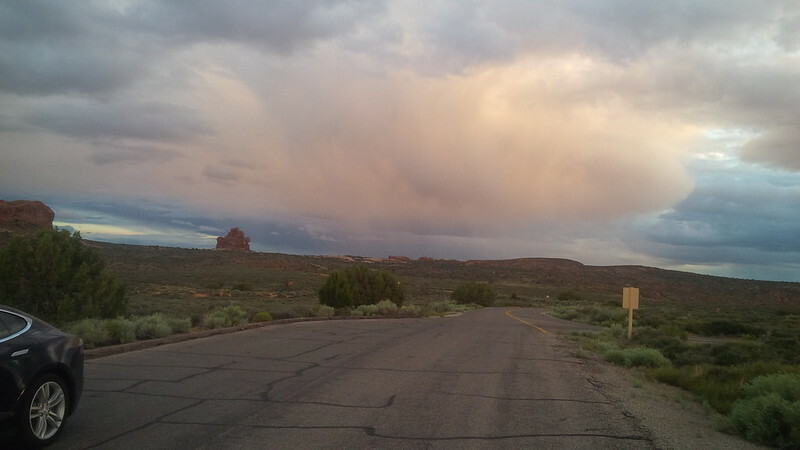 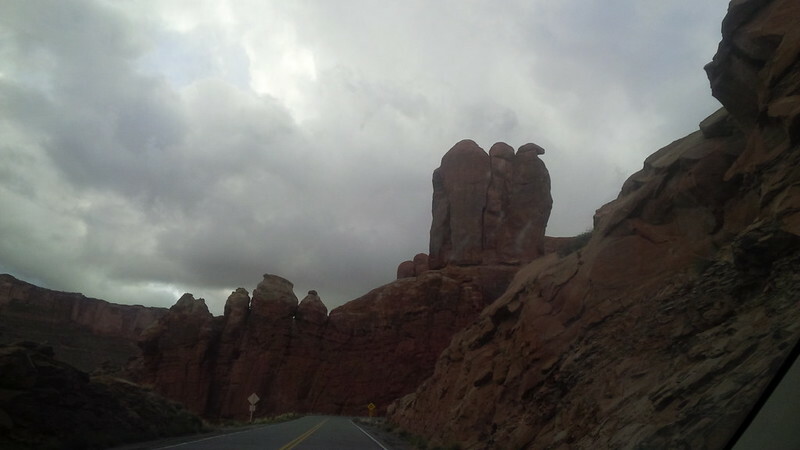 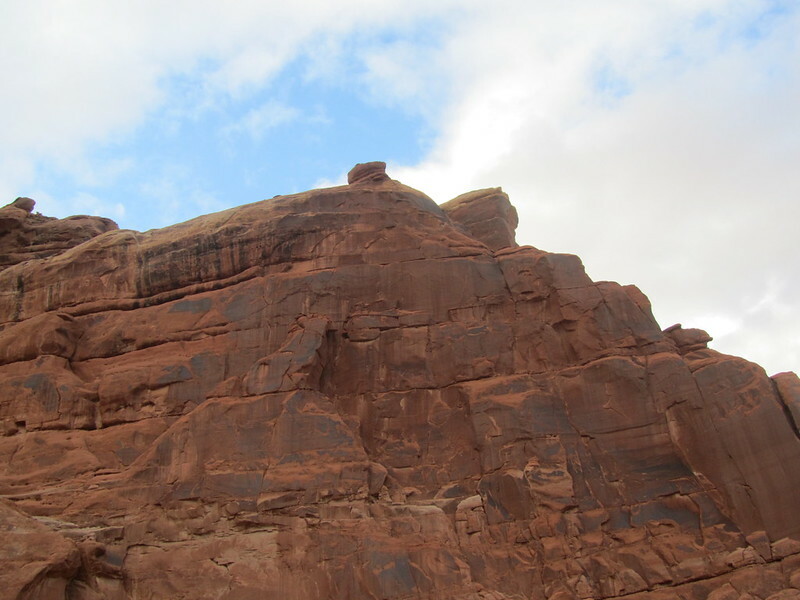 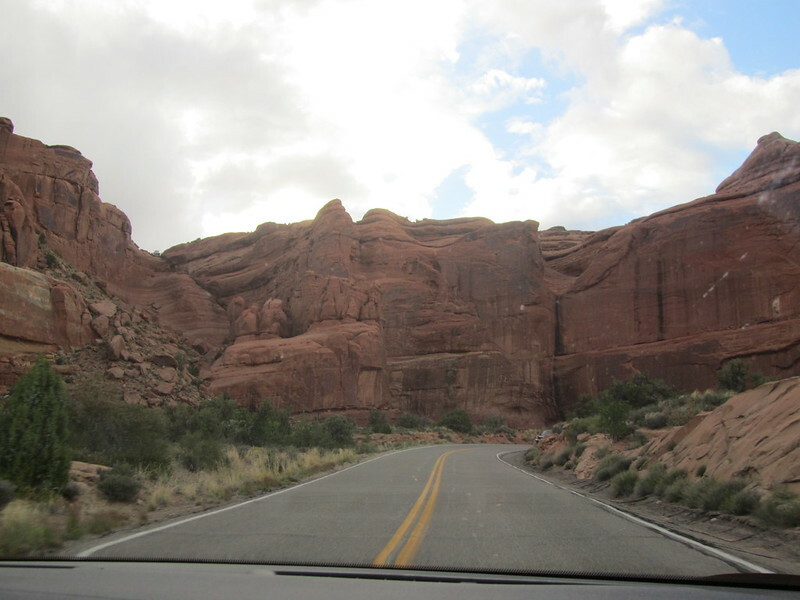 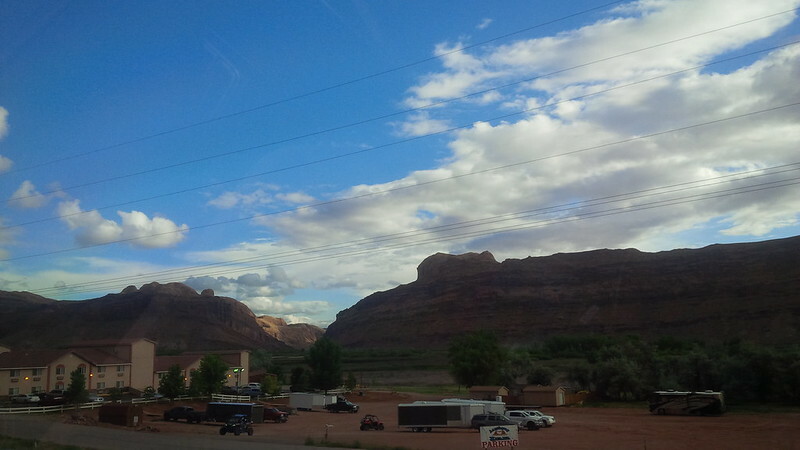 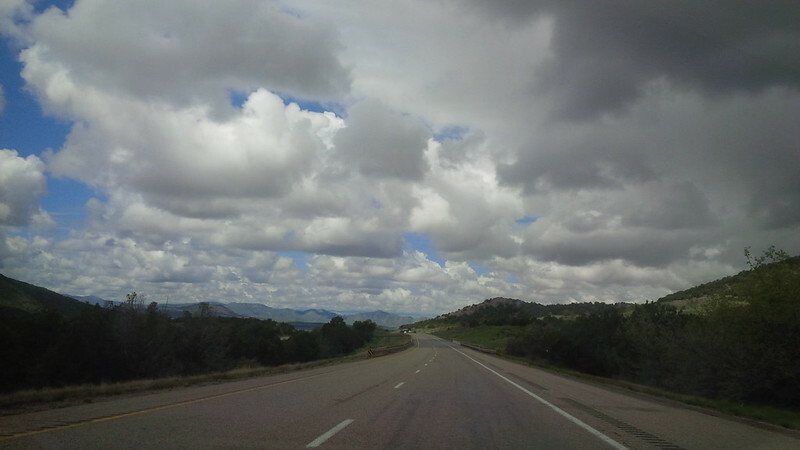 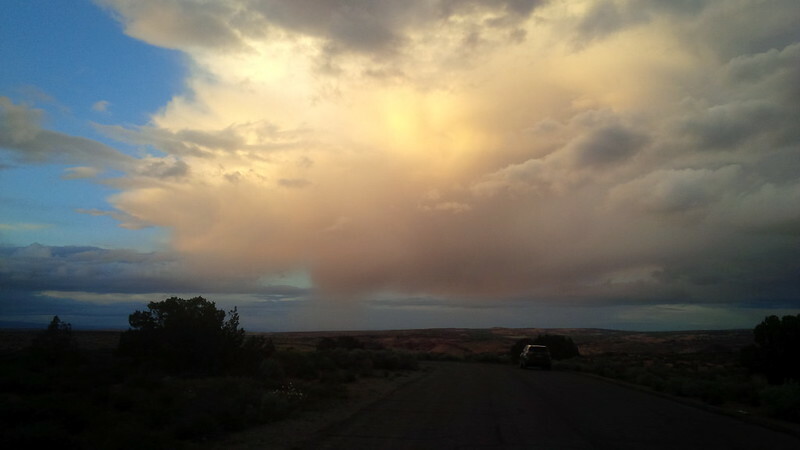 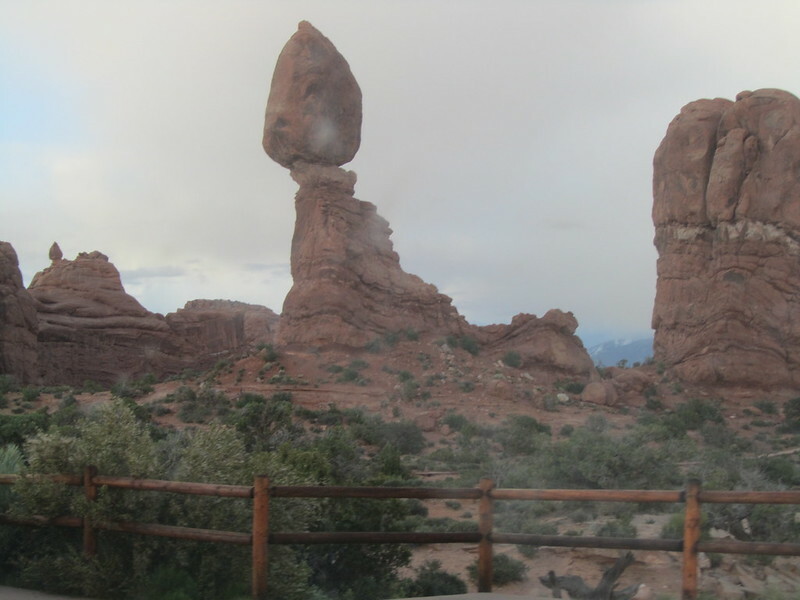 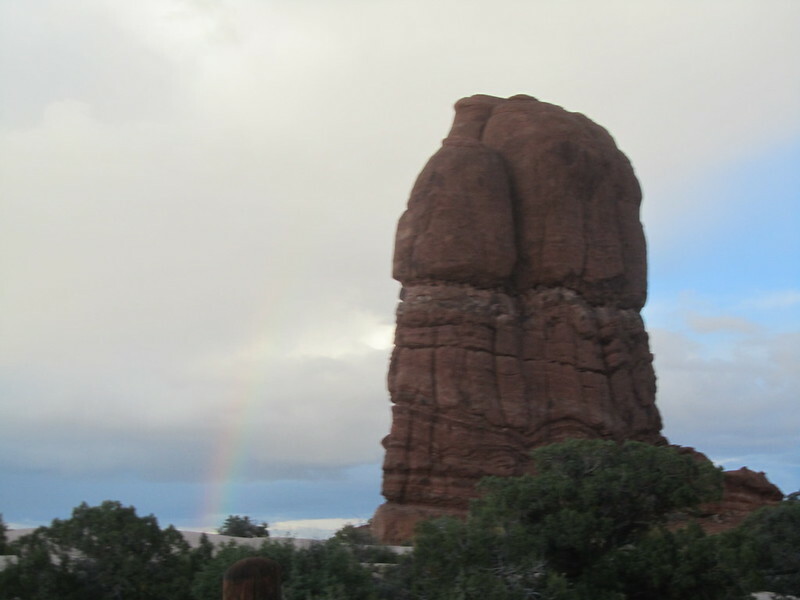 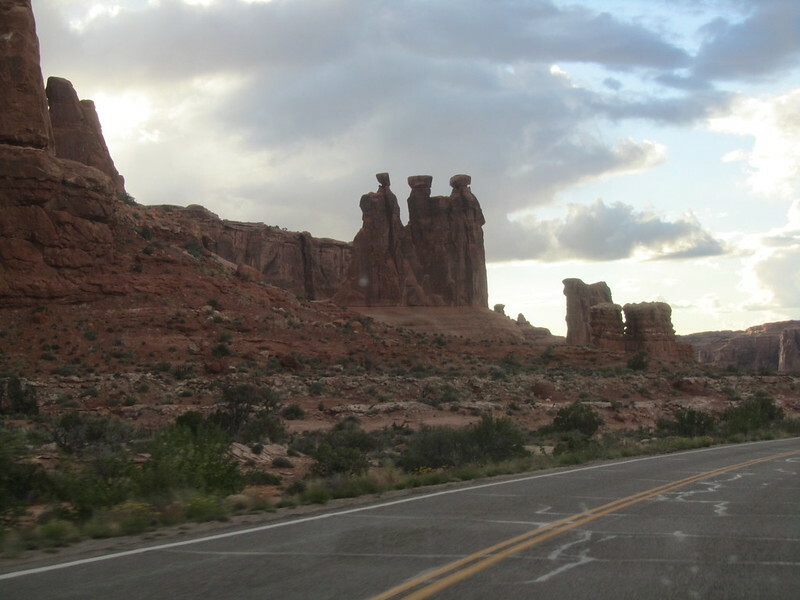 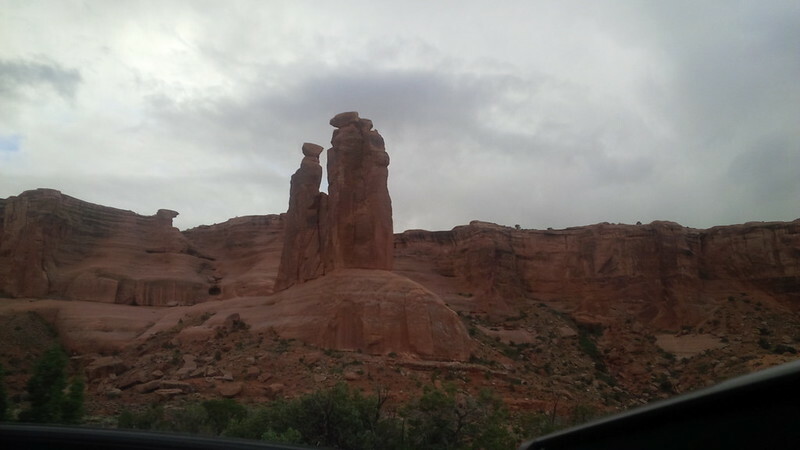 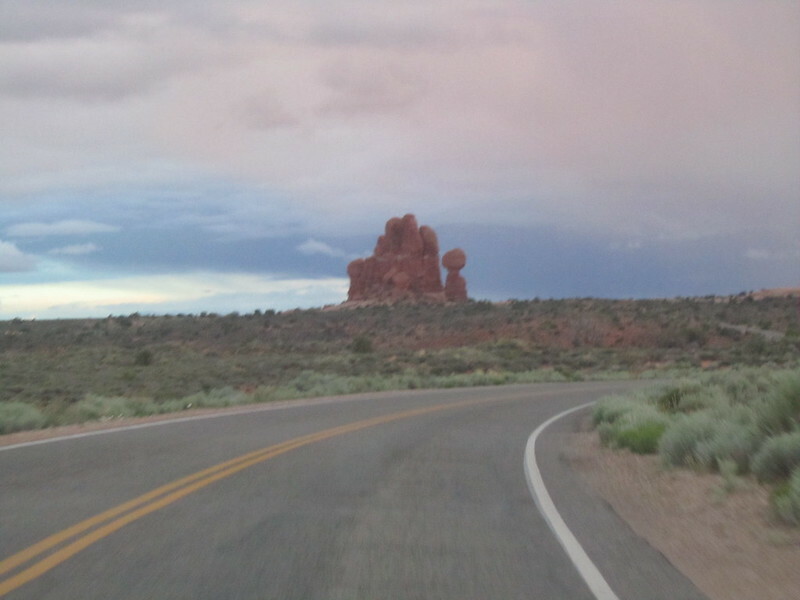 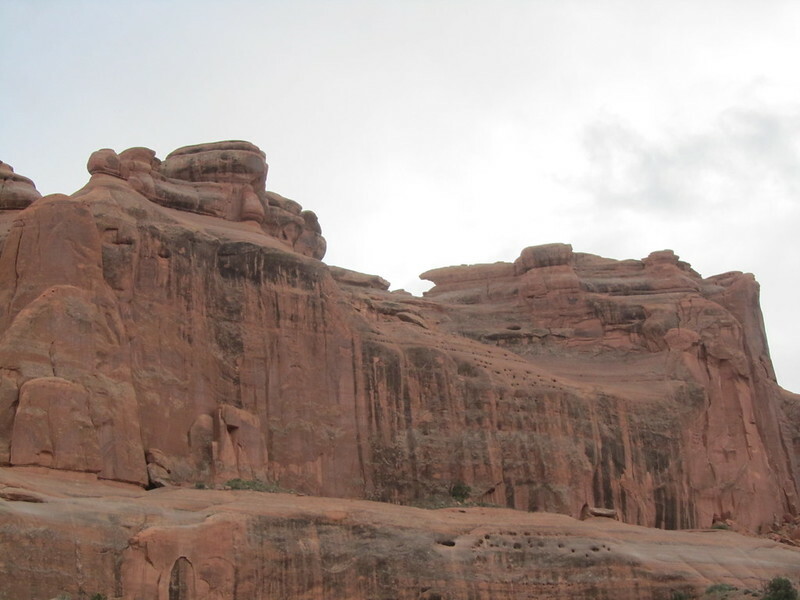 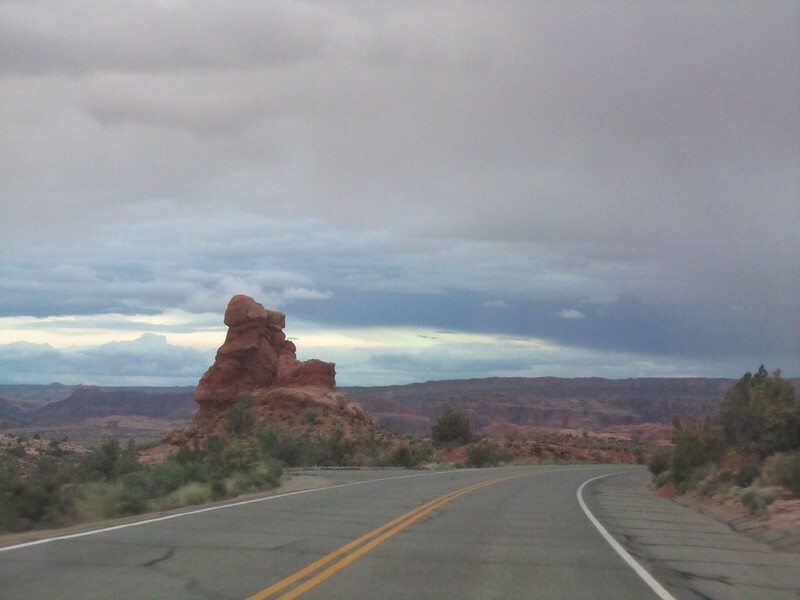 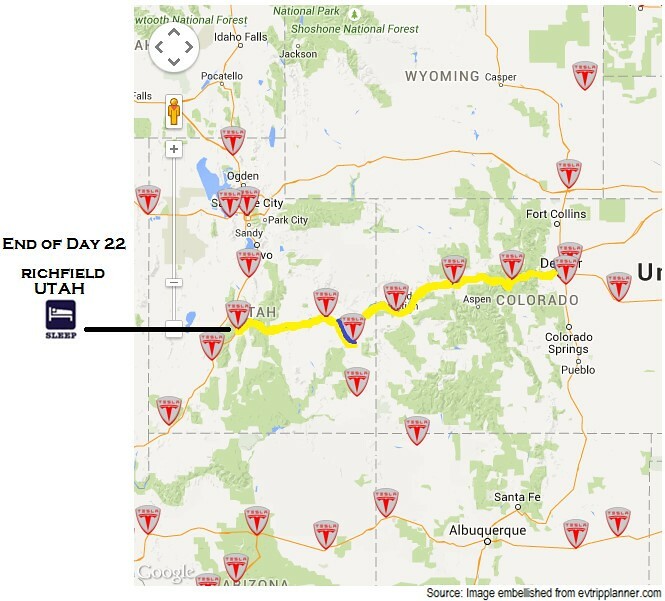 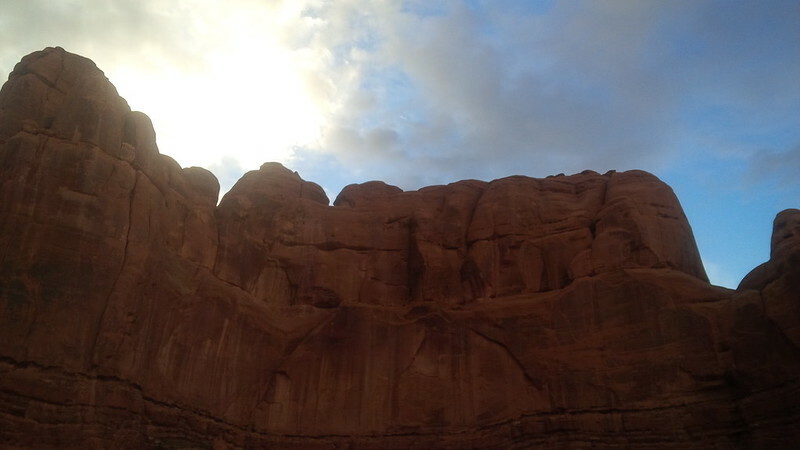 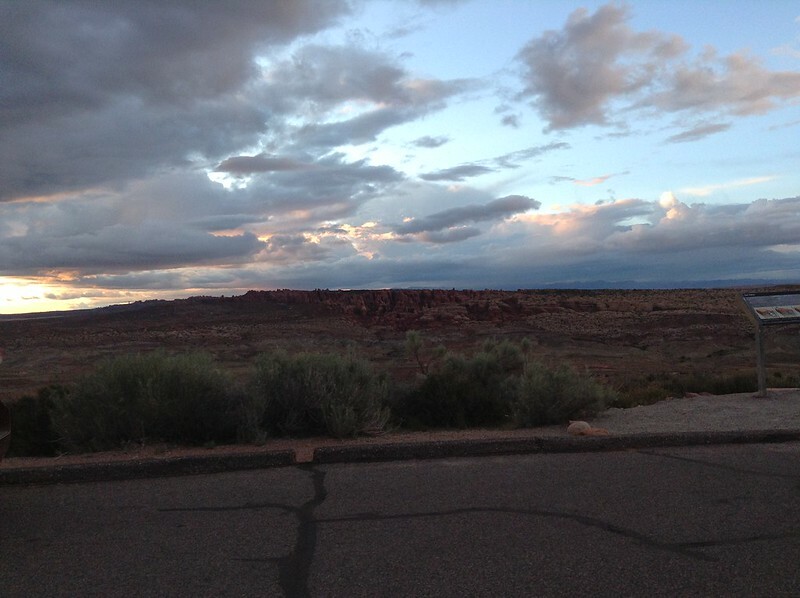 Unfortunately, we drove a different direction from that location when we left Moab and proceeded to stay the night in Richfield, a location several hundred miles away. 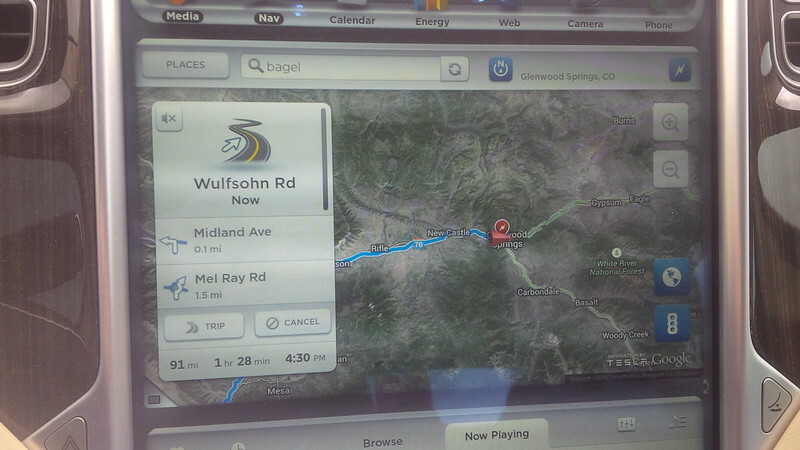 It seems like the superchargers between Blanding, UT and Flagstaff, AZ would be a really hard stretch (251 miles per Google) and though the car on a max charge can do 255 miles, I didn’t want to backtrack to Moab and beyond. 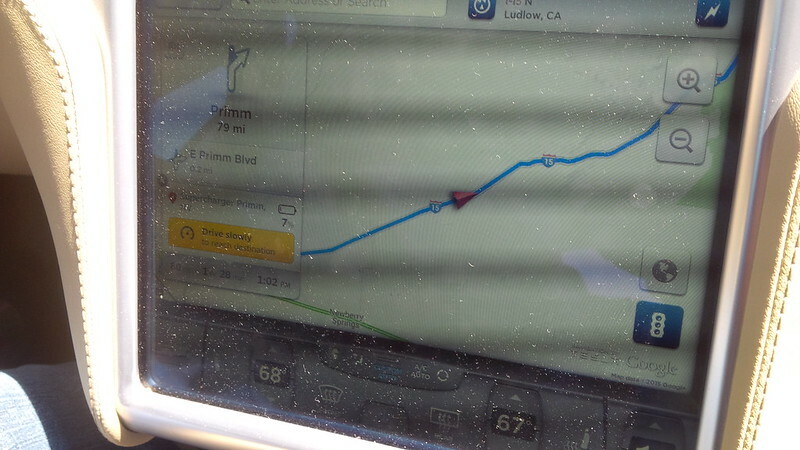 Additionally, I’m not sure as to the state of the three mobile providers that we have for that 251 Mile stretch (in case we needed to call for help.) 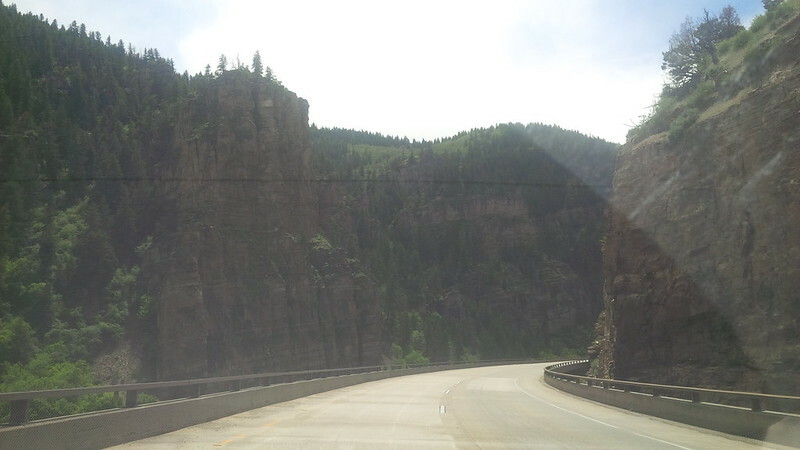 We decided to abandon that area of the country for this trip. 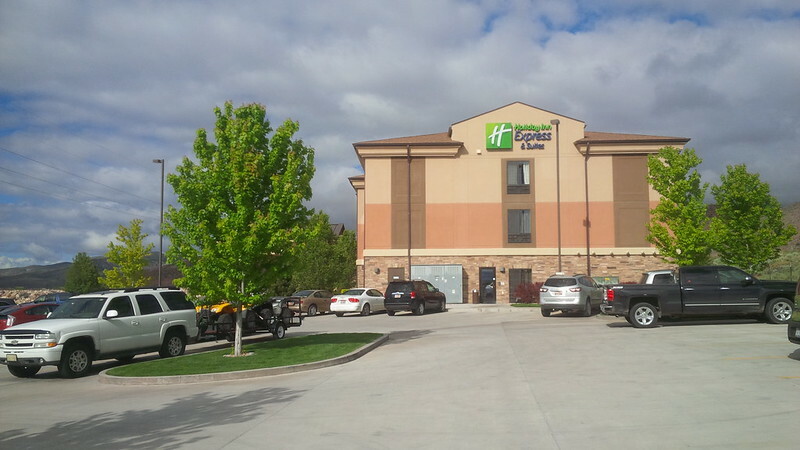 Either way, after the fiasco of a stay that was the Omni Hotel Interlocken, we were glad to have had the comfort and consistency of the Holiday Inn Express. 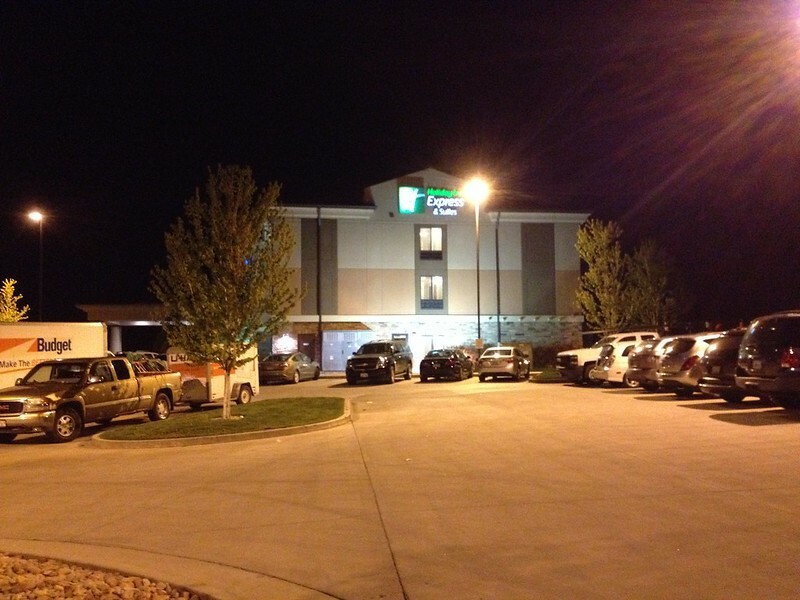 Though the hotel is considered a “limited service” class of hotel, their hospitality was top notch. 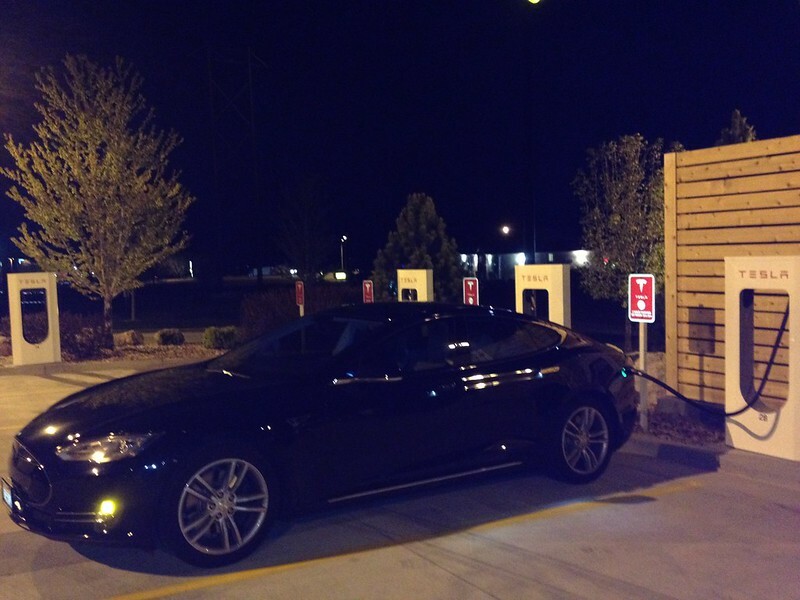 Additionally being a hosting site for the supercharger is a huge plus. 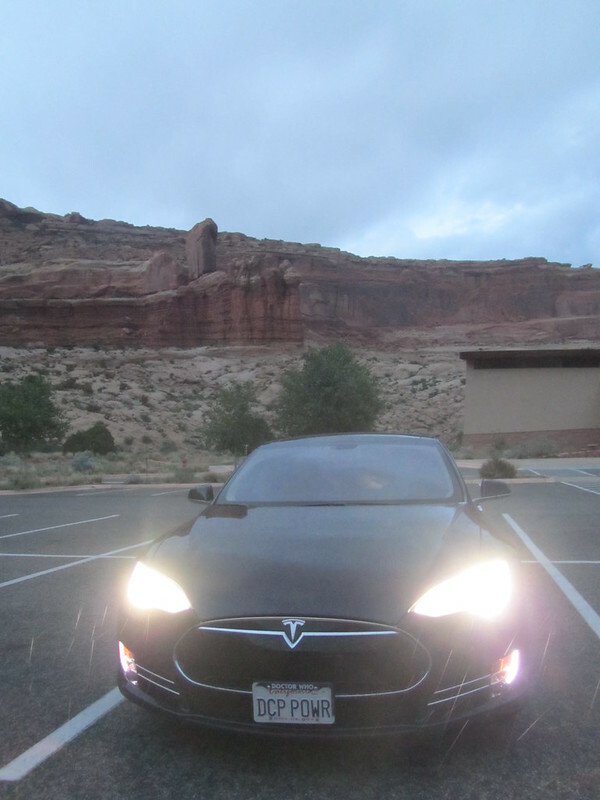 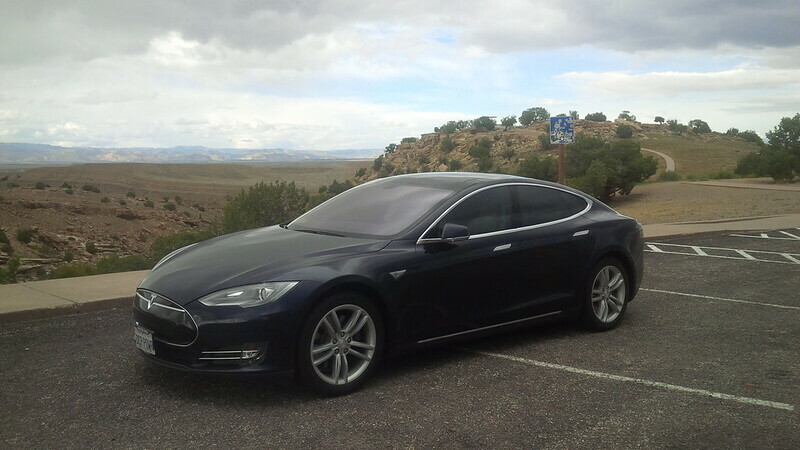 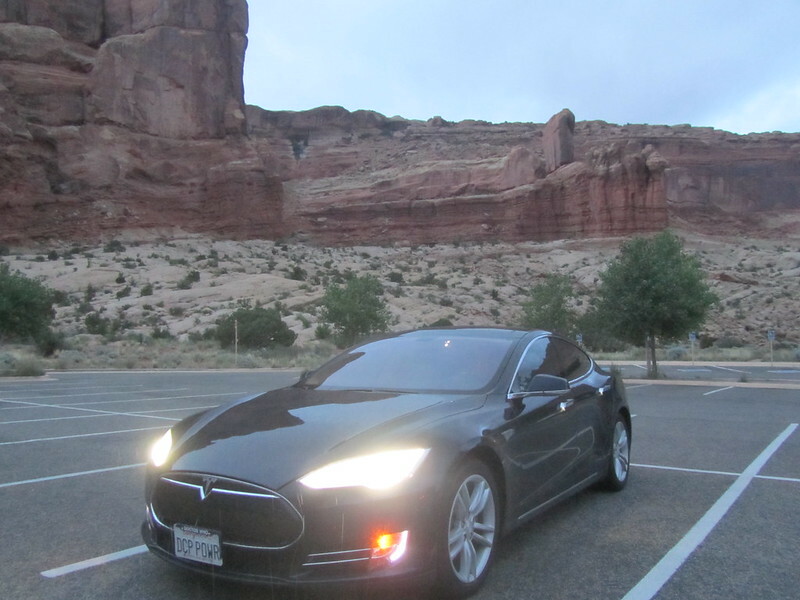 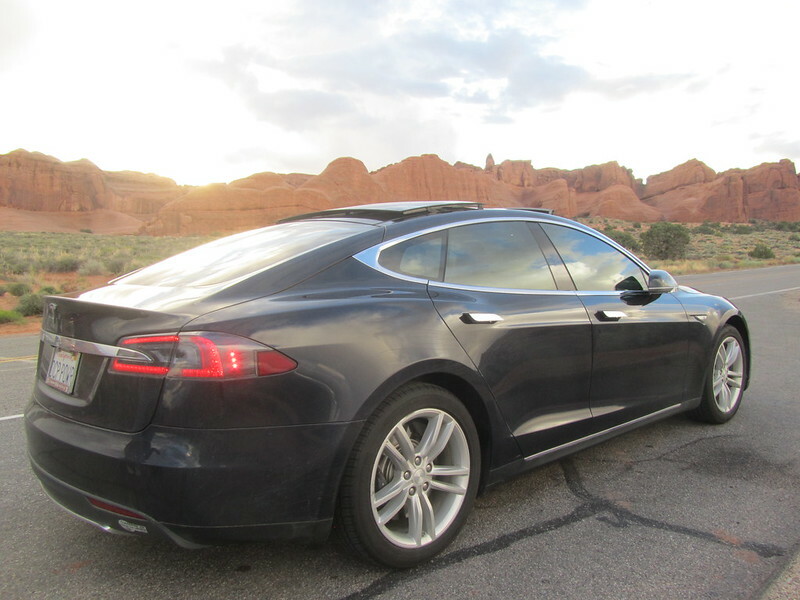 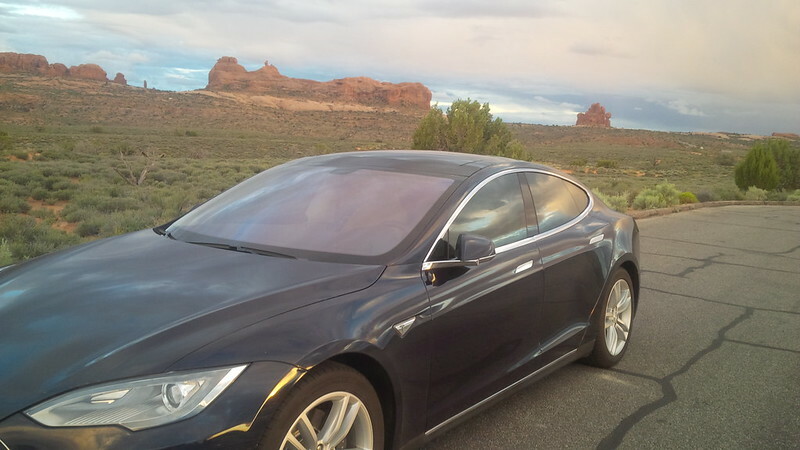 Unlike the “gentleman” we met at the Moab Best Western, we practiced “Best Practices” of parking our vehicle away from the supercharger stall when we’re not charging. 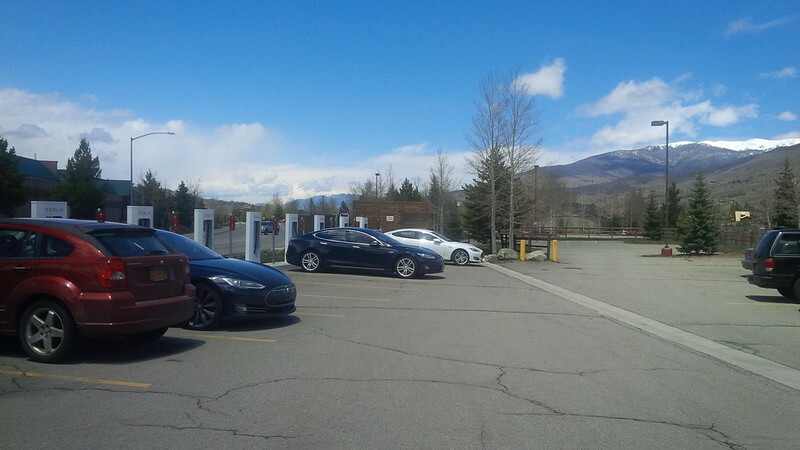 Notice our Blue Model S, just by the entrance and the tree on the right, as it sat there waiting for us to move it to start the morning’s charge. 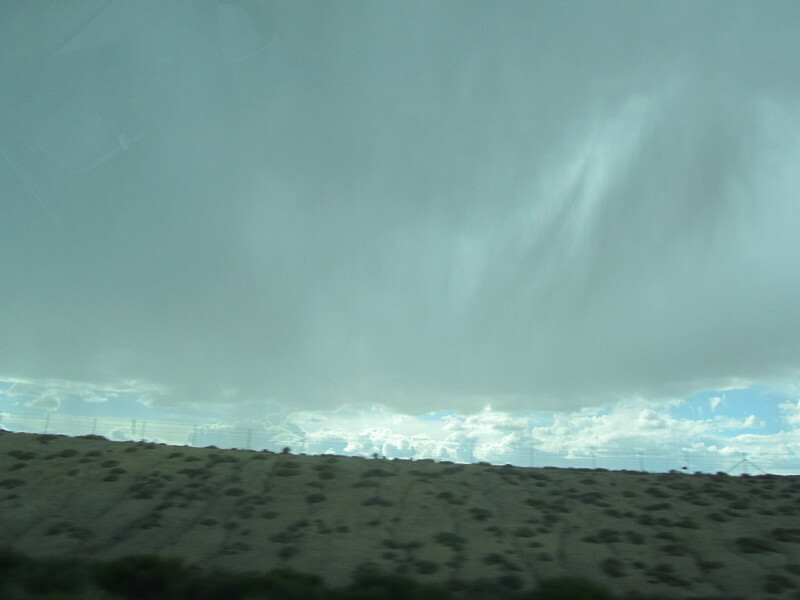 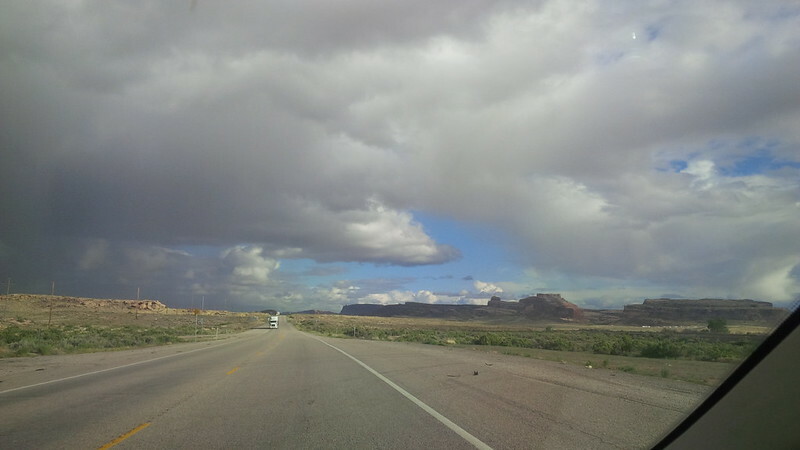 Colder weather in the UT desert. 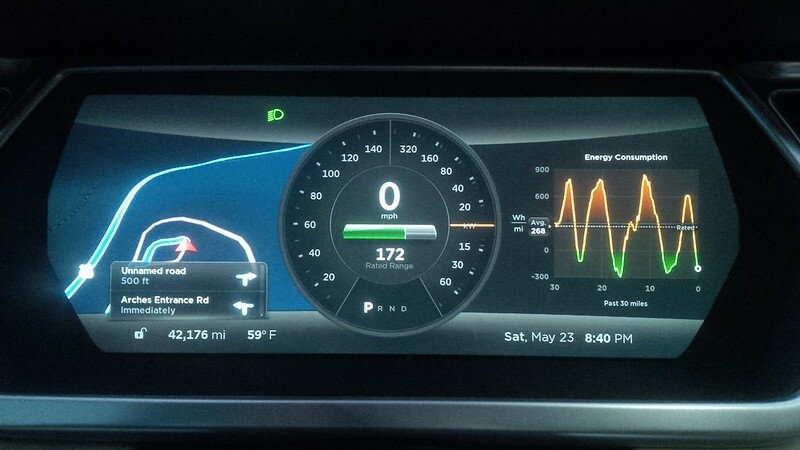 Notice the dashed yellow lines for power and regenerative braking. 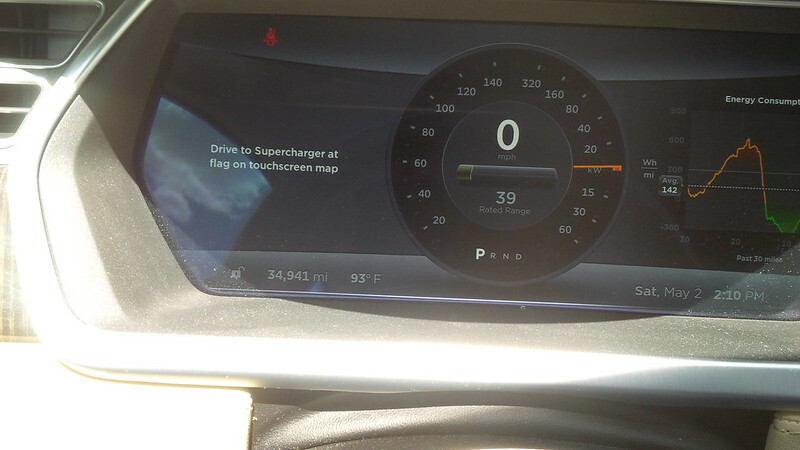 This means that supercharging will also be slower until the pack warms up. 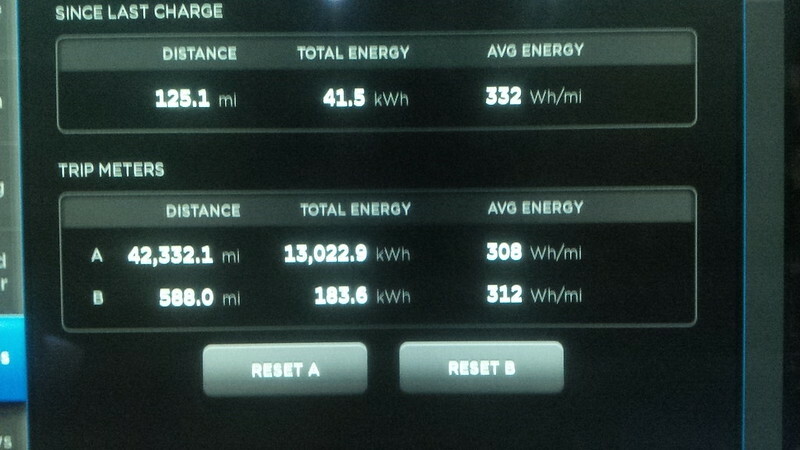 We used 1.353 kWh to move the car to the supercharger stall, but we’ll get that back in a blink when we charge it. 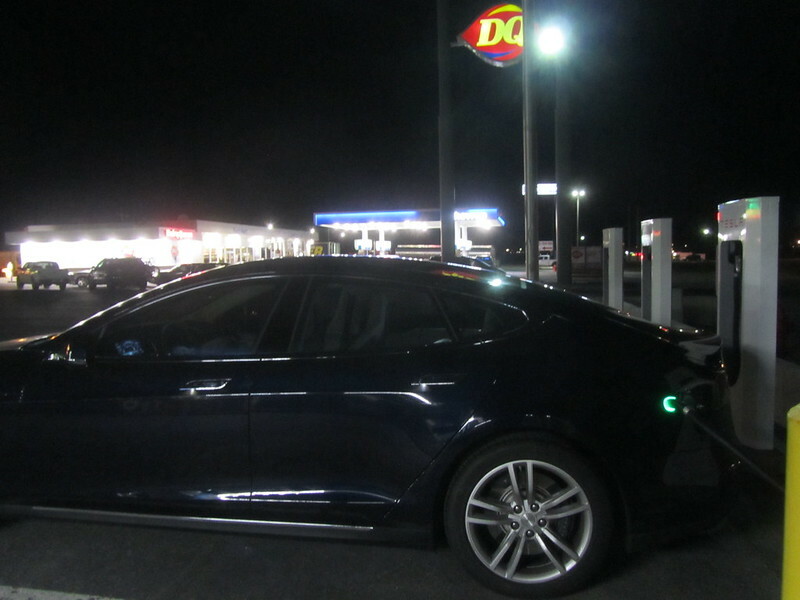 The car firmly parked in the stall with our filled out Pluginamerica EV Card on the dash while I head back to the room to get ready for the drive ahead. 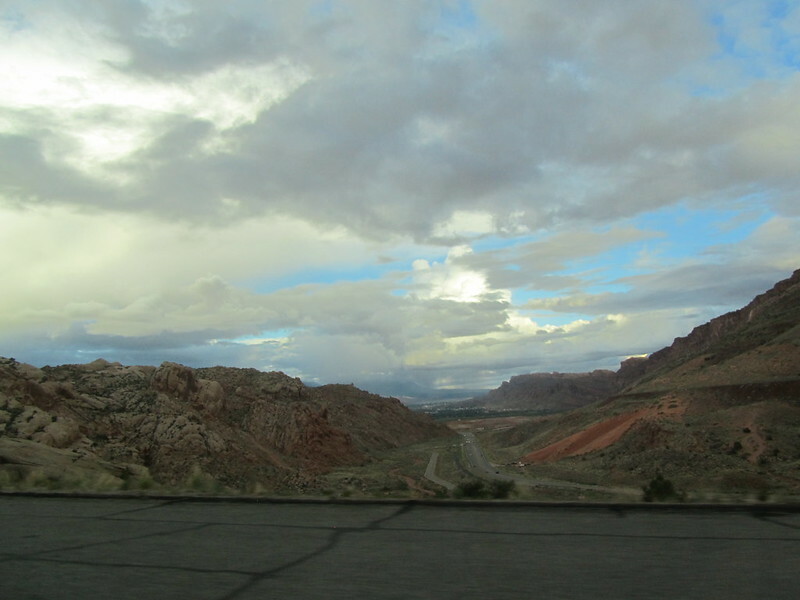 The speed limits in UT are 80 MPH and we have to travel about 160 miles to St. George as we figured to skip Beaver on this drive, so we range charged to full. 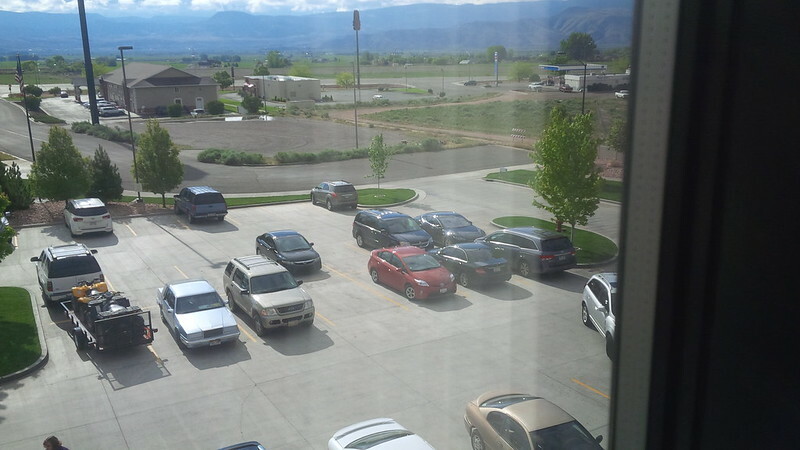 Must be early or folks are sleeping in. 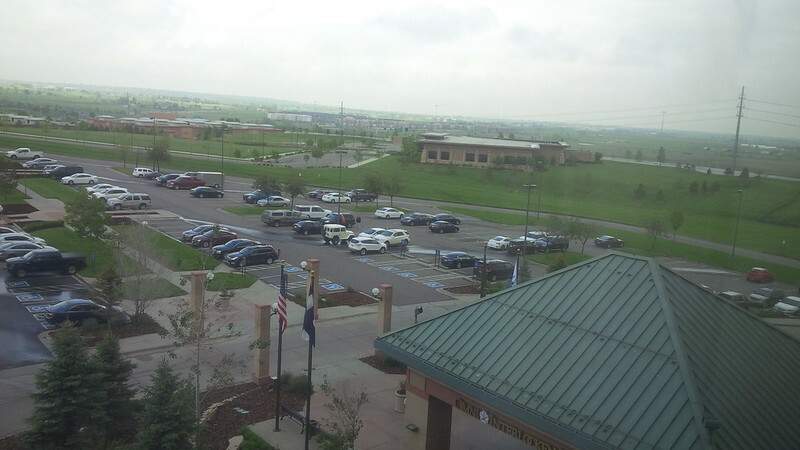 Relative to other hotels that we’ve stayed at on this trip, there are still a lot of people at the hotel when we got up. 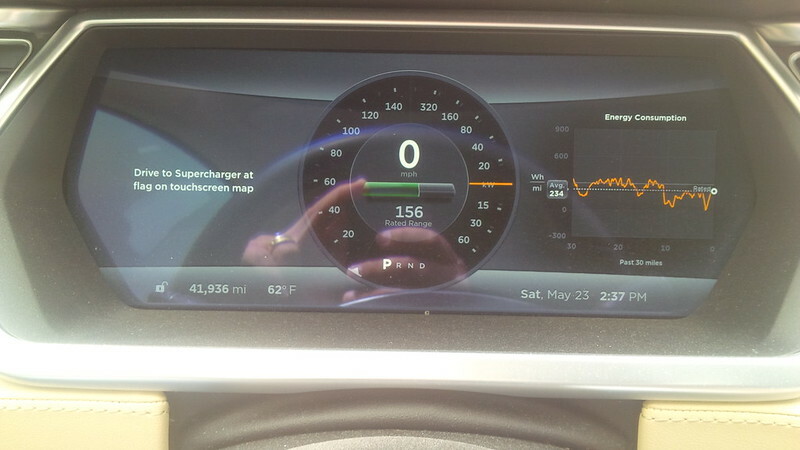 No other cars were with us at the supercharger though. 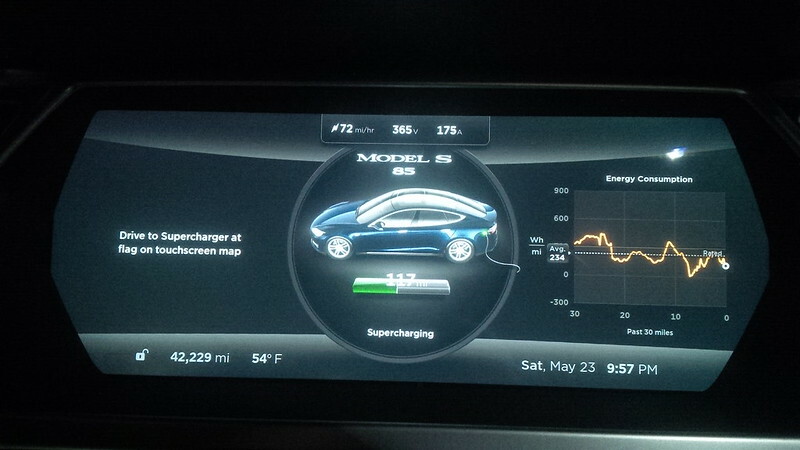 So, I got back up to the room and here’s a picture of the car supercharging by itself. 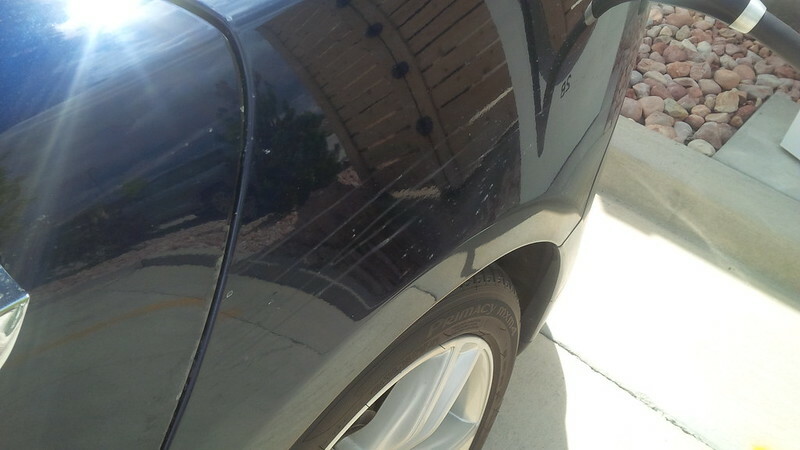 Before heading out, we decided to pay closer attention to the condition of our car after yesterday’s drive. 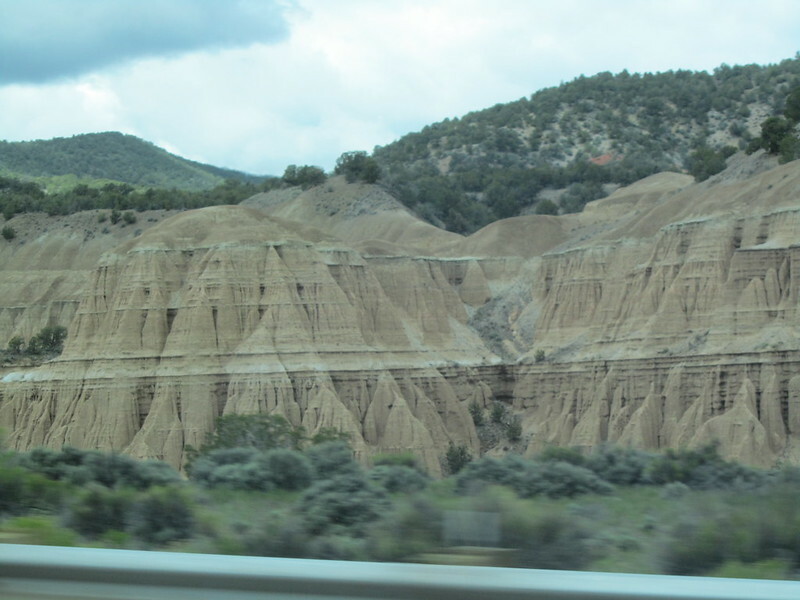 You can see the effect of the wind on how the dirt is moved around. 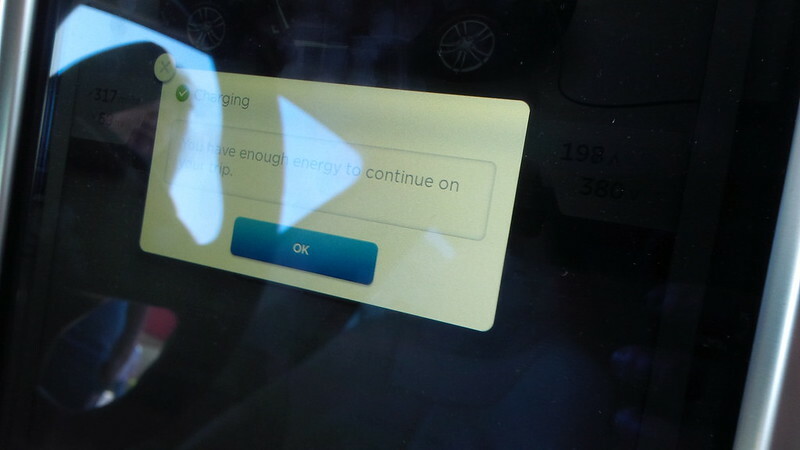 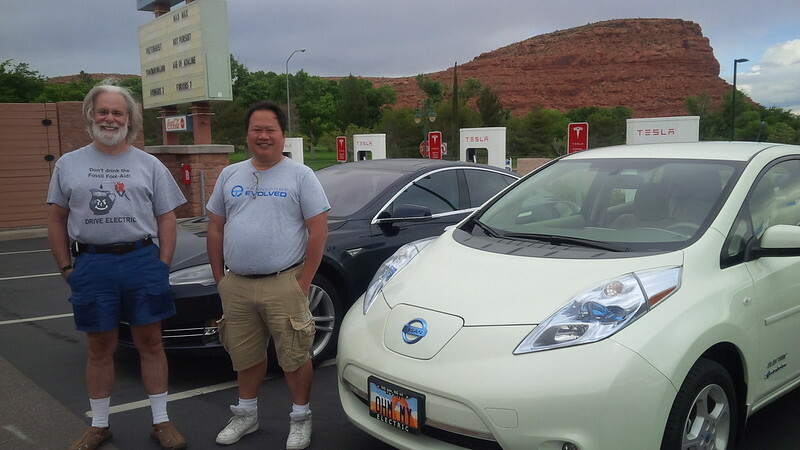 We reached out to Mark Larsen, a fellow EV and Solar rEVolutionary to see if he can meet us today and were in luck. 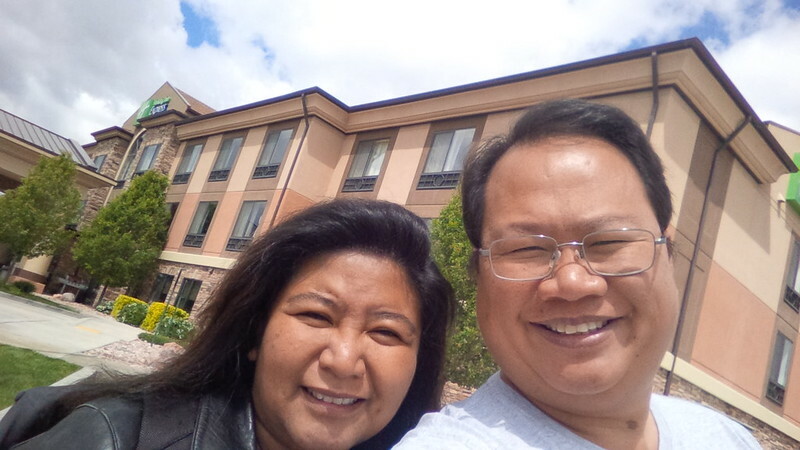 Looks like our schedules match up and we can meet up. 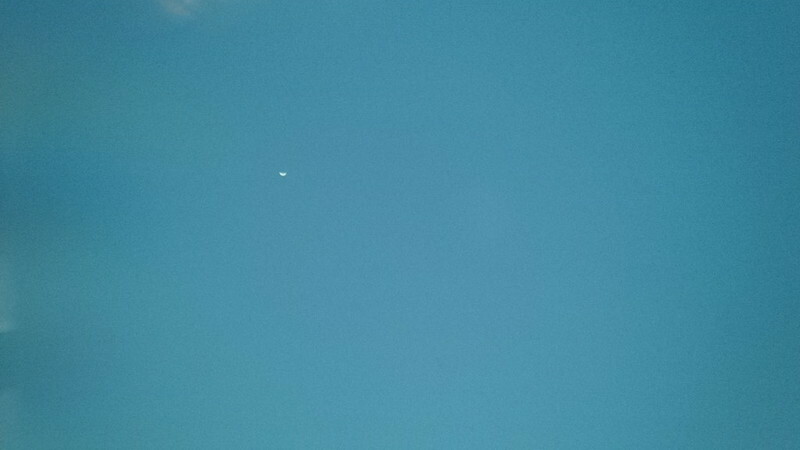 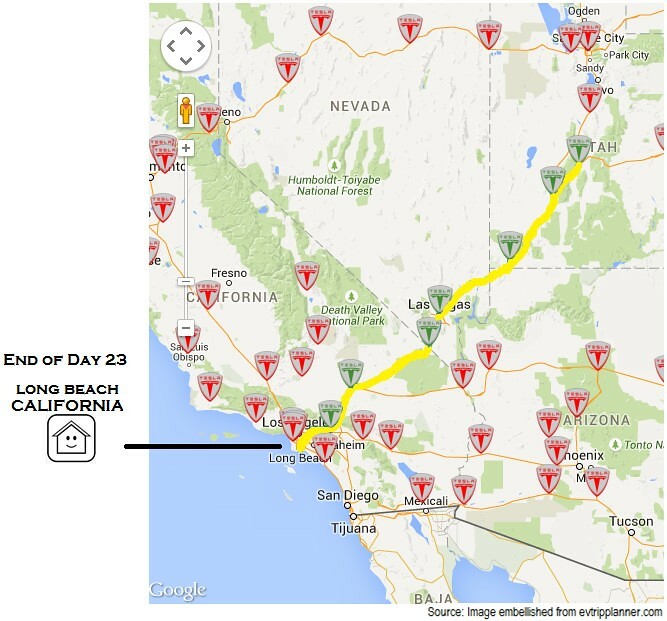 We were not able to meet up on the way East over three weeks ago. 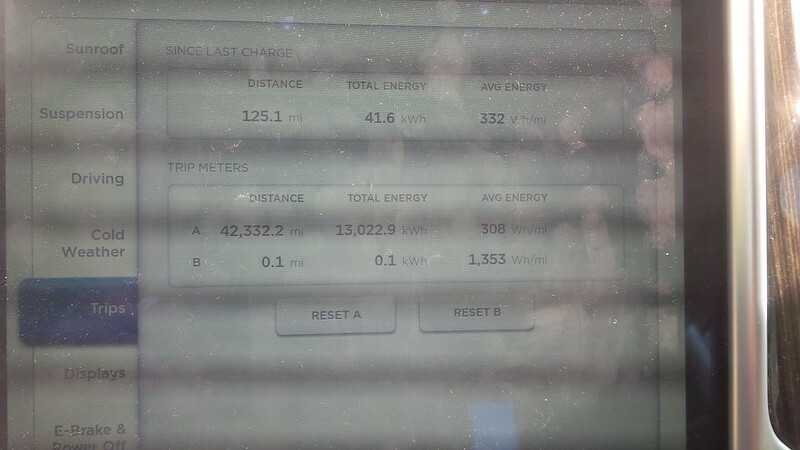 We still get 255 miles on a range charge and we timed it so that we roll out when full. 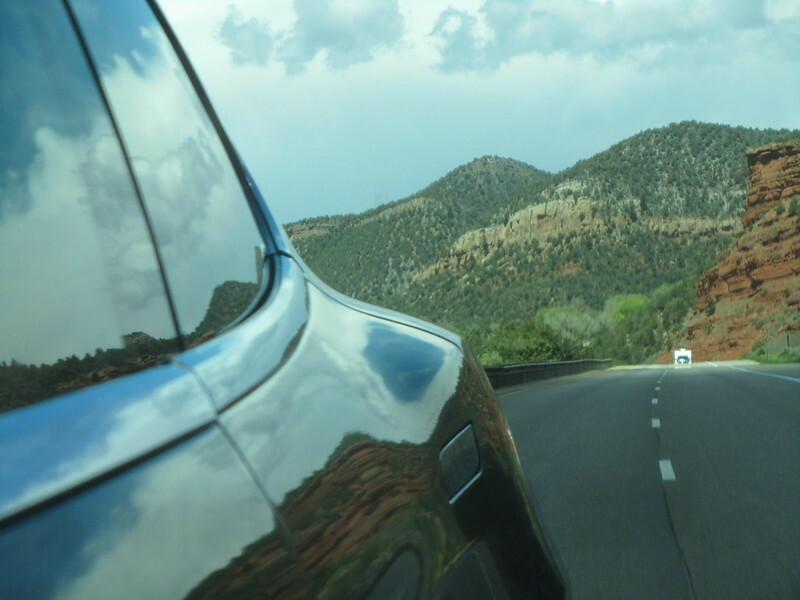 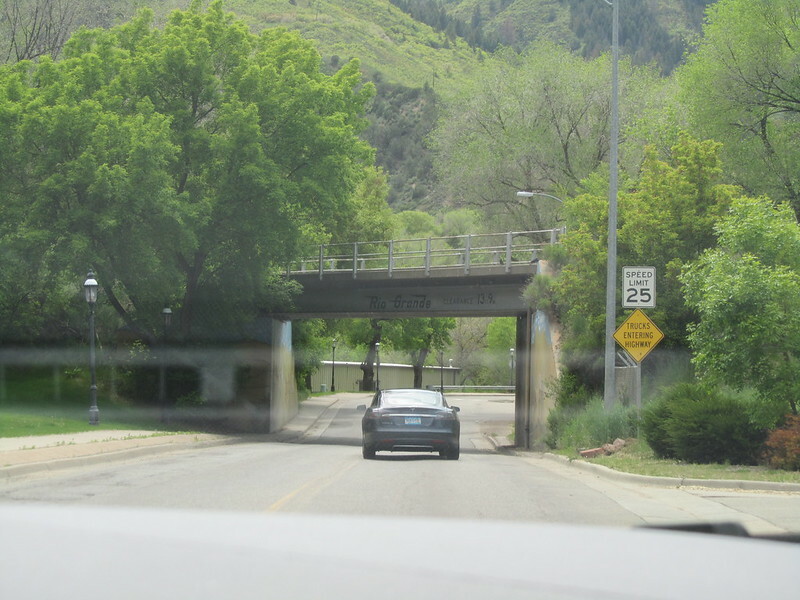 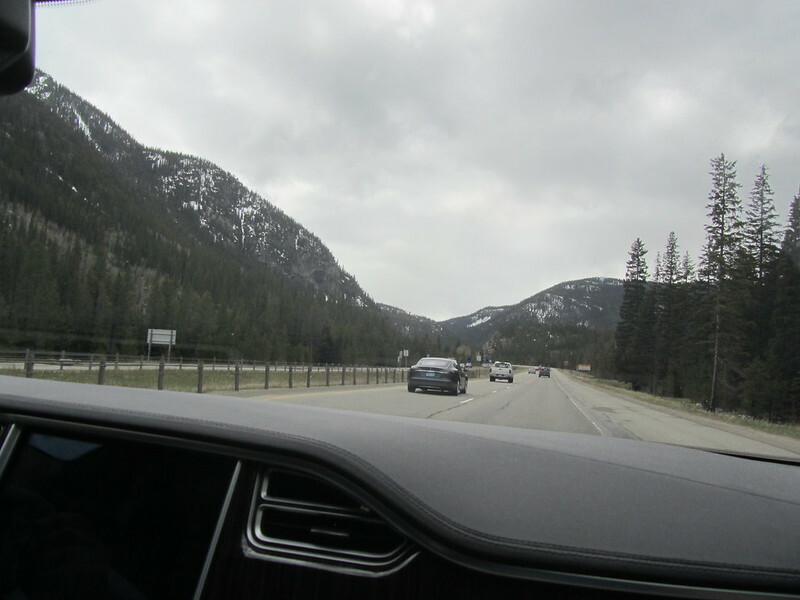 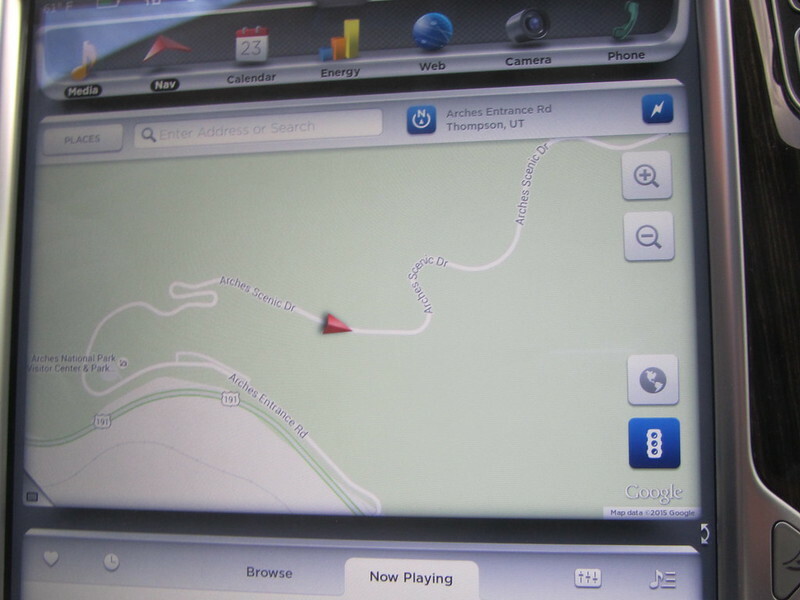 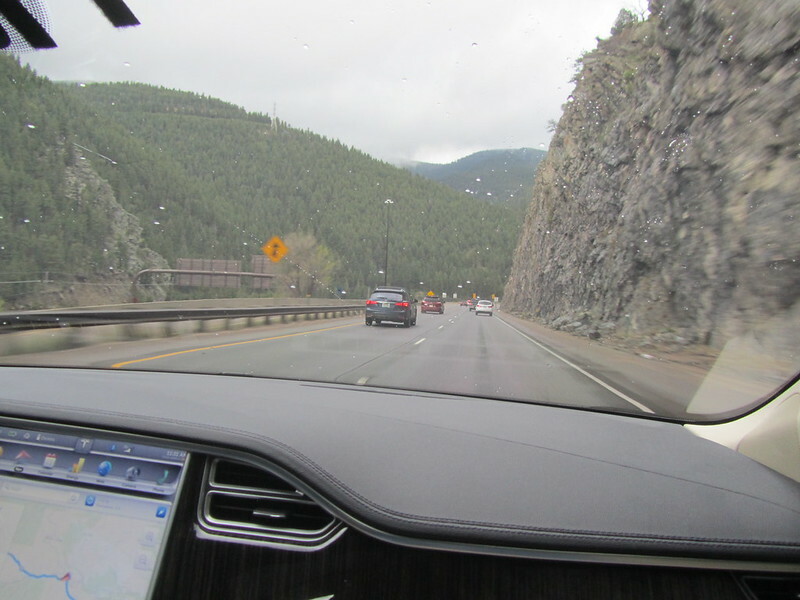 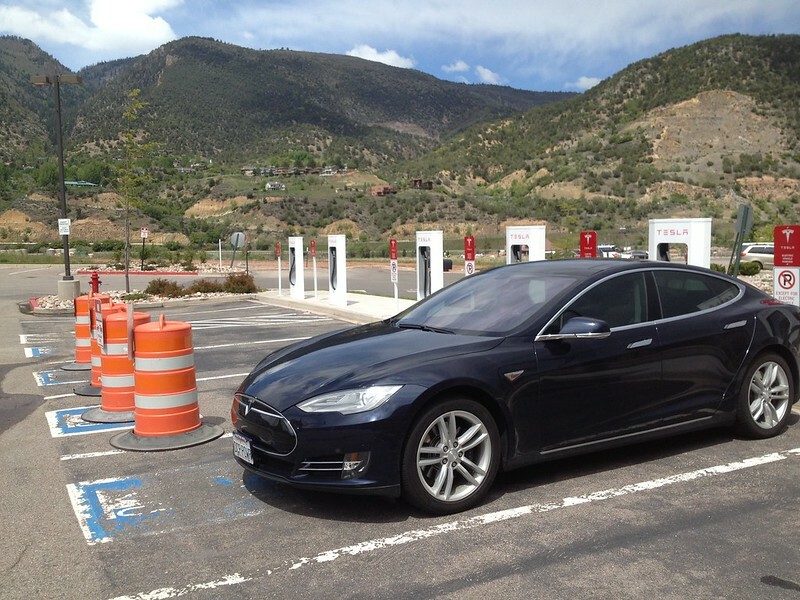 Though the Beaver, UT Supercharger is between Richfield and St. George, we opted to skip it as we have enough charge to get to Richfield, even with the insane Utah speed limits. 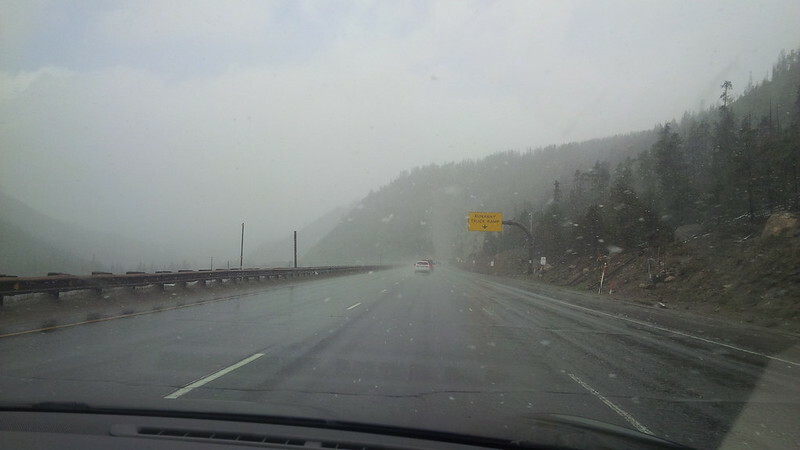 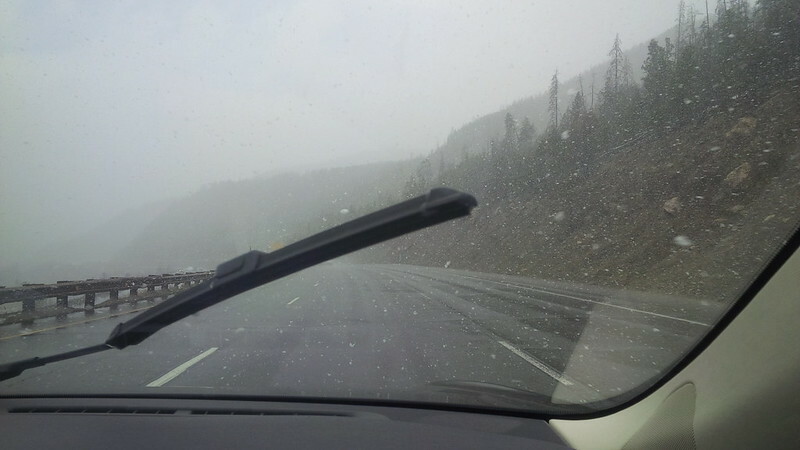 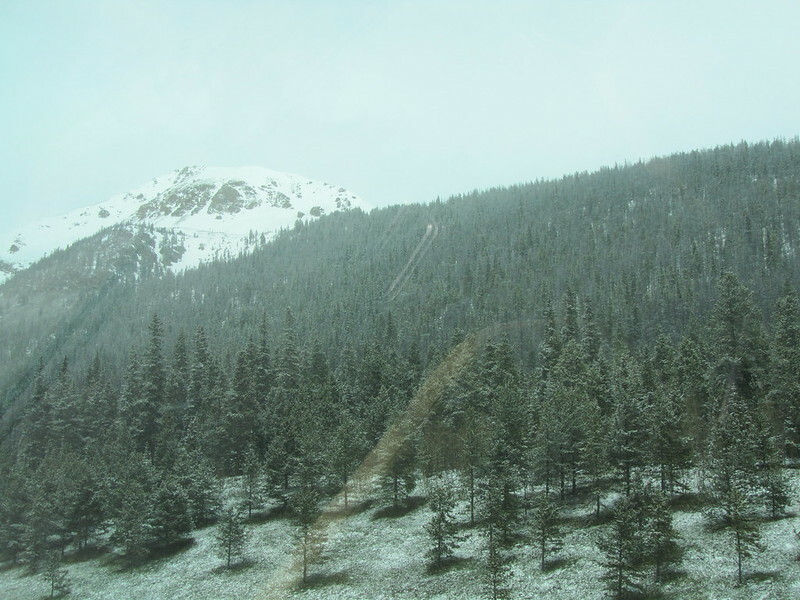 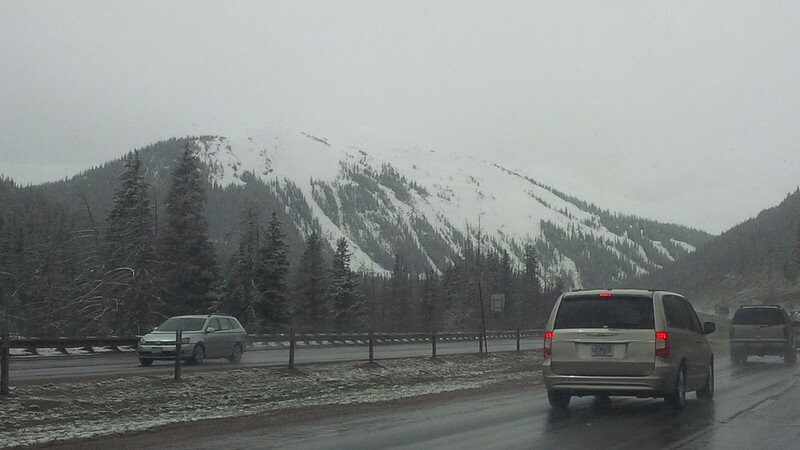 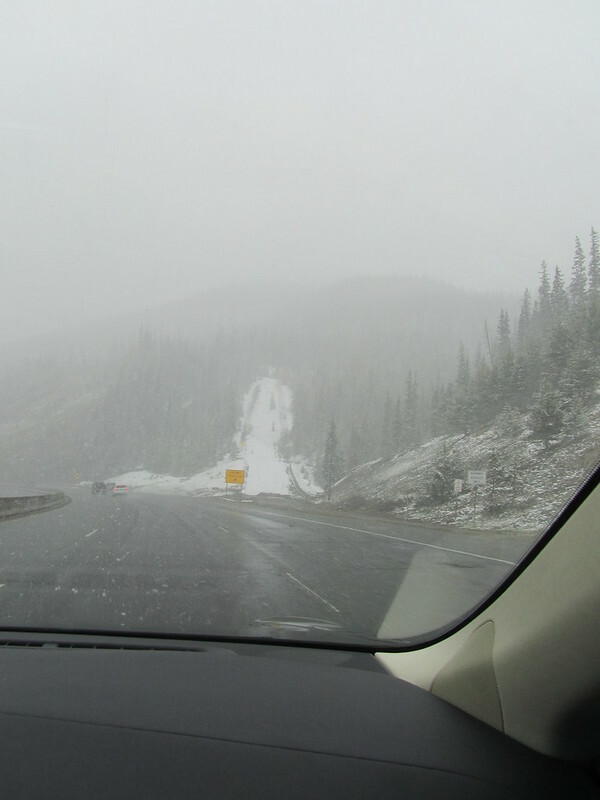 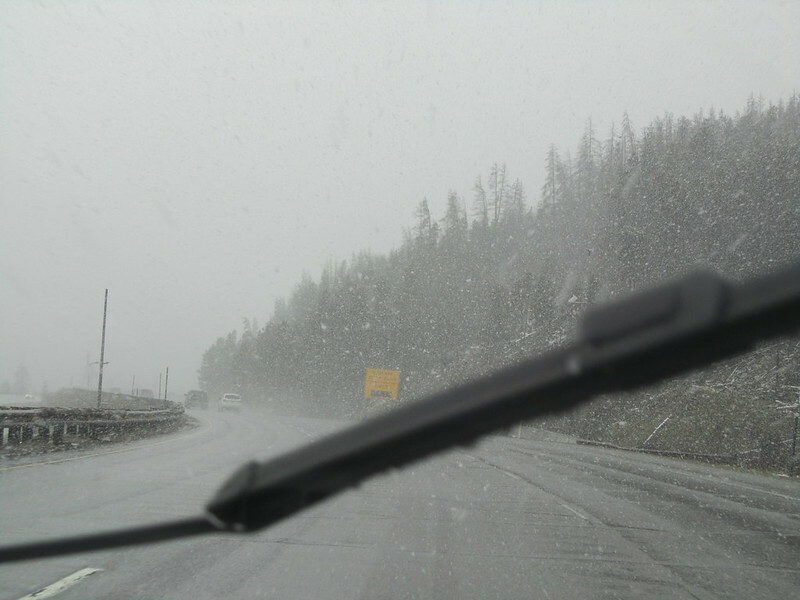 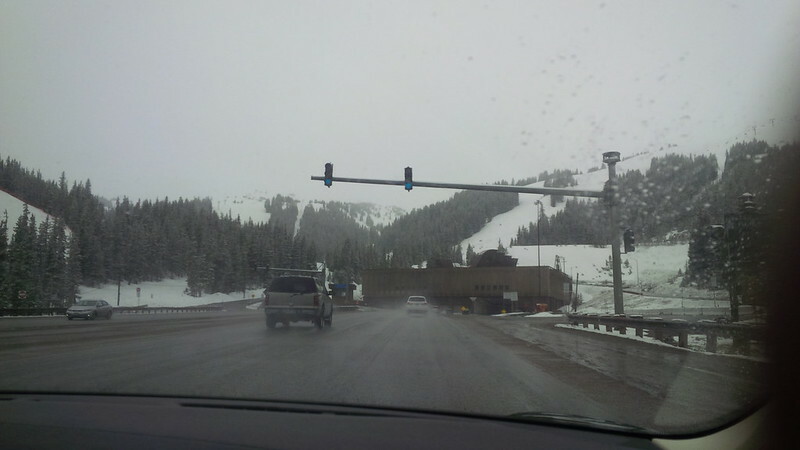 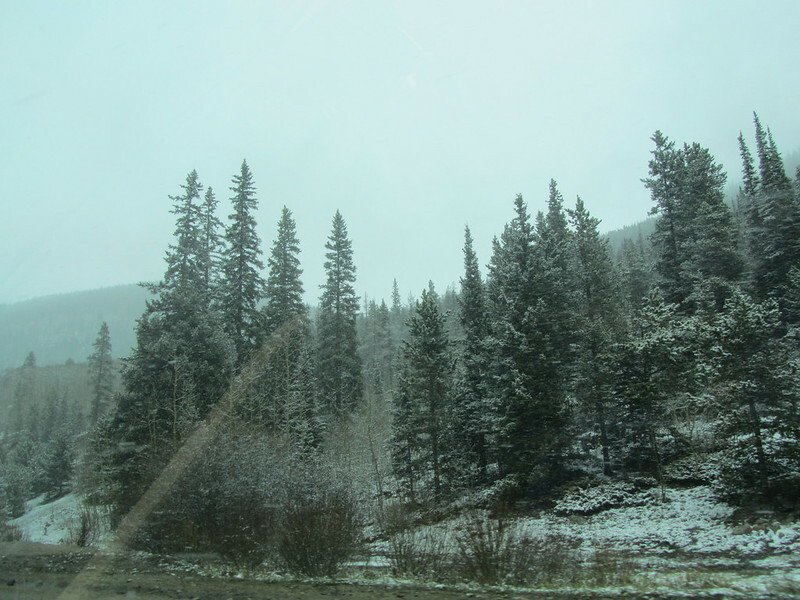 It’s interesting to continue to see snow in May. 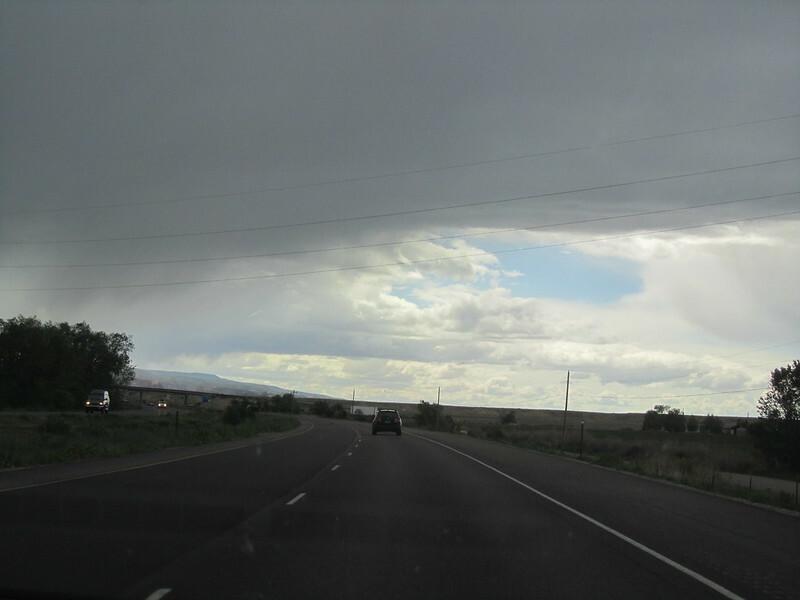 The clouds today are not as threatening as yesterday’s clouds, but it still manages to block quite a bit of sunlight. 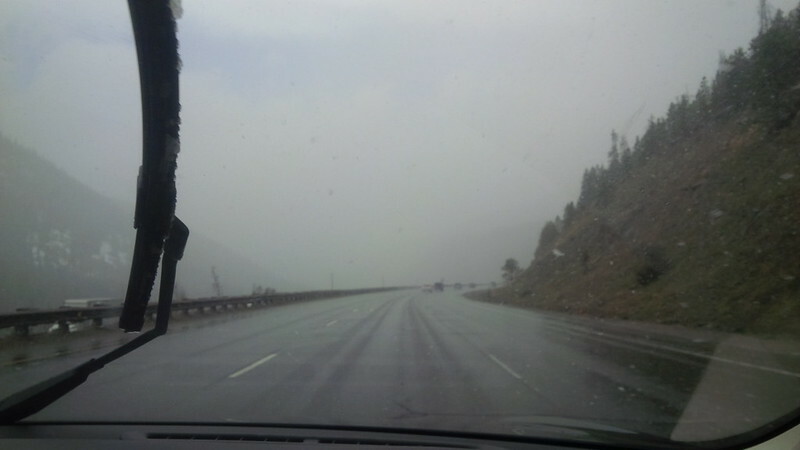 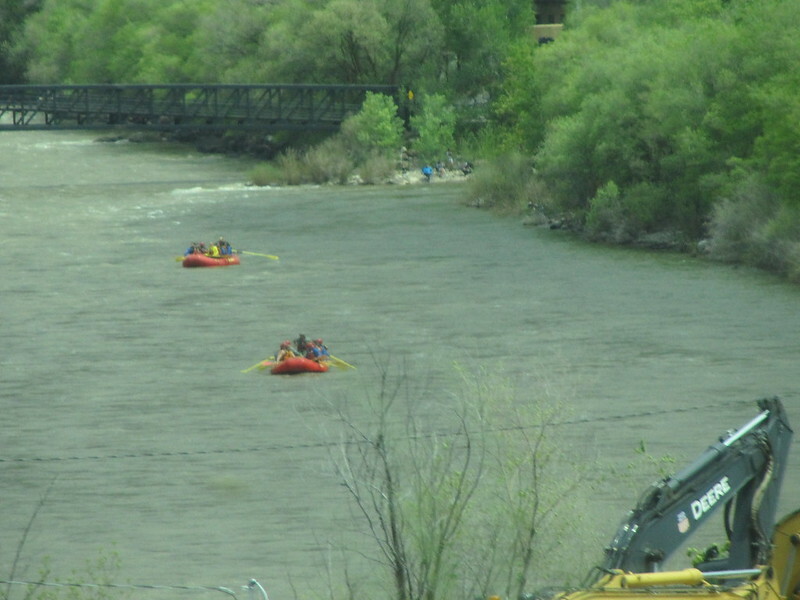 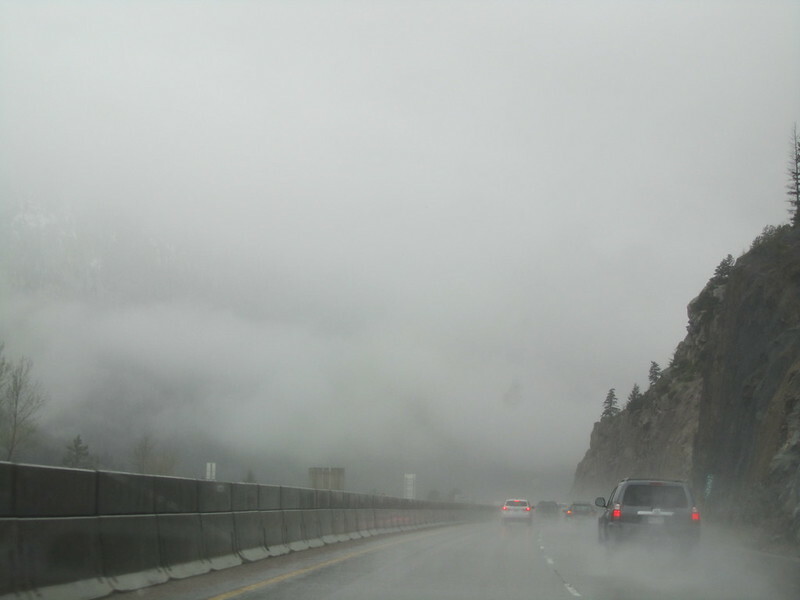 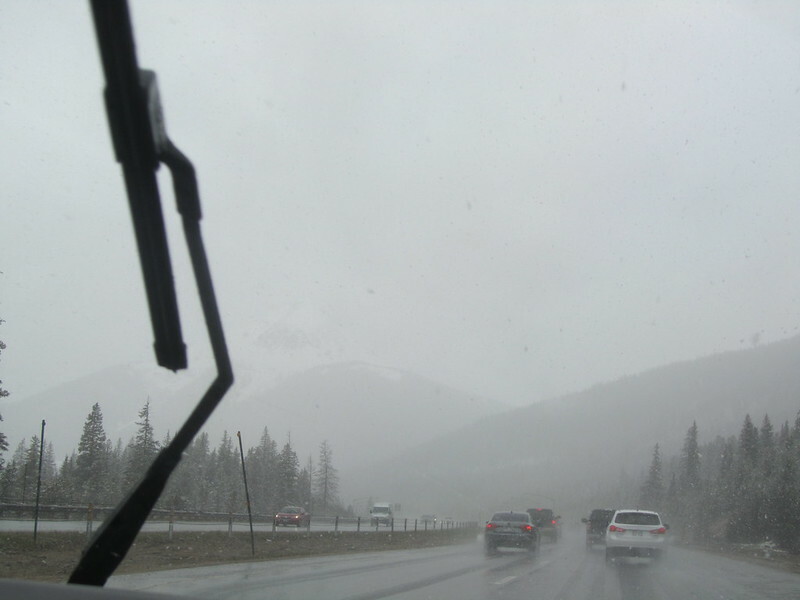 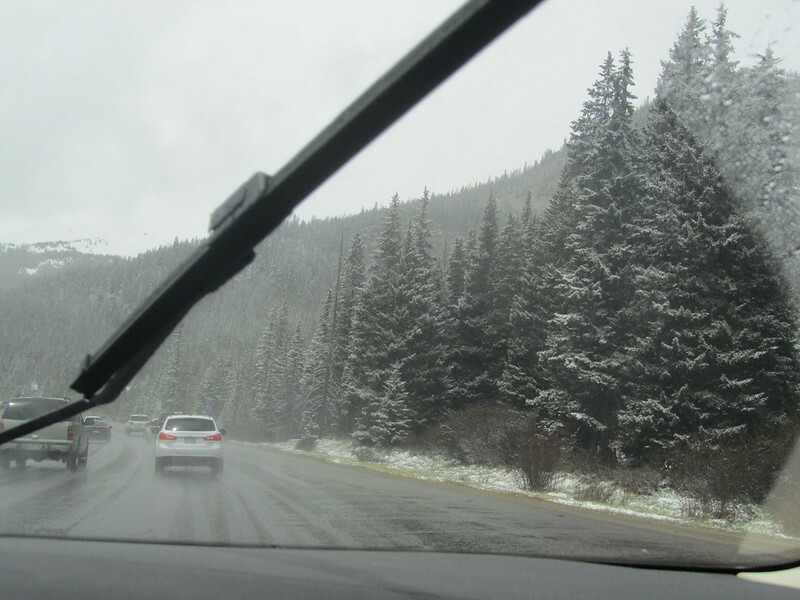 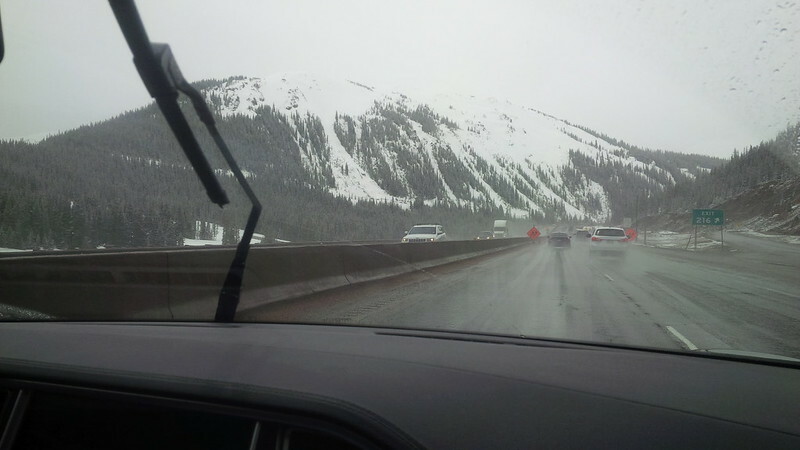 Rain is threatened today, but compared to what we had in the Rockies, we’re ready for anything. 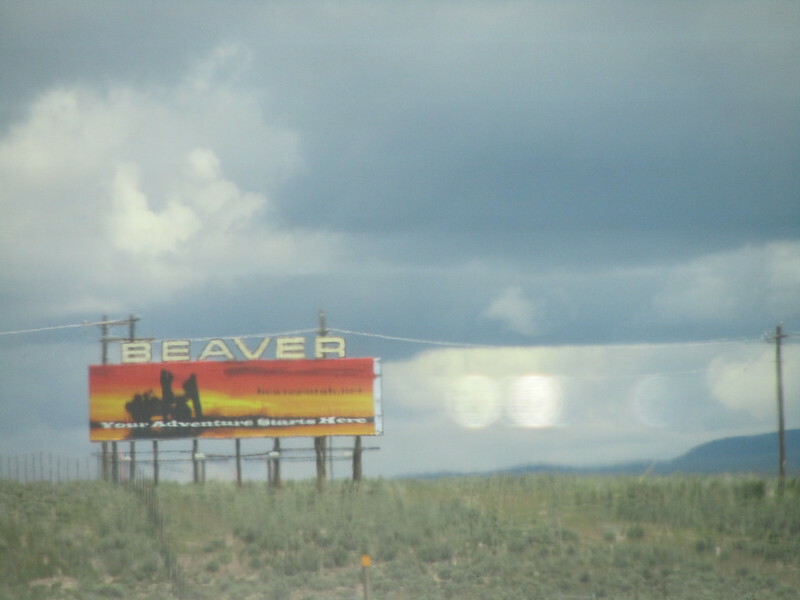 My wife managed to capture a picture of the Beaver Supercharger as I was zooming by at 80 MPH. 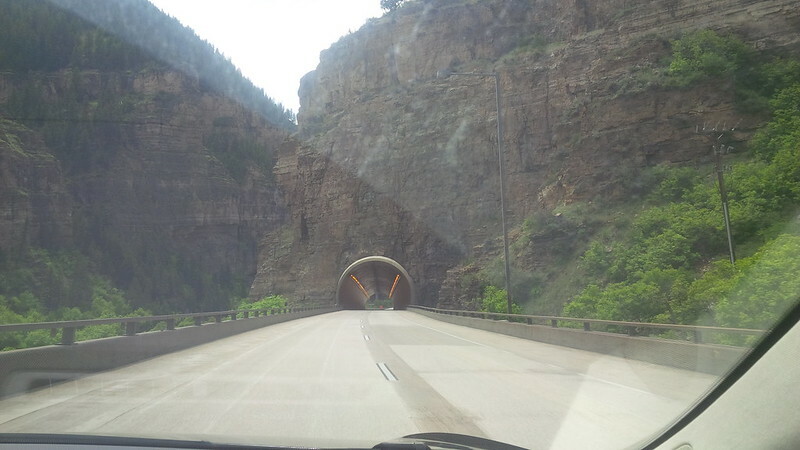 That’s pretty impressive. 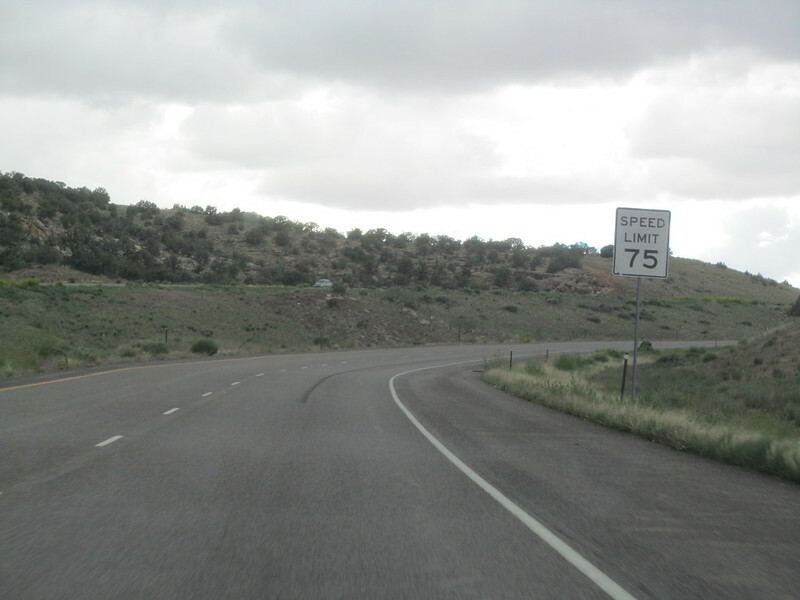 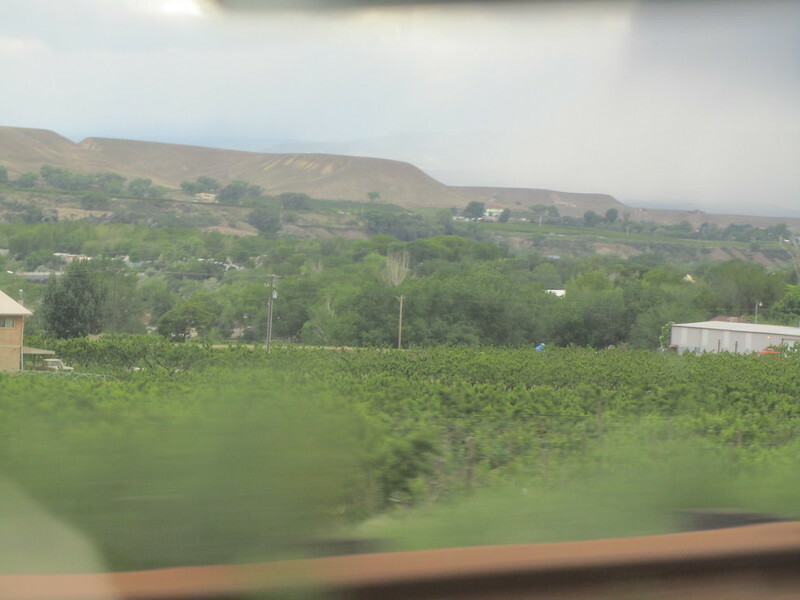 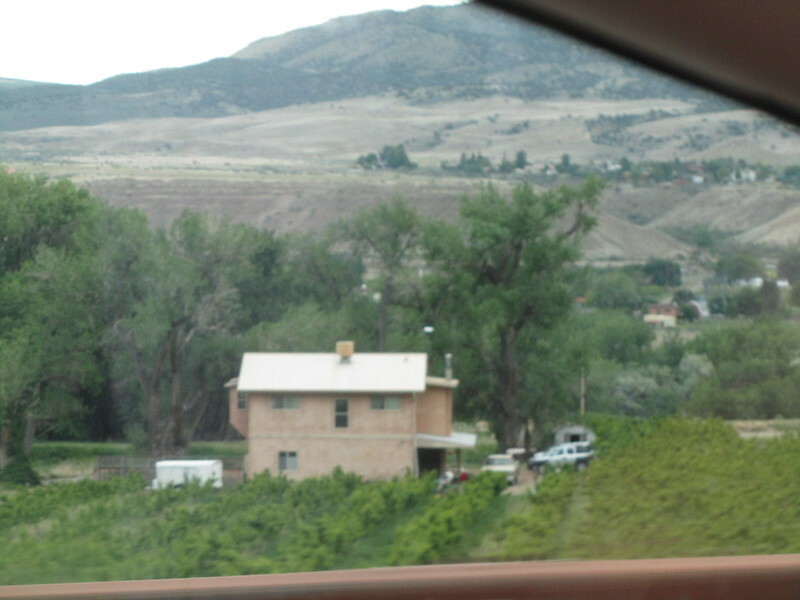 We didn’t slow down and this was using the Optical Zoom on our digital camera as I was speeding by Beaver, UT. 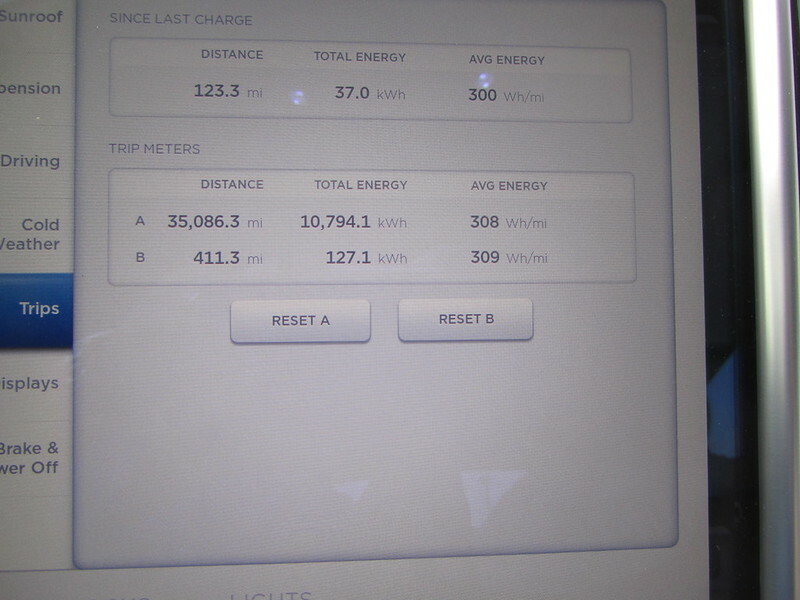 Besides, we’ve already stopped off at all the superchargers on this route and made our entries in the beta of the (now released) Teslarati App for iOS. 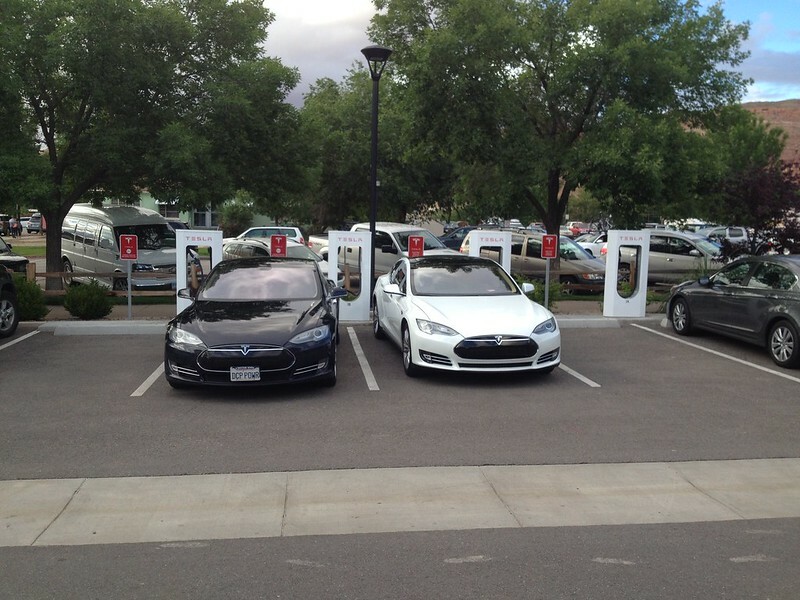 It didn’t look like anyone was supercharging there right now. 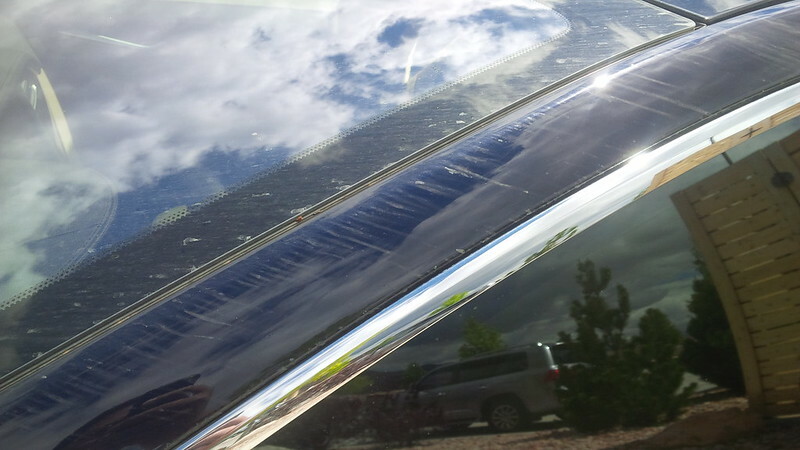 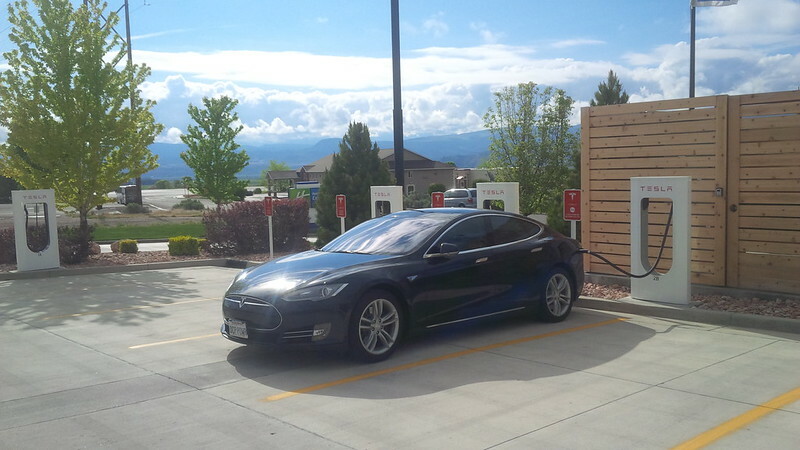 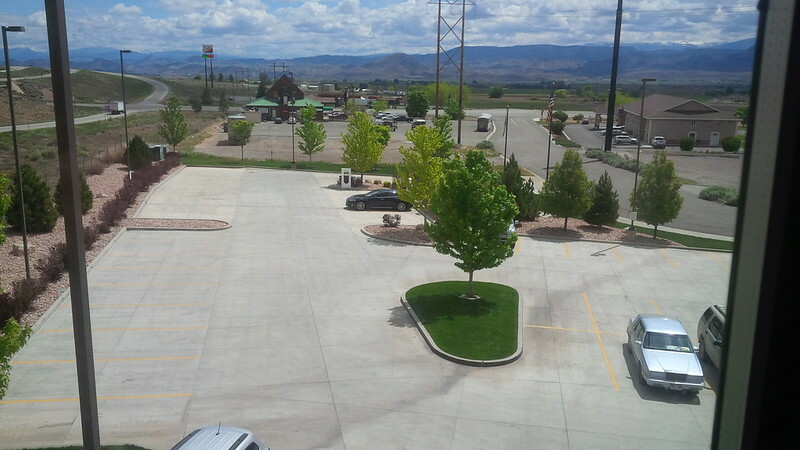 I wondered whether we should’ve stopped for a wash at the car wash that is supercharger adjacent in Beaver. 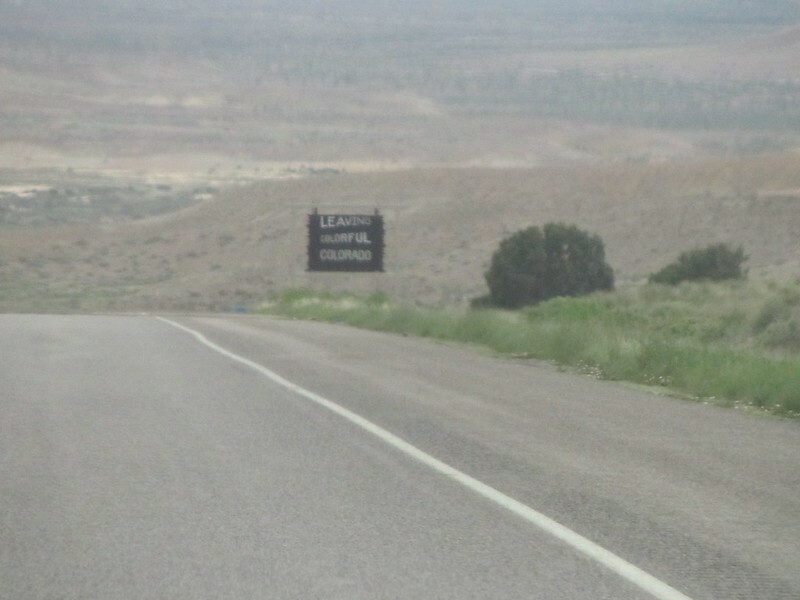 A nice sign for Beaver, UT. 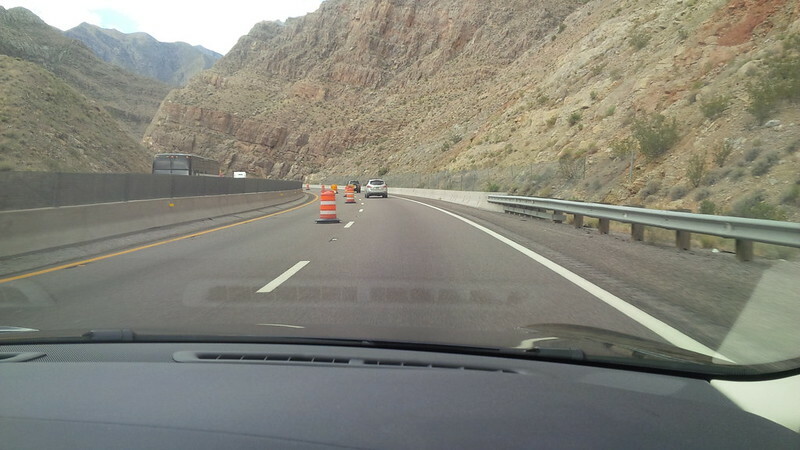 It’s Sunday on a holiday weekend, so I don’t expect there to be any construction at these construction zones. 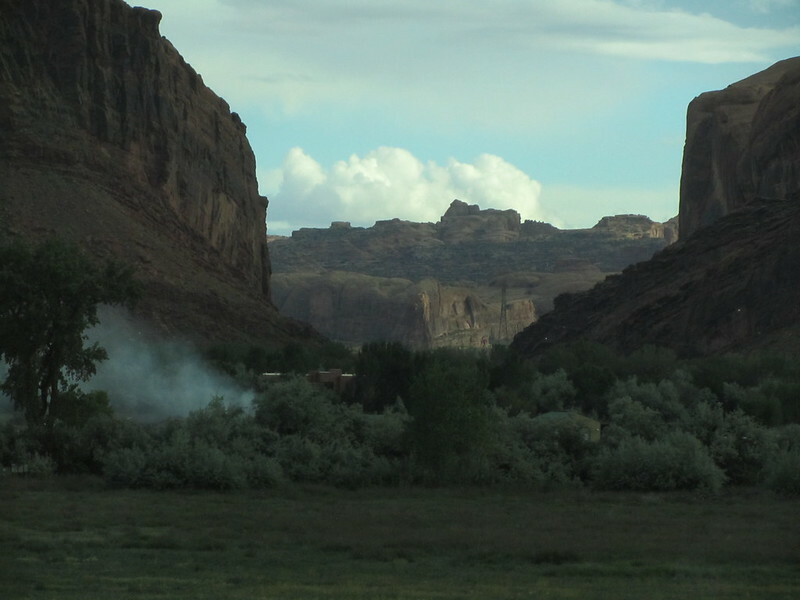 We spotted some smoke from the distance. 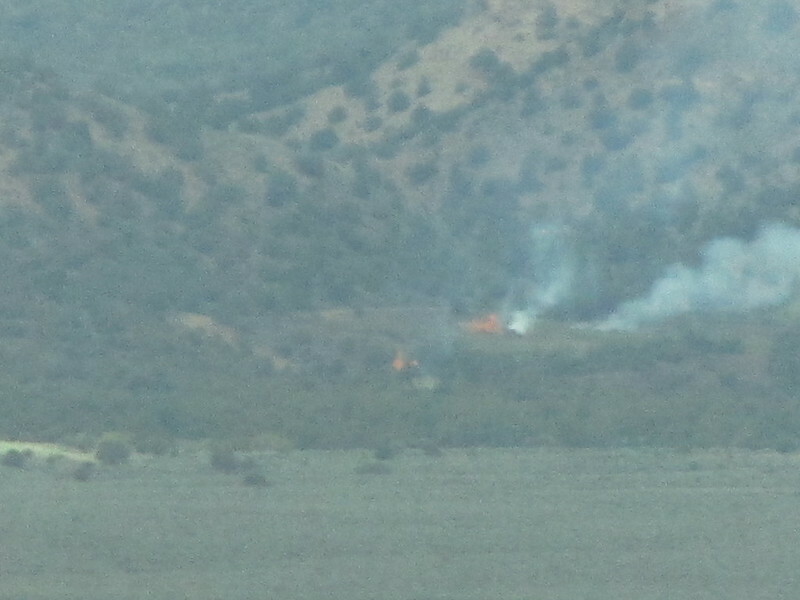 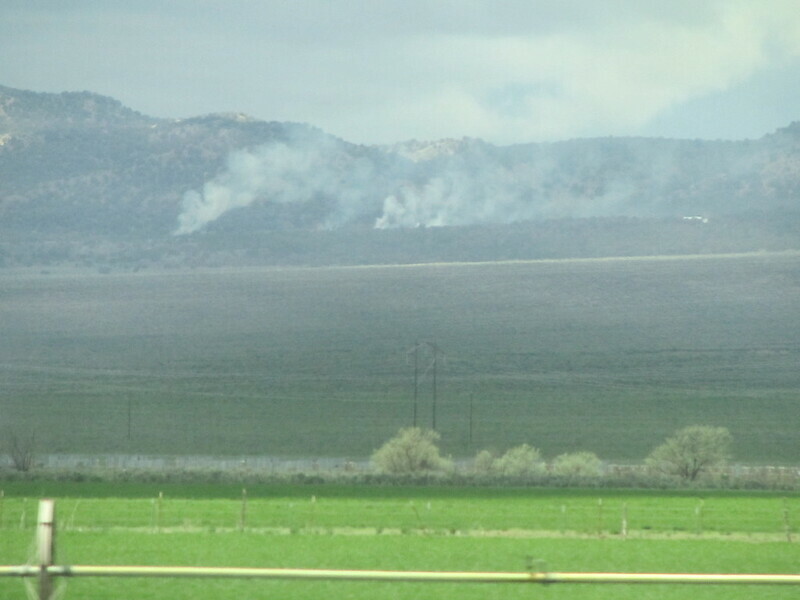 I wonder whether these fires were “controlled” and what it was that they were burning if it was. 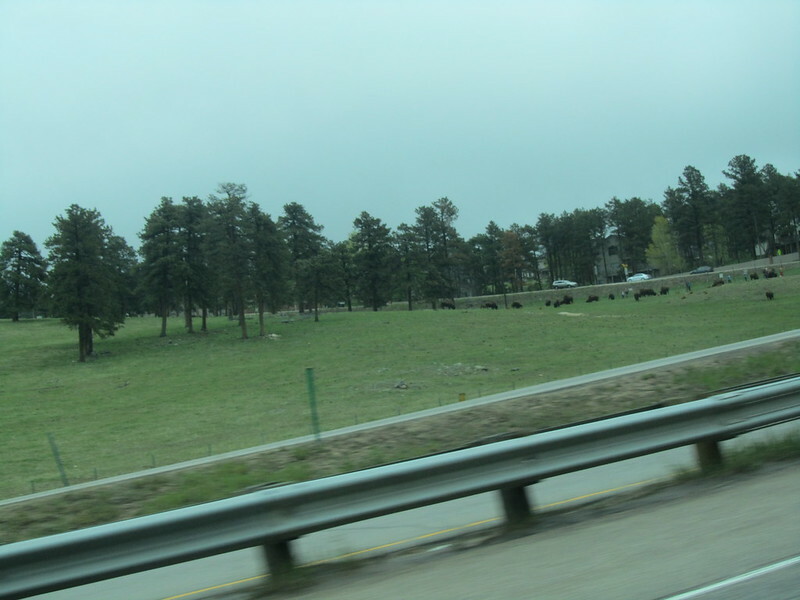 We spotted a bunch of cows on the side of the freeway. 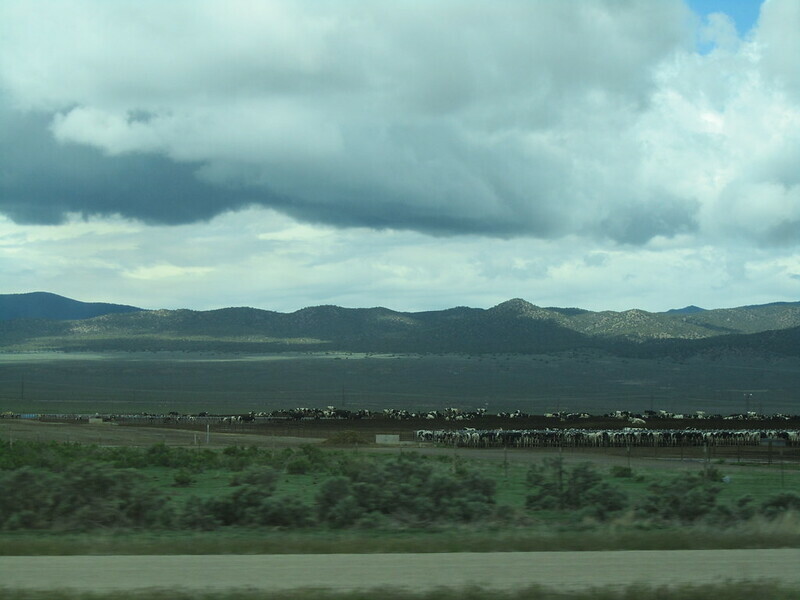 The cattle on the side of the Utah road doesn’t seem to be as “free range” as the ones in the other states that we’ve passed through. 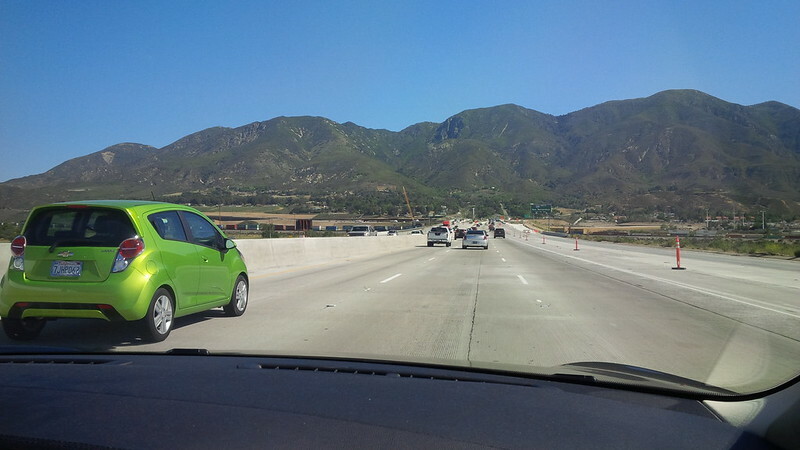 I often think of the Far Side comics as I pass by cows on the side of the freeway. 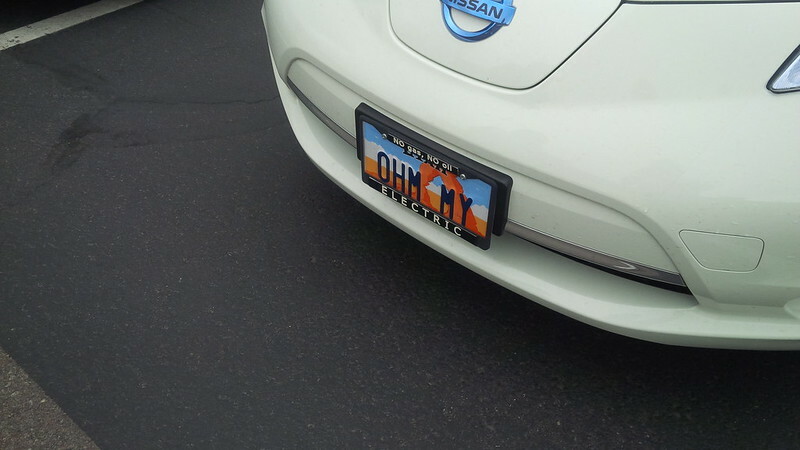 I wonder what they’re thinking. 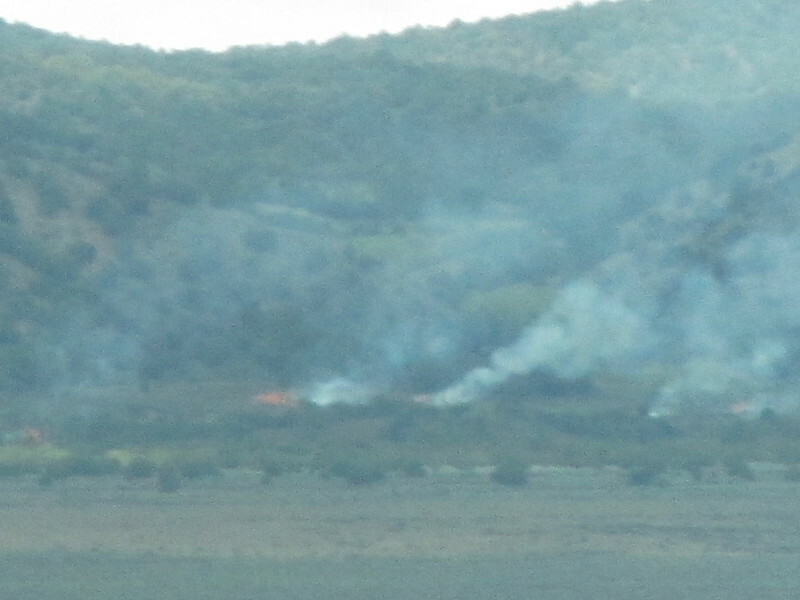 What are they burning? 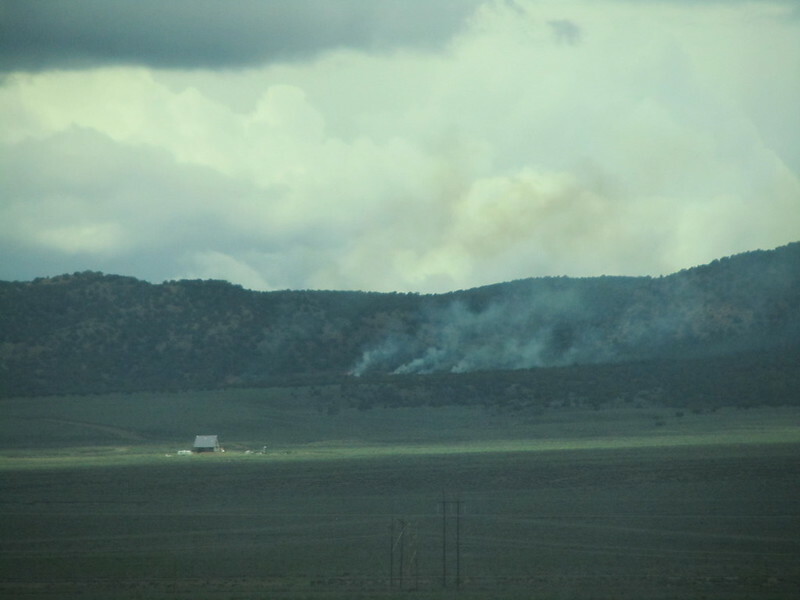 We spotted a second set of smoke and fires. 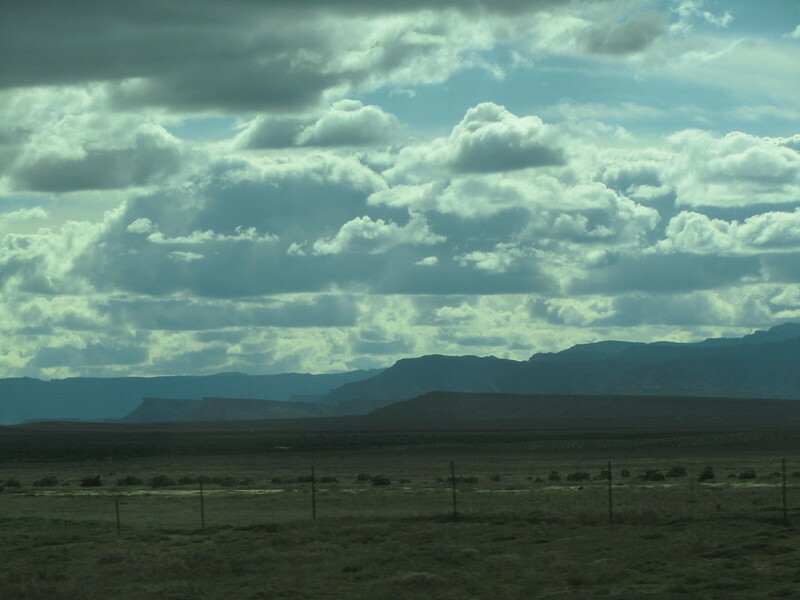 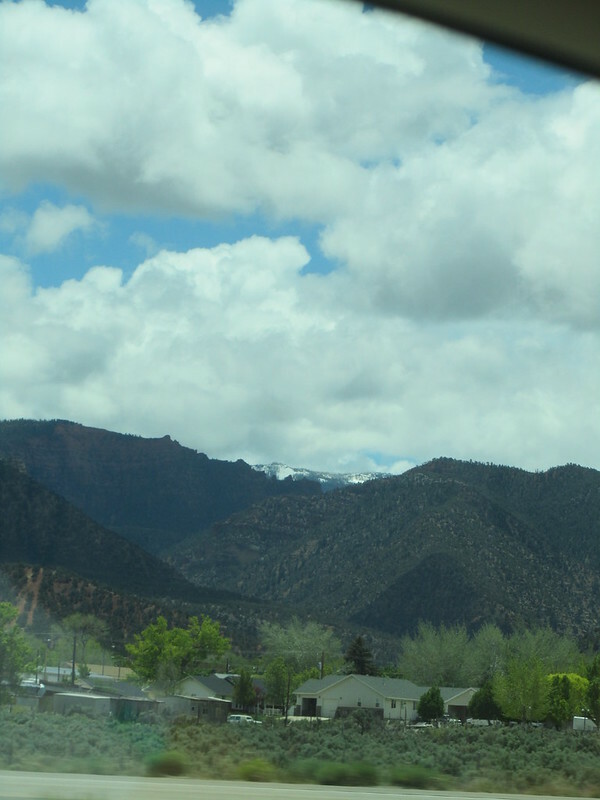 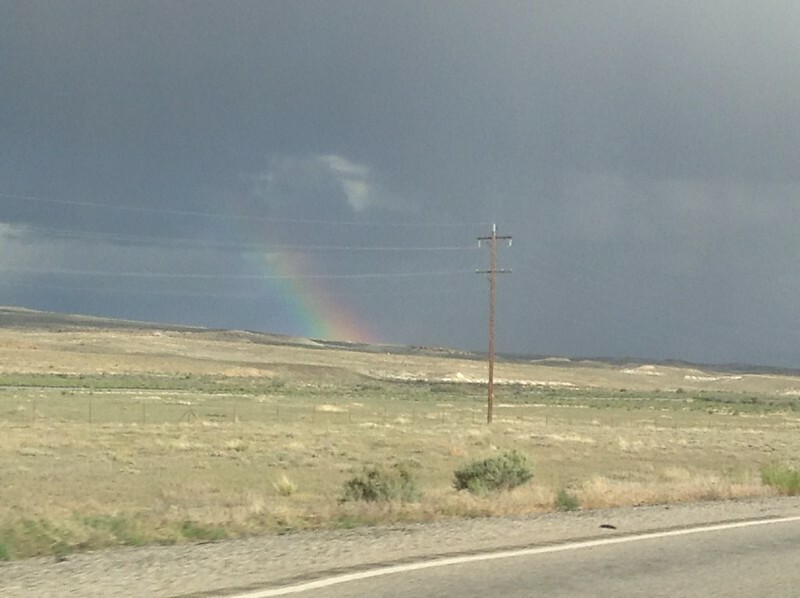 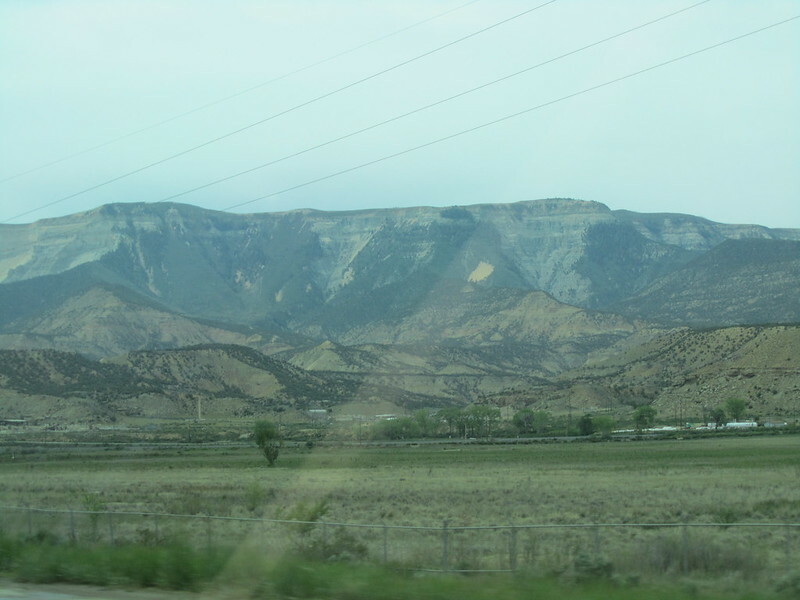 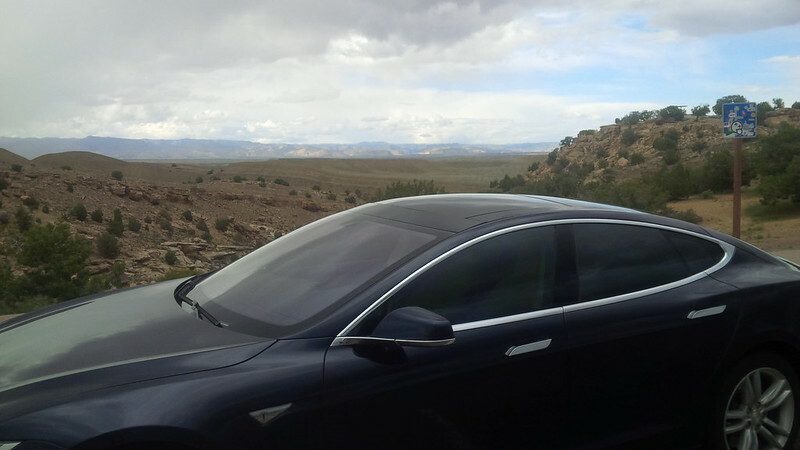 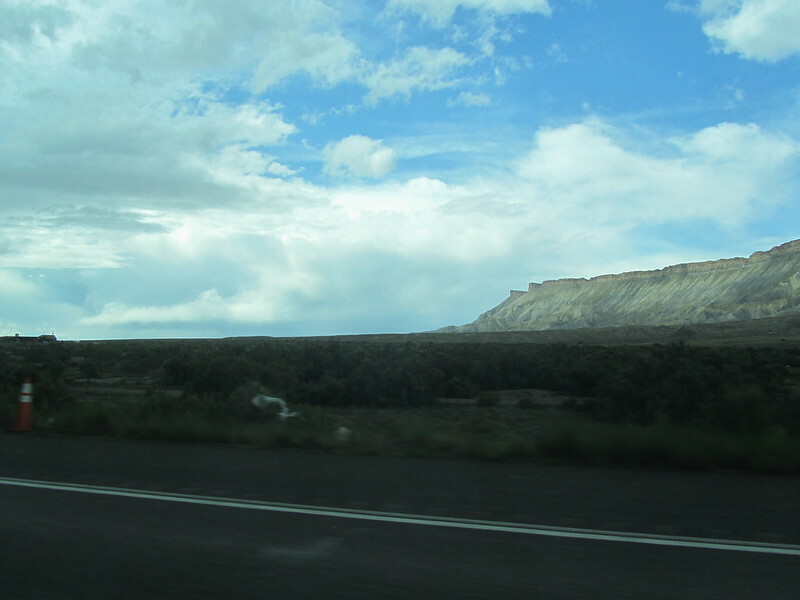 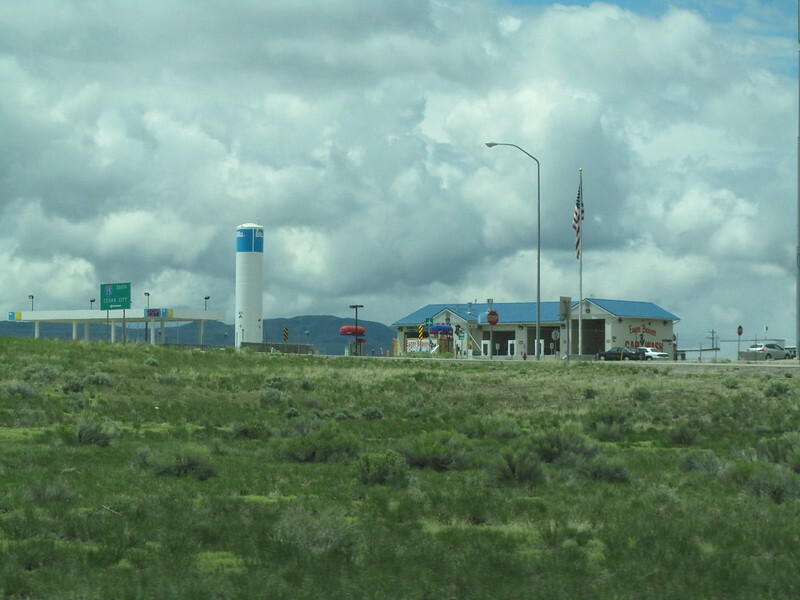 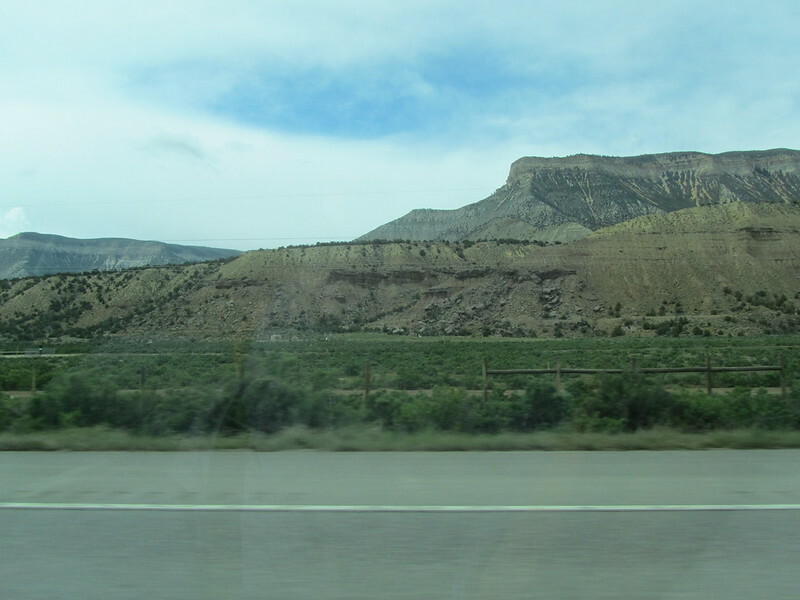 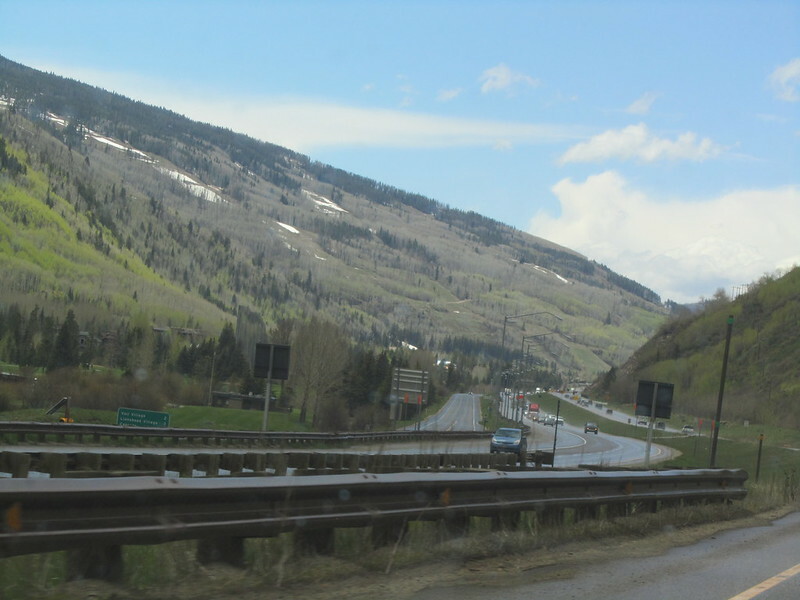 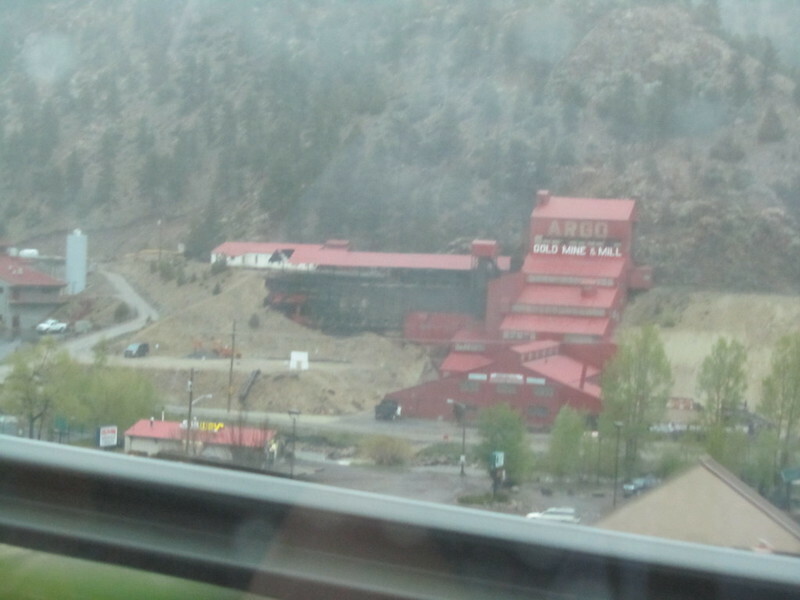 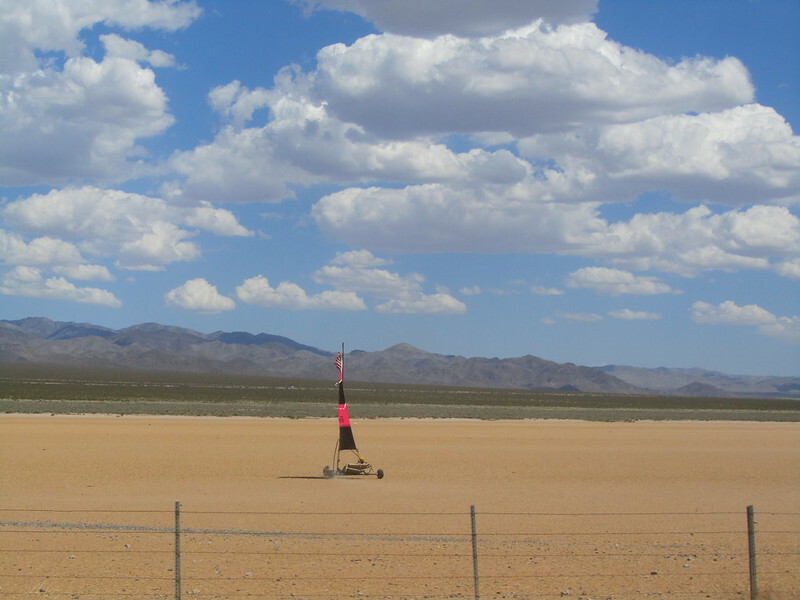 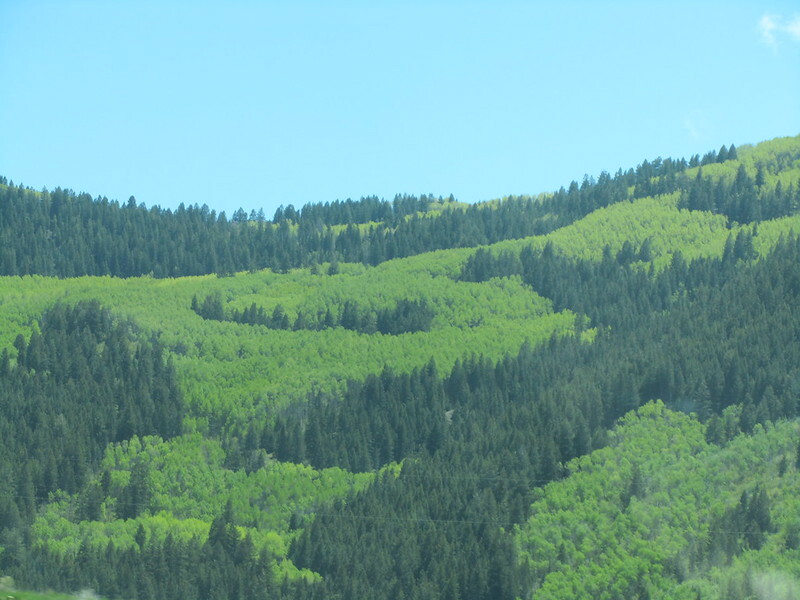 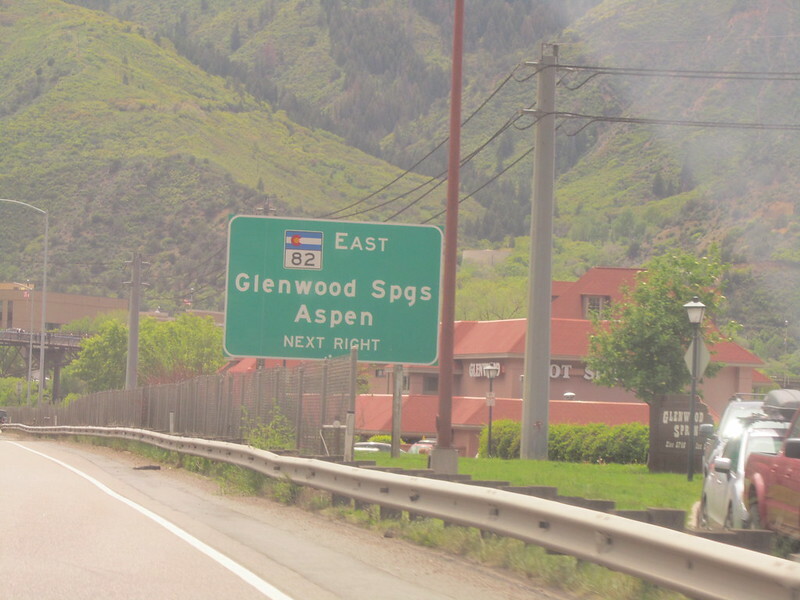 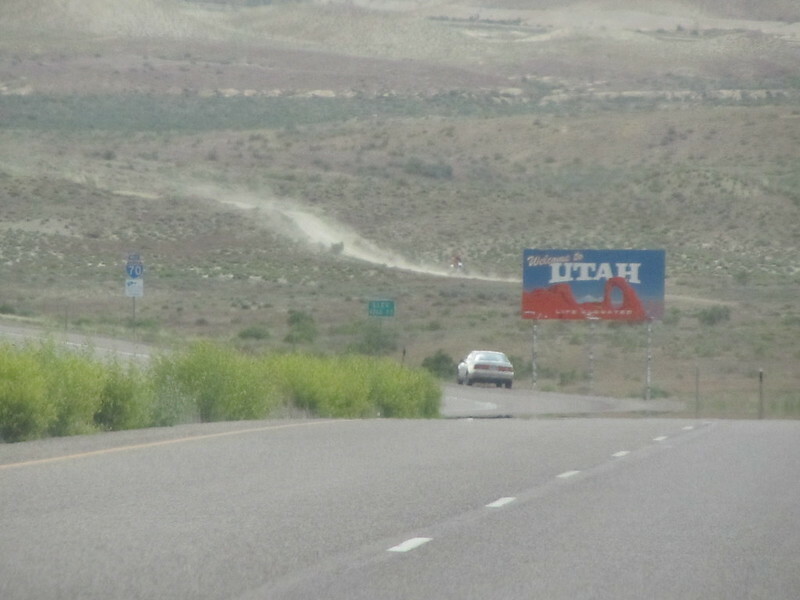 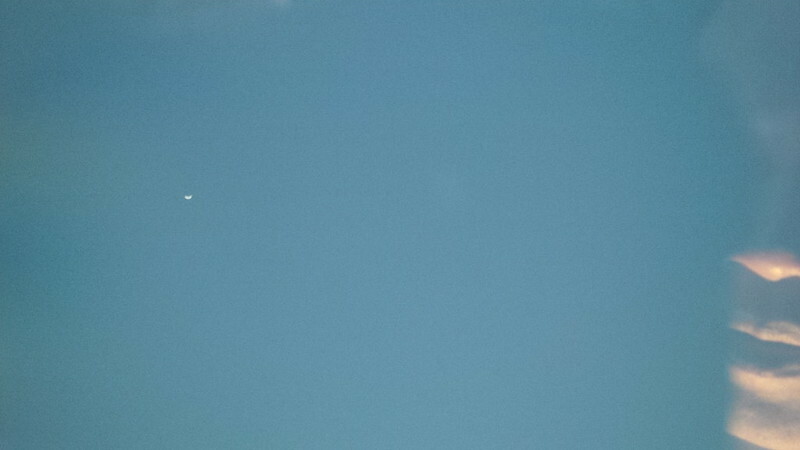 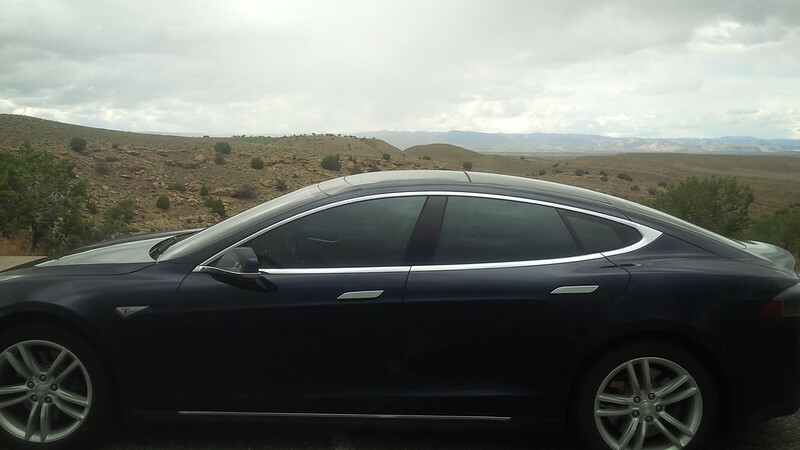 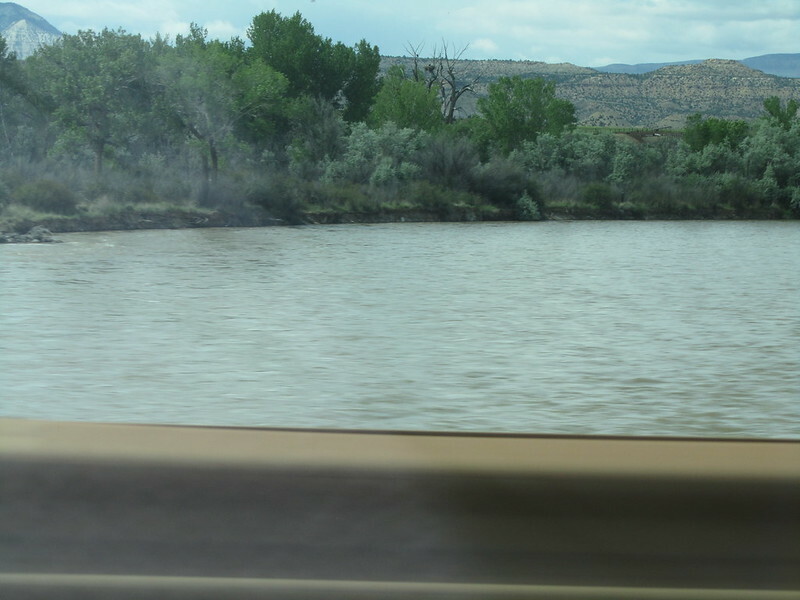 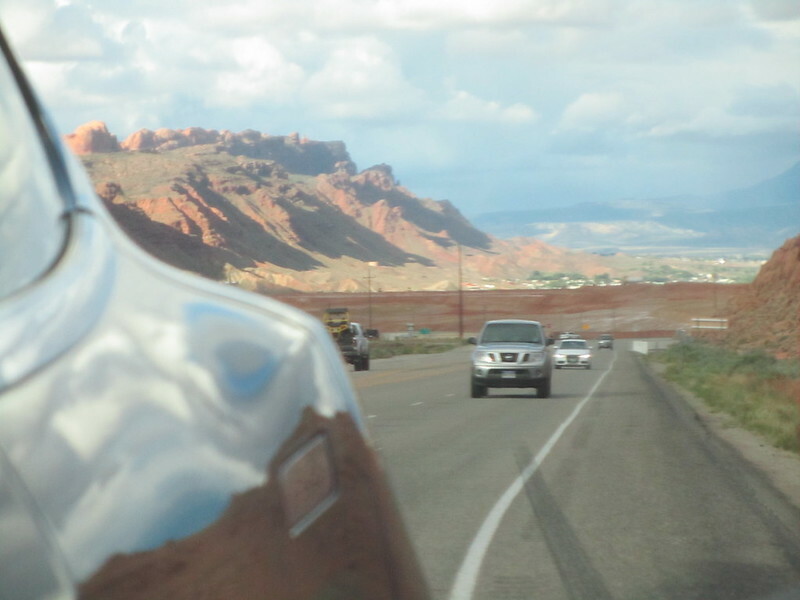 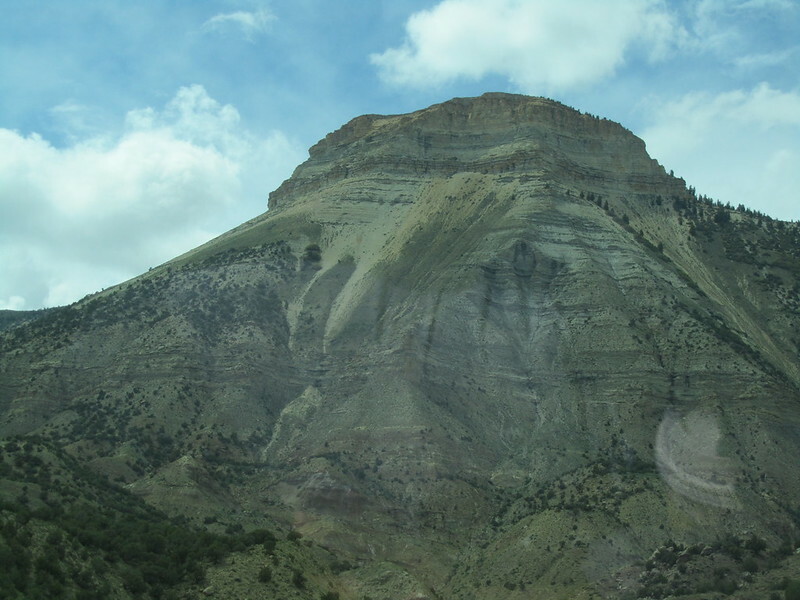 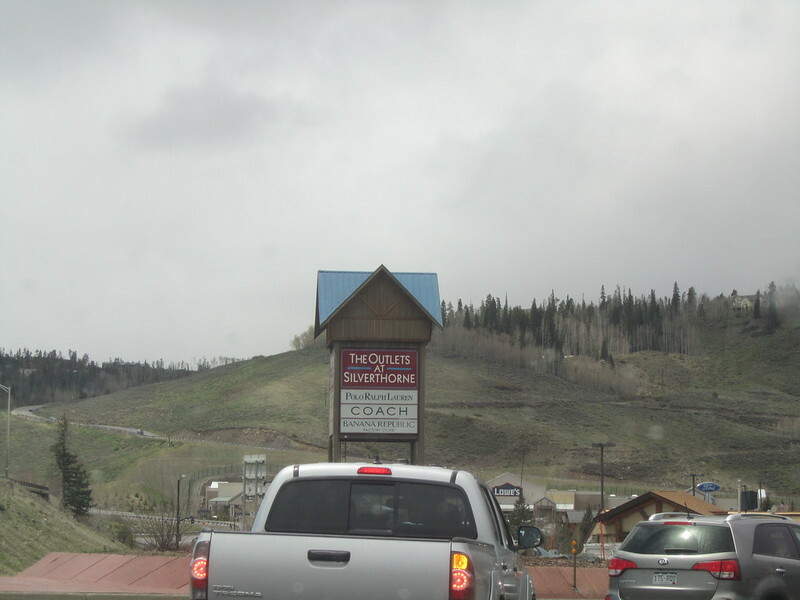 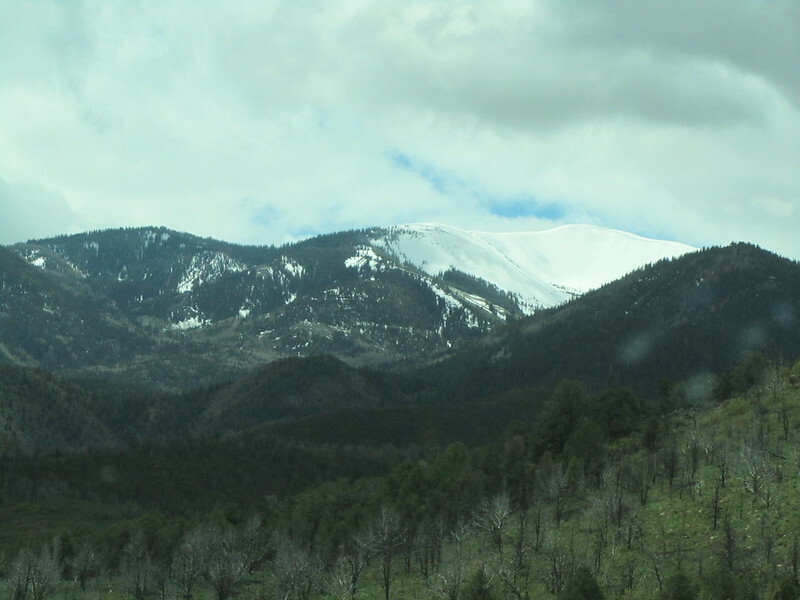 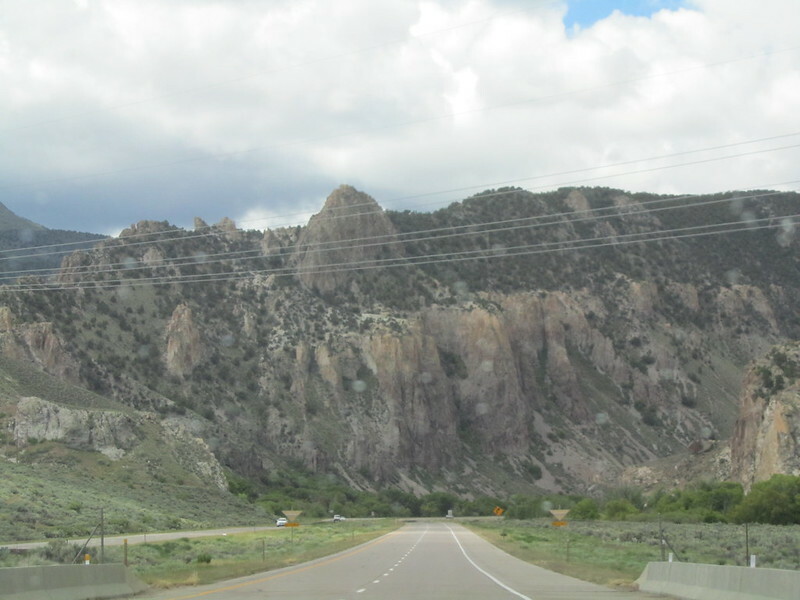 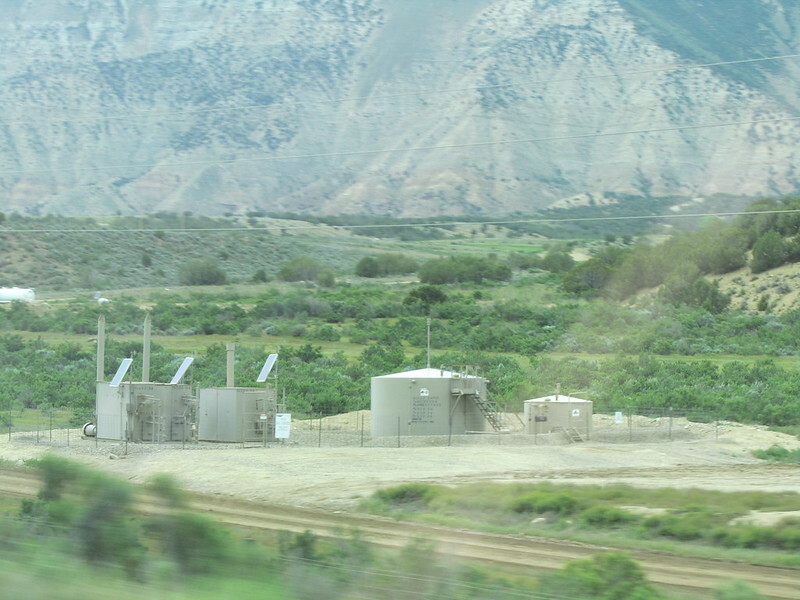 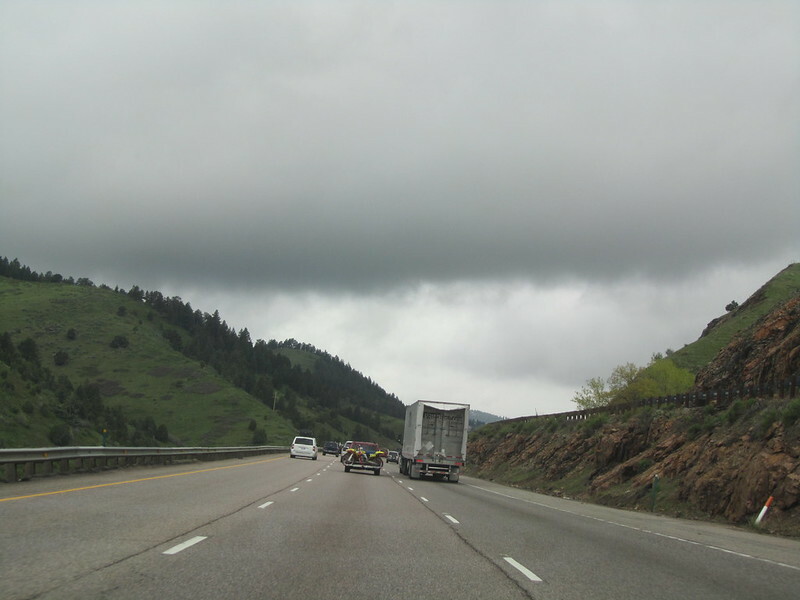 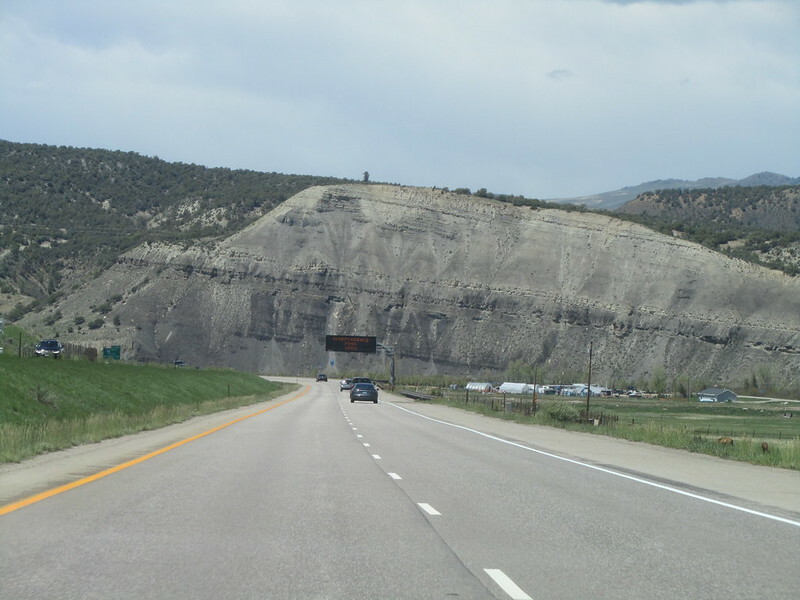 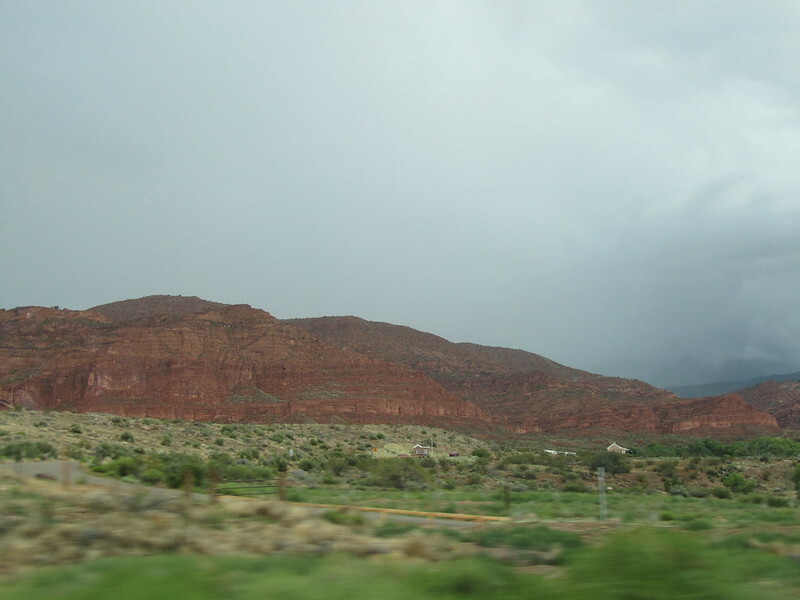 As we were getting closer to St. George, in Cedar City, UT, we spotted a strange sight on the side of the Freeway. 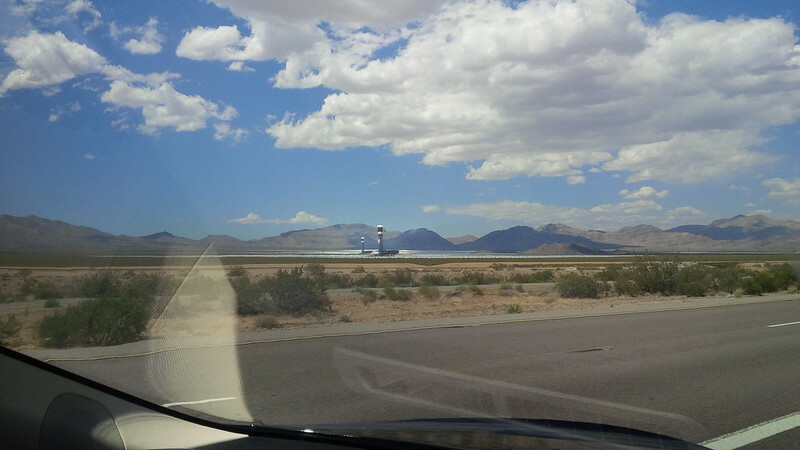 A lighthouse on the side of I-15. 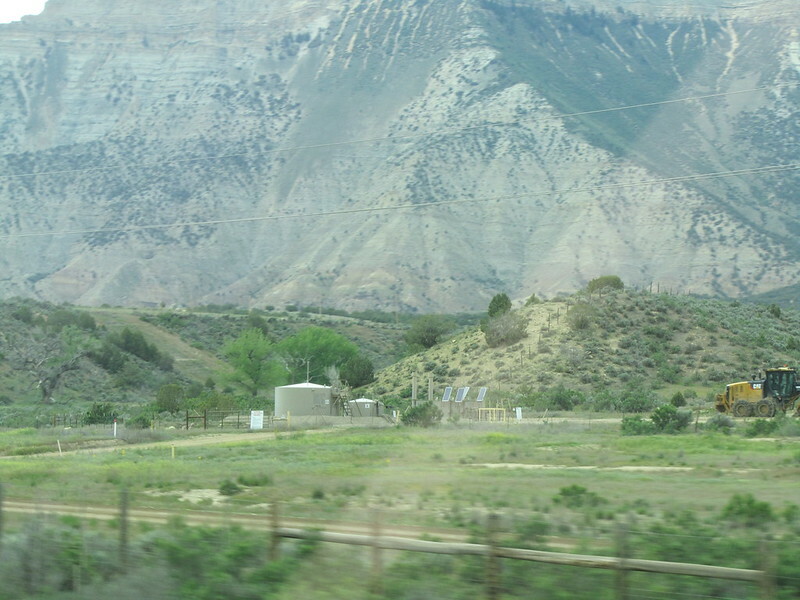 Apparently, this is not the ONLY lighthouse in Utah off the side of I-15. 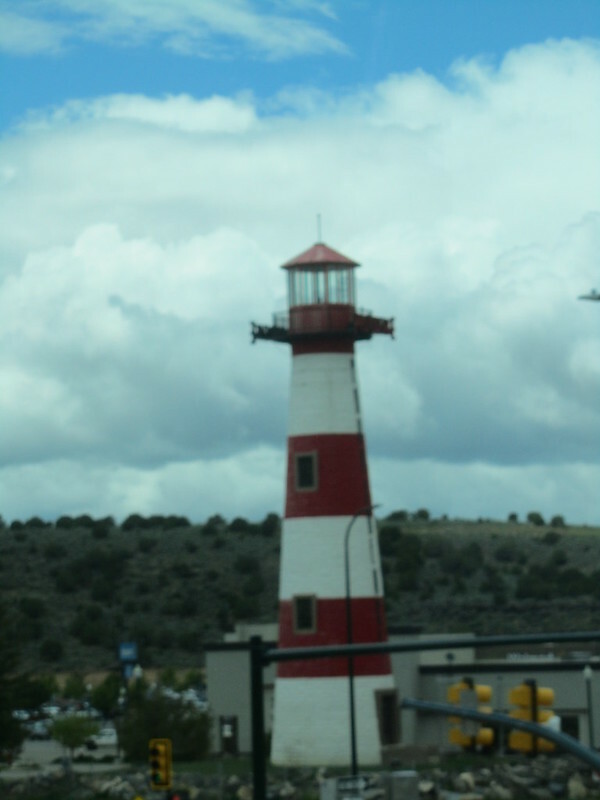 Because I was searching for the answer when I was researching this lighthouse and the first hit on the search was one North of Salt Lake City. 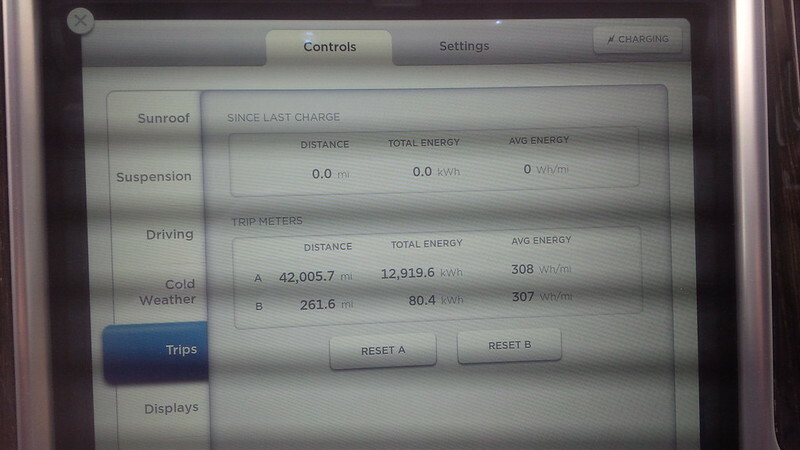 Here is what others have written about it. 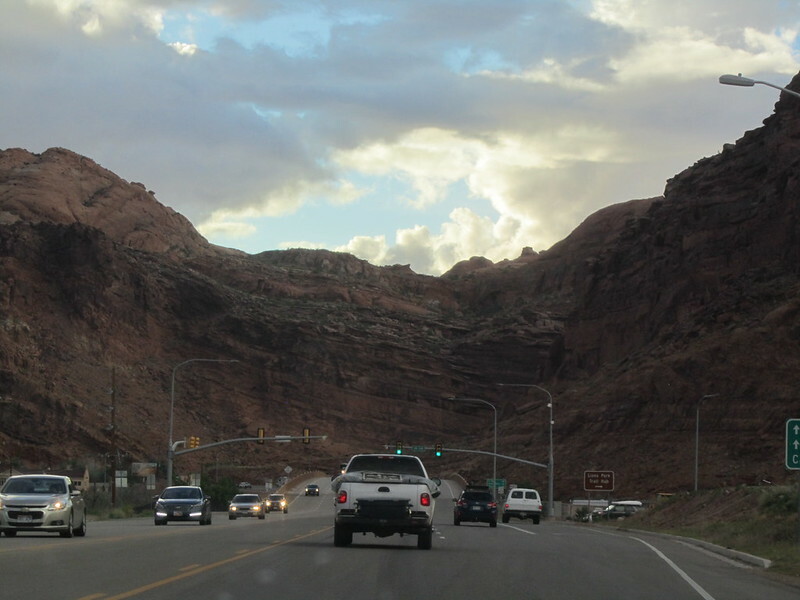 We just continued on, we had a meet-up in St. George to make. 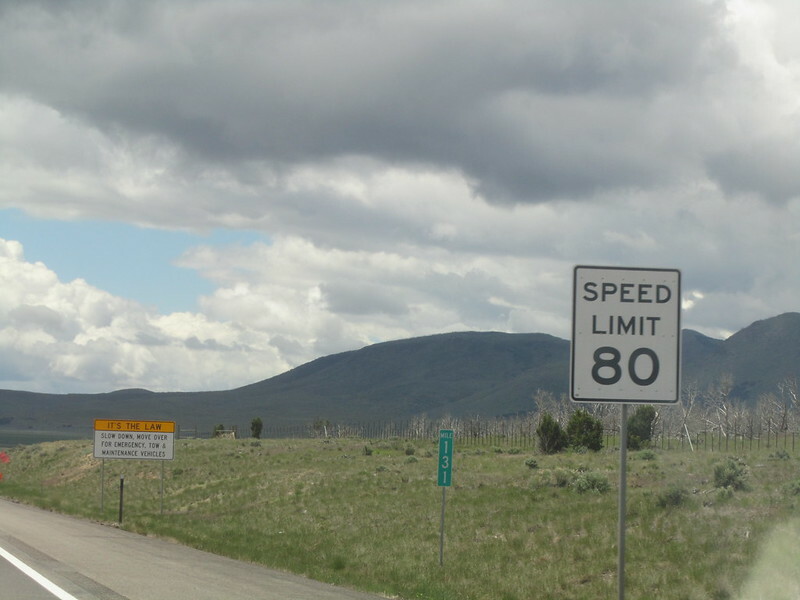 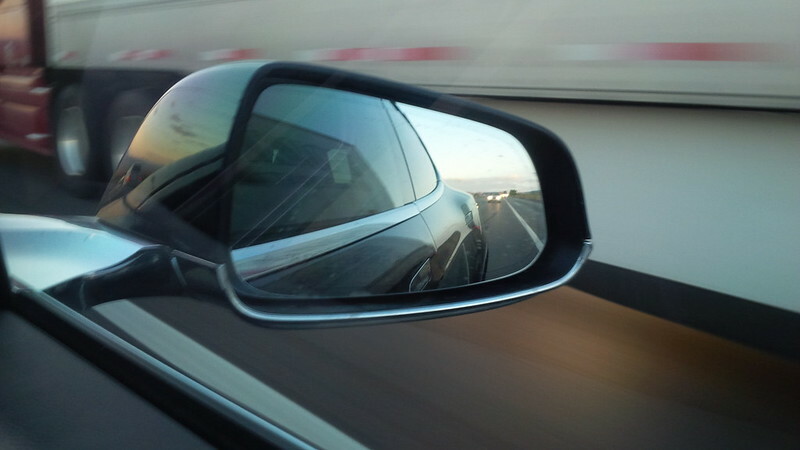 Normally if one were to see 80 MPH on the speedometer, one could surmise that we were speeding. 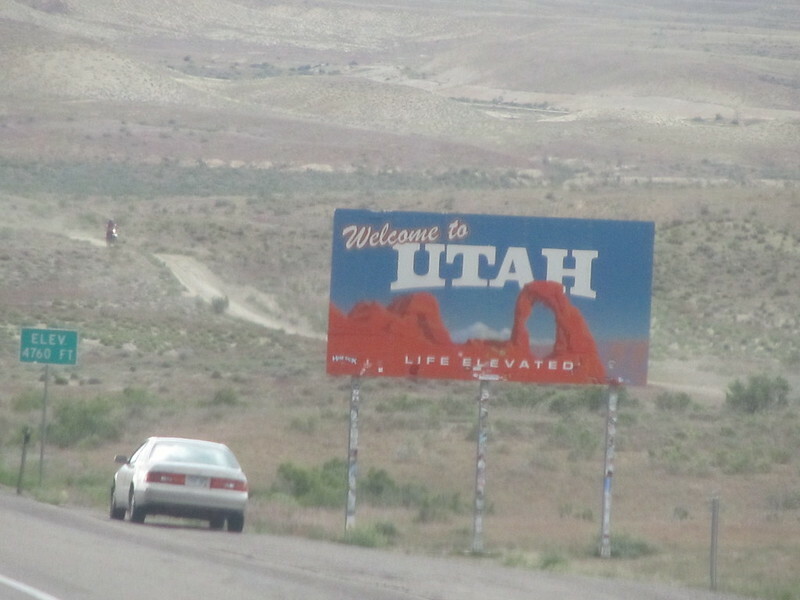 Not so in Utah, besides we just hit 42,500 miles on the odometer there. 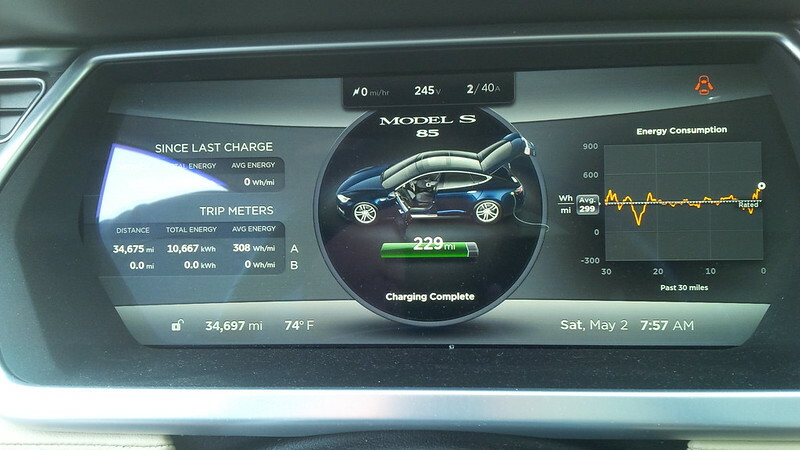 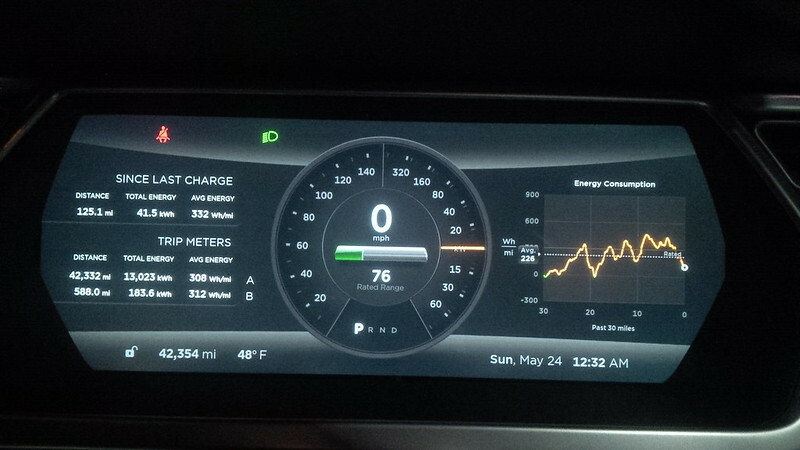 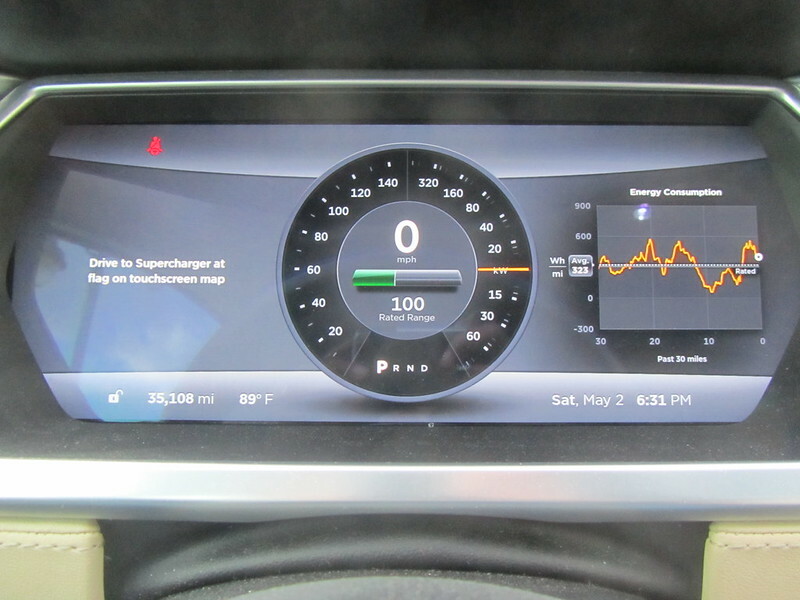 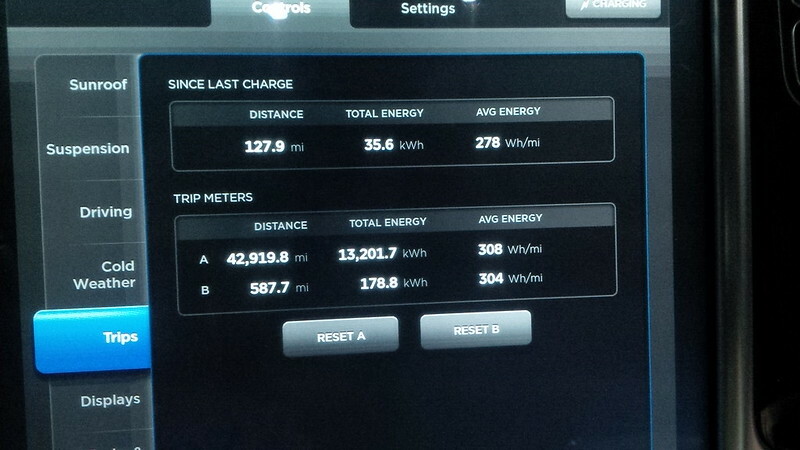 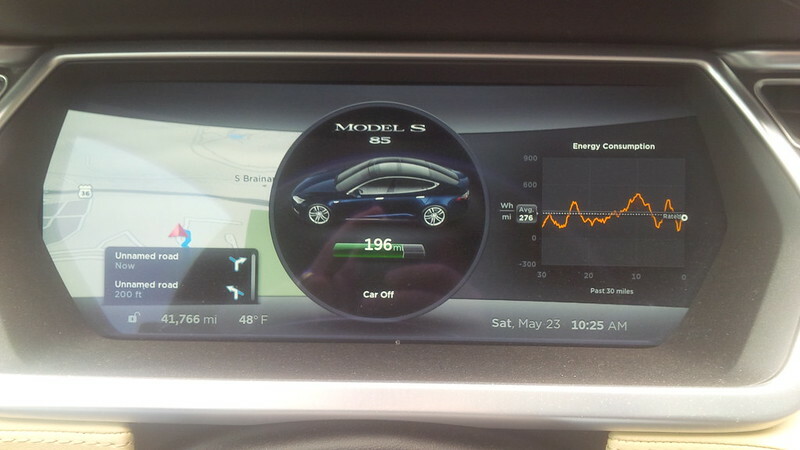 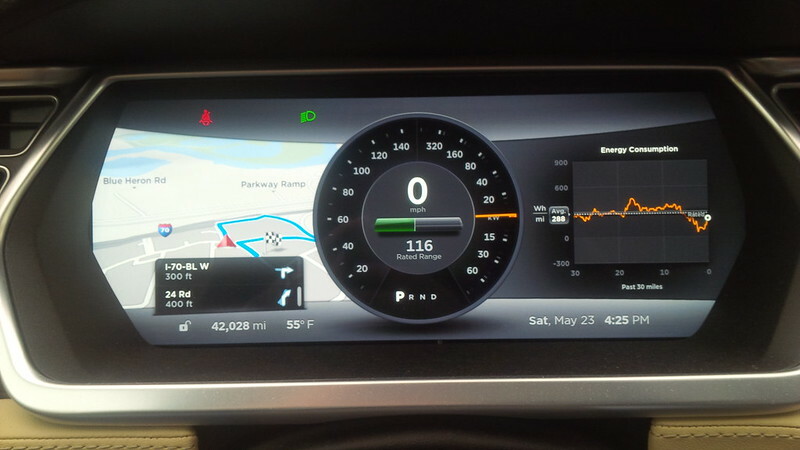 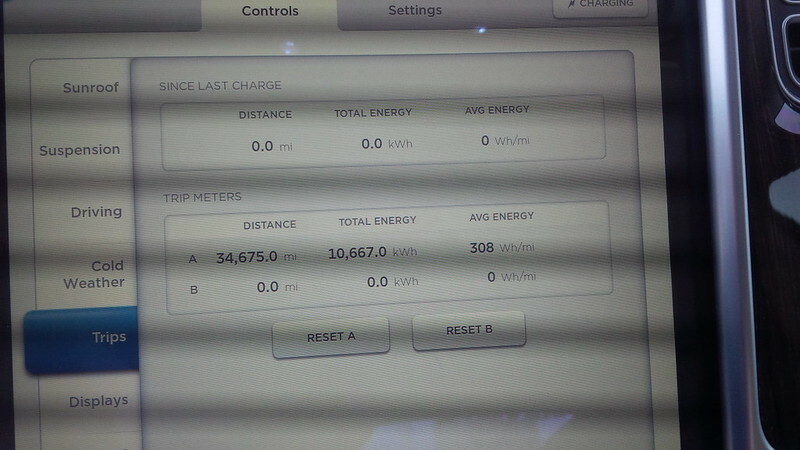 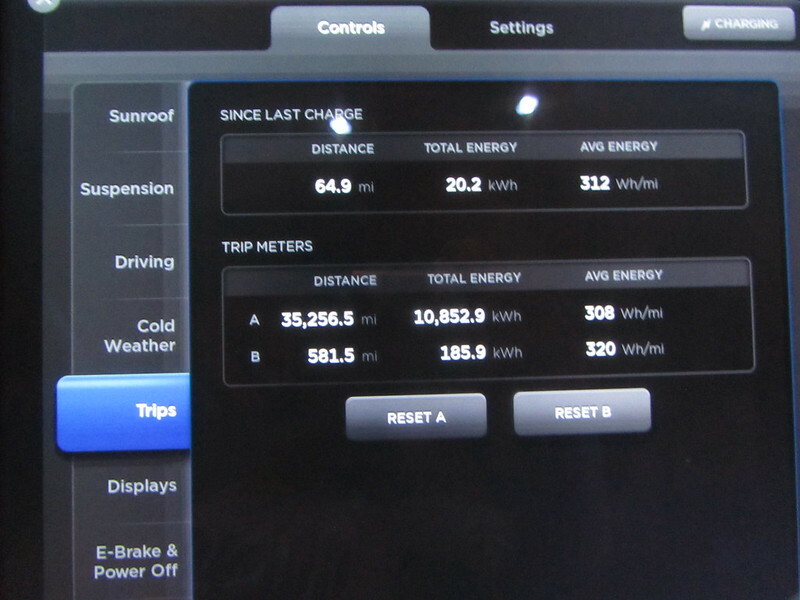 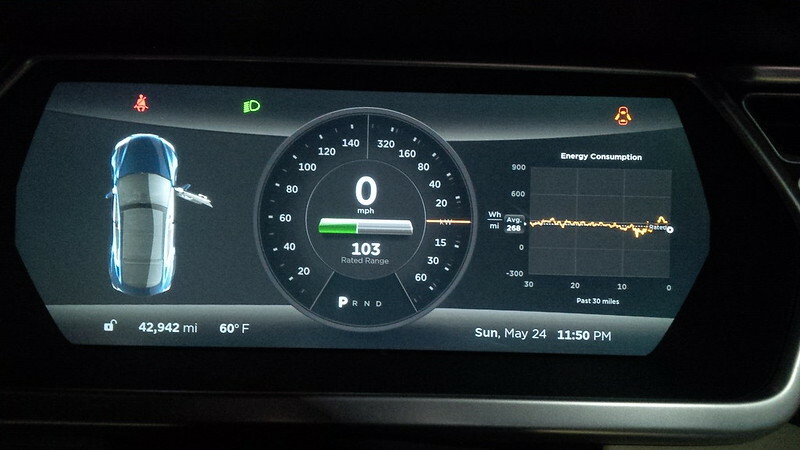 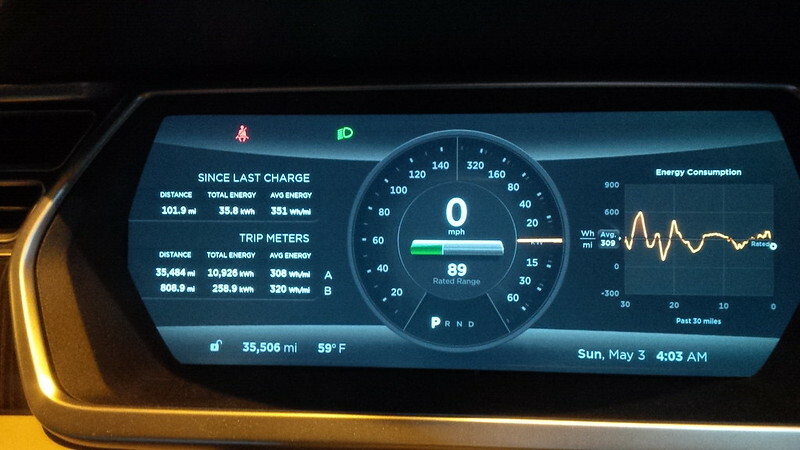 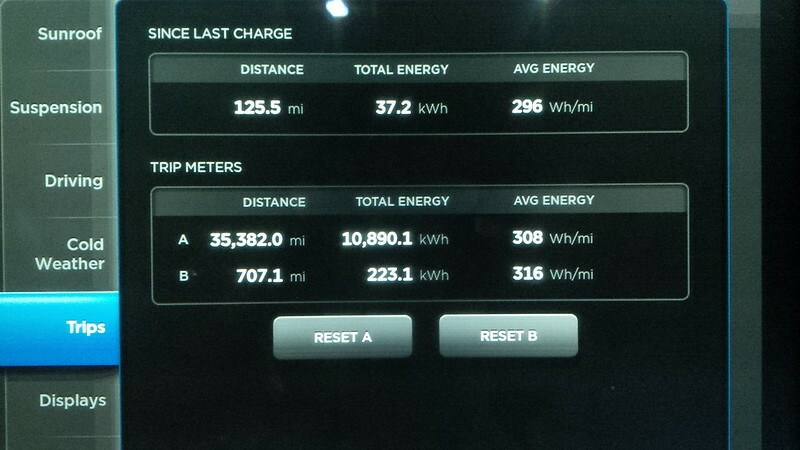 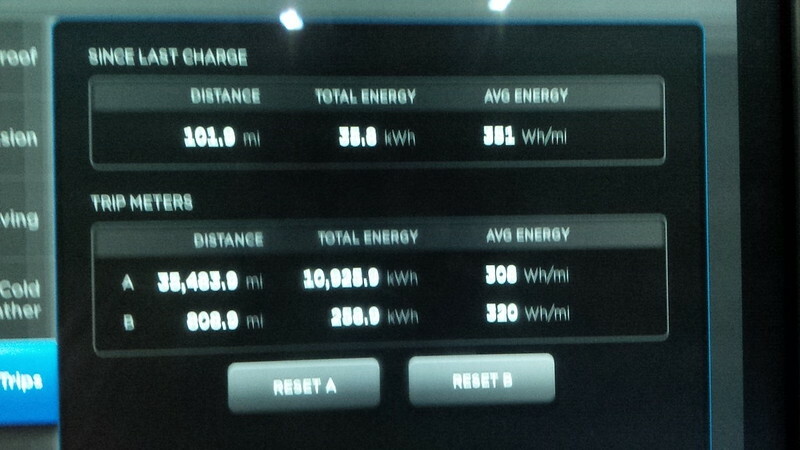 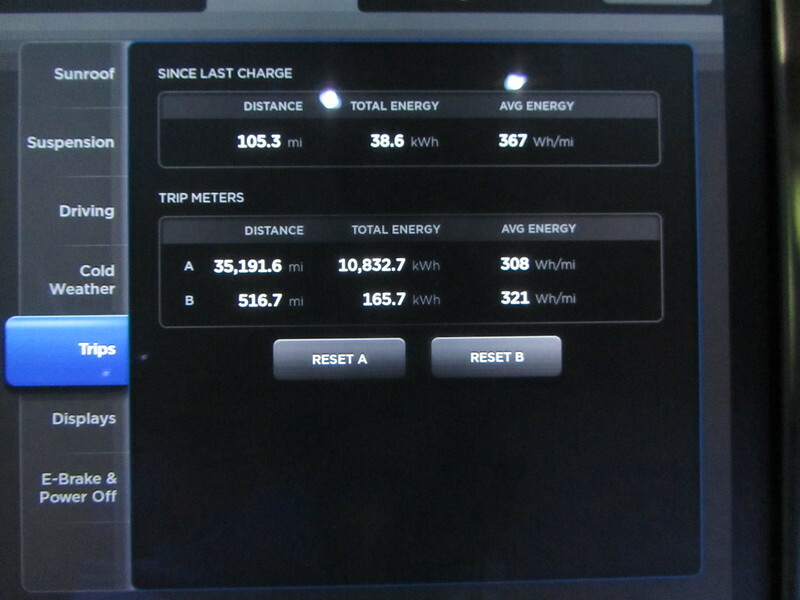 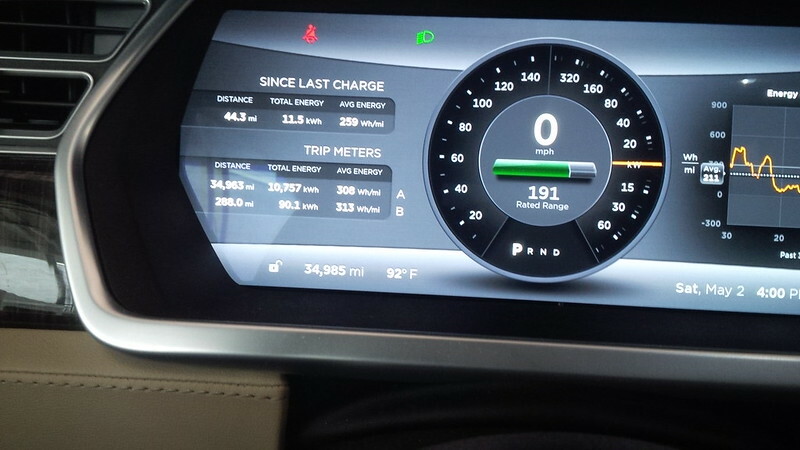 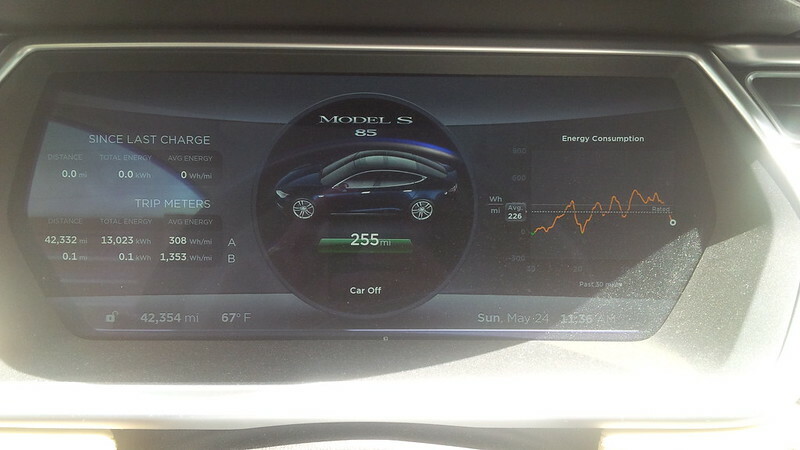 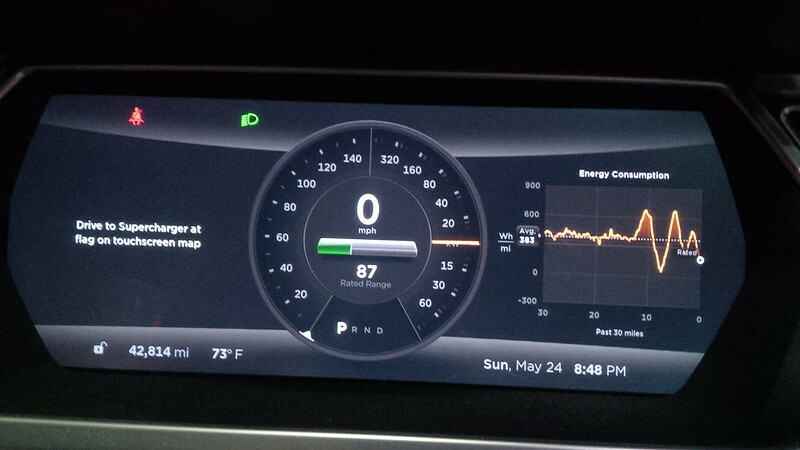 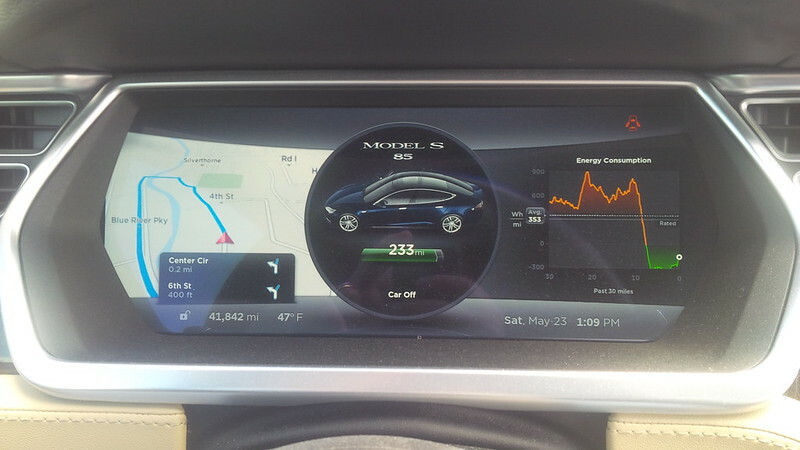 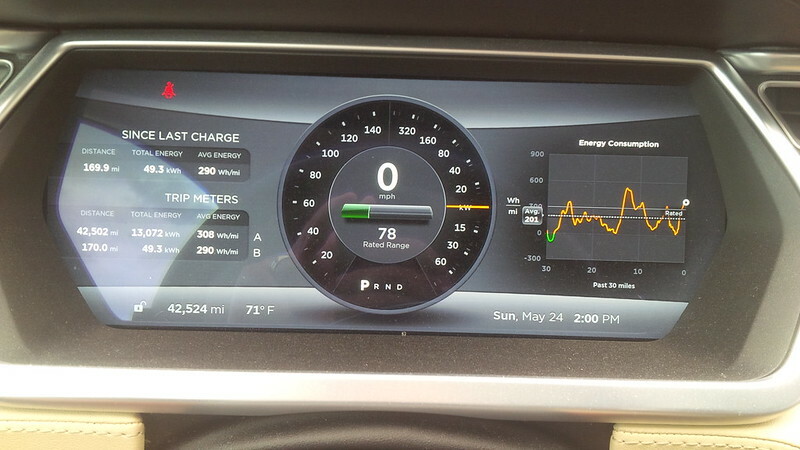 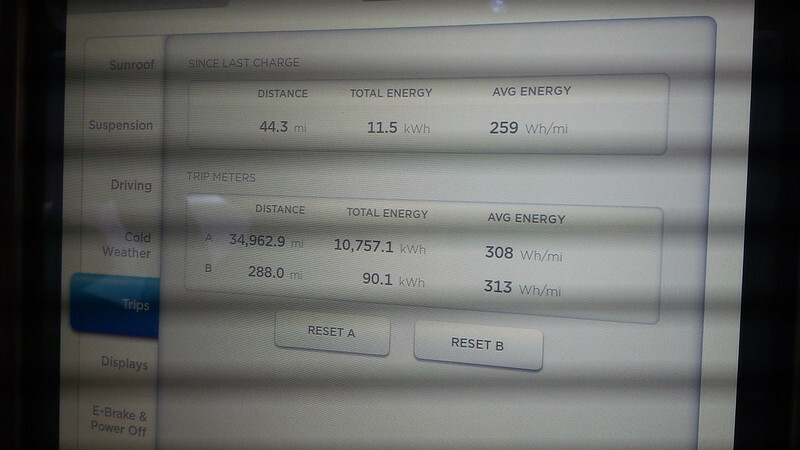 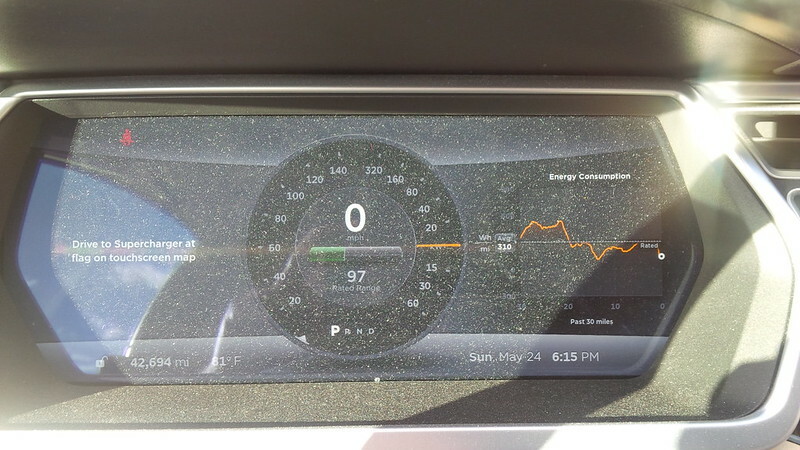 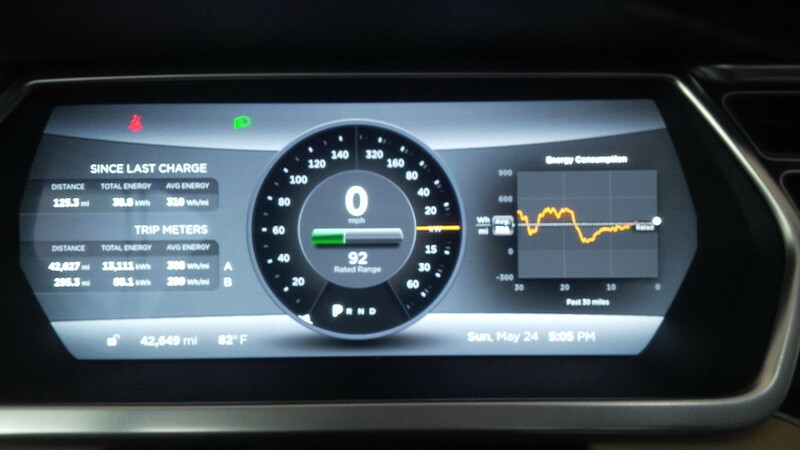 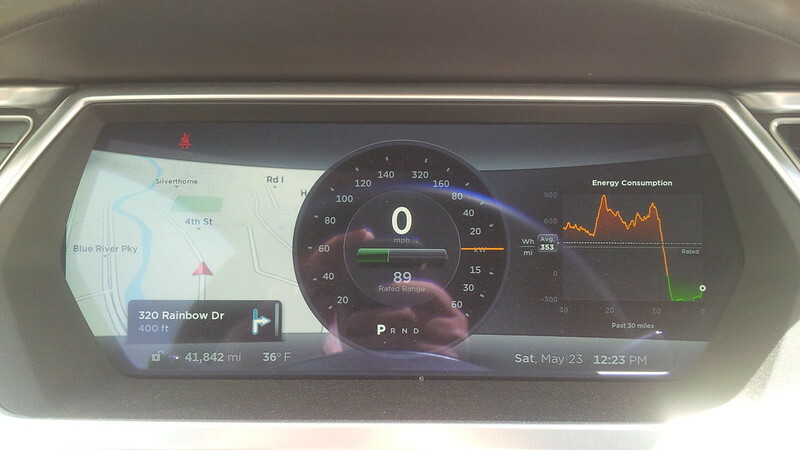 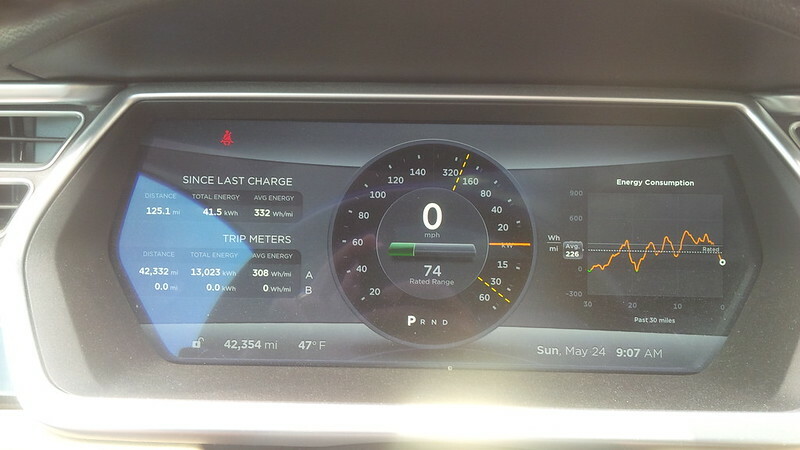 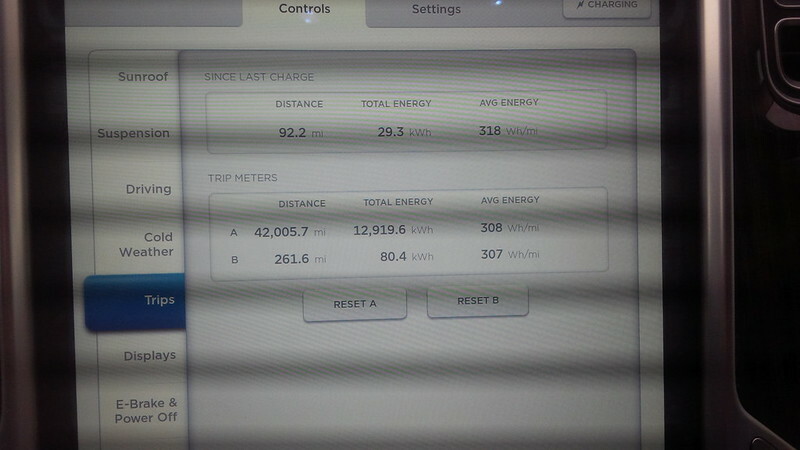 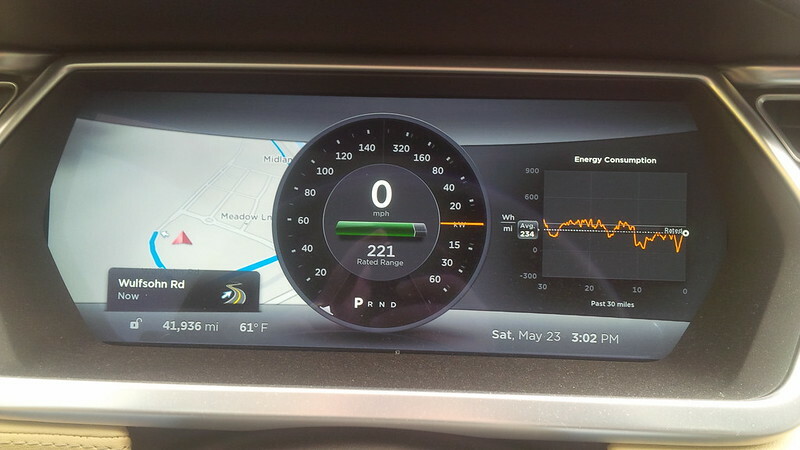 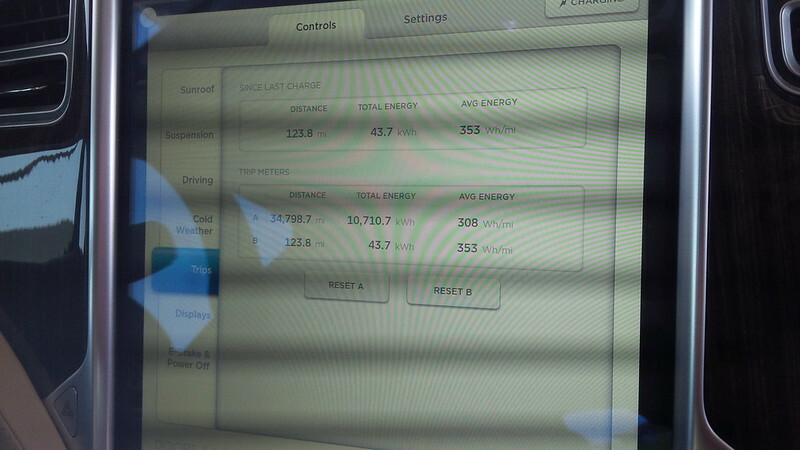 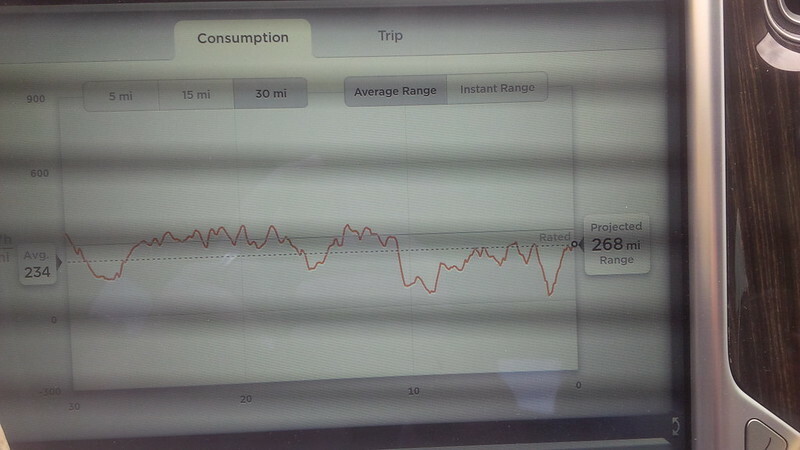 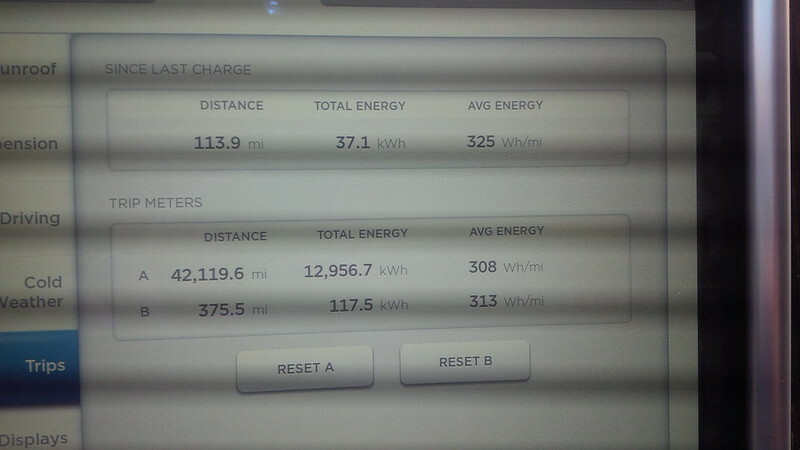 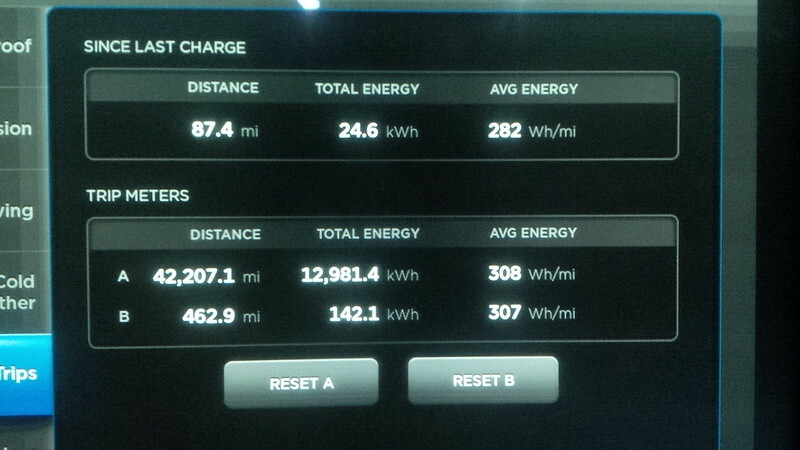 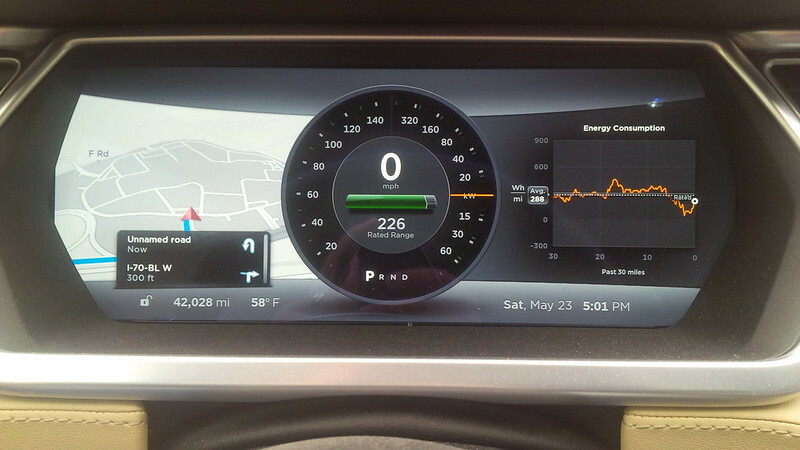 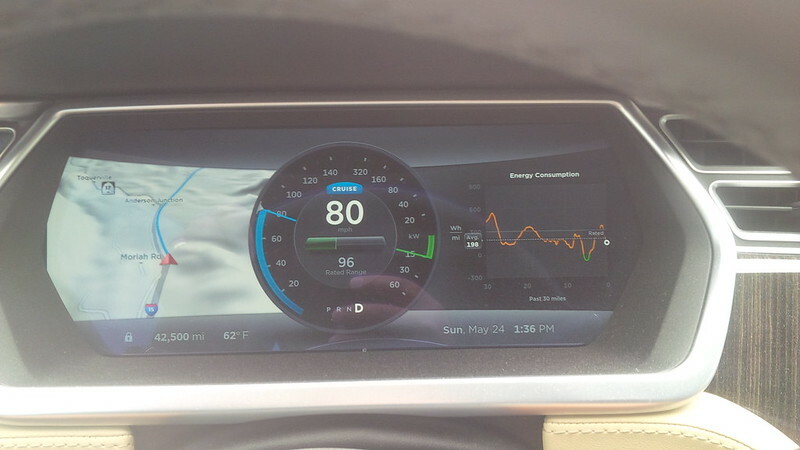 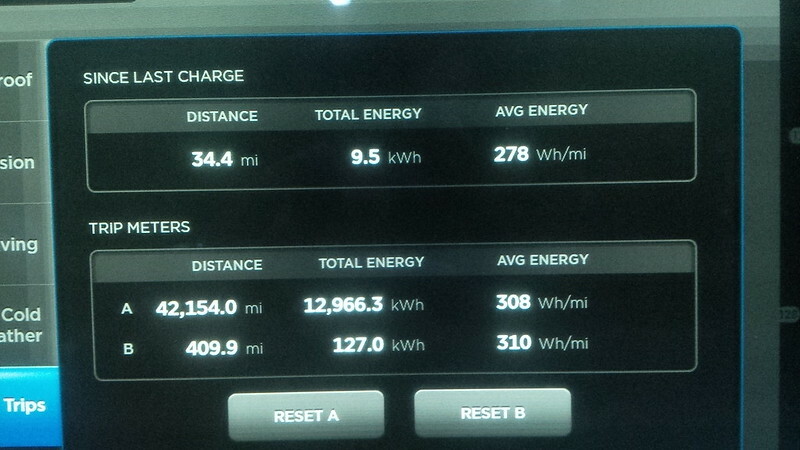 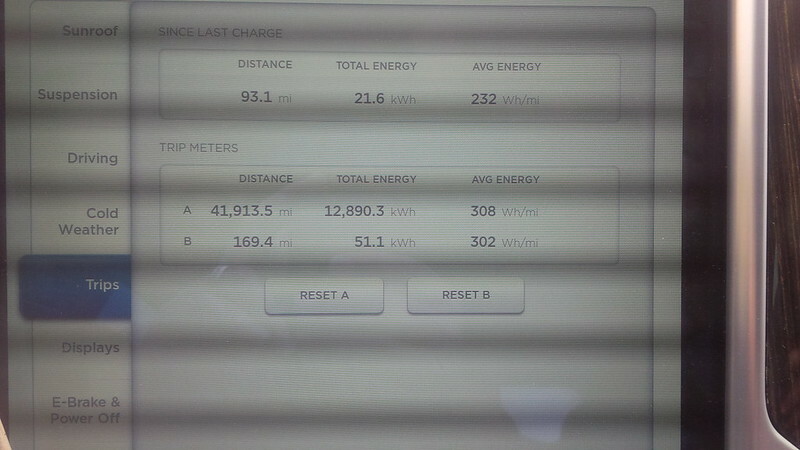 Not only were we going 80 MPH, our 30 mile average consumption was less than 200 Wh/mi. 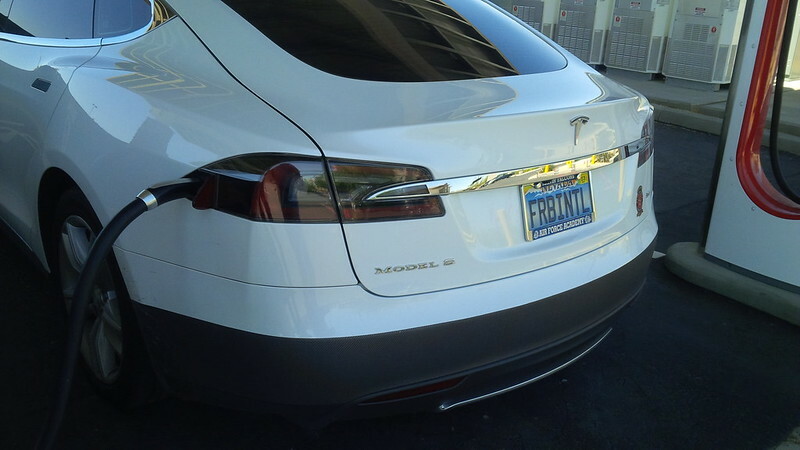 That’s fast AND efficient. 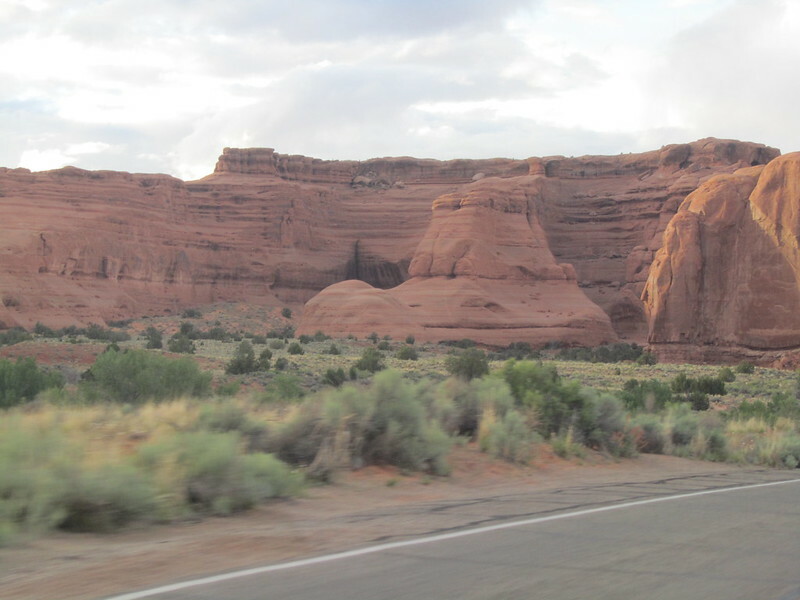 Each state in the Union has a distinctive feel to its place. 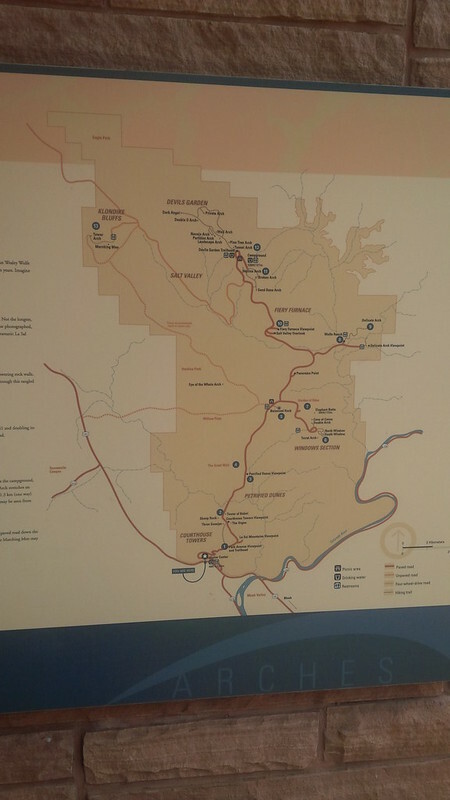 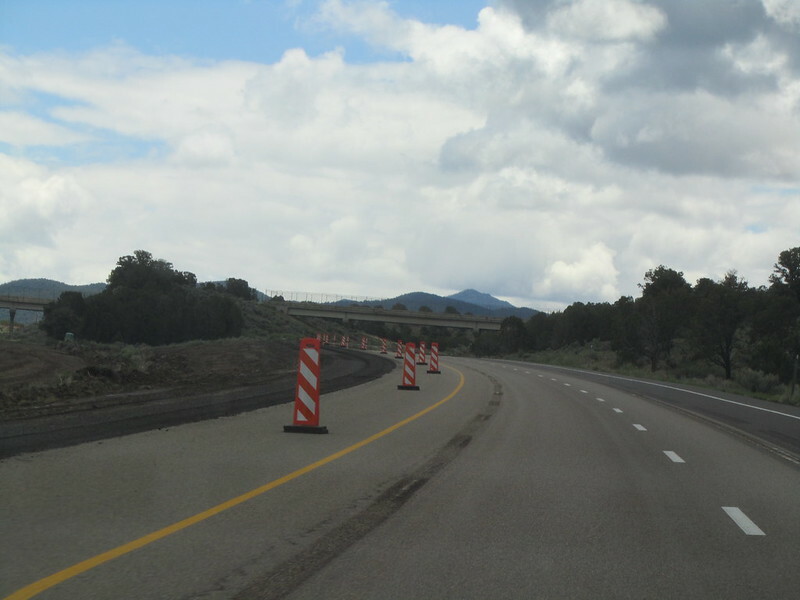 We noticed that there seems to be a change with every state crossing that we’ve done. 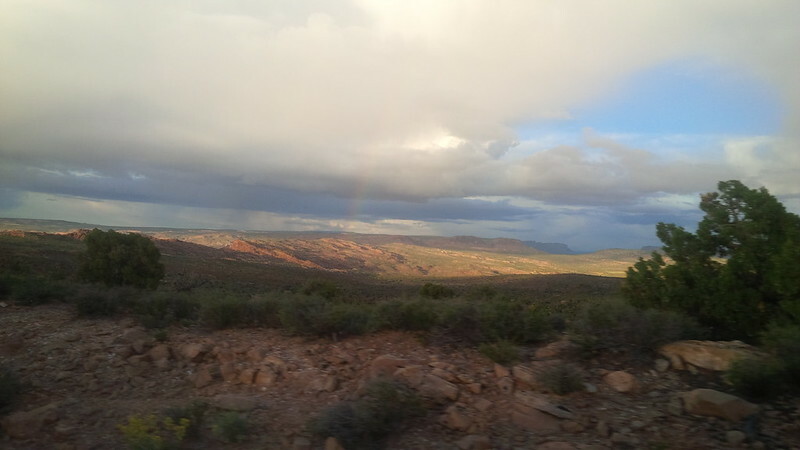 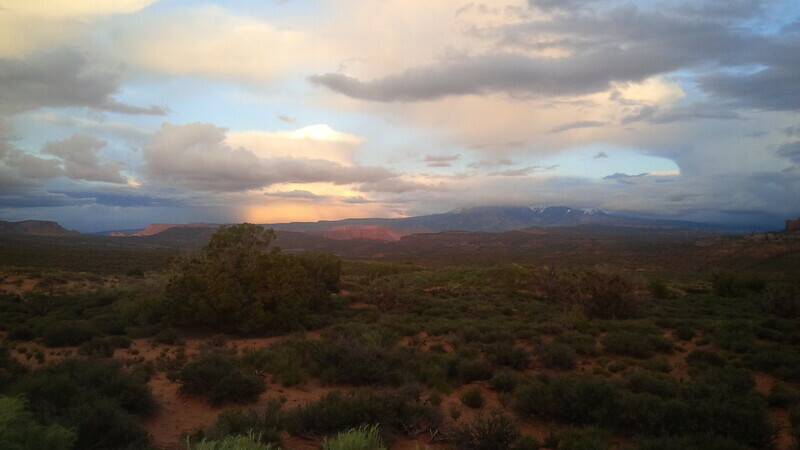 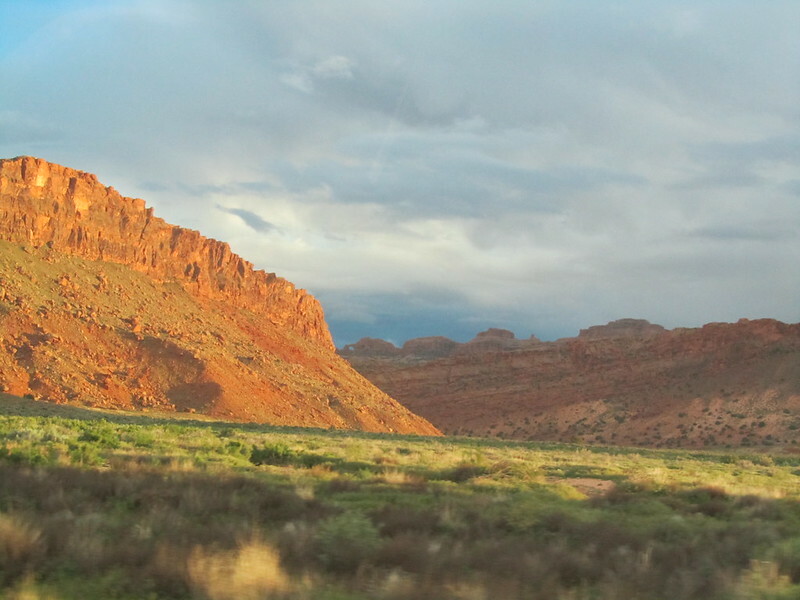 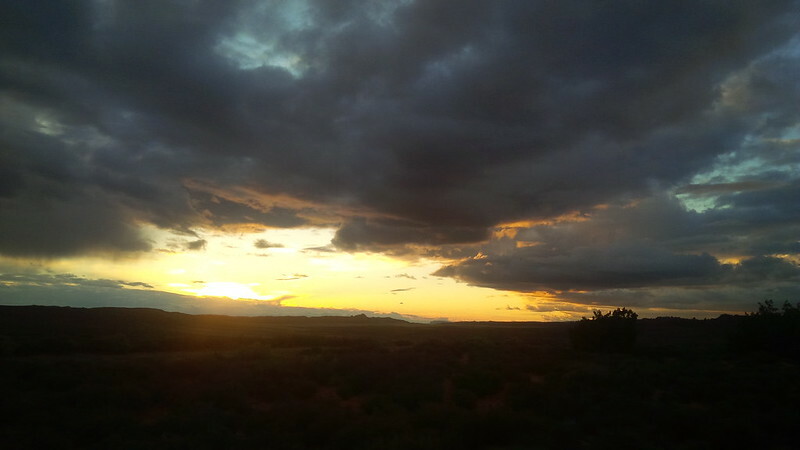 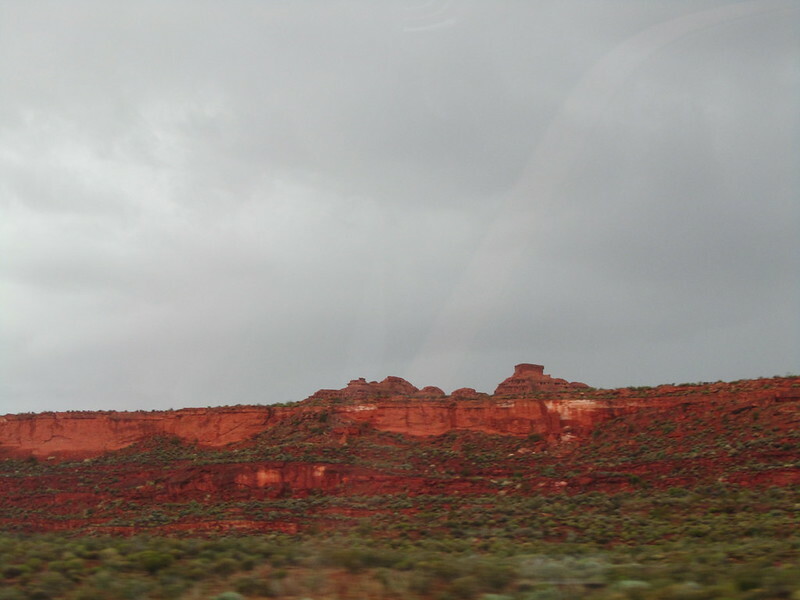 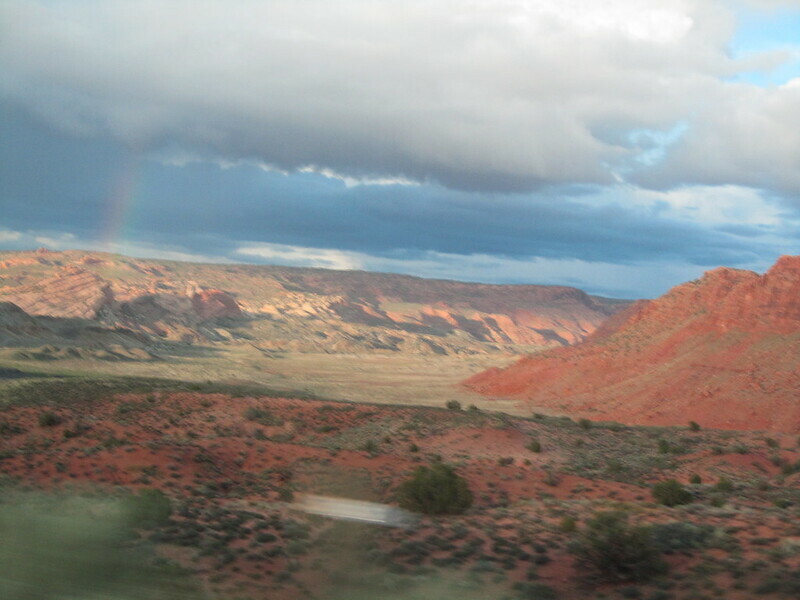 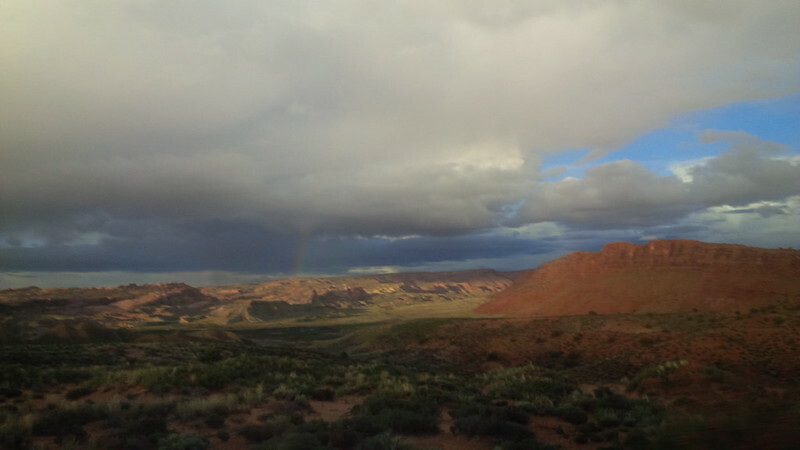 And Southern Utah and these deep red hues speak of the St. George area for us. 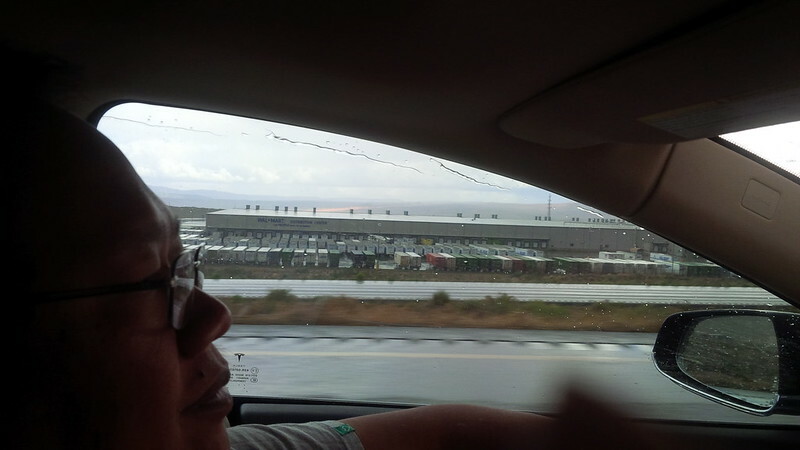 Just North of St. George is a BIG Walmart distribution center when we originally passed it on Day 1 of our drive, I was impressed by it, but forgot to take a photograph. 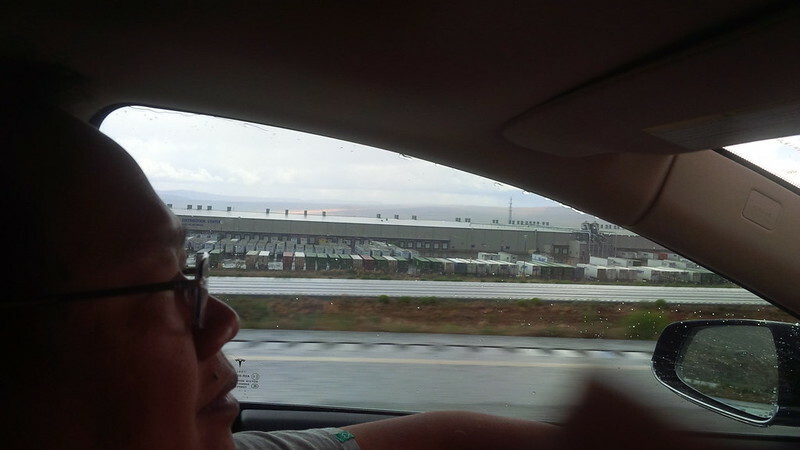 I suppose when you operate one of the world’s largest retail establishment, you need really large distribution centers and I was impressed with the size of this location. 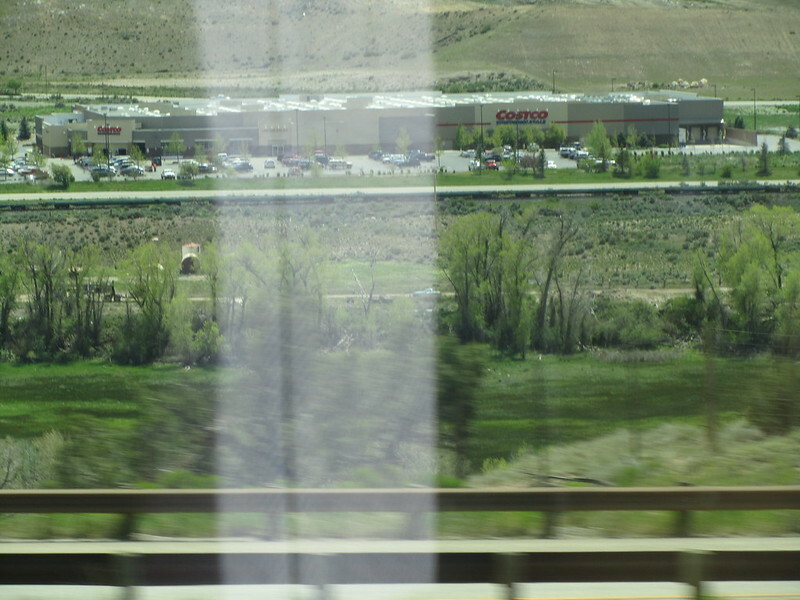 Traversing the freeway at 80 MPH we were still able to capture the center in three shots. 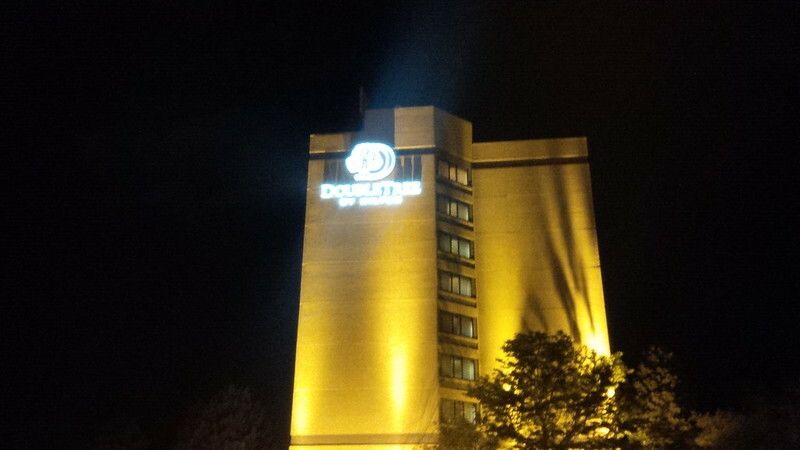 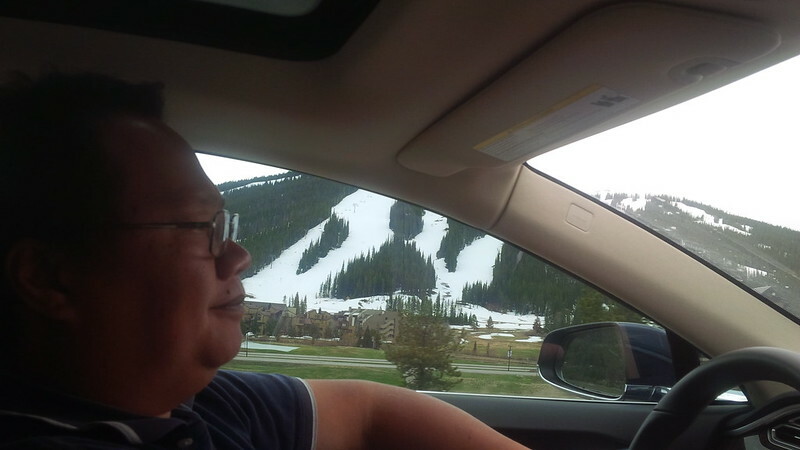 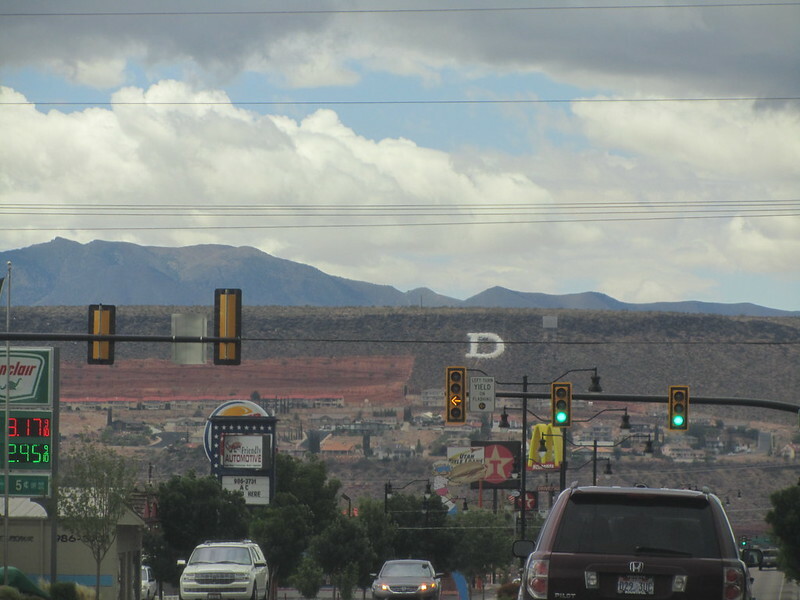 When we made the exit toward, St. George’s, we spot a really large D on the side of the hill. 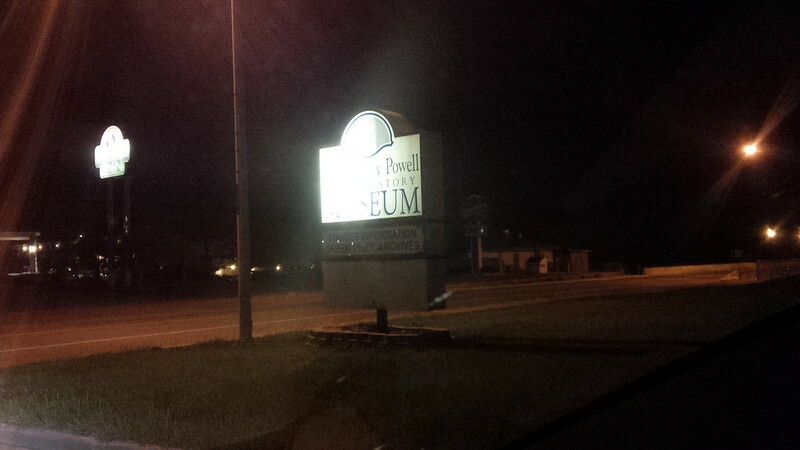 We passed a “P”, a “C”, and some other letters. 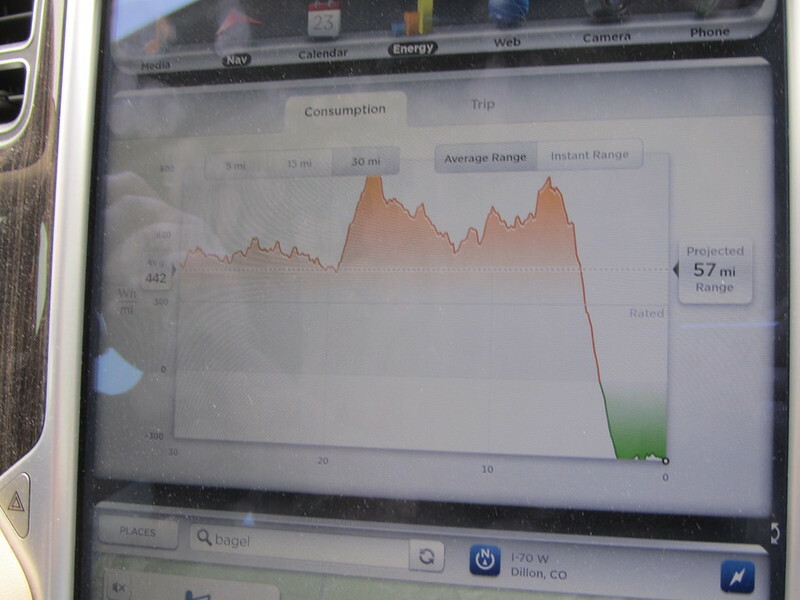 Considering all the humor regarding the D launch event, figured to capture another D on our blog. 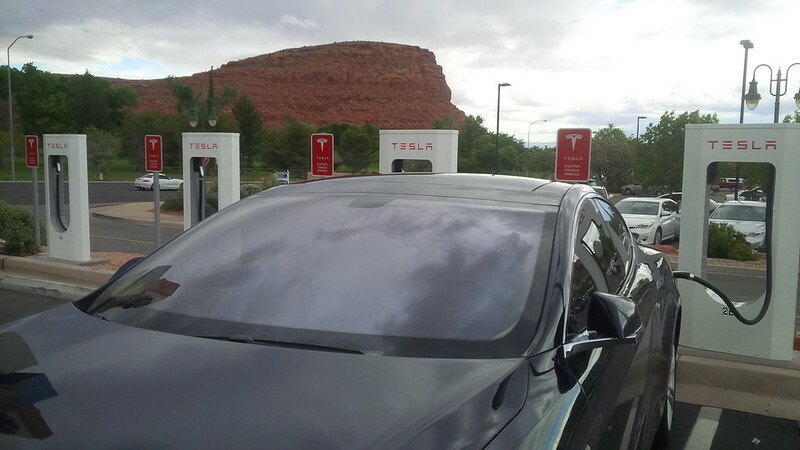 We arrived in St. George making the long trek across town to get to the oasis that is Starbucks and the Tesla Supercharger. 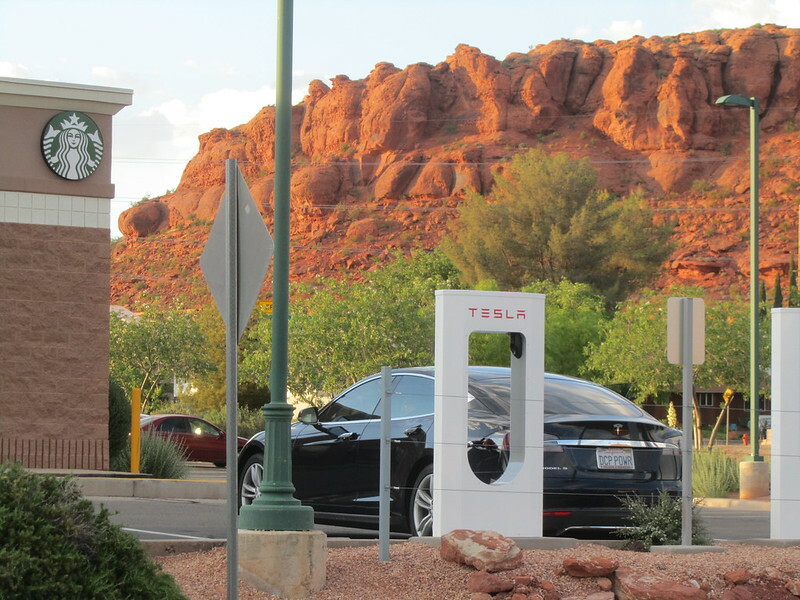 In contrast with the various other supercharger locations on this trip, the St. George location seems to be a ways off from the highway. 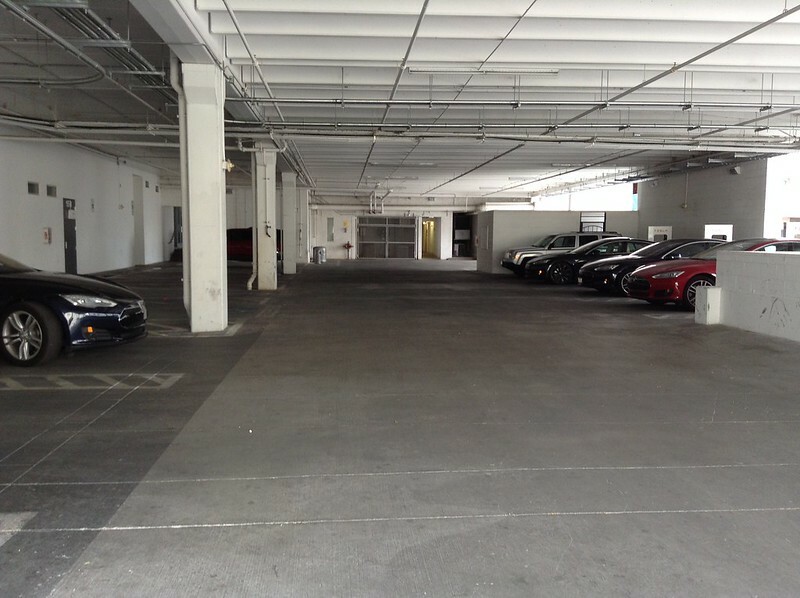 I suppose that Tesla had to find a willing participant to host the site and we’re glad that Starbucks and their landlord was good enough to oblige. 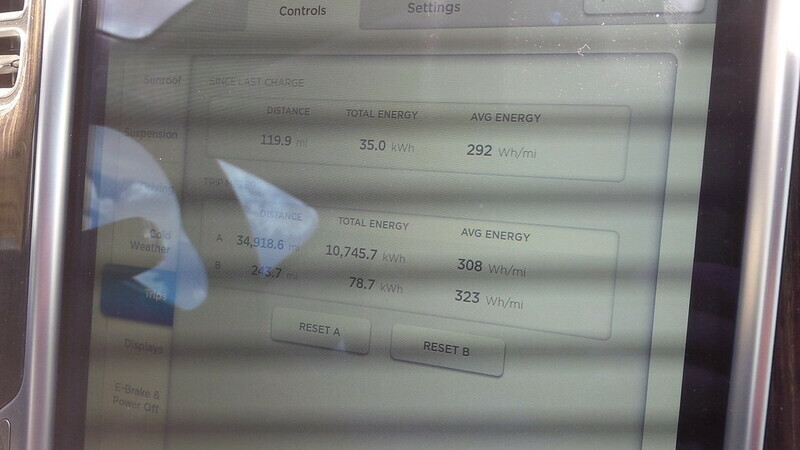 Traveling at 80 MPH for most of the drive was fun, but I was more impressed with the 290 Wh/mi figure that we were able to sustain. 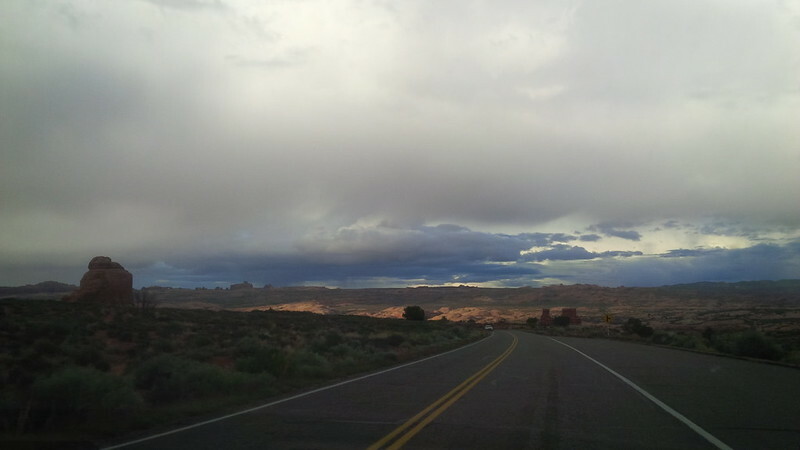 Even with some light rain on the drive. 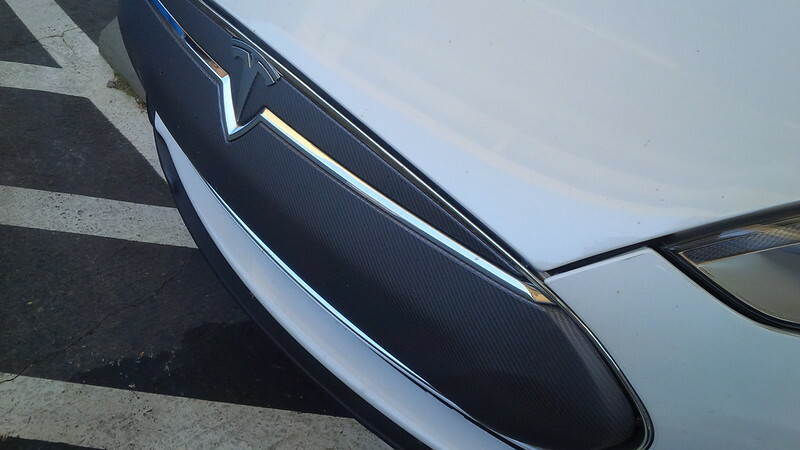 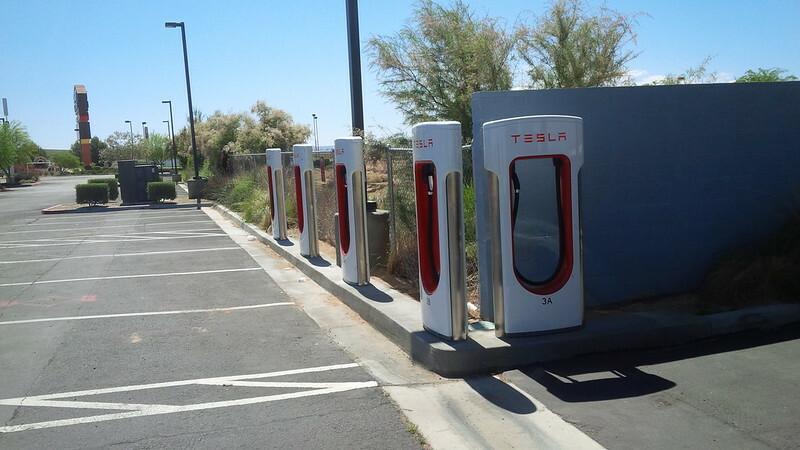 Since the area around the Las Vegas Supercharger felt unsafe, we decided to get as much a charge as possible. 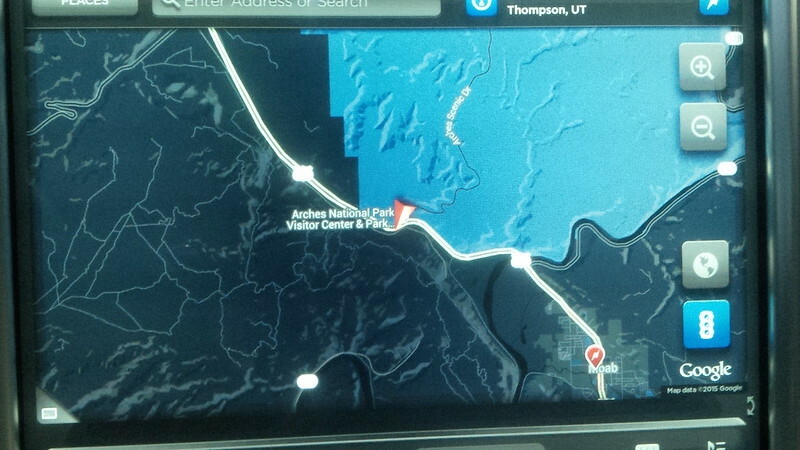 Besides, we were going to be meeting Mark Larsen in real life. 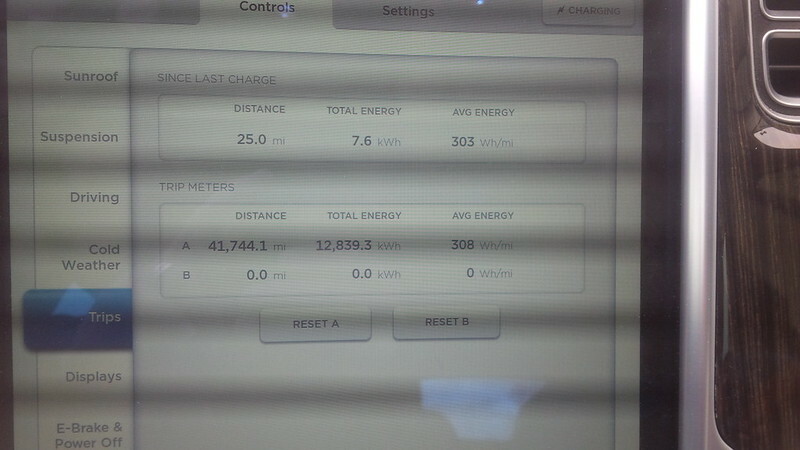 So, we had pleasant EV company to discuss all things EV and Solar with. 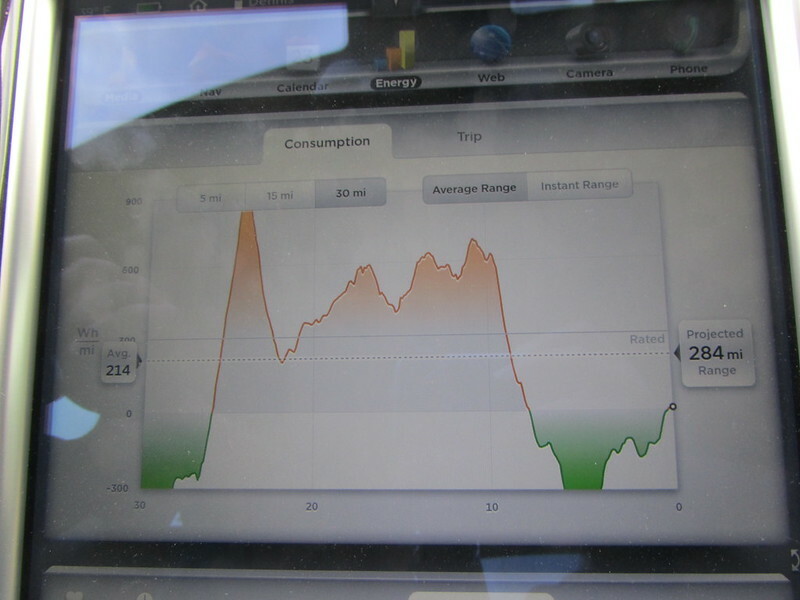 Mark has done a great job creating and maintaining a graphic representation of EV sales through the years. 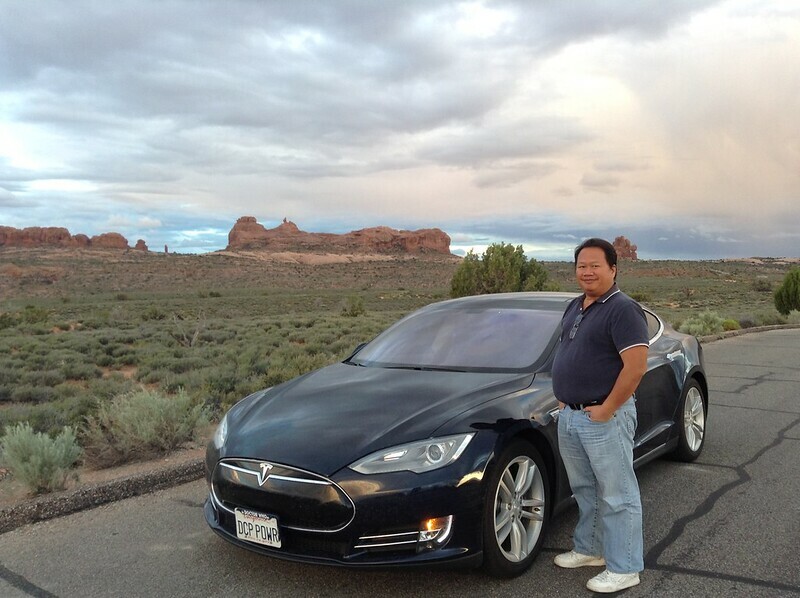 Aside from Twitter, Mark also writes on his own website. 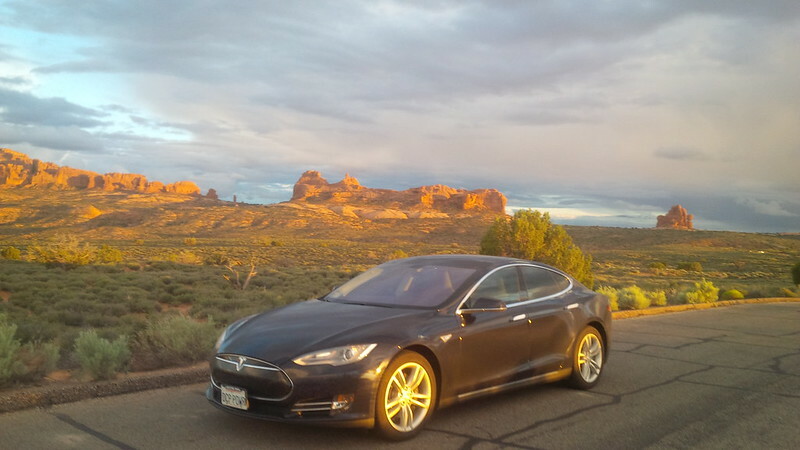 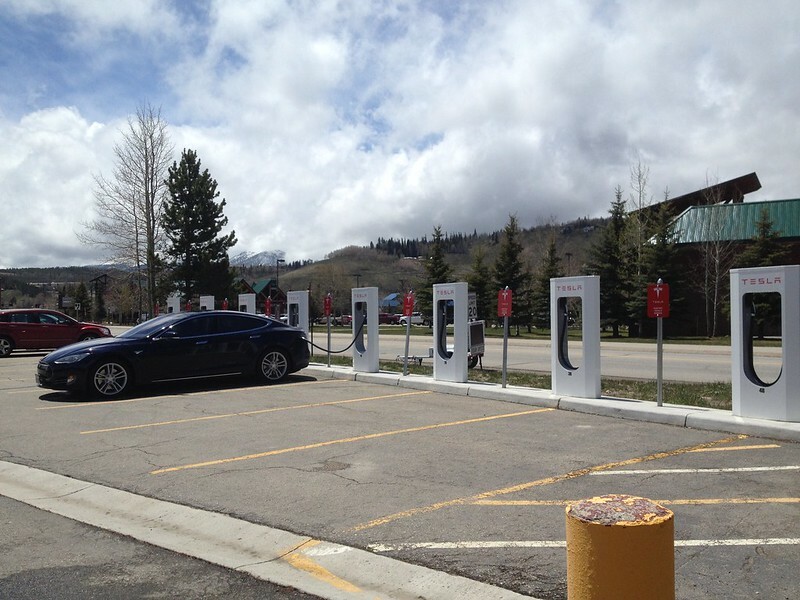 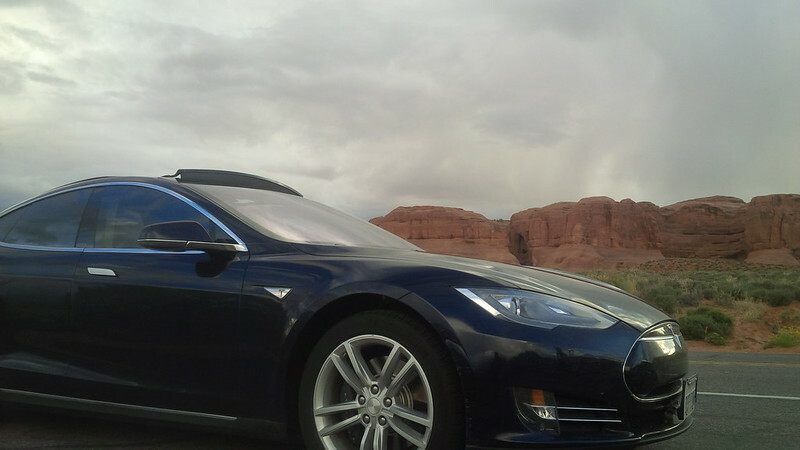 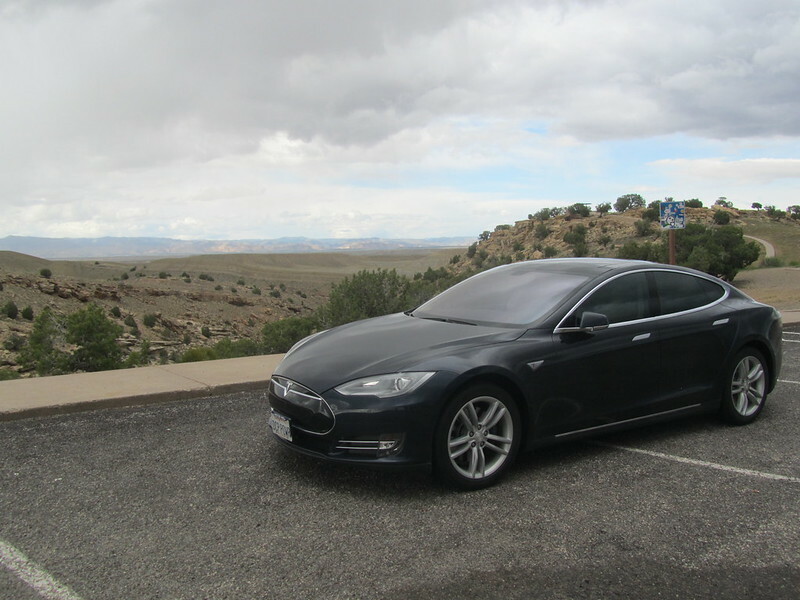 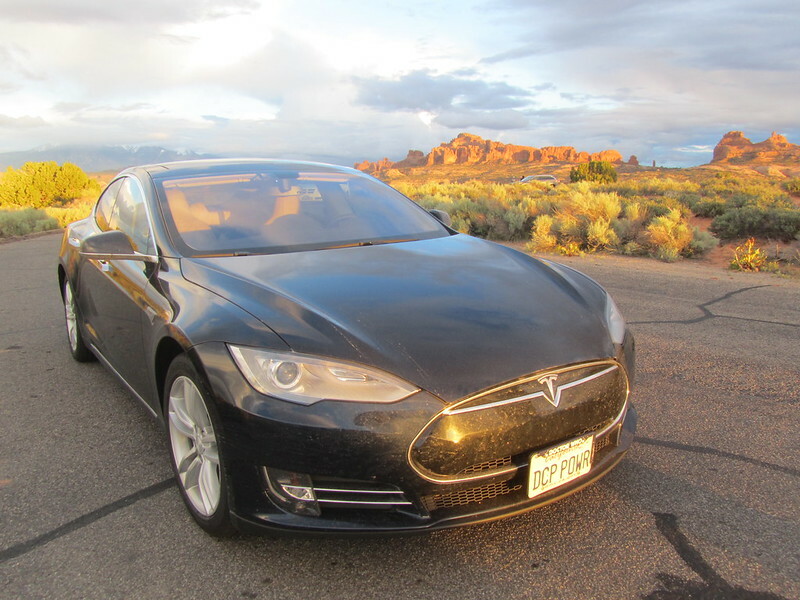 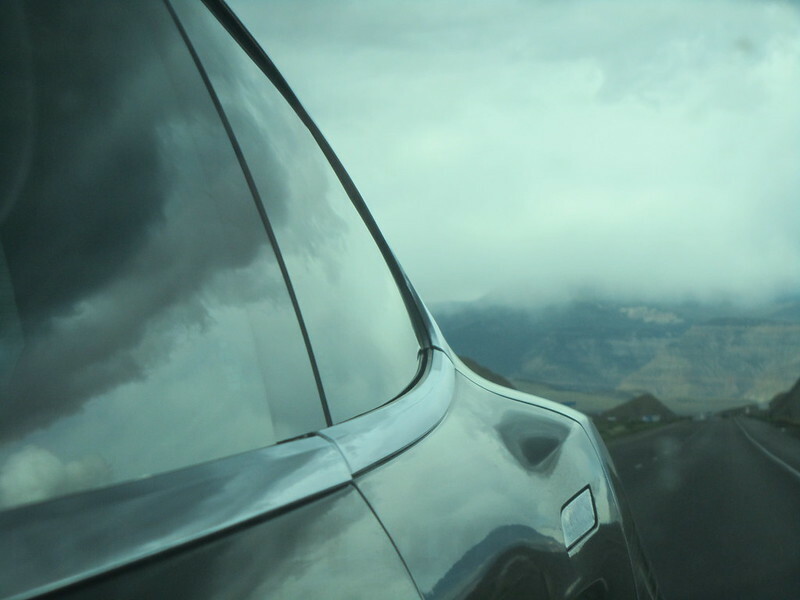 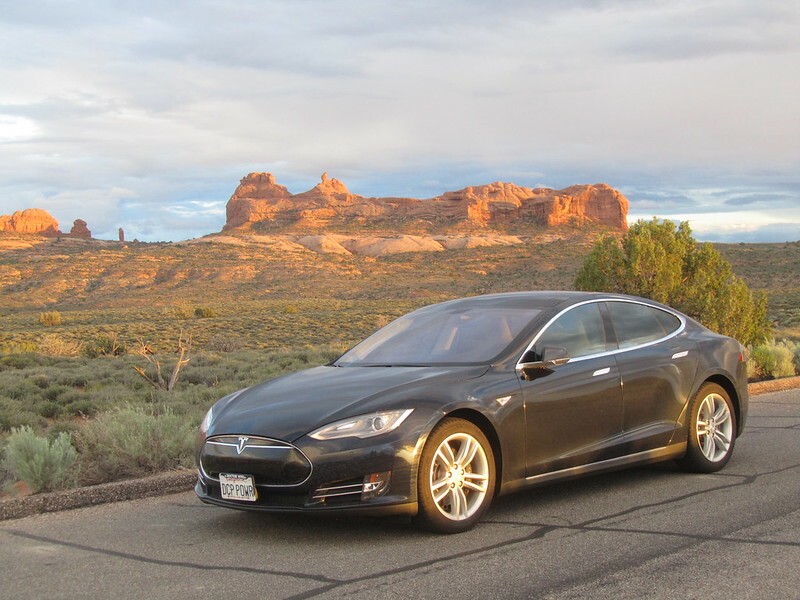 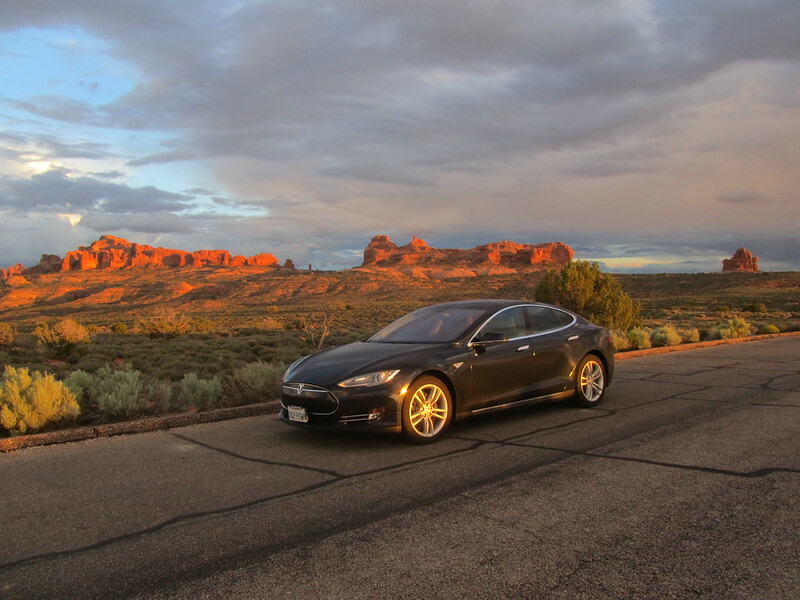 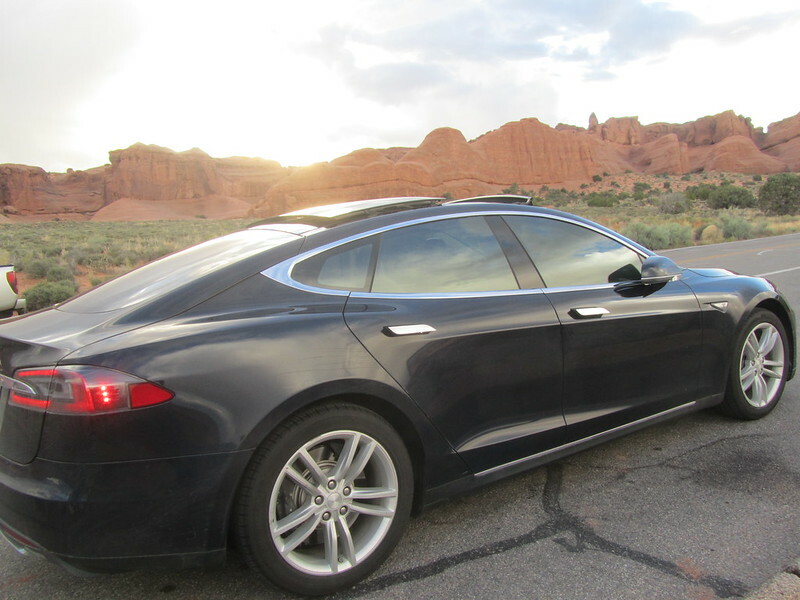 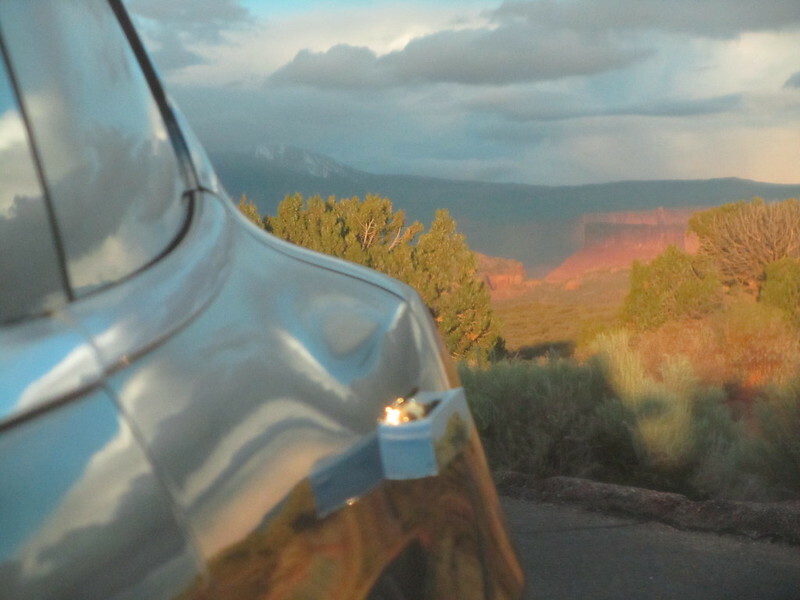 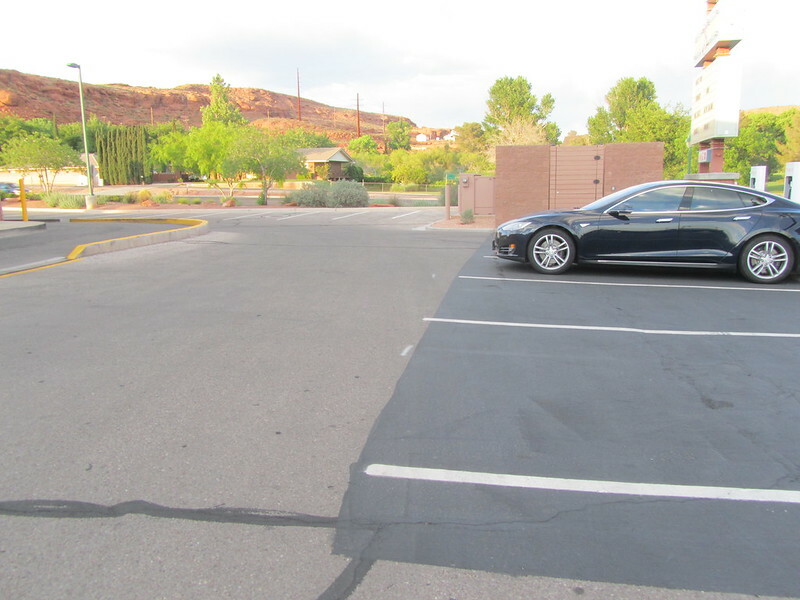 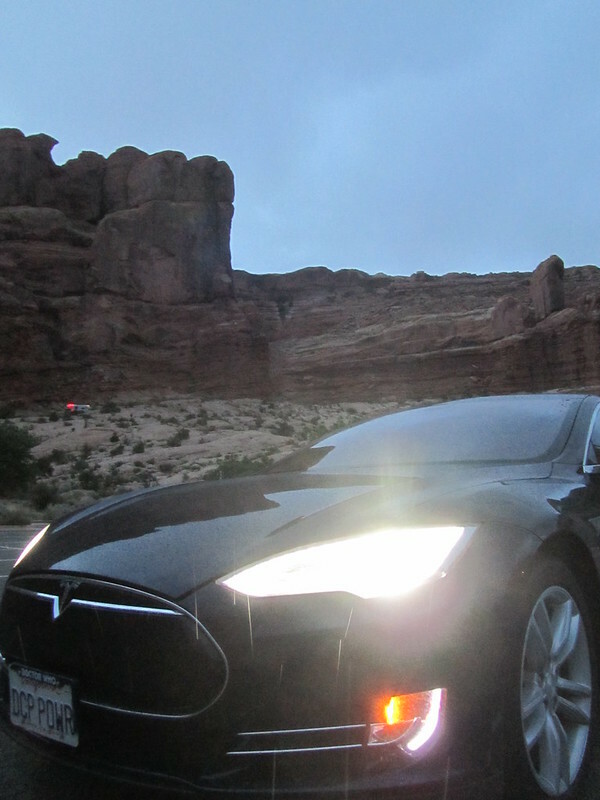 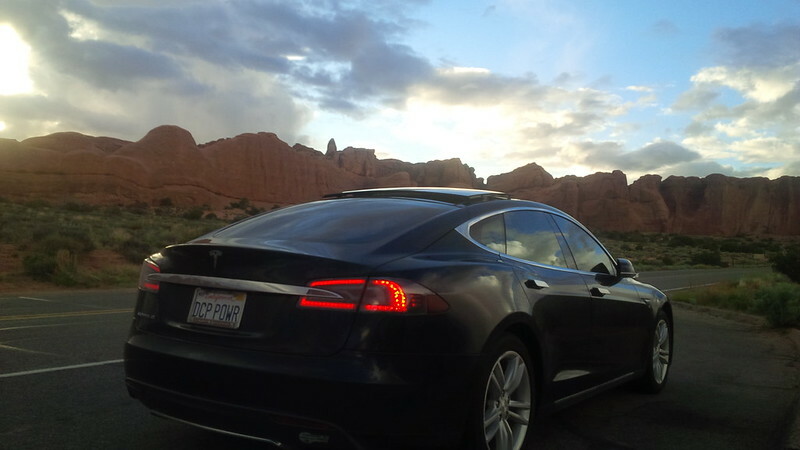 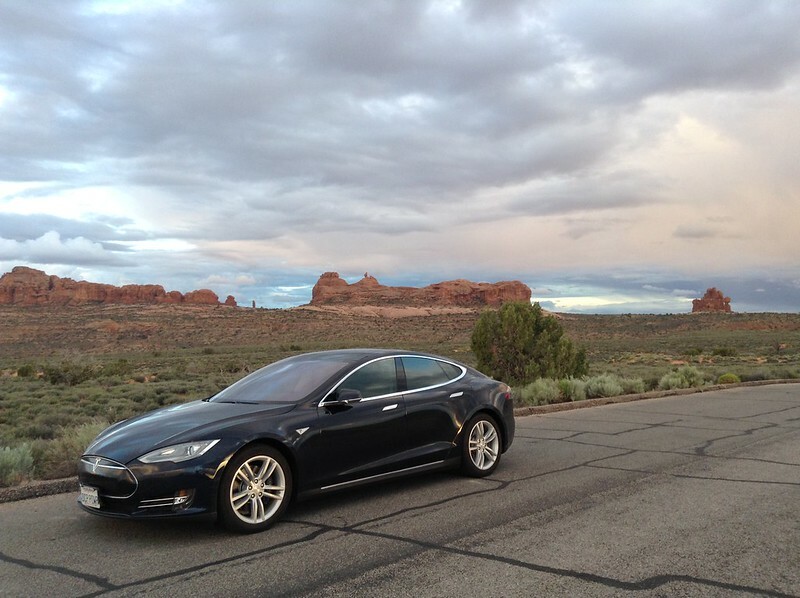 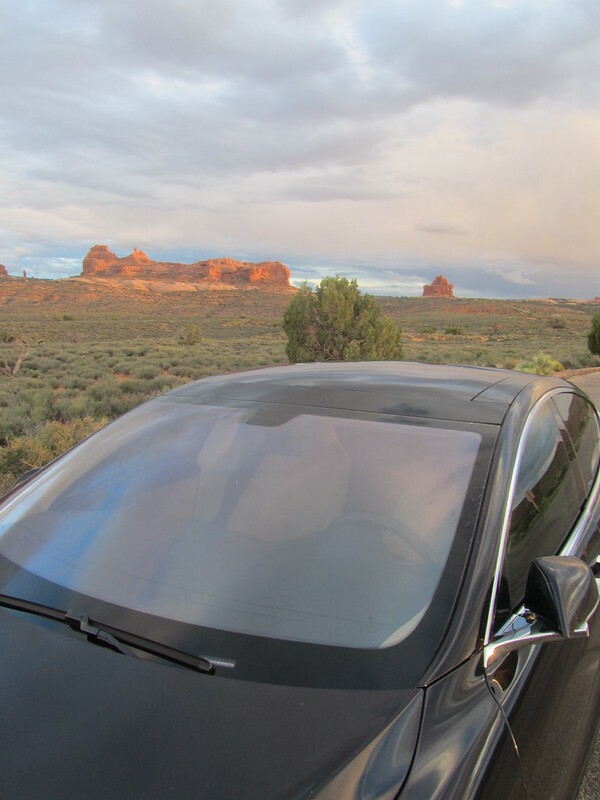 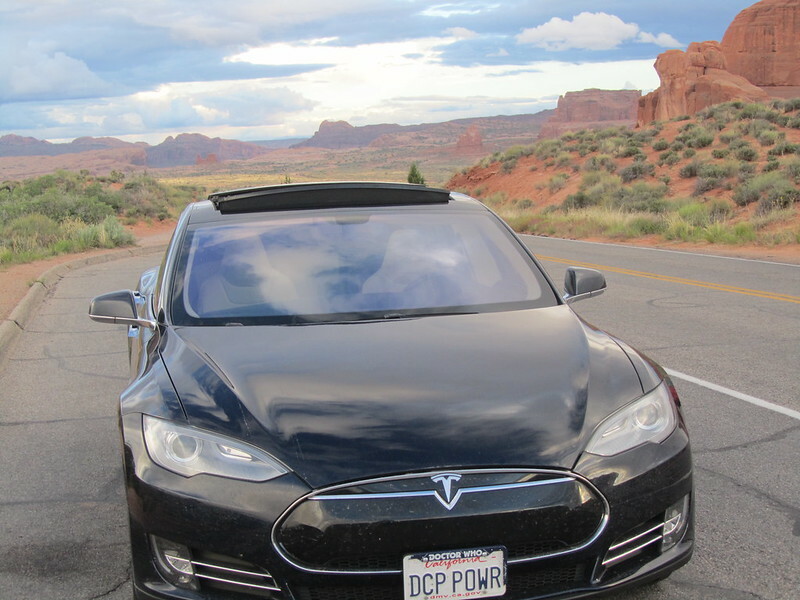 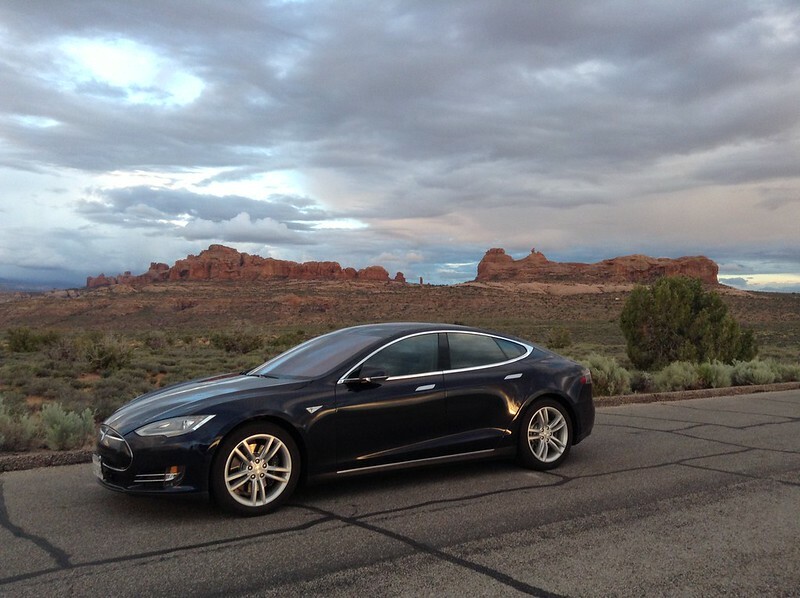 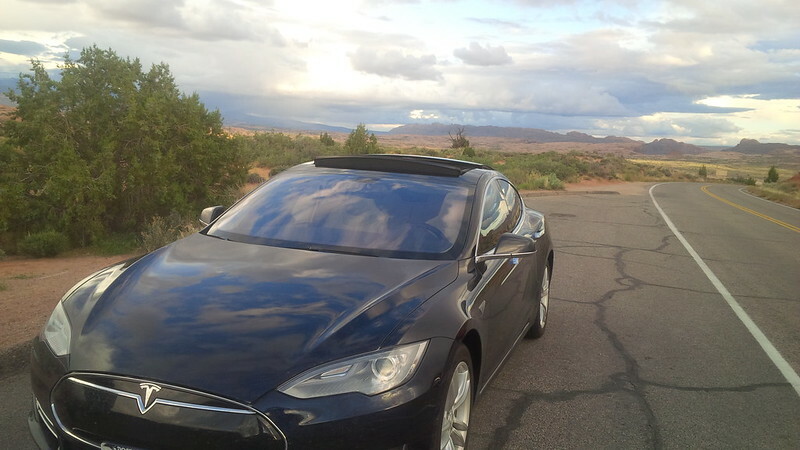 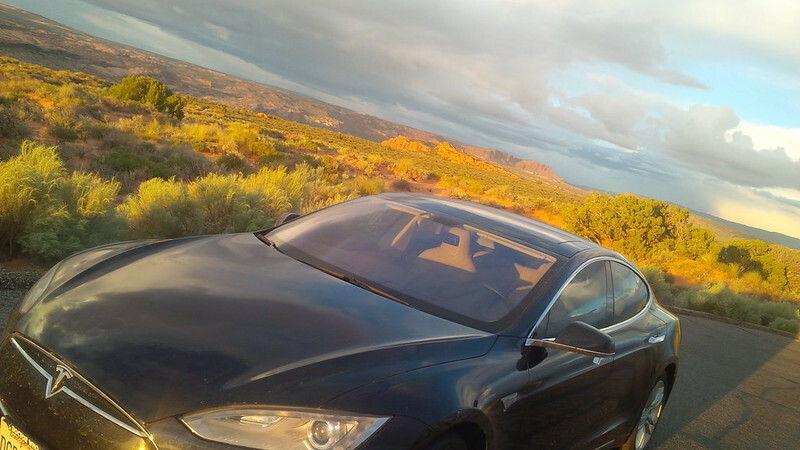 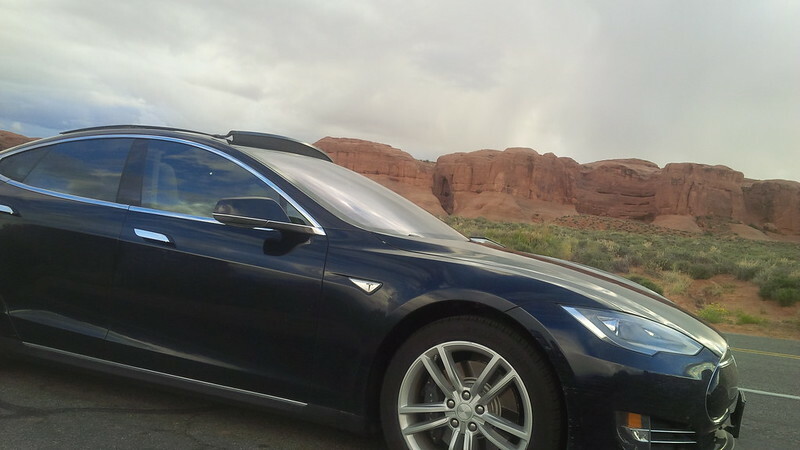 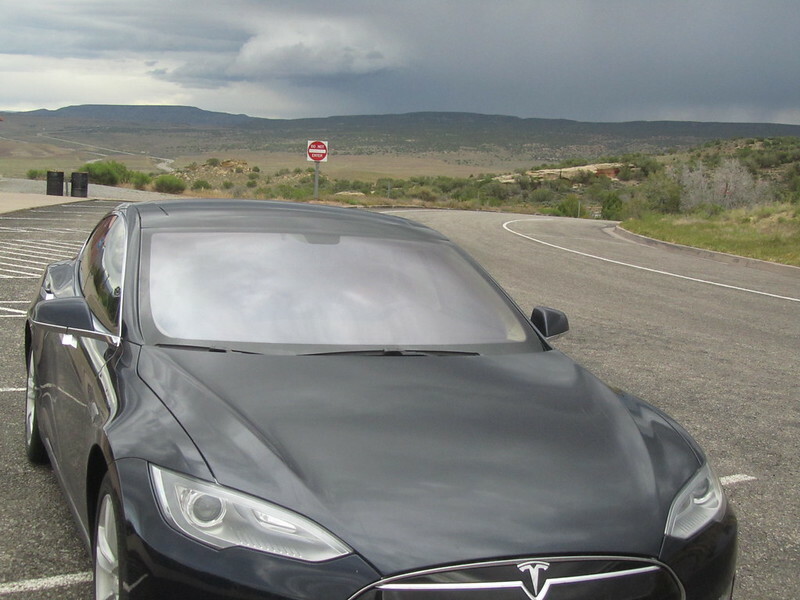 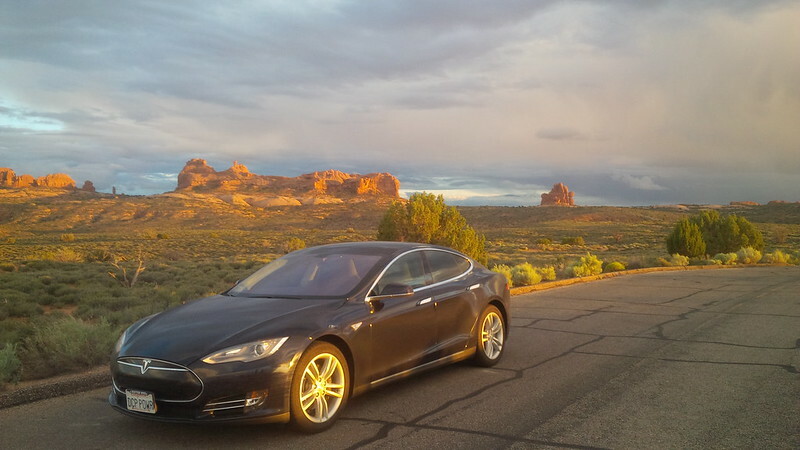 Before the establishment of the Tesla Superchargers in St. George, Mark was one of the first people to share his plug on Plugshare to provide folks with a charge when they visit Utah. 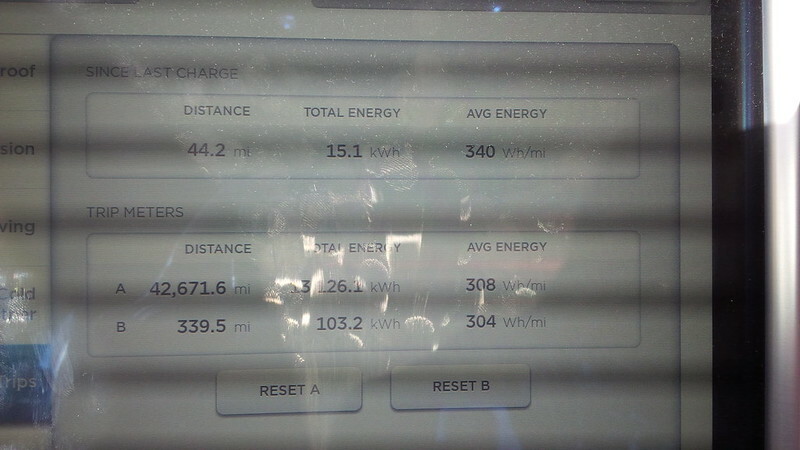 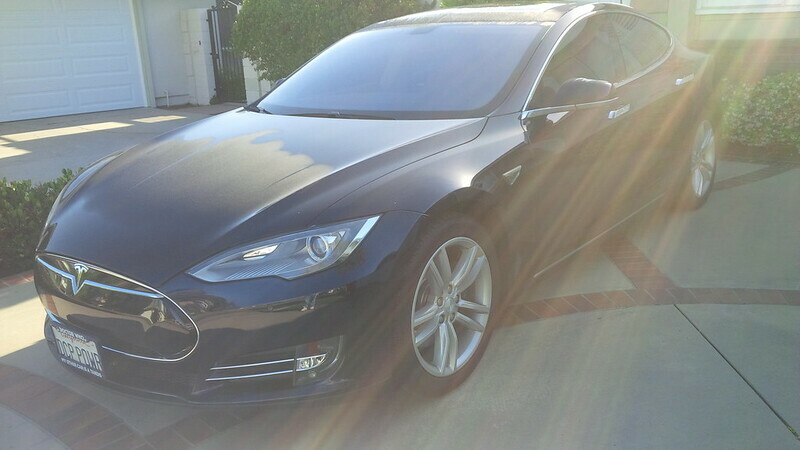 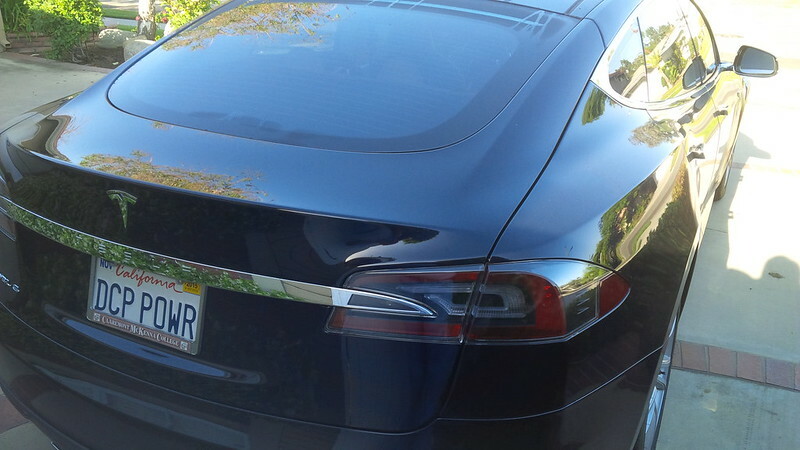 Another Model S from Riverside, CA pulled in during our meetup to get a charge and head back South. 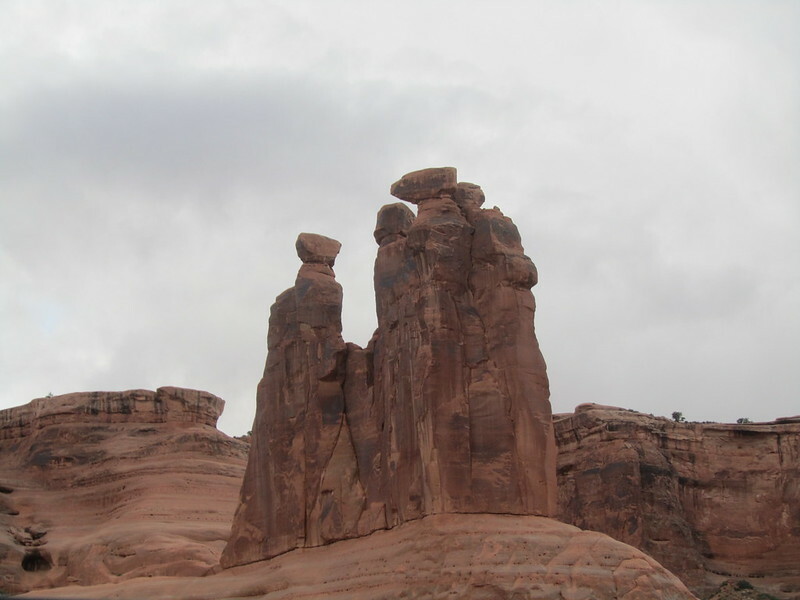 They were friendly enough, but we didn’t spend much time talking to them. 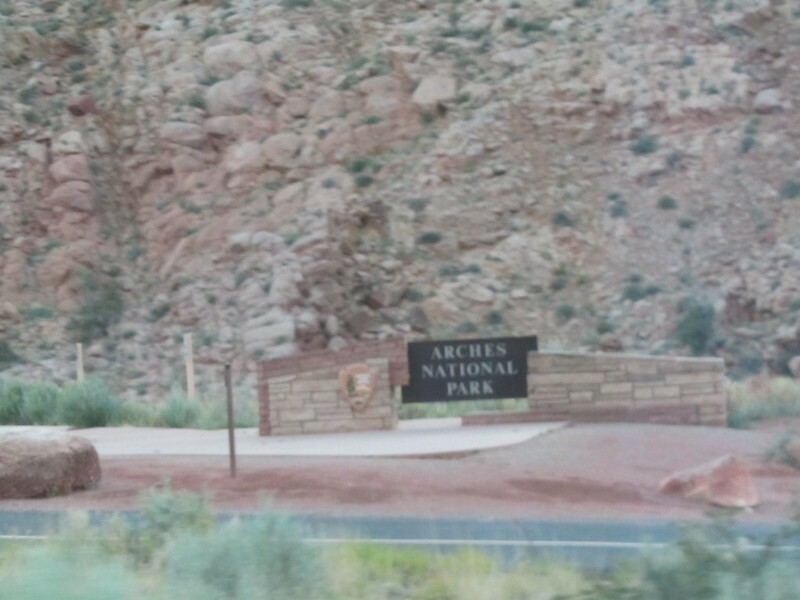 They were up in the area playing golf and out for the holiday weekend. 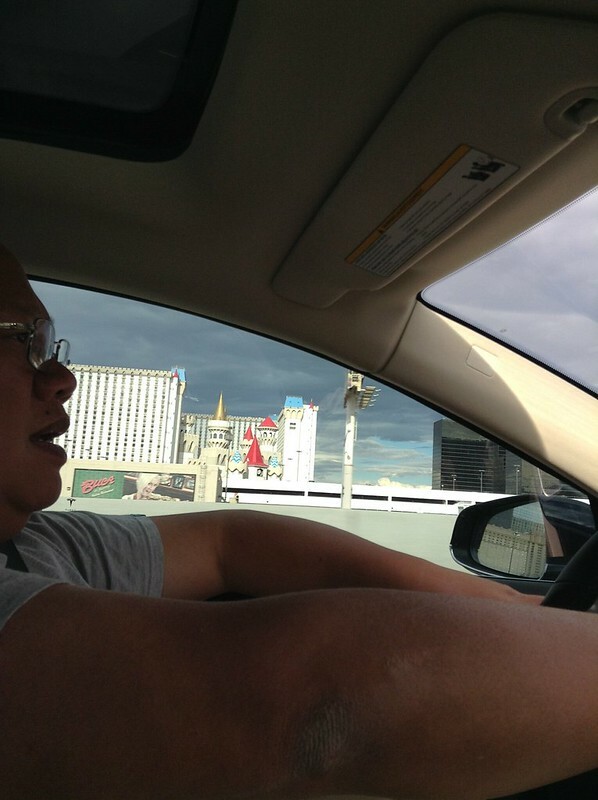 After getting our charge and spending time with a fellow rEVolutionary, we headed off to Vegas. 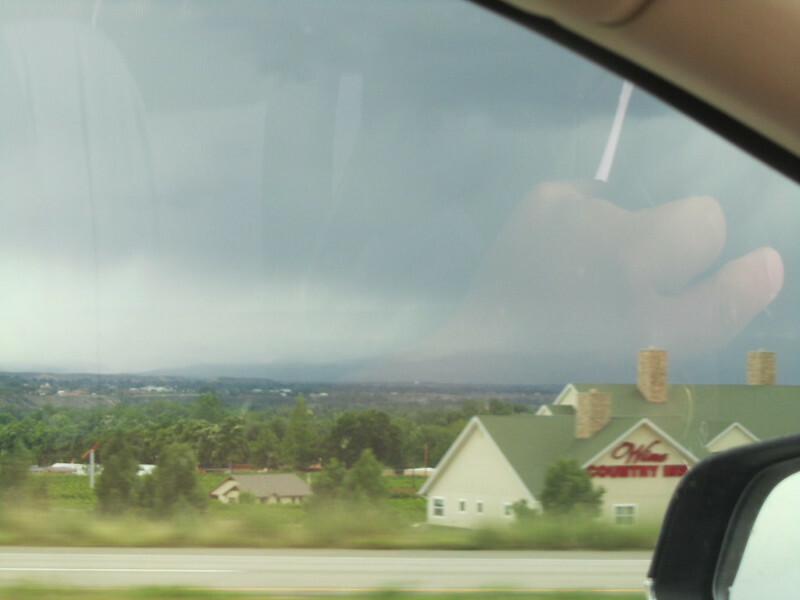 At this point, we were planning on playing it by ear. 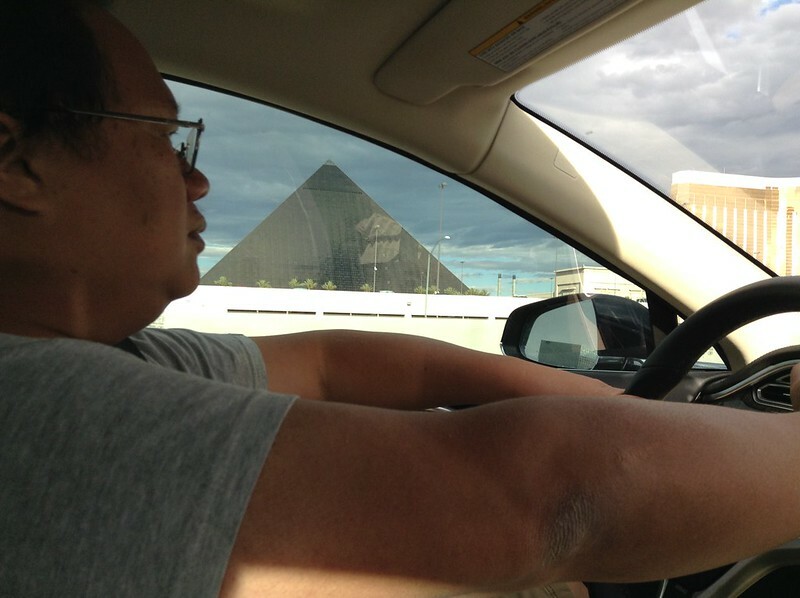 Hotel rates in Vegas were a little higher because of the holiday, but not too bad. 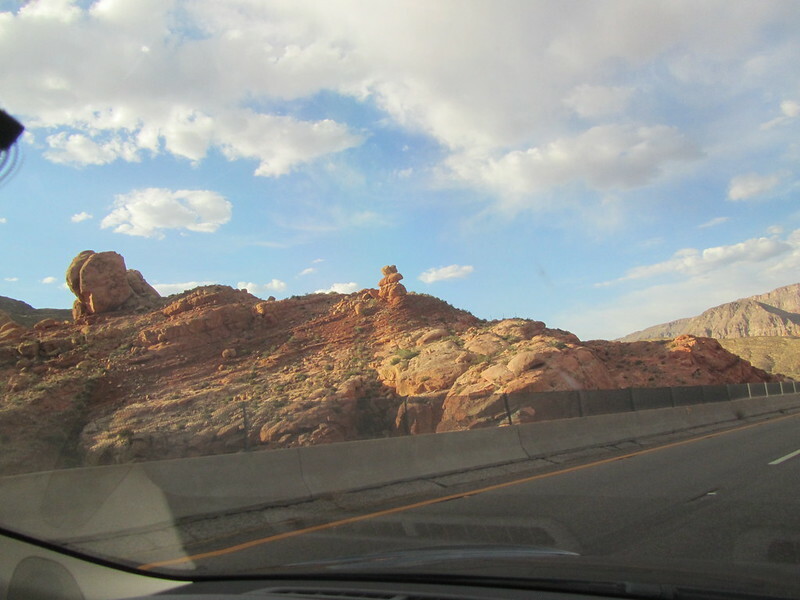 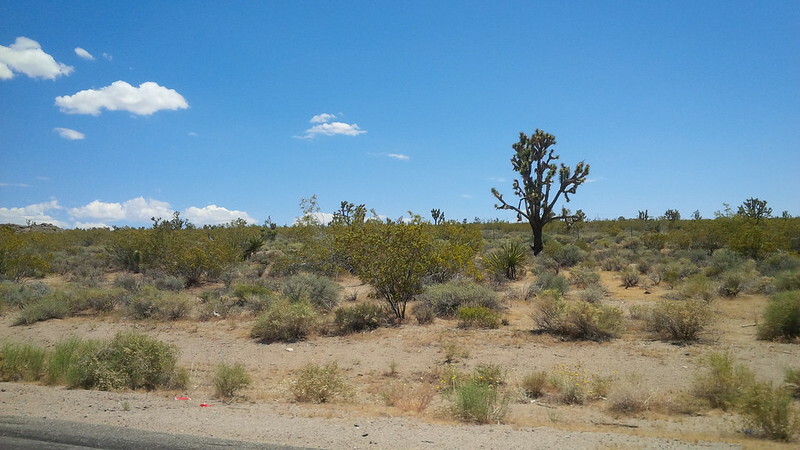 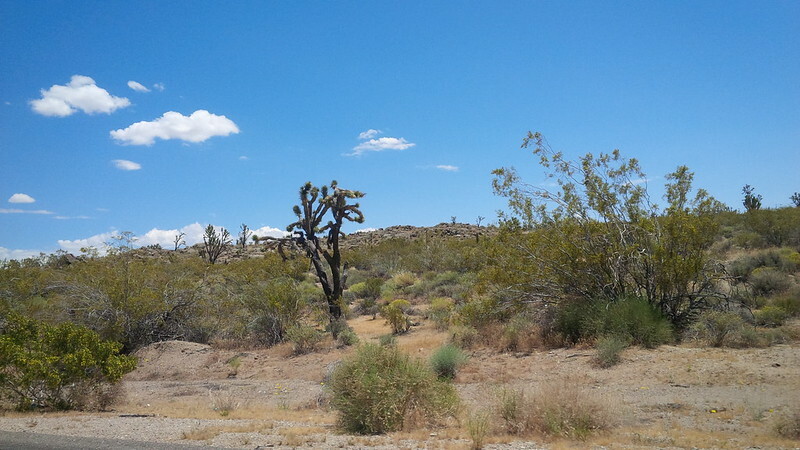 Additionally, we wanted to see how we felt when we got there since we knew that traffic between Vegas and Southern California on Monday would probably be worse than the traffic today or on Tuesday. 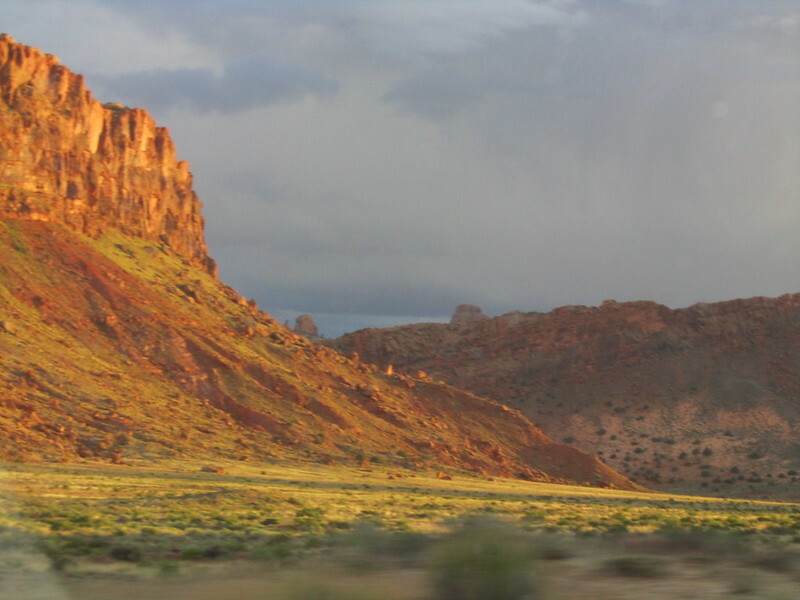 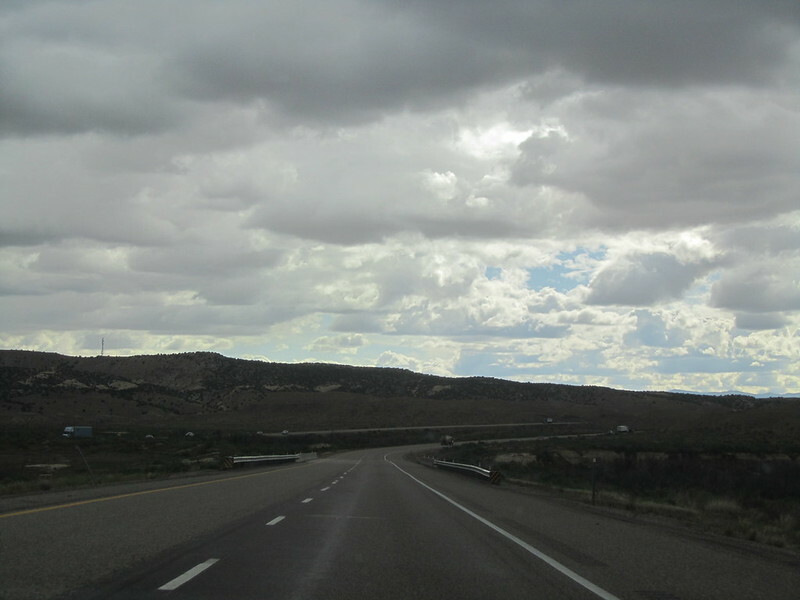 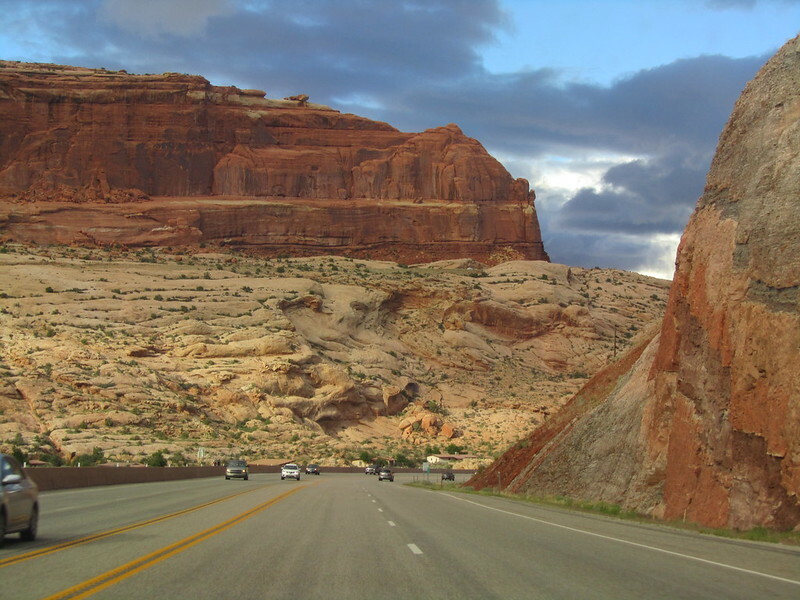 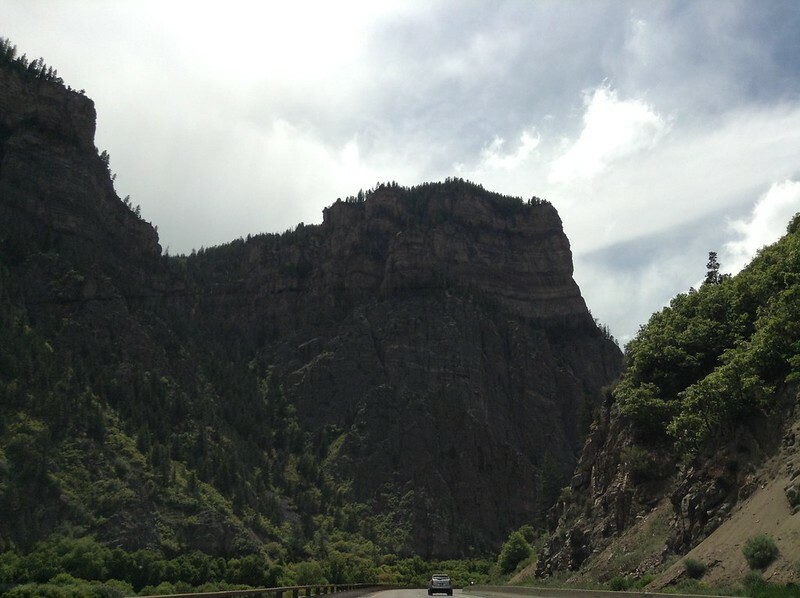 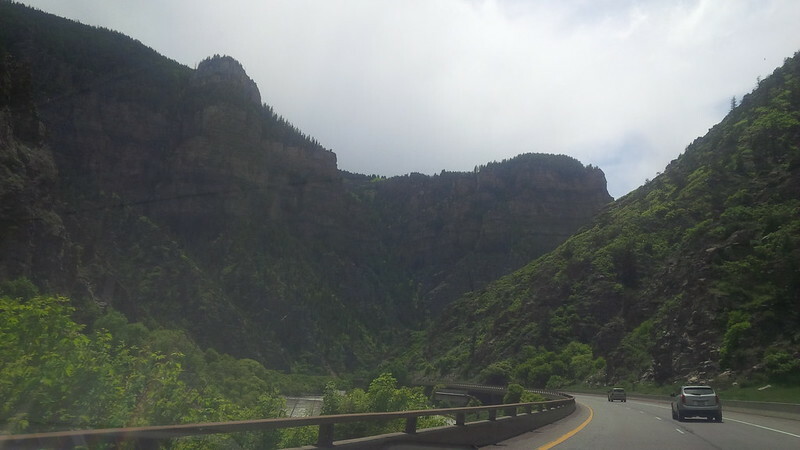 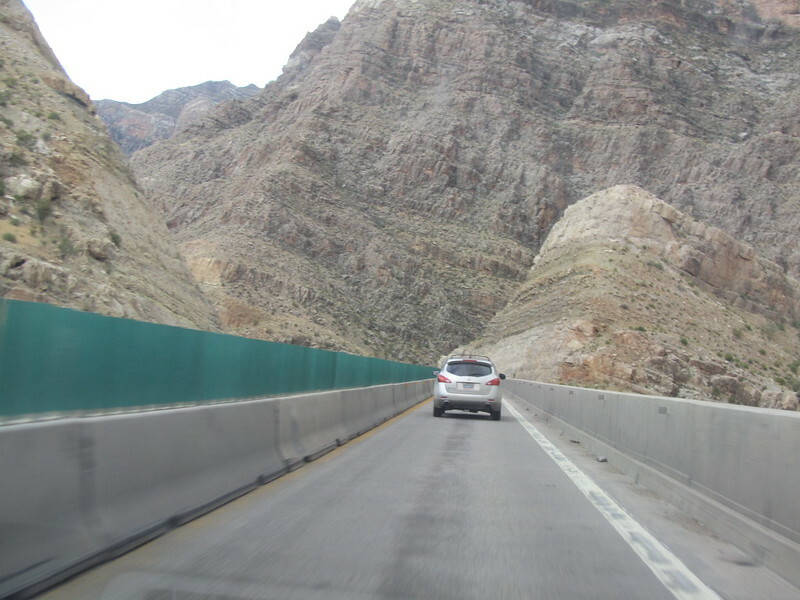 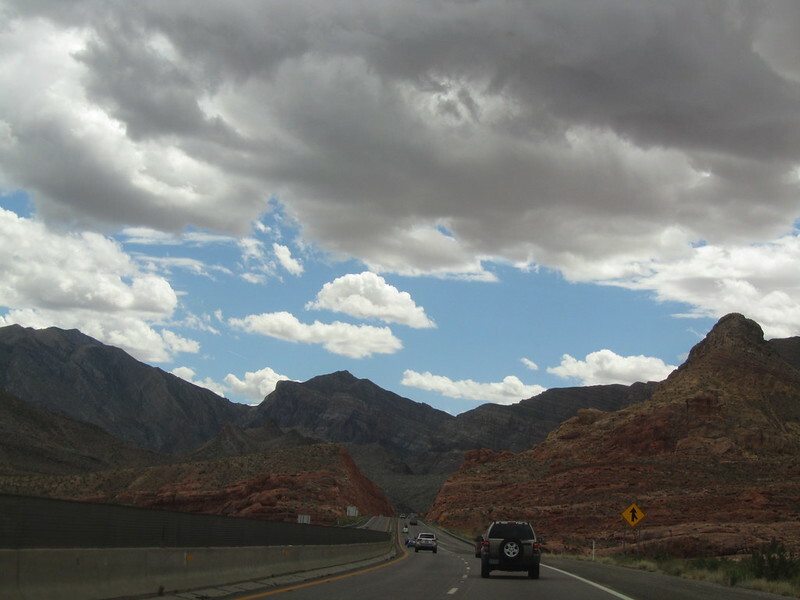 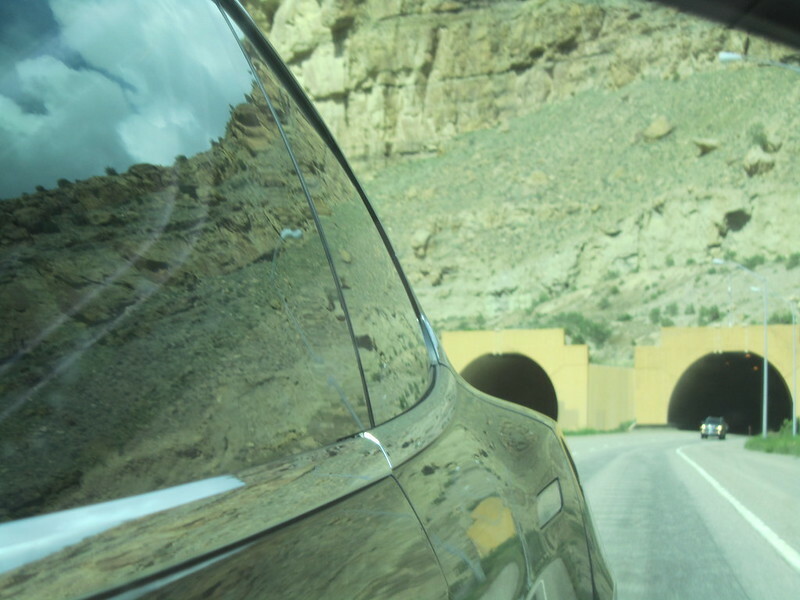 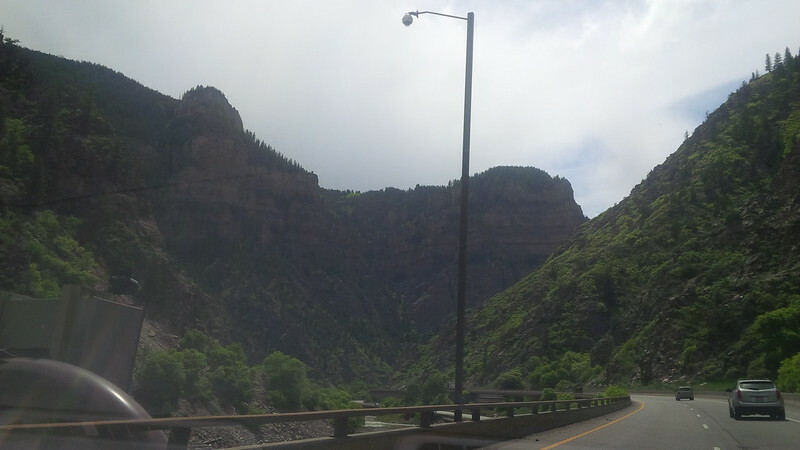 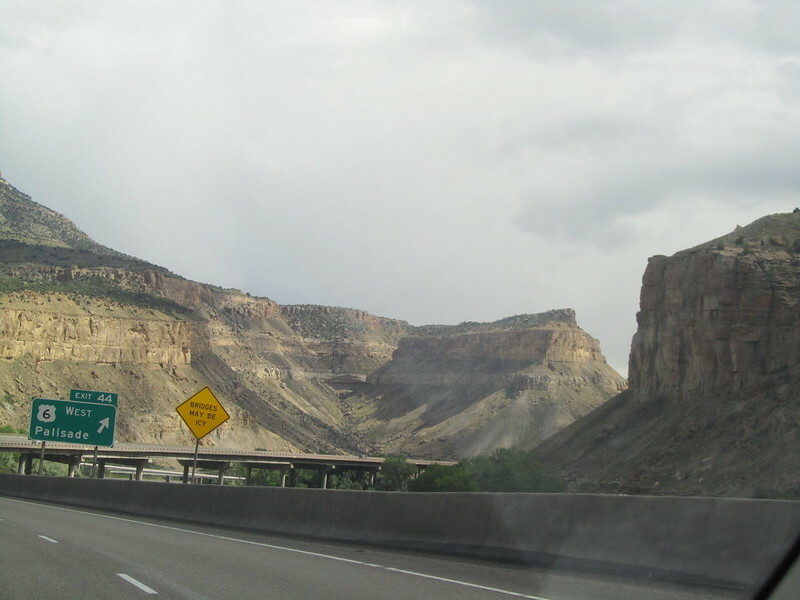 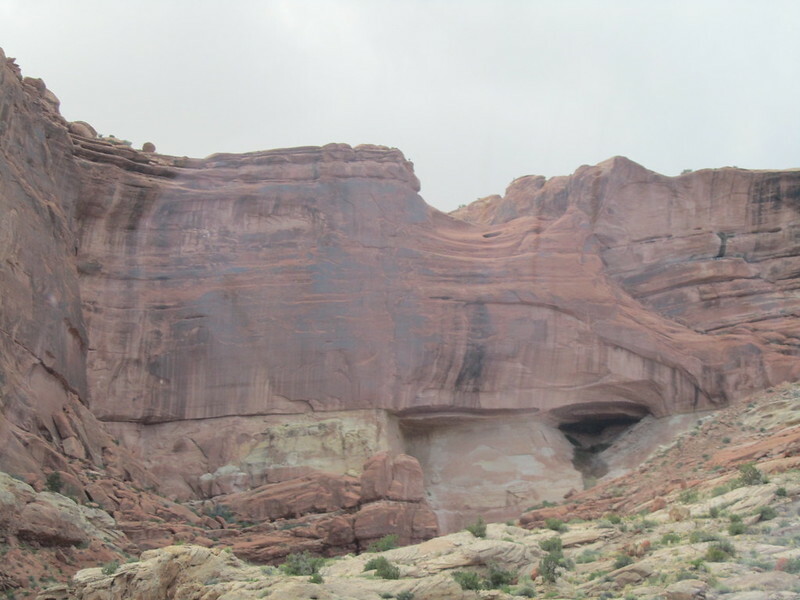 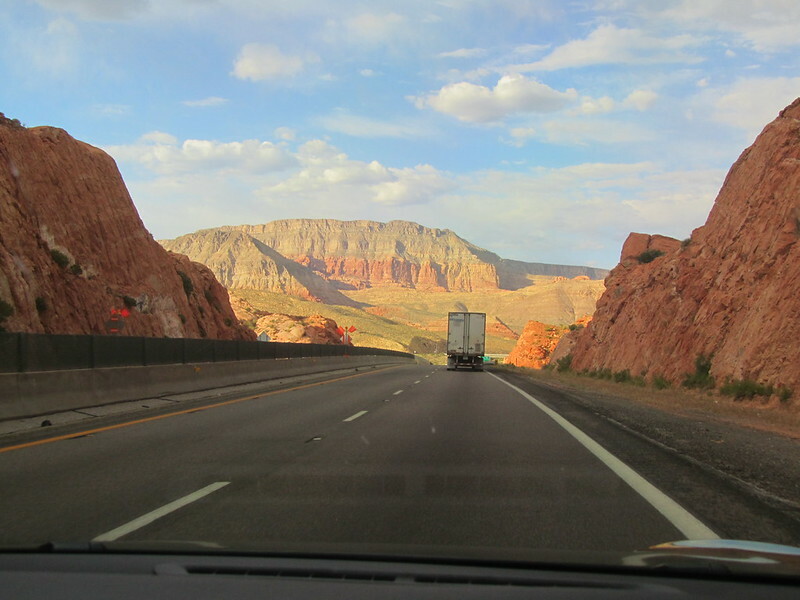 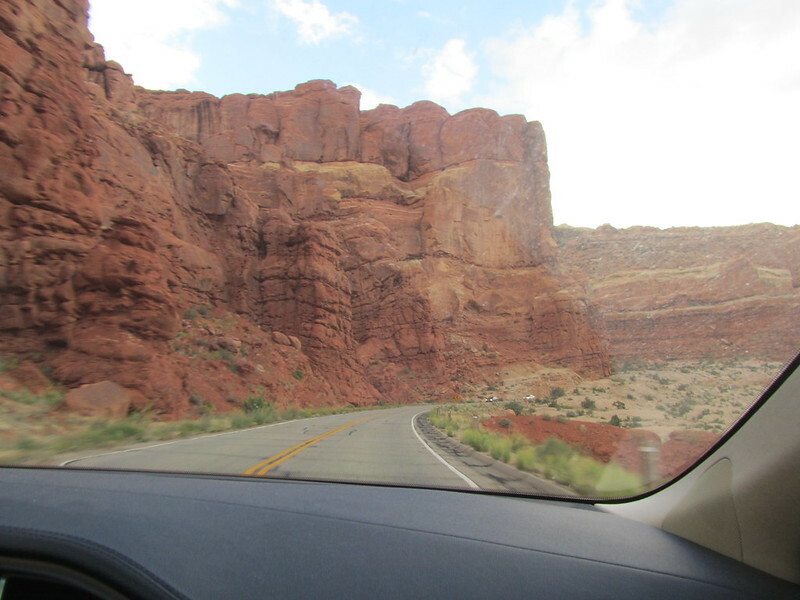 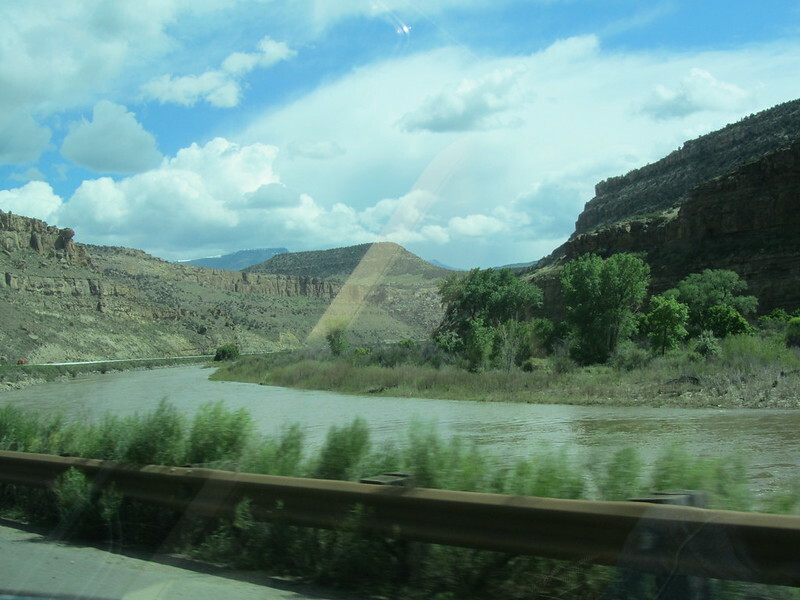 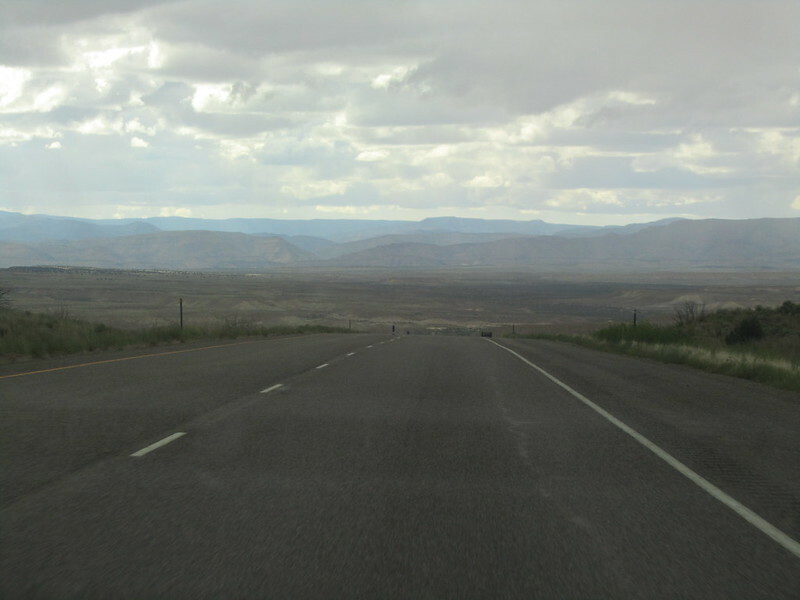 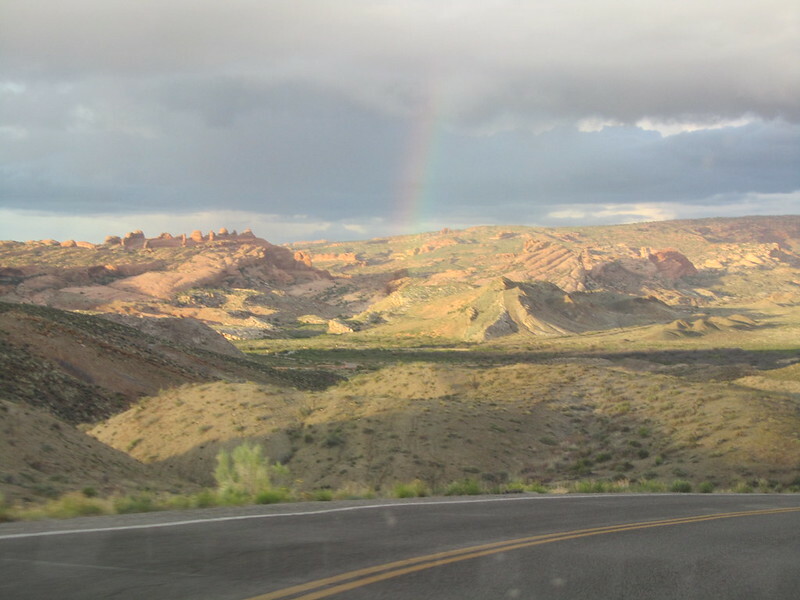 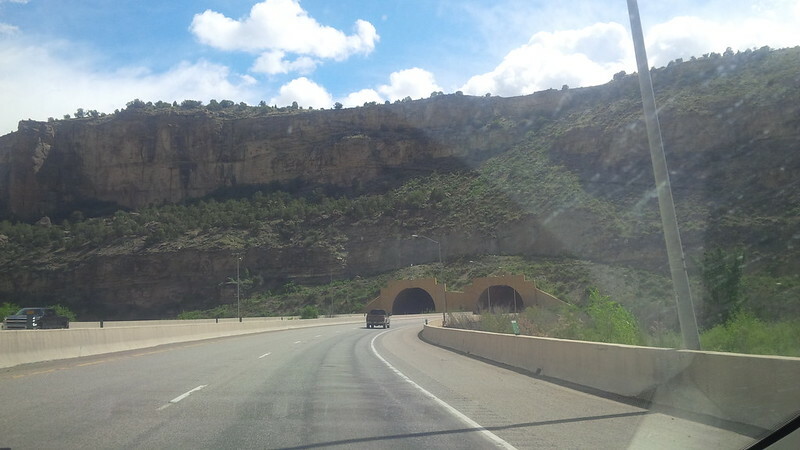 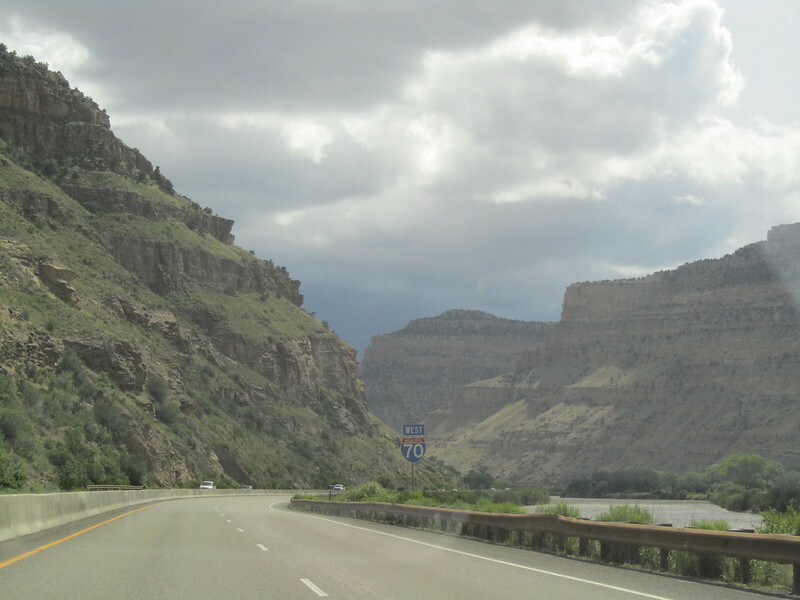 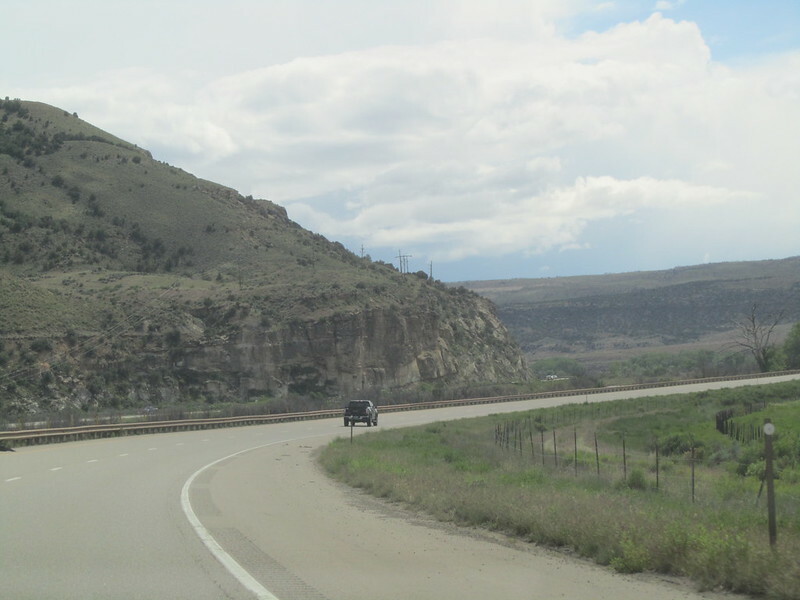 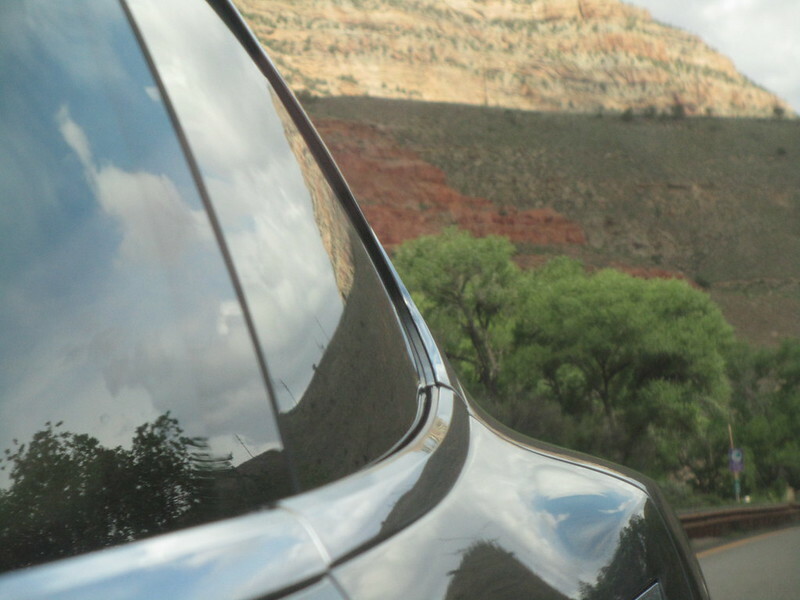 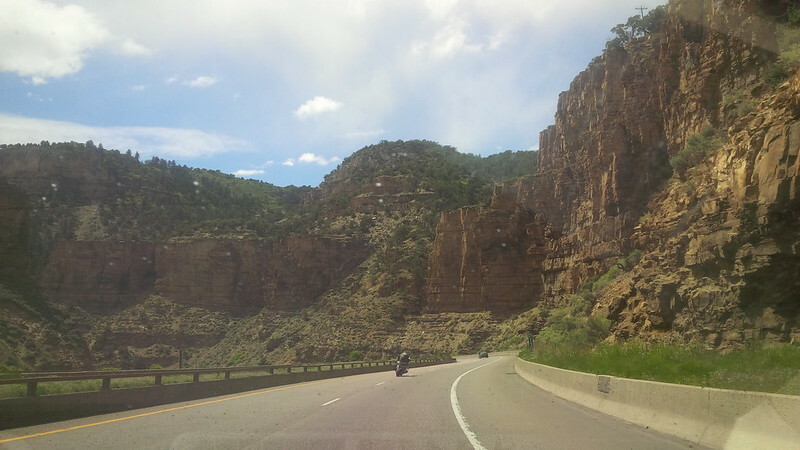 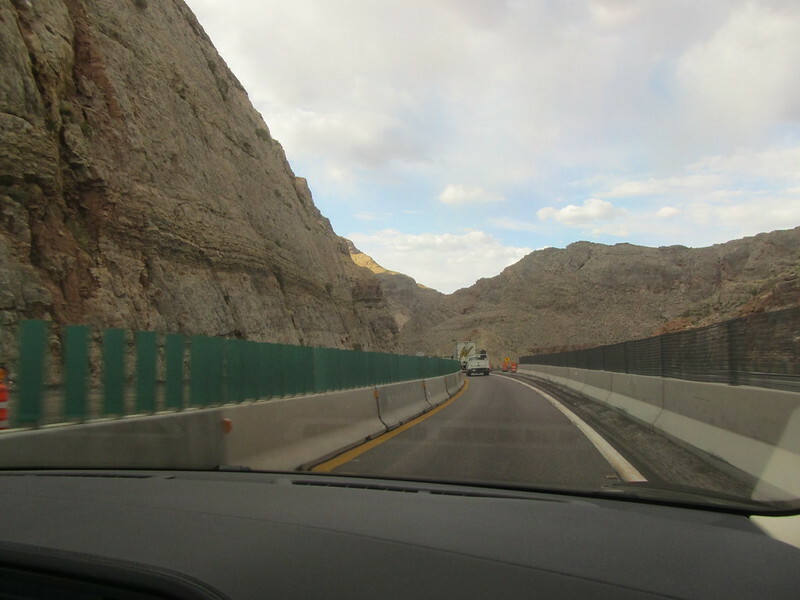 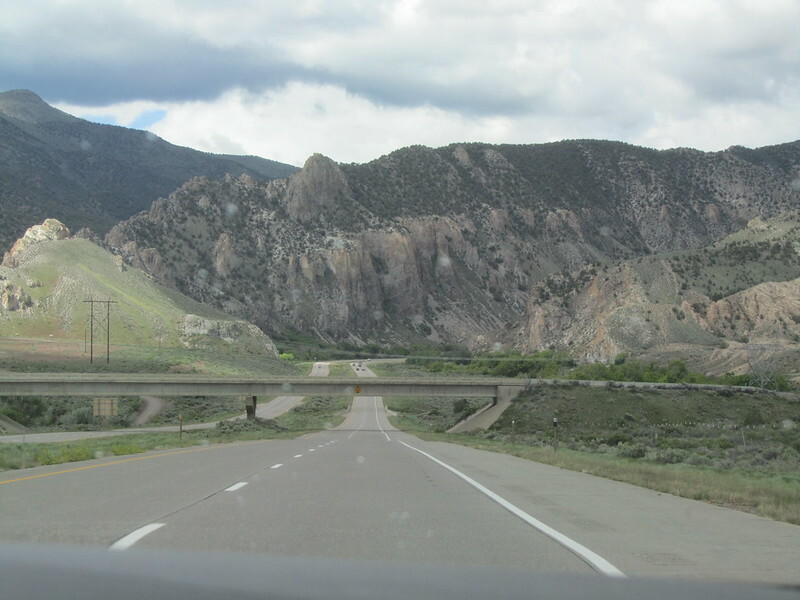 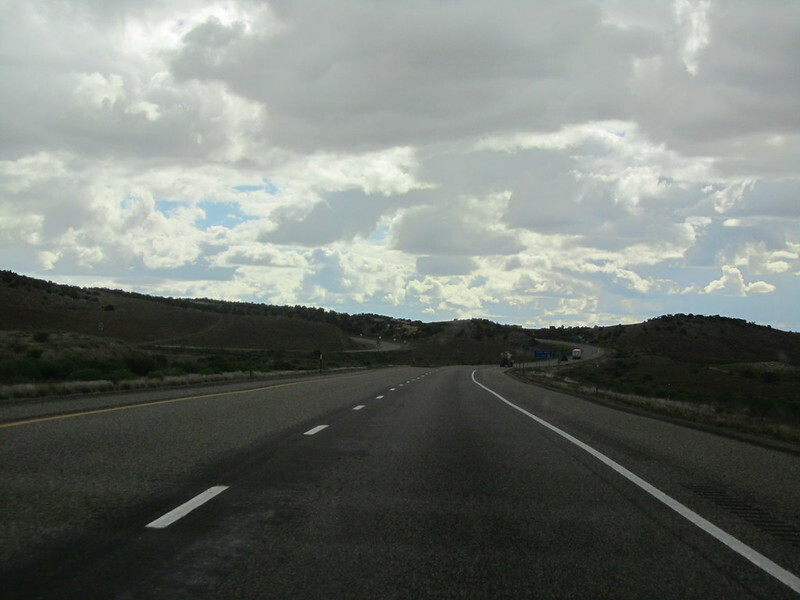 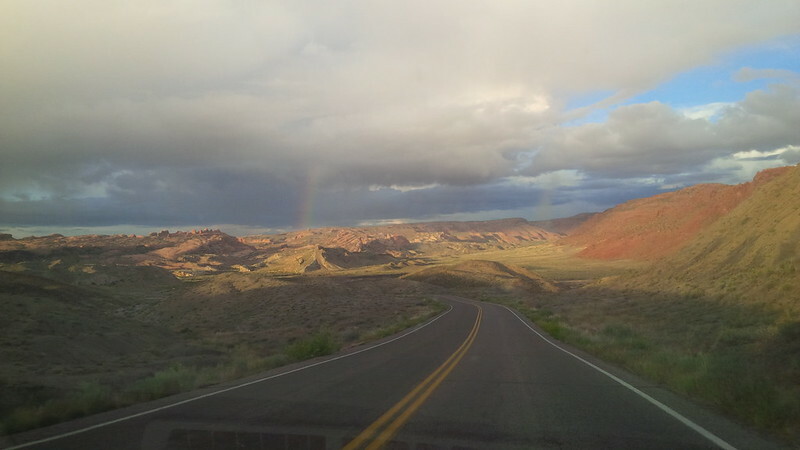 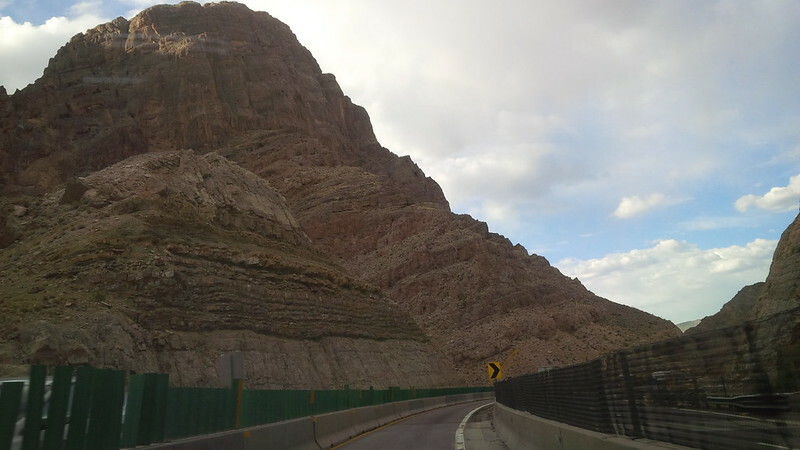 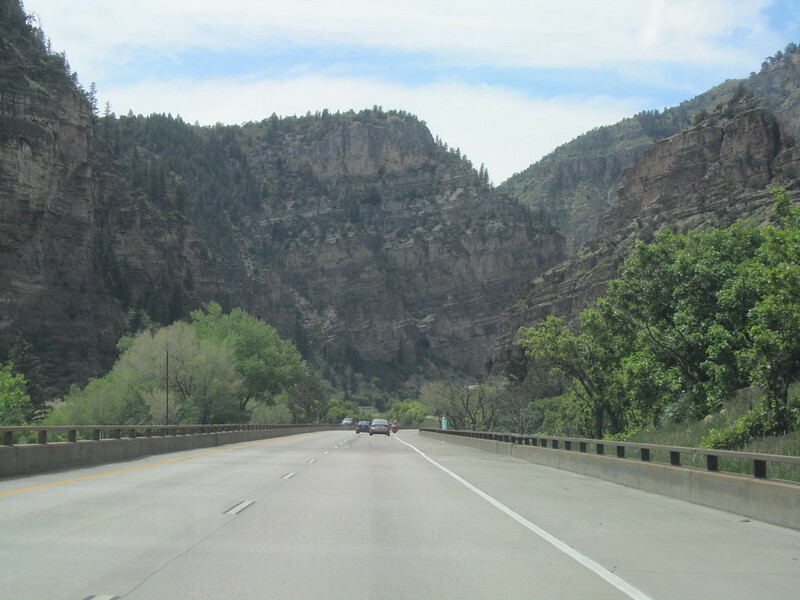 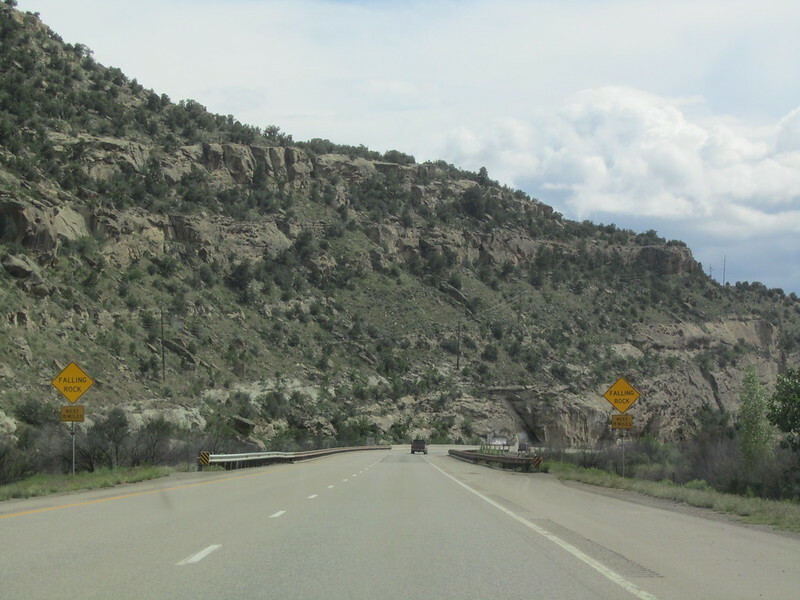 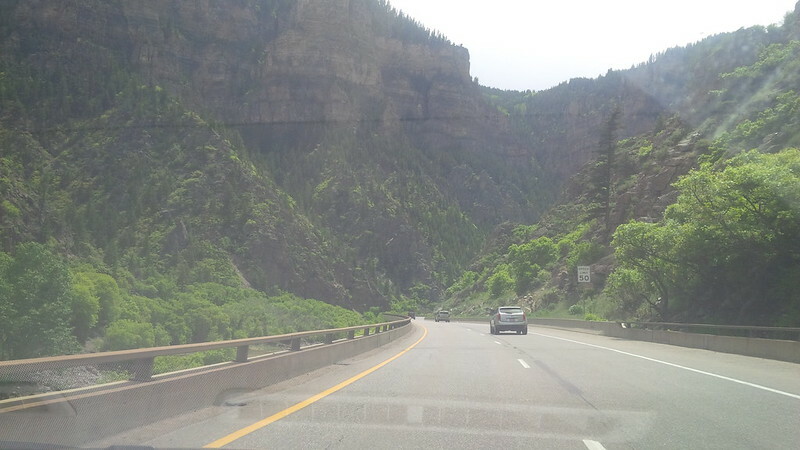 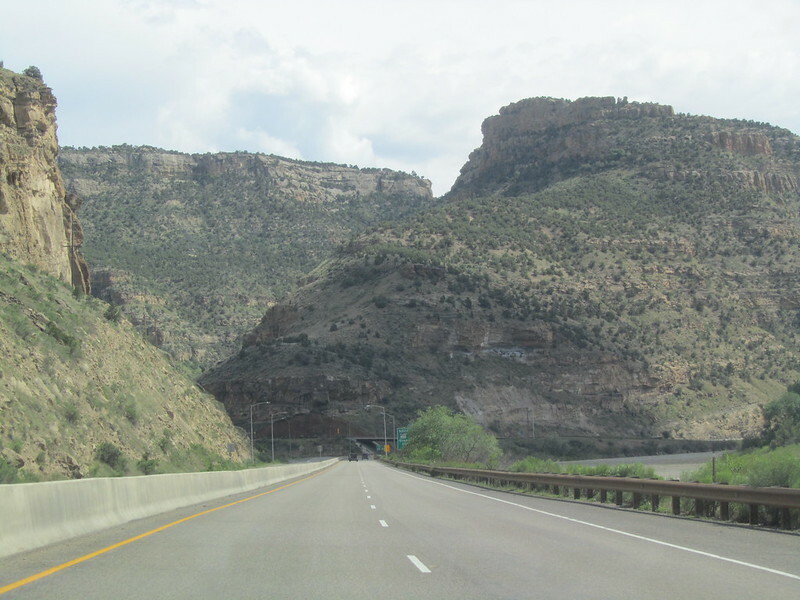 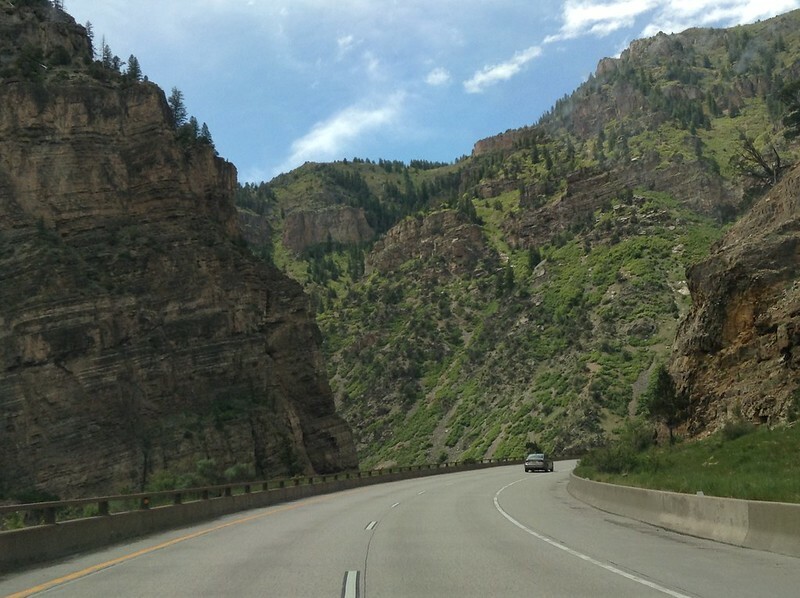 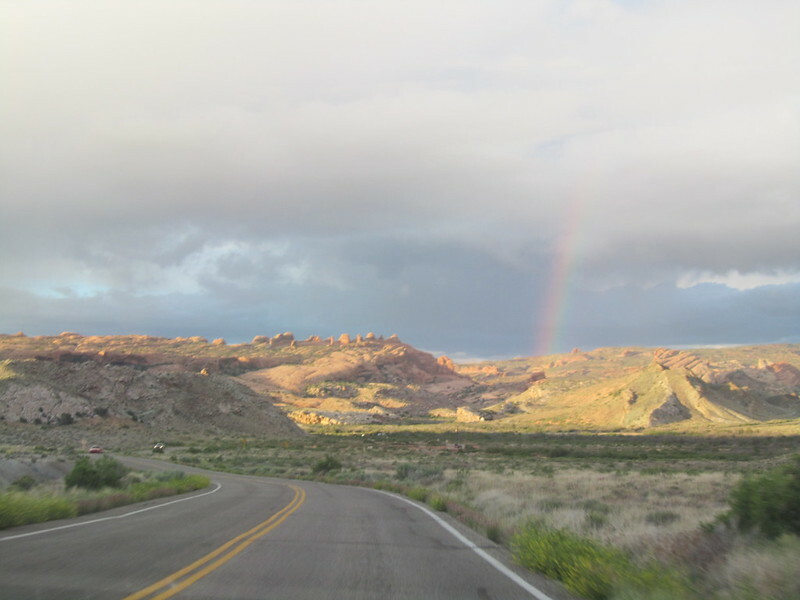 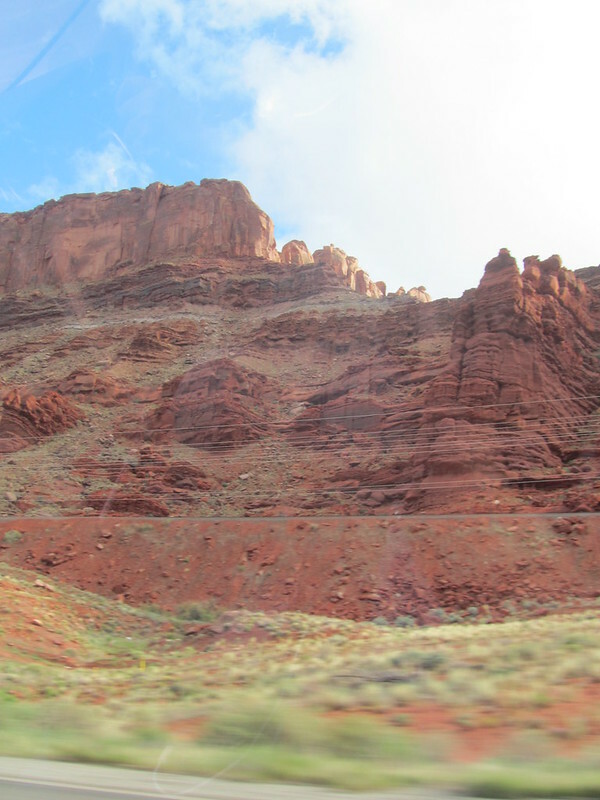 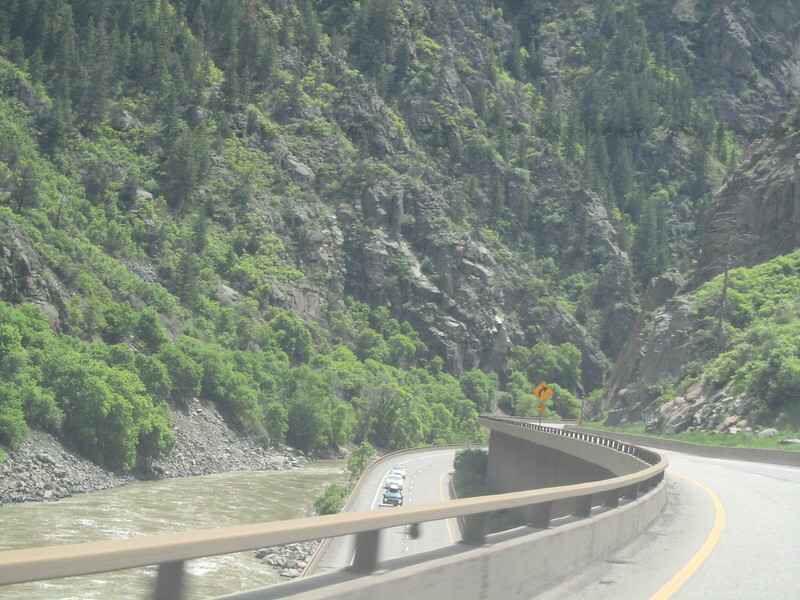 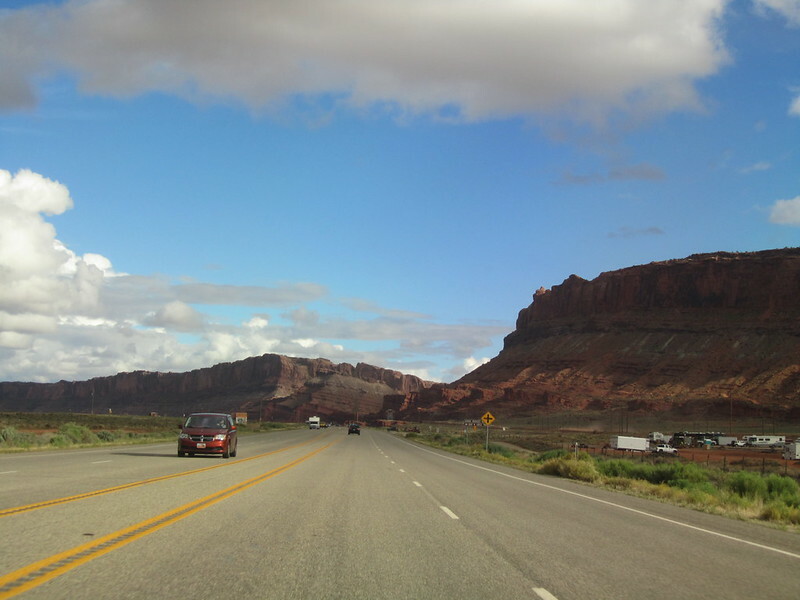 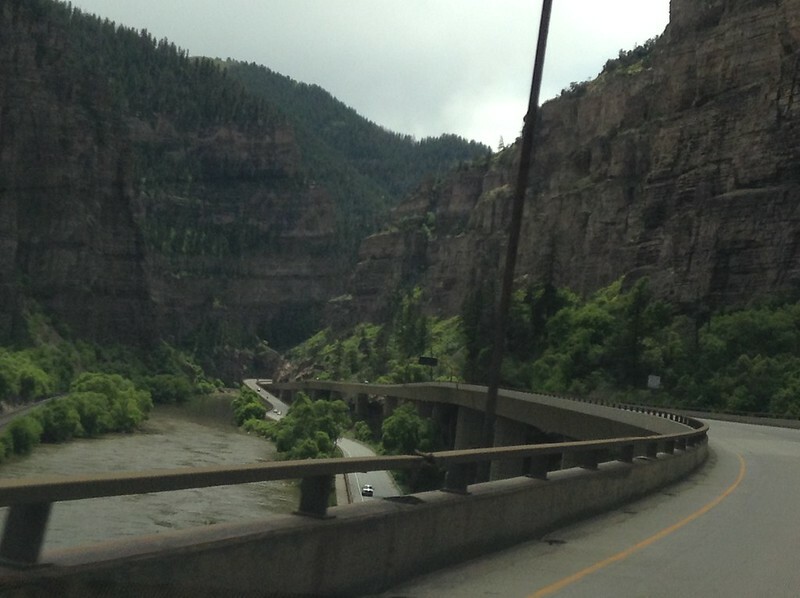 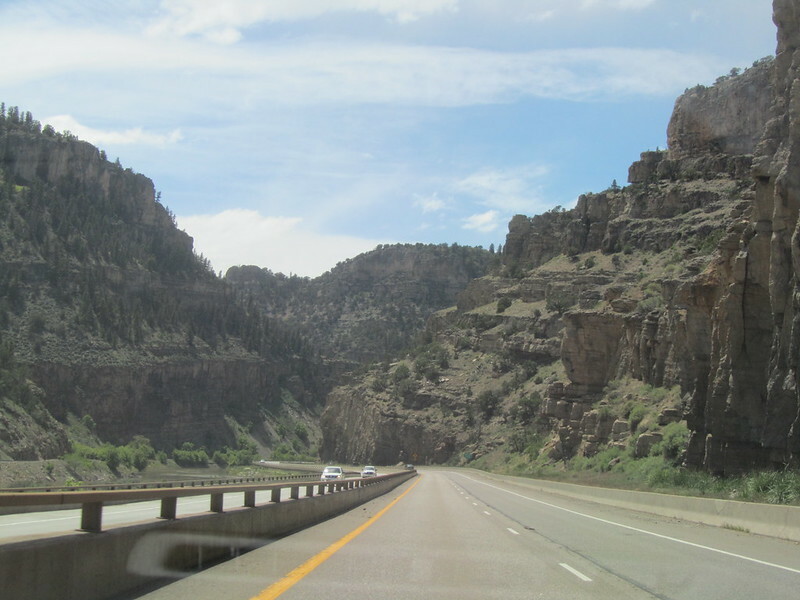 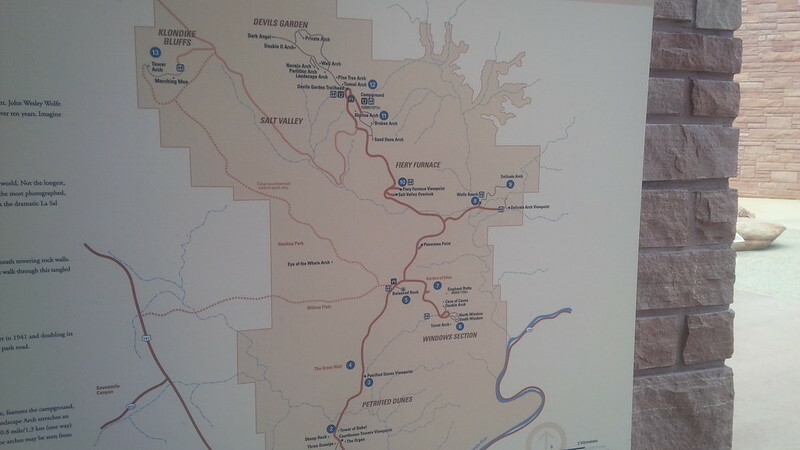 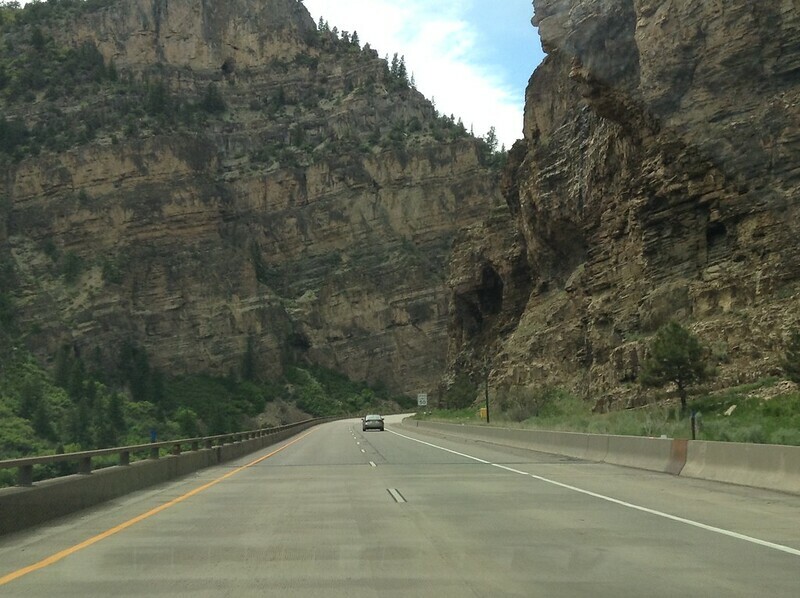 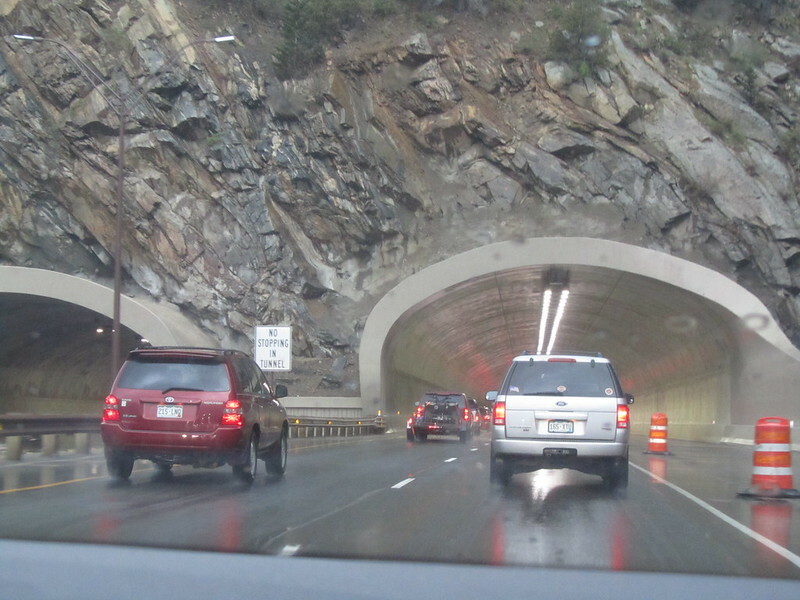 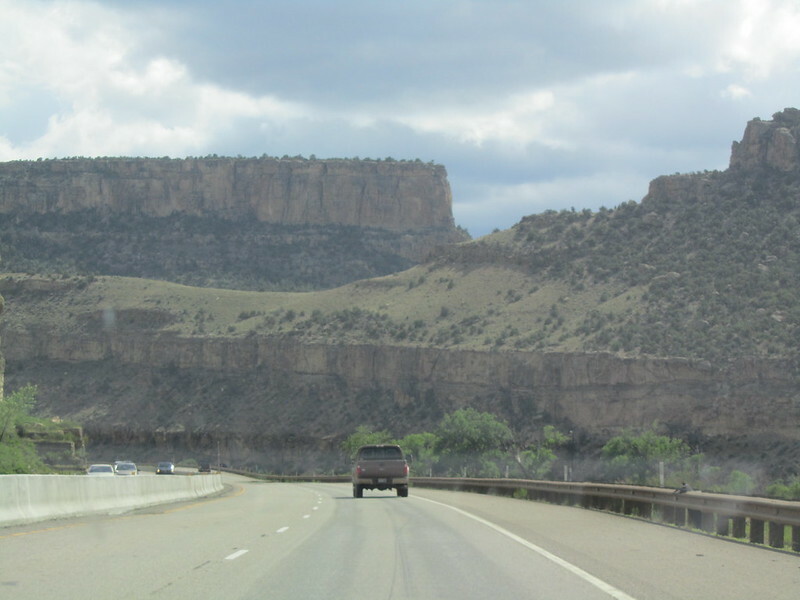 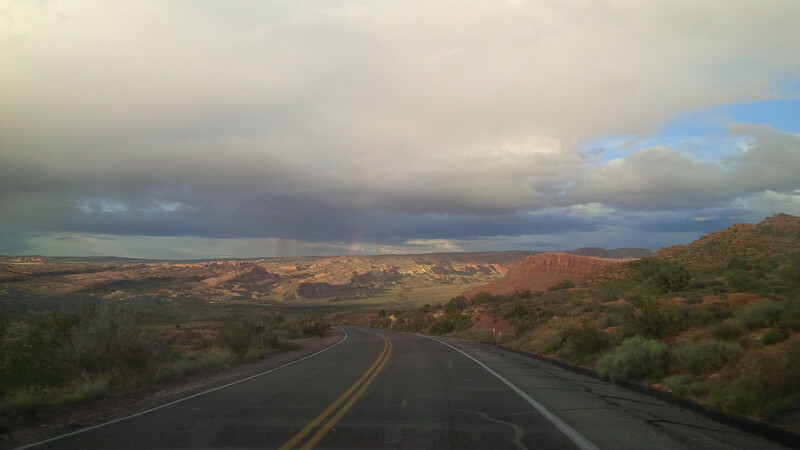 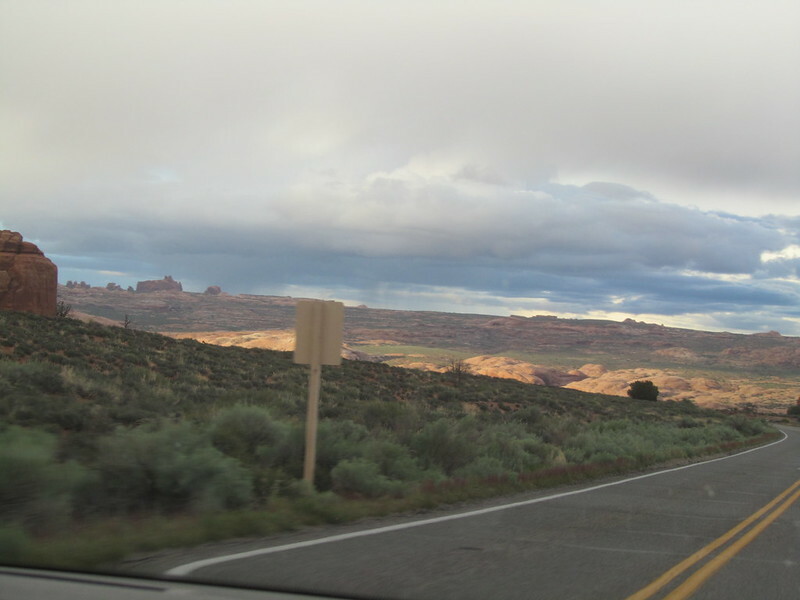 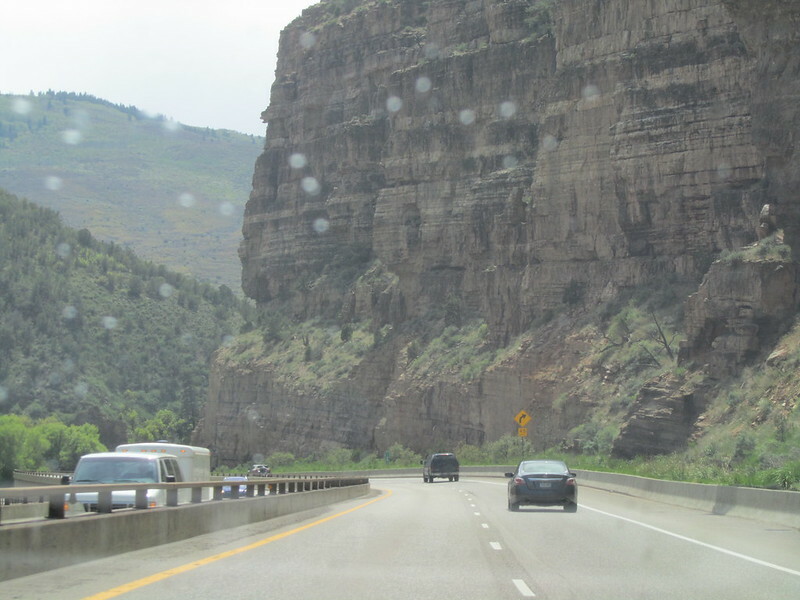 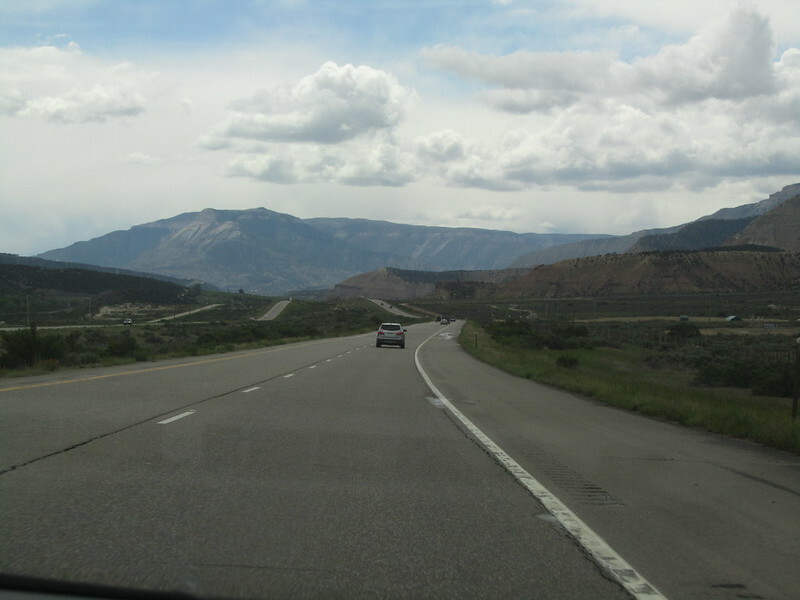 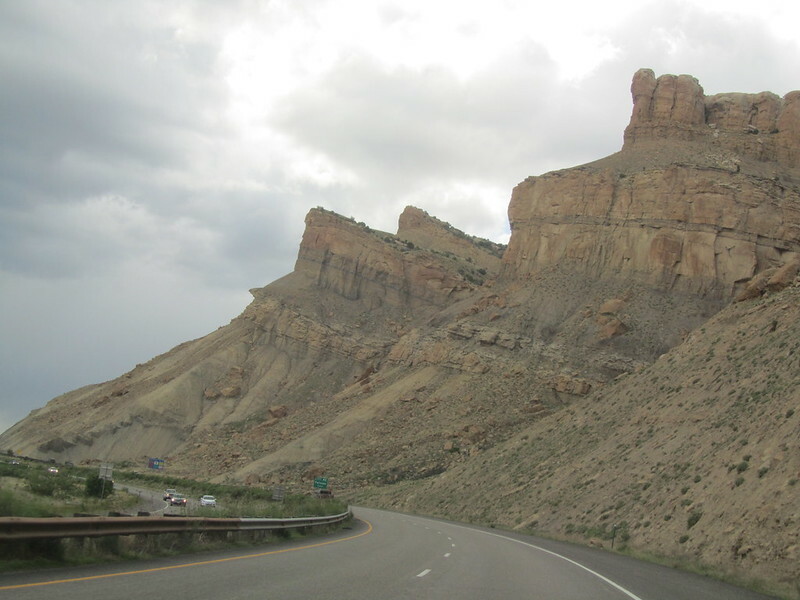 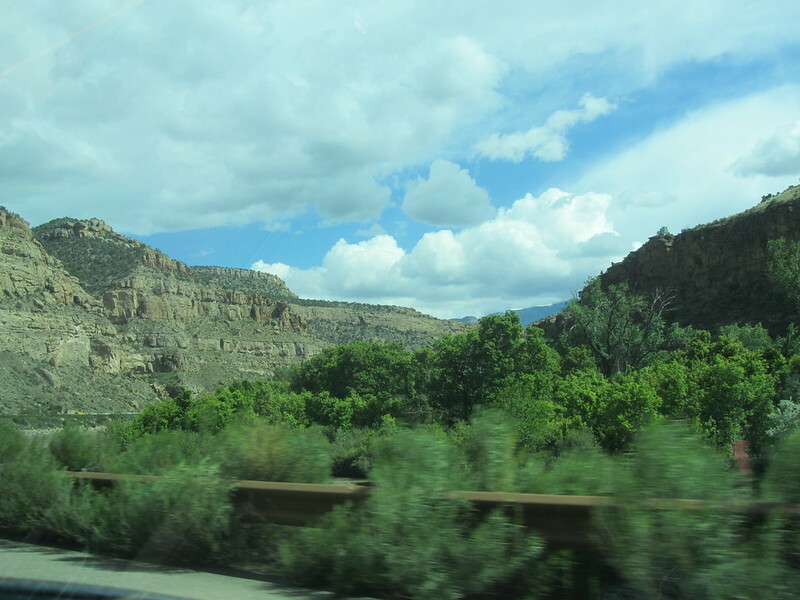 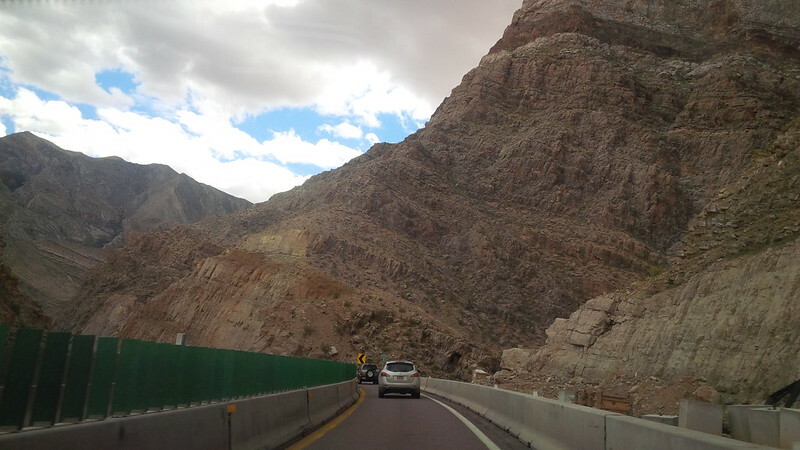 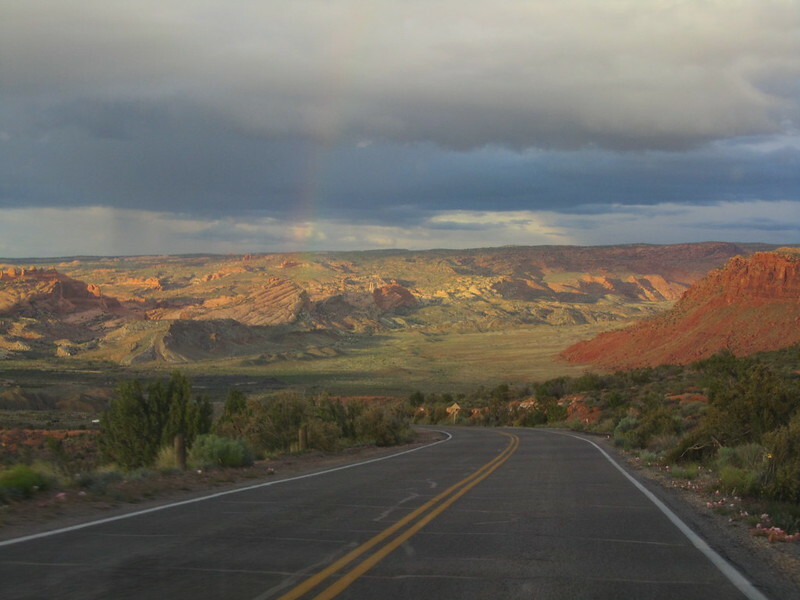 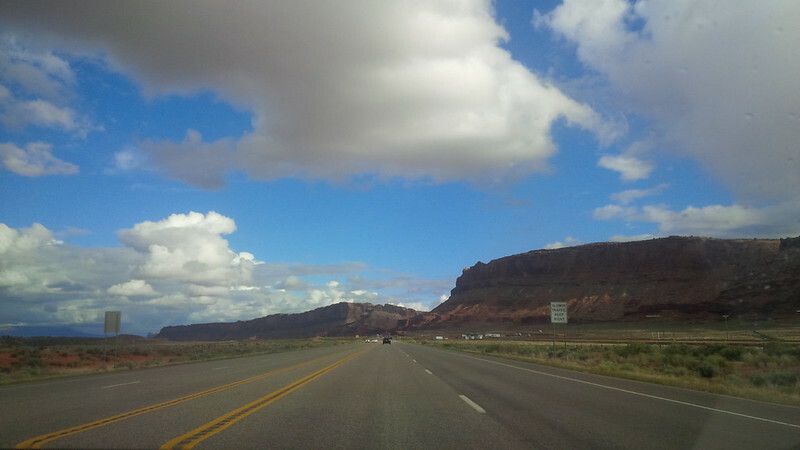 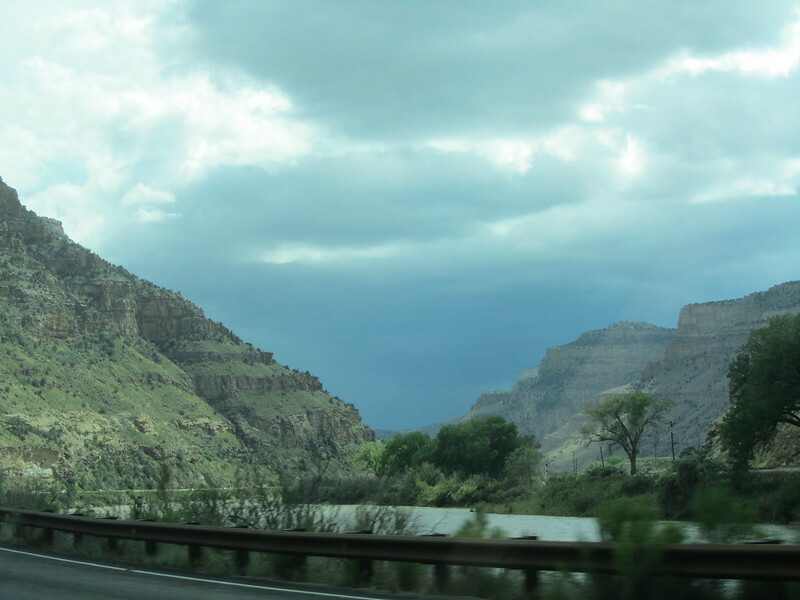 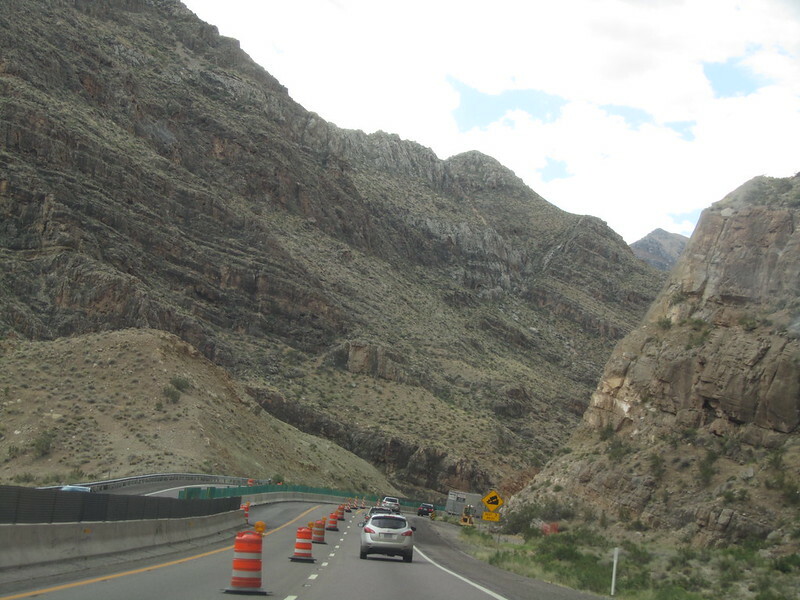 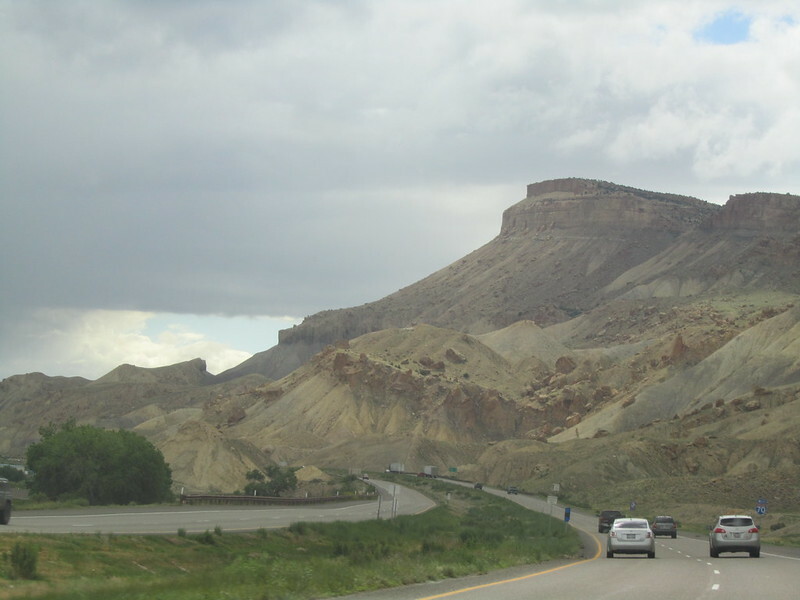 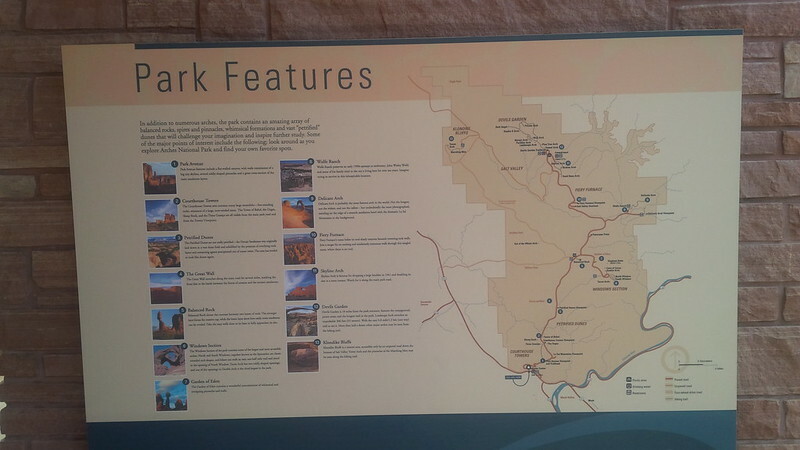 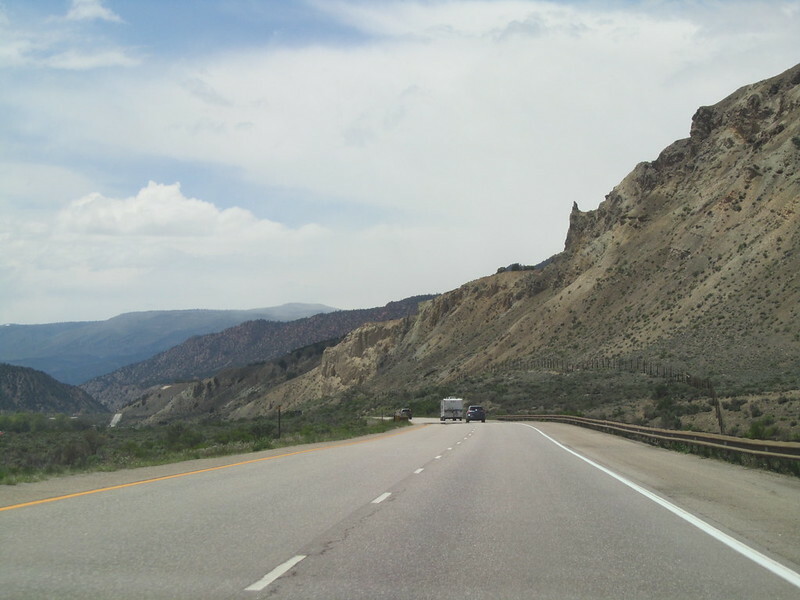 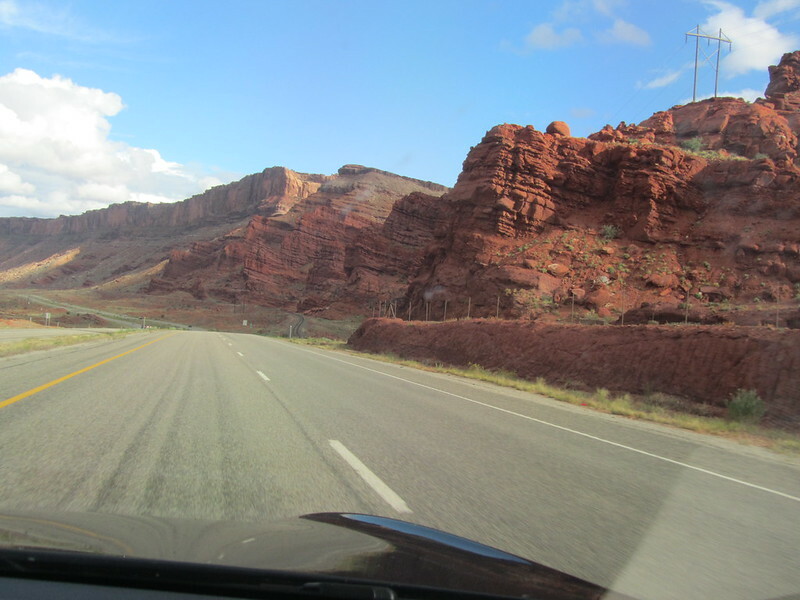 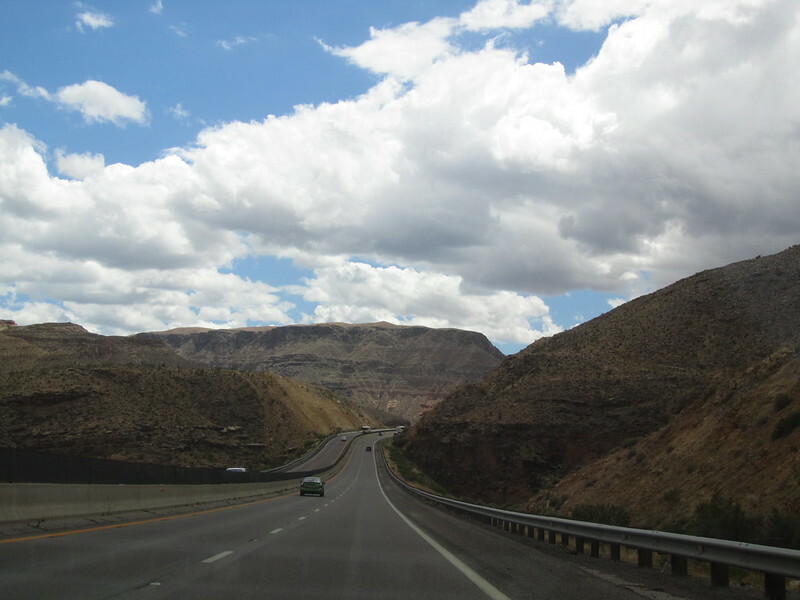 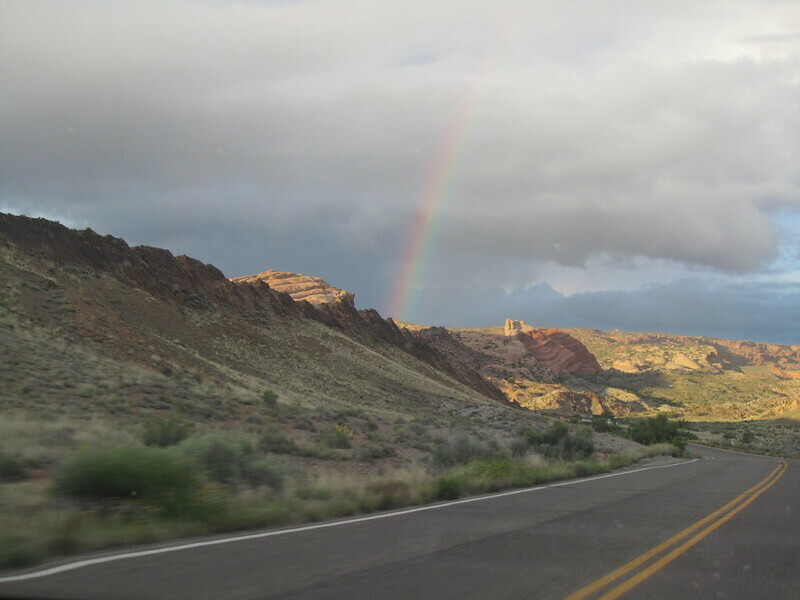 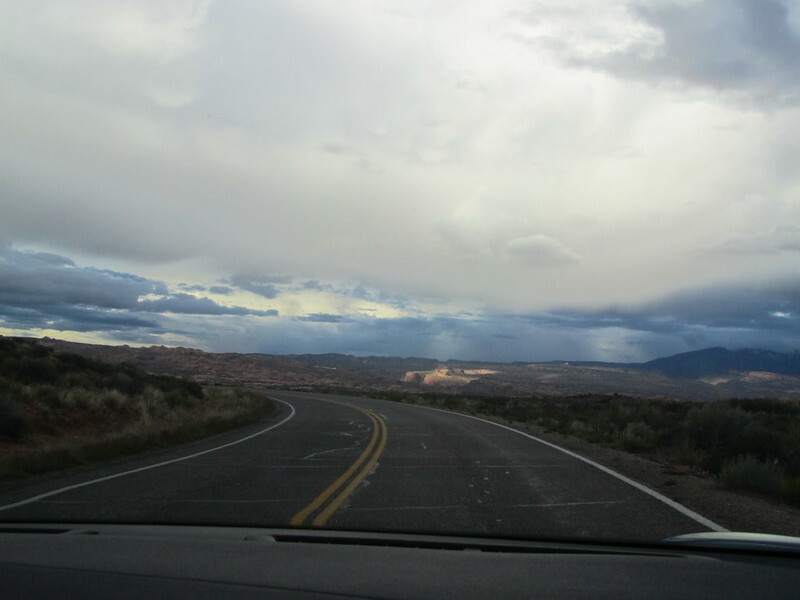 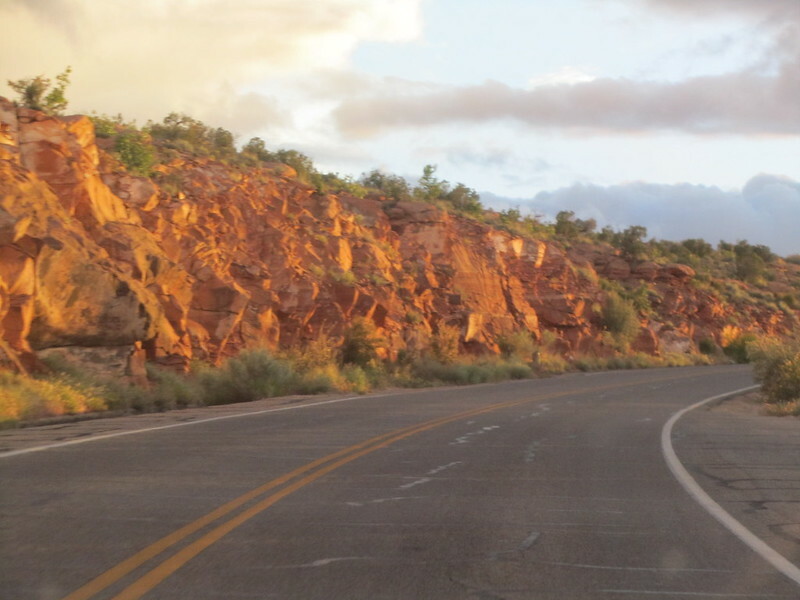 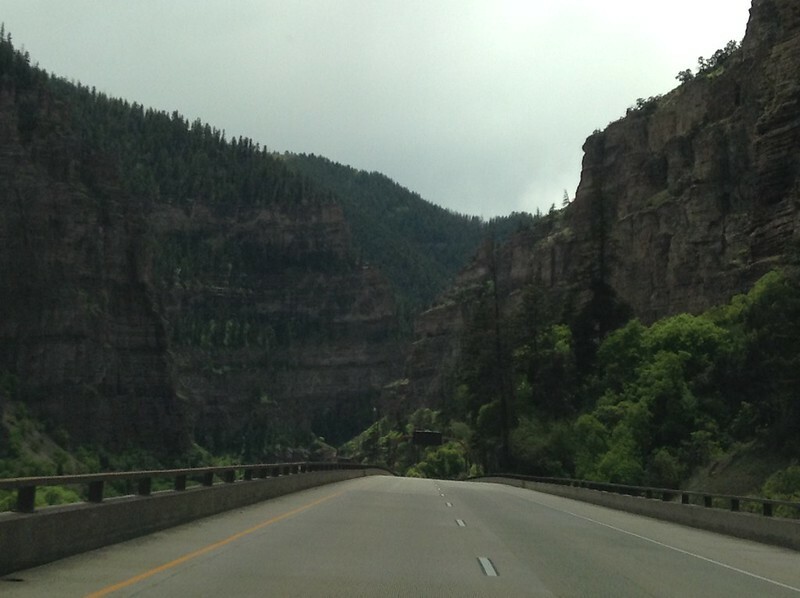 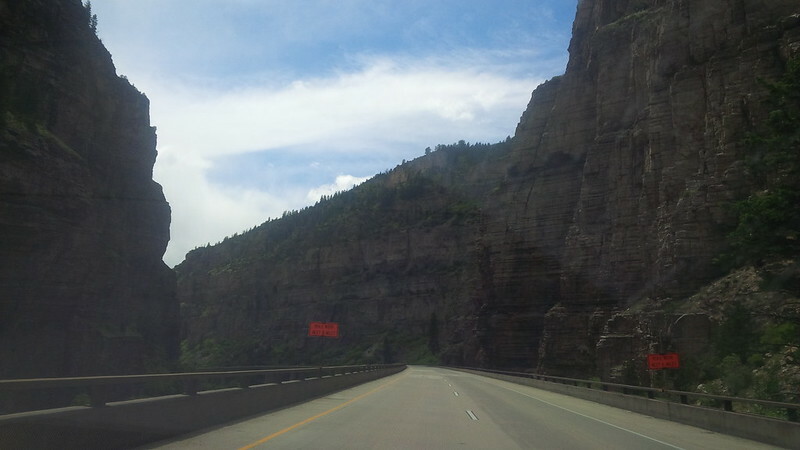 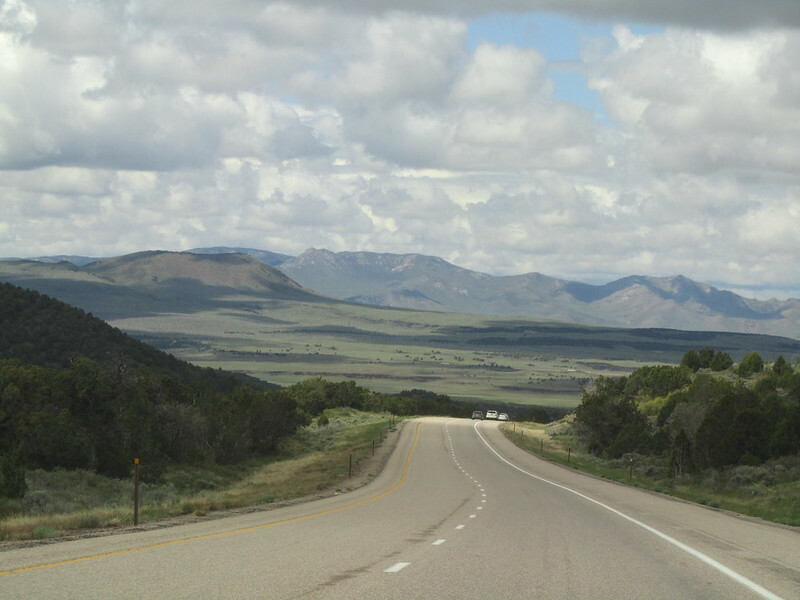 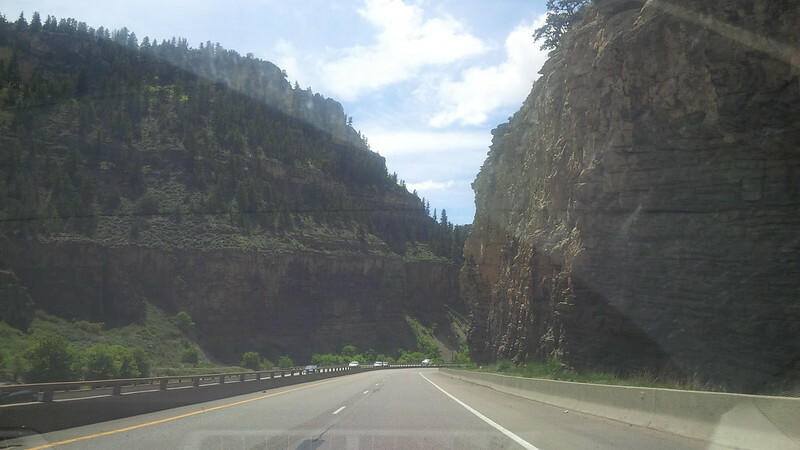 The drive between Utah and Arizona is through a canyon pass that was under construction. 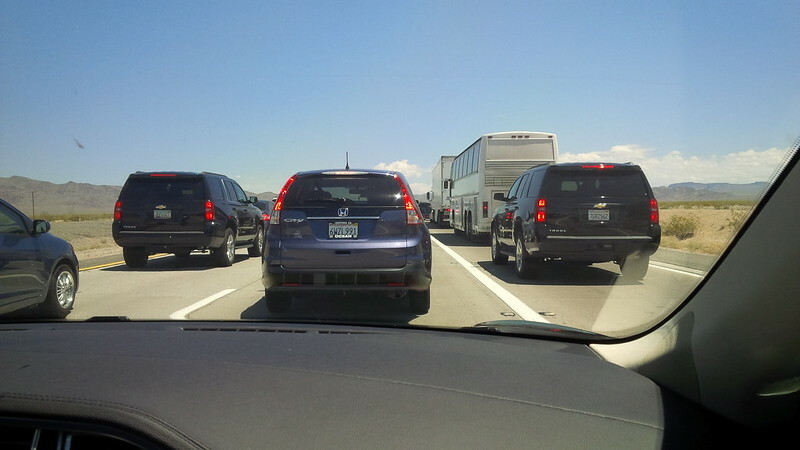 No active work being done on a Sunday during a holiday weekend, but the number of lanes was restricted. 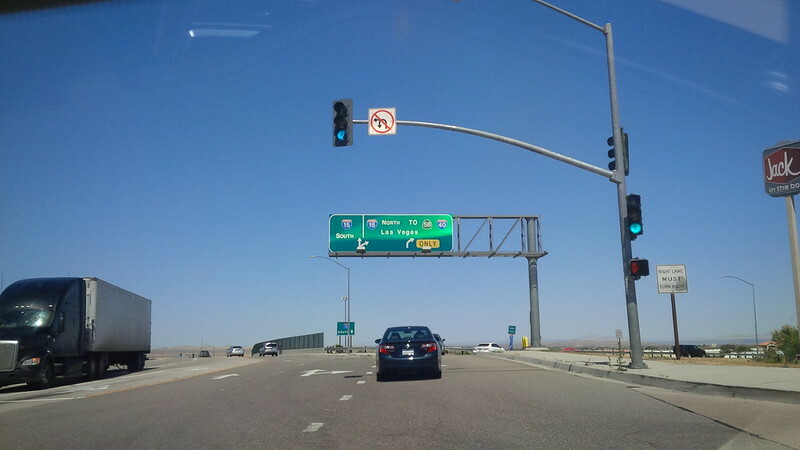 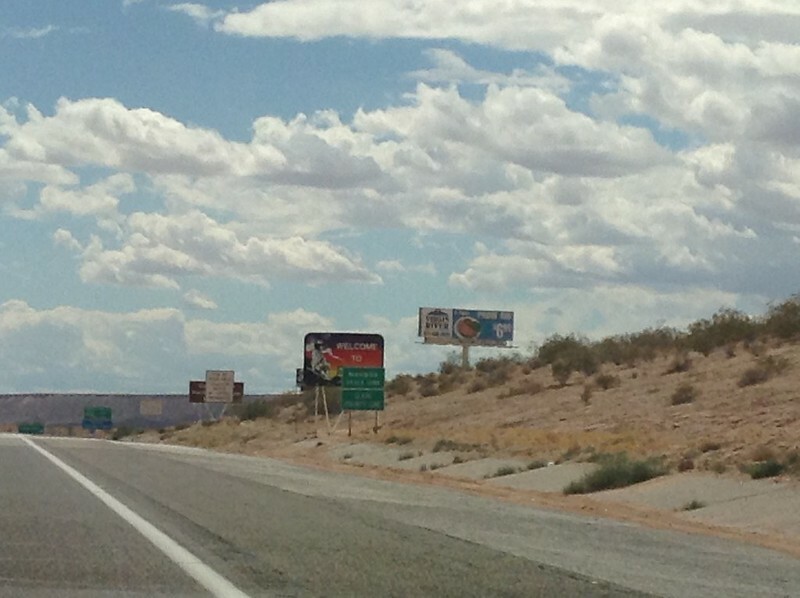 We missed taking a photo of the Arizona State line, but we’re not missing the crossing into Nevada. 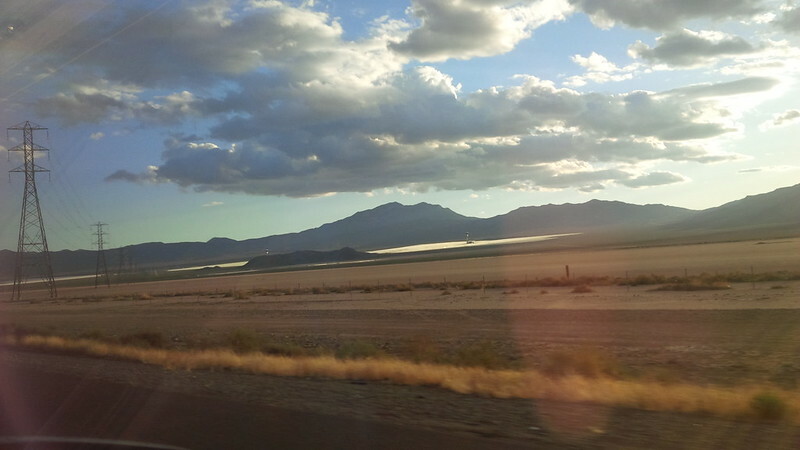 What is that mirage (not the Mirage, just a mirage) that we see? 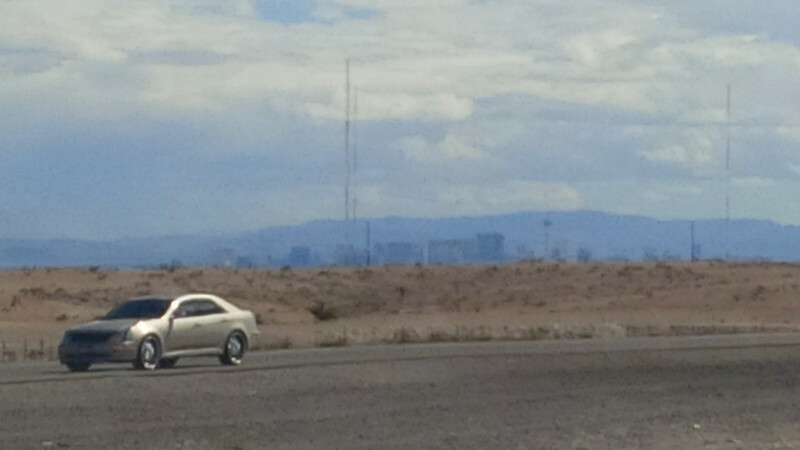 It was strange to see Vegas from this view. 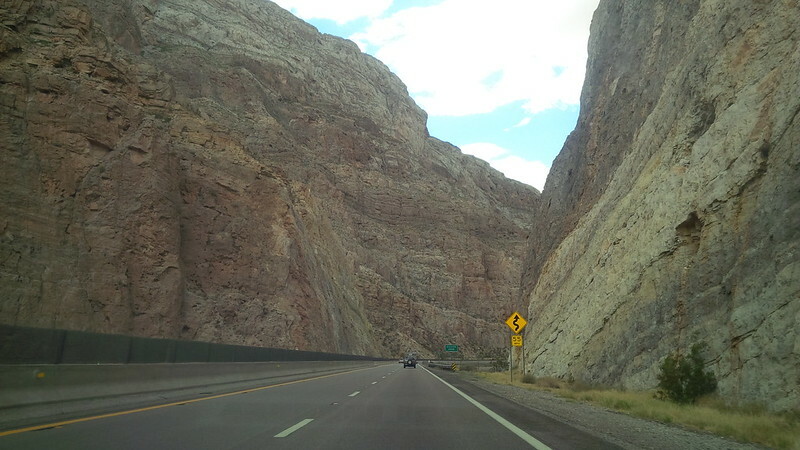 It’s not the angle we’re used to seeing on the drive from California. 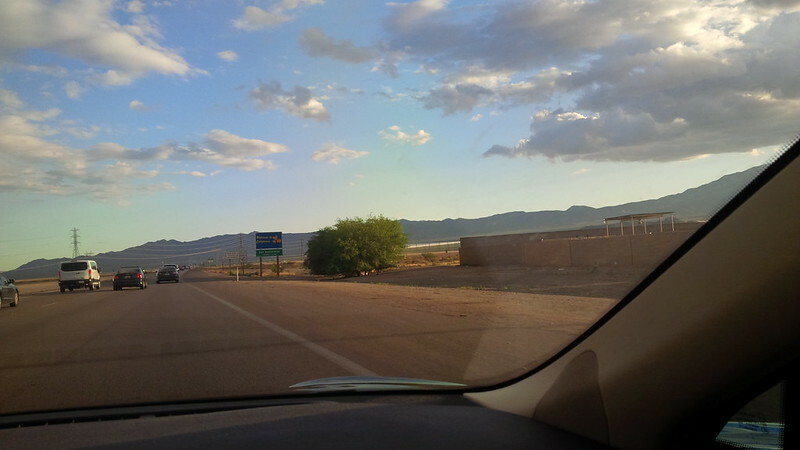 We usually see the Strip first, but that’s because we approach it from the South. 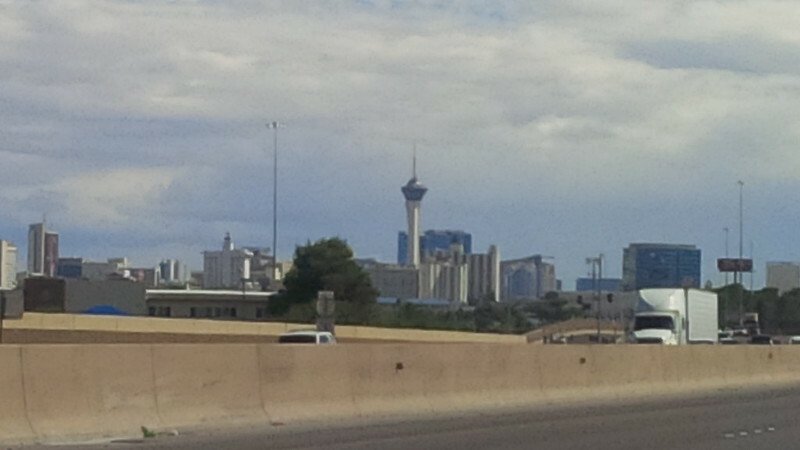 We’re coming in from the North and we see Downtown Las Vegas first. 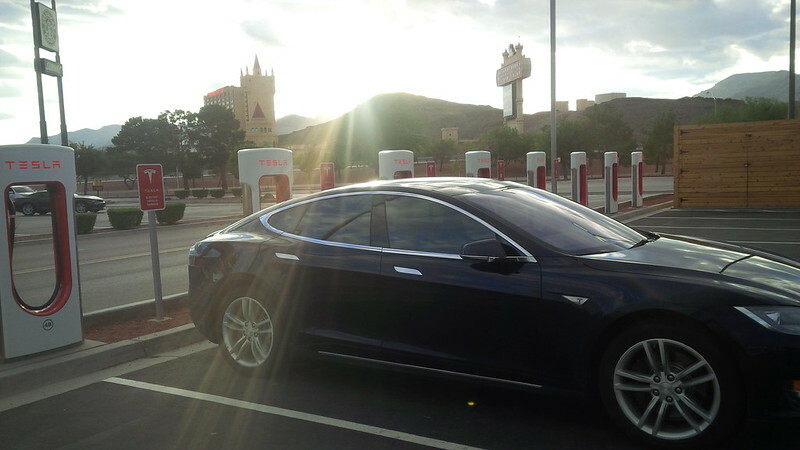 Under the auspices of “Whatever Happens in Vegas, Stays in Vegas.” I can neither confirm nor deny any “gaming” activities that occurred between seeing Downtown Las Vegas and stopping off at the Las Vegas Supercharger. 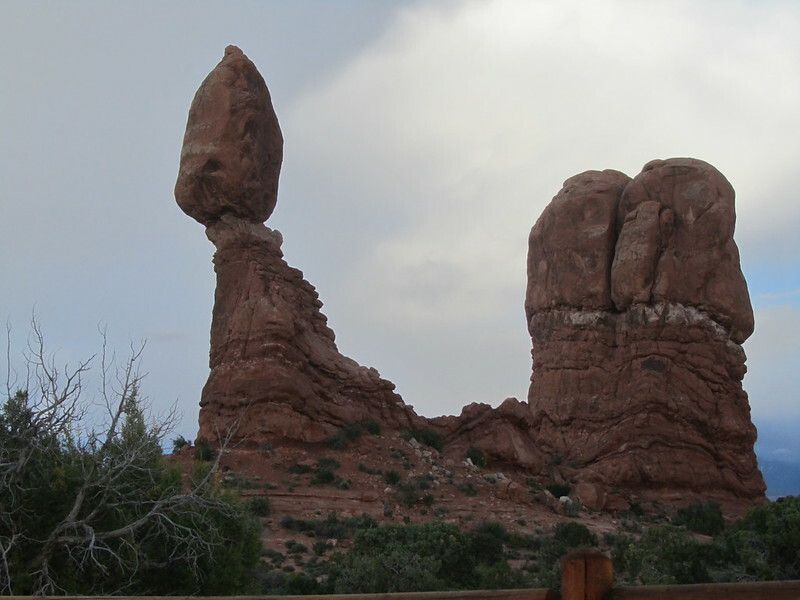 But, between you and I, I was doing pretty well at the table that I sat in… If you know what I mean. 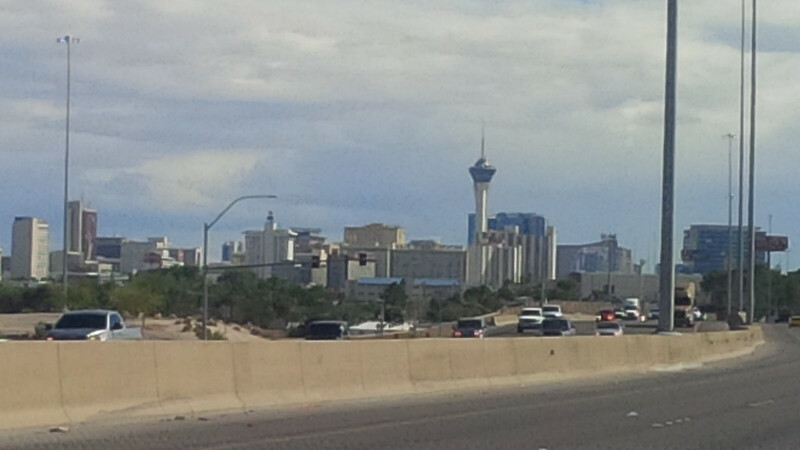 😉 However, not well enough to stay in Vegas for another couple of days. 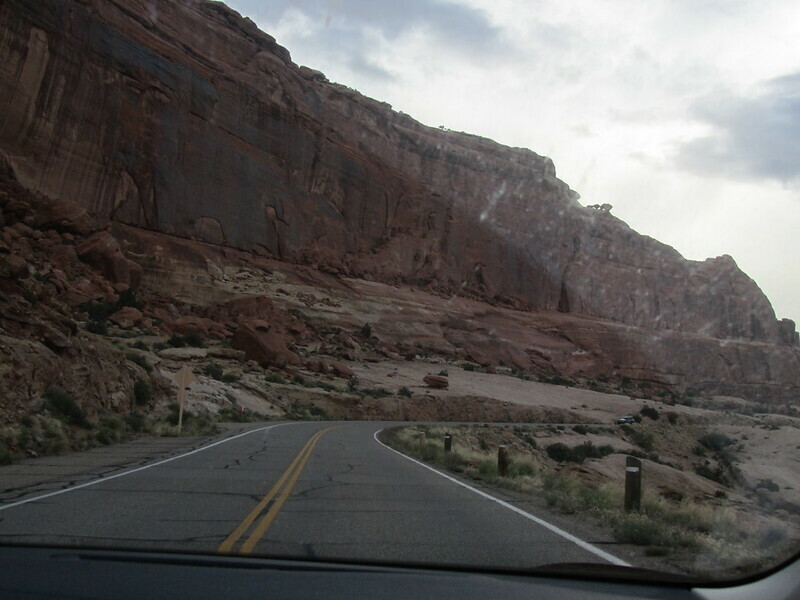 We decided to head home. 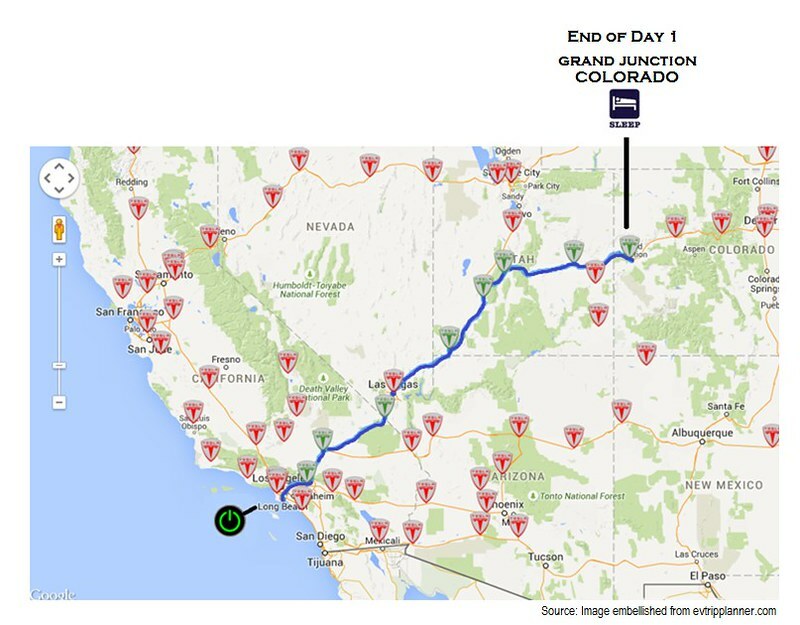 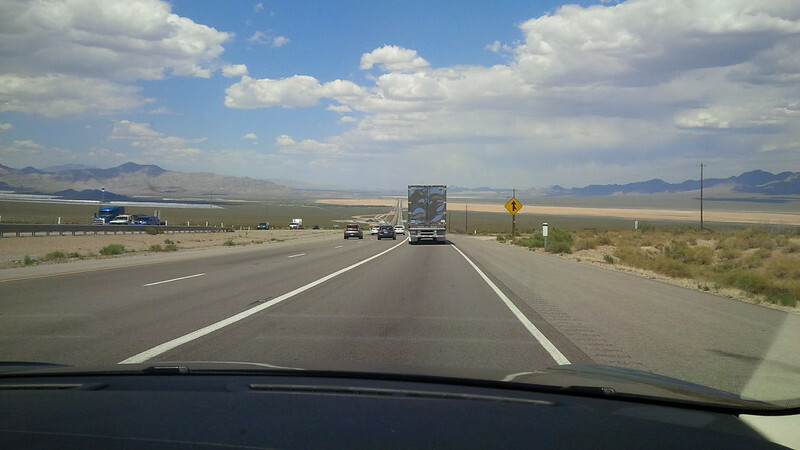 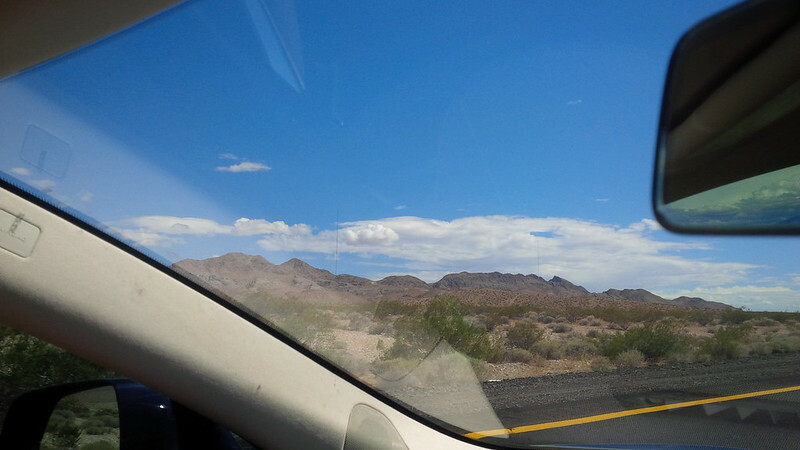 We’ve been out for 23 days at this point and the allure of the “short” drive home from Vegas was overwhelming. 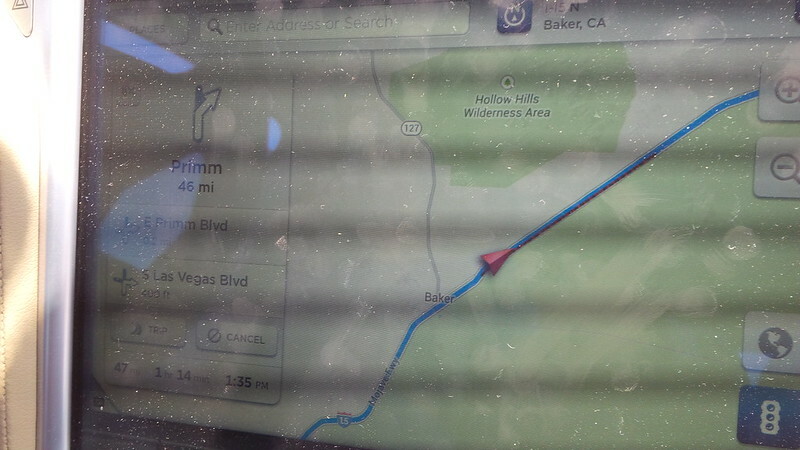 We could have made the drive to Primm Supercharger from where we were (it’s approximately 40 miles) but we decided to get an insurance charge. 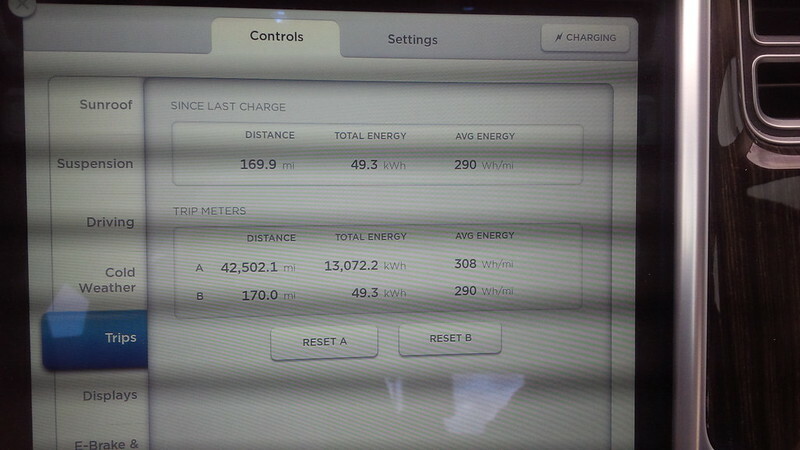 After all, it was in the desert on our first day that we decided to charge often and charge lots. 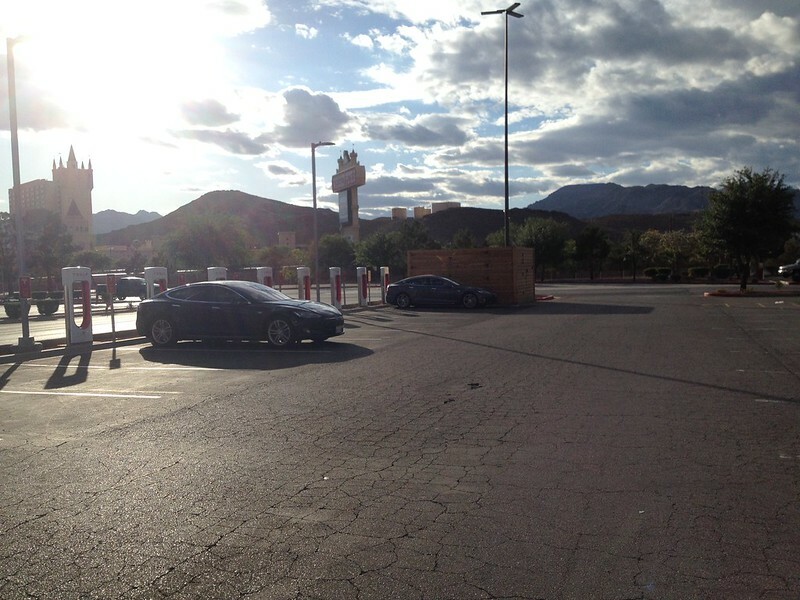 We arrived at a near full house at the Las Vegas Supercharger. 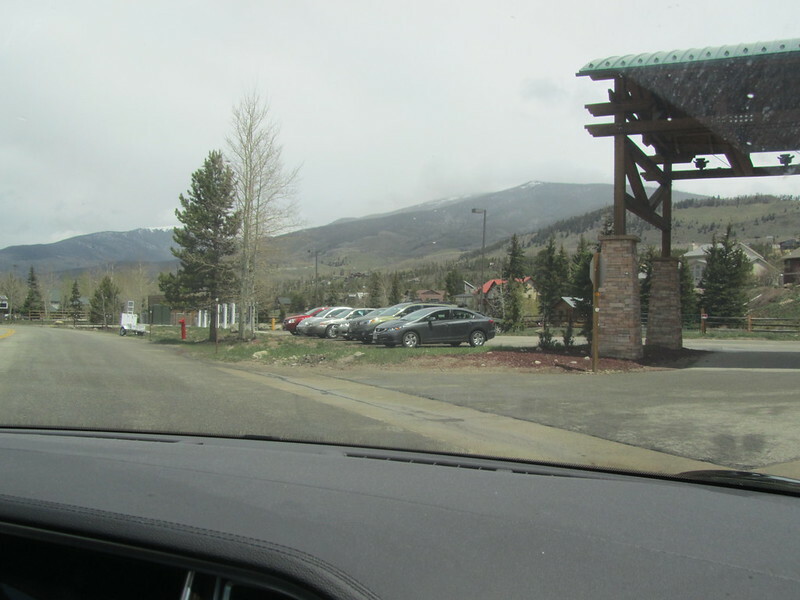 We didn’t take a photograph of the charger stalls at this time because folks were all in their cars. 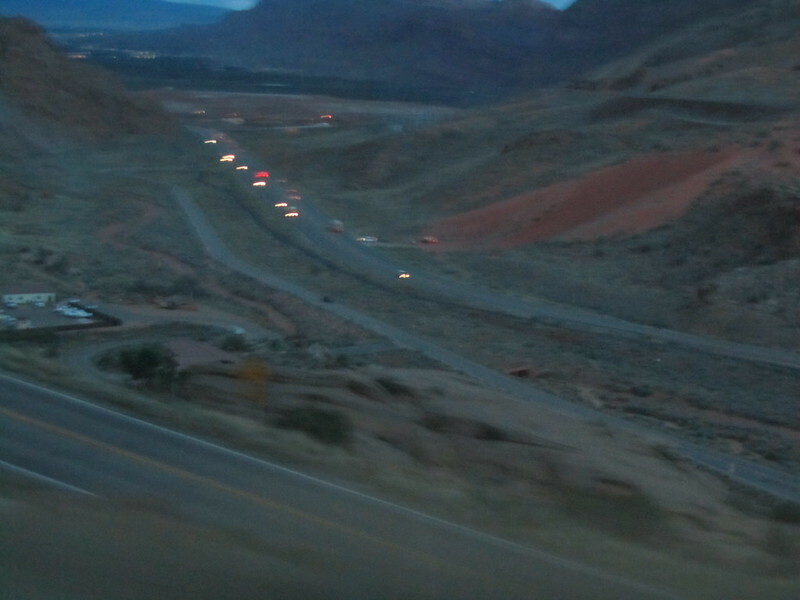 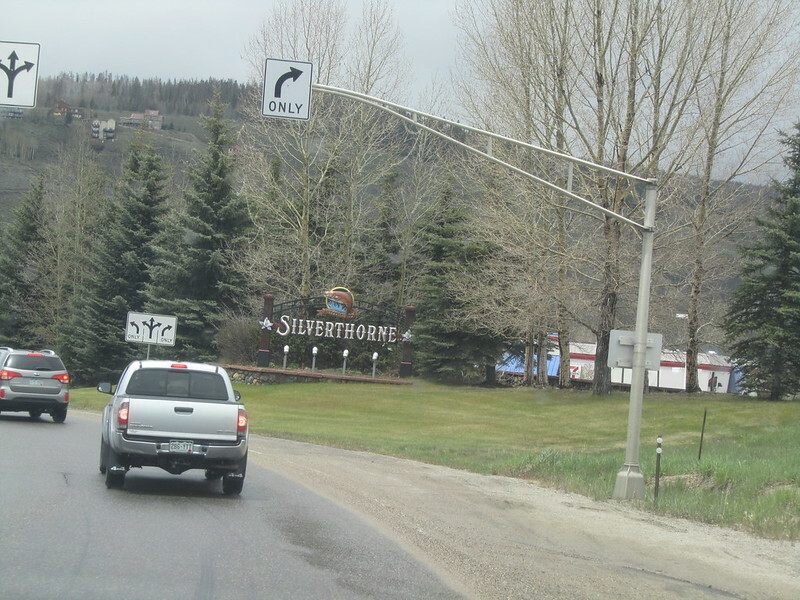 We did notice that the car from Riverside that was charging beside us when we arrived was the same one that we met in St. George earlier in the day. 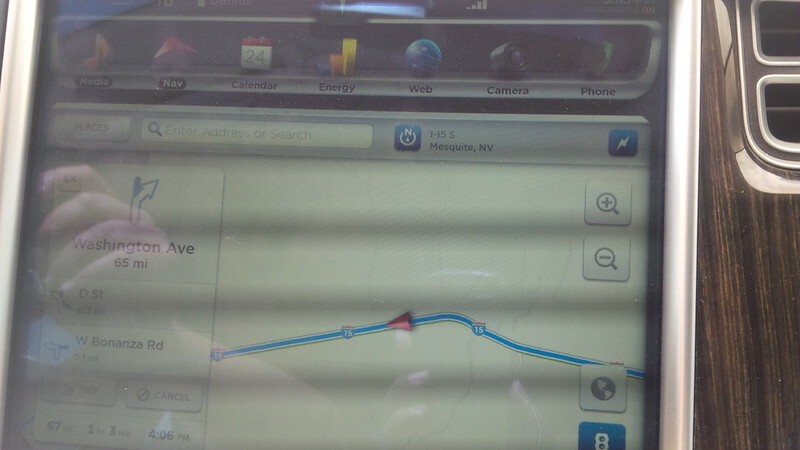 They lapped us, i.e. 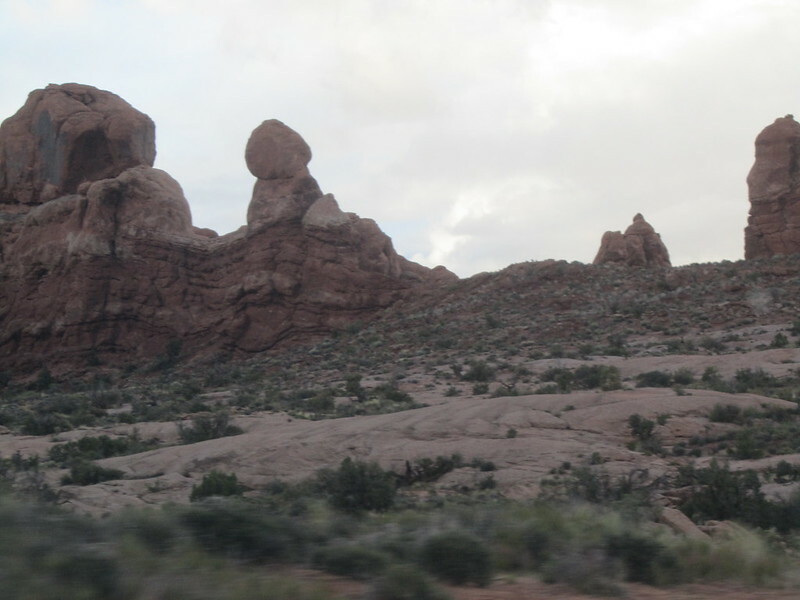 we left them charging when we left St. George. 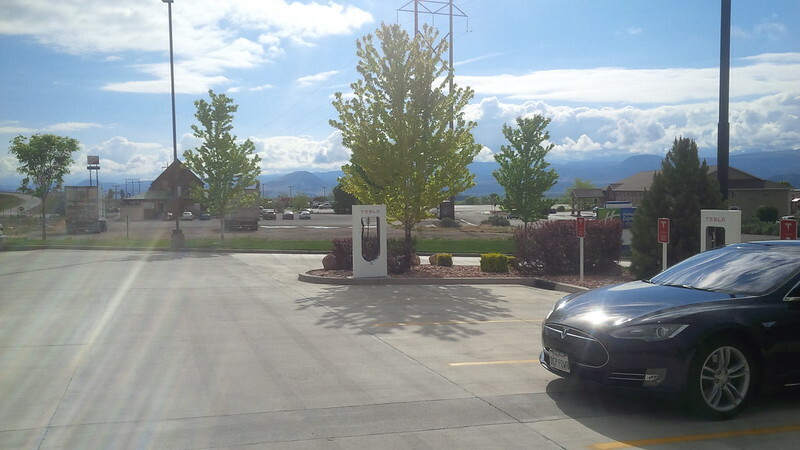 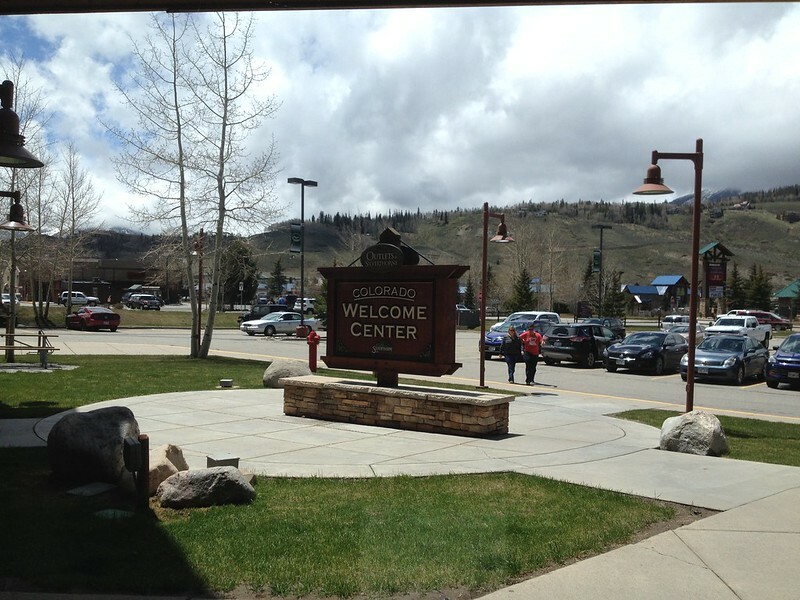 We greeted them when they got out of their car to unplug from the supercharger as they prepared to leave. 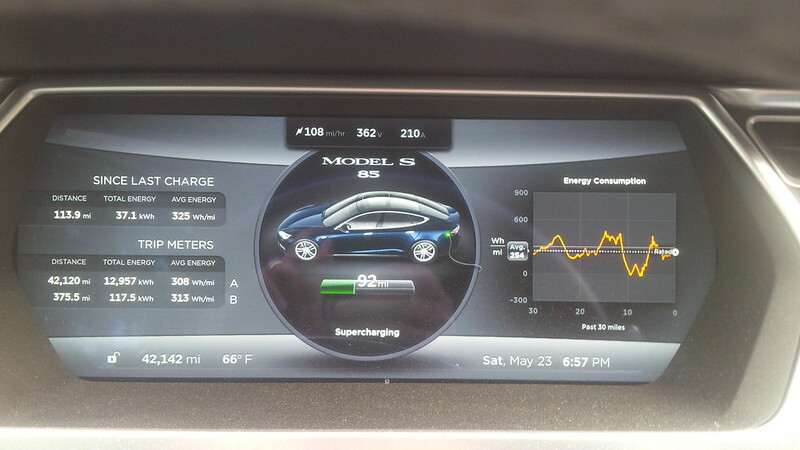 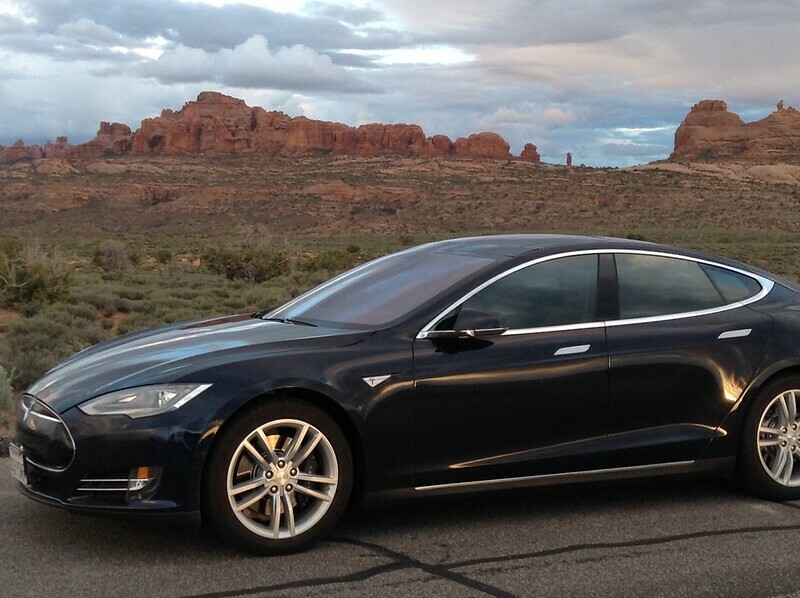 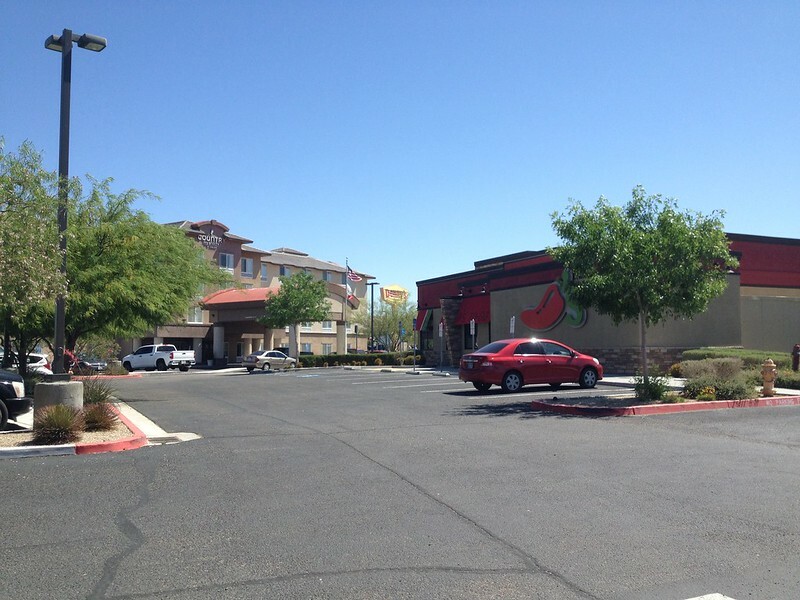 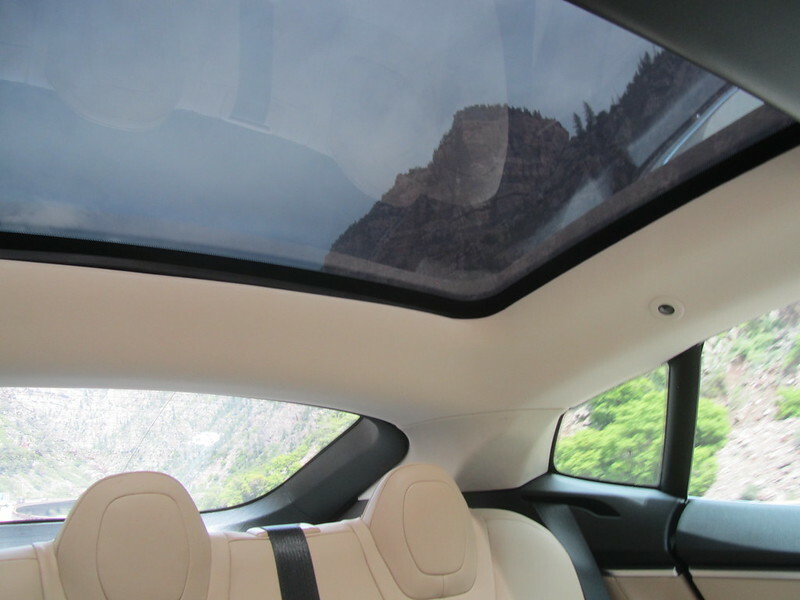 Because of the heat many stay in their cars in Vegas and run their air conditioning while supercharging. 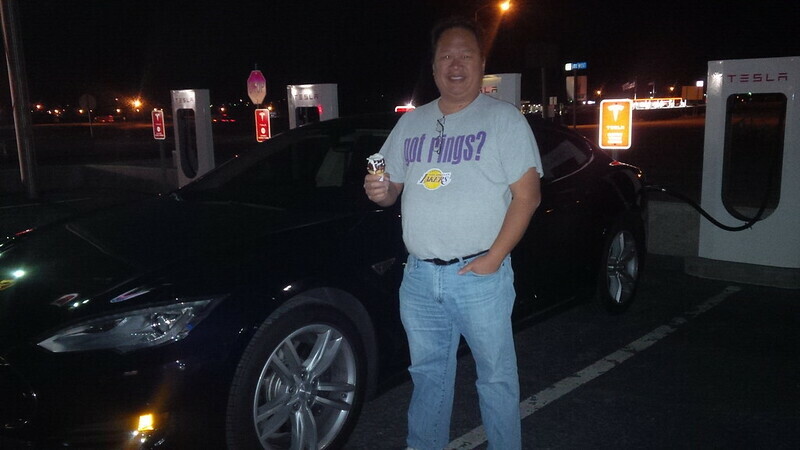 We had the detour, which I can neither confirm, nor deny, and now we met up with them again at the Las Vegas Supercharger. 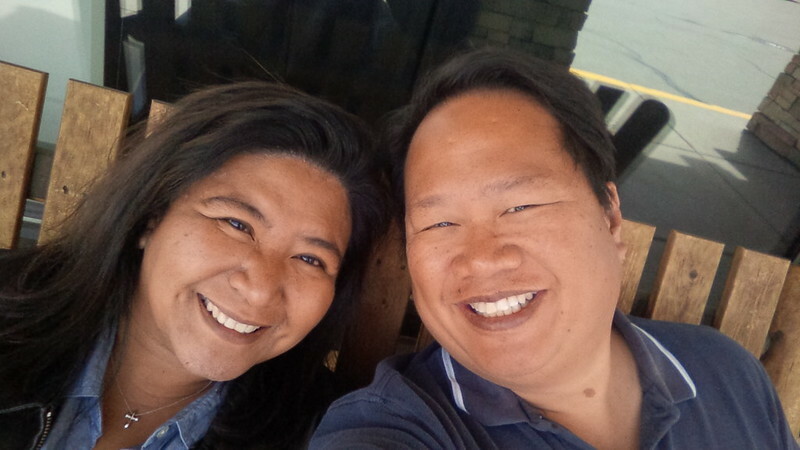 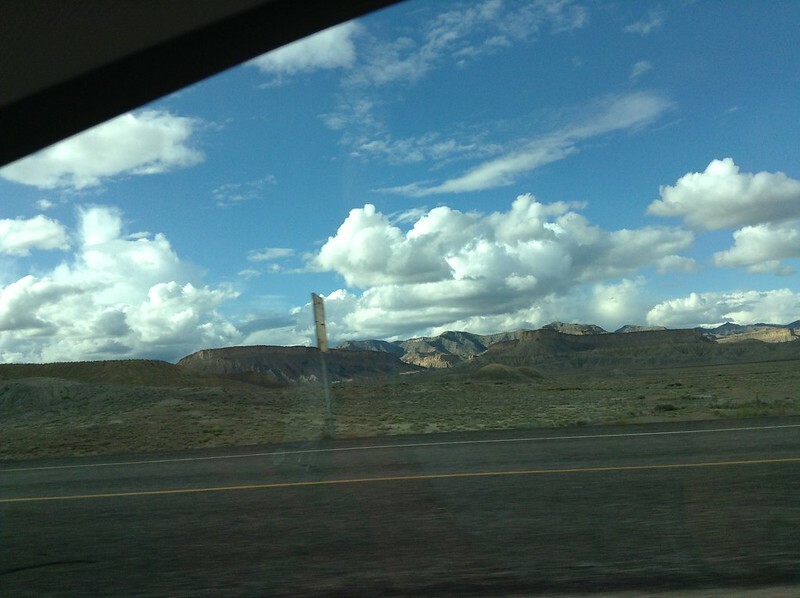 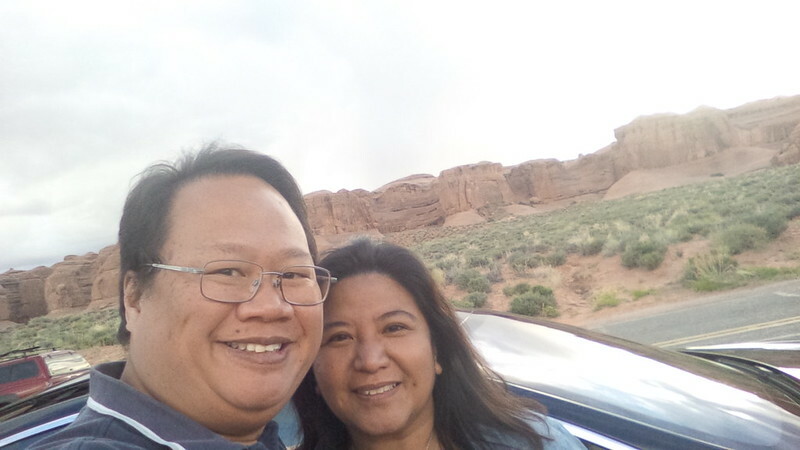 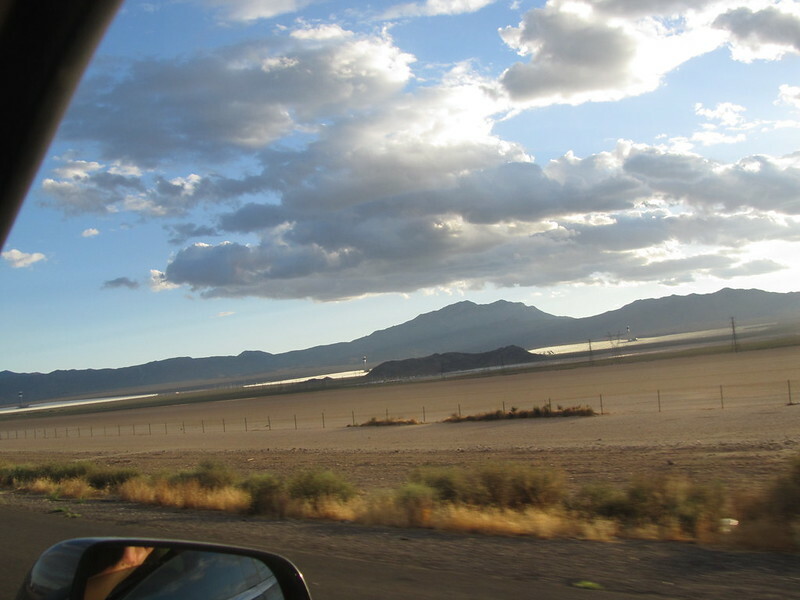 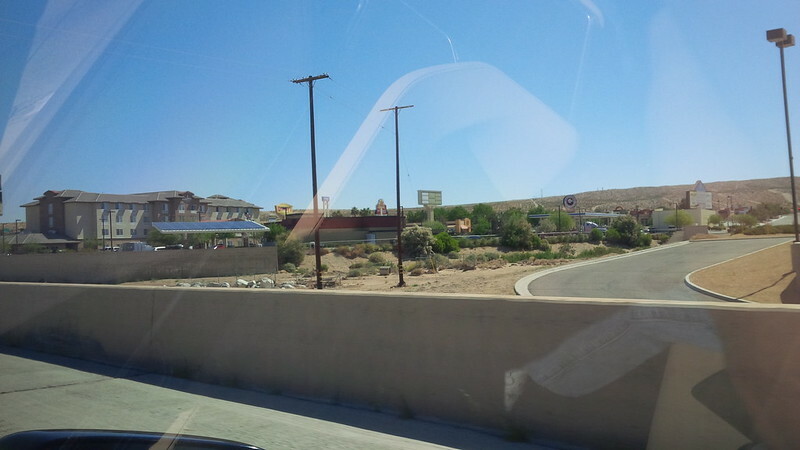 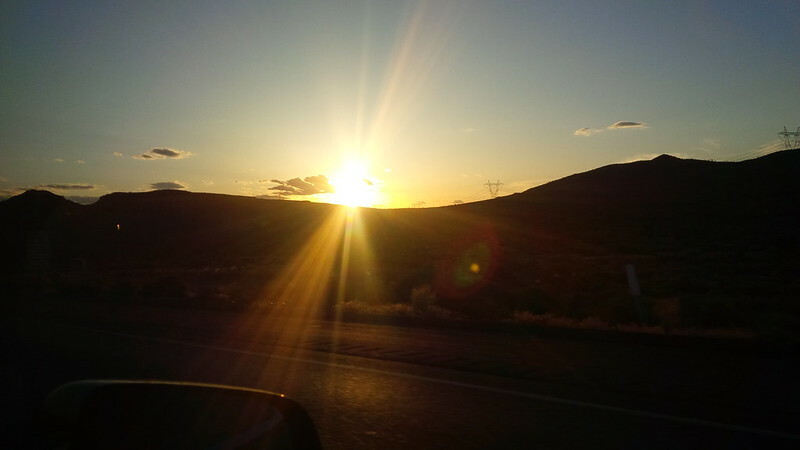 Satisfied with our insurance charge, we skipped the famous Las Vegas Strip and headed to Primm. 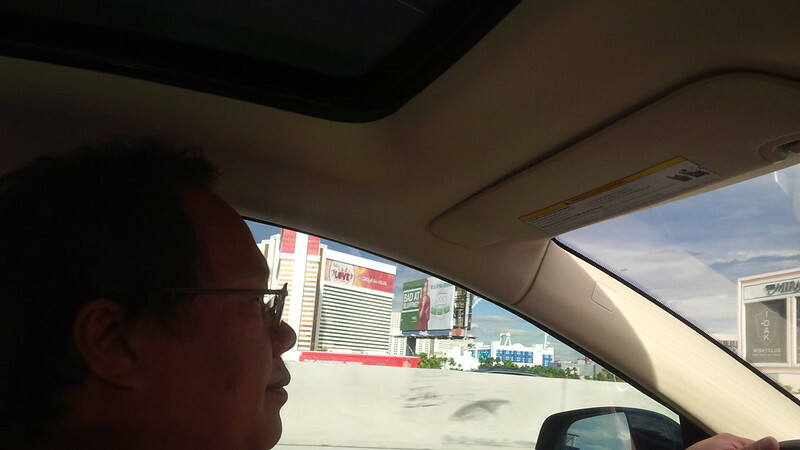 However, my wife was able to take photographs of some of The Strip properties as we passed it from the freeway, The Mirage. 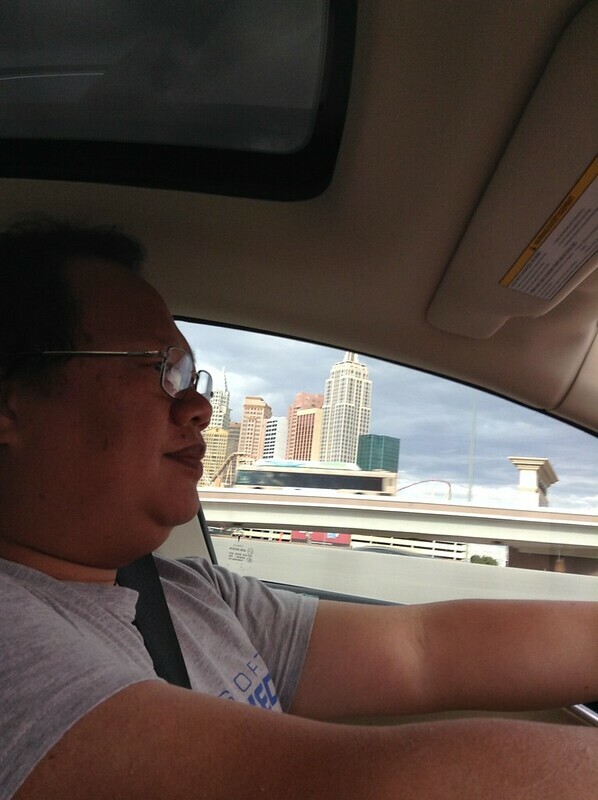 We skipped New York, New York. 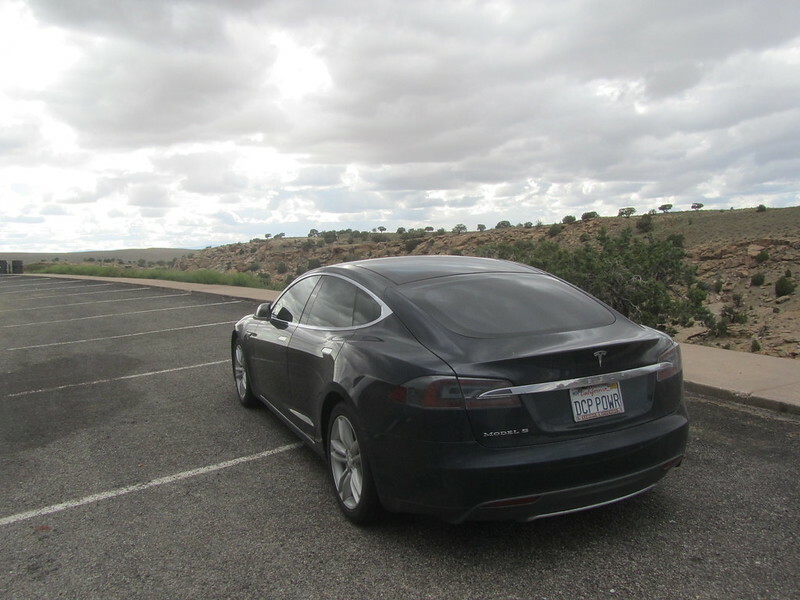 And a short drive of about 40 miles later, we find ourselves at the border of Nevada and California at the Primm Superchargers. 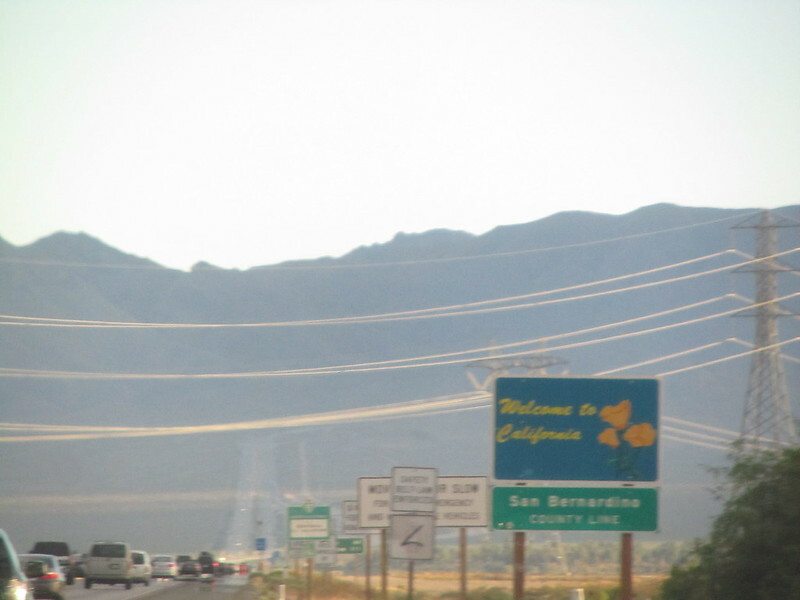 I did a two device technique for the crossing back to California shot and was glad with both of them. 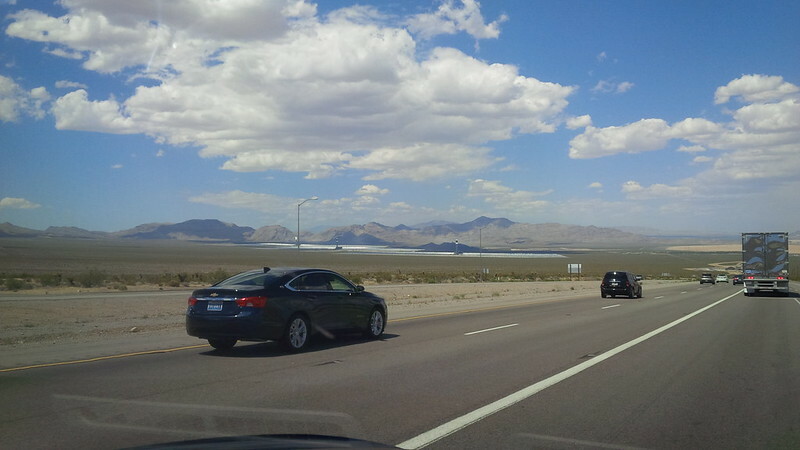 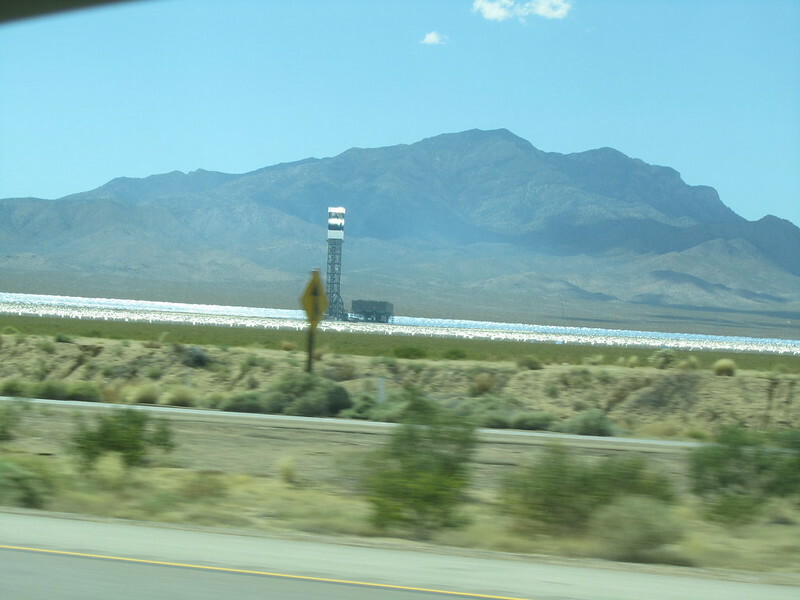 Up next is that huge solar farm at the border of California and Nevada that’s been in operation for a year or so. 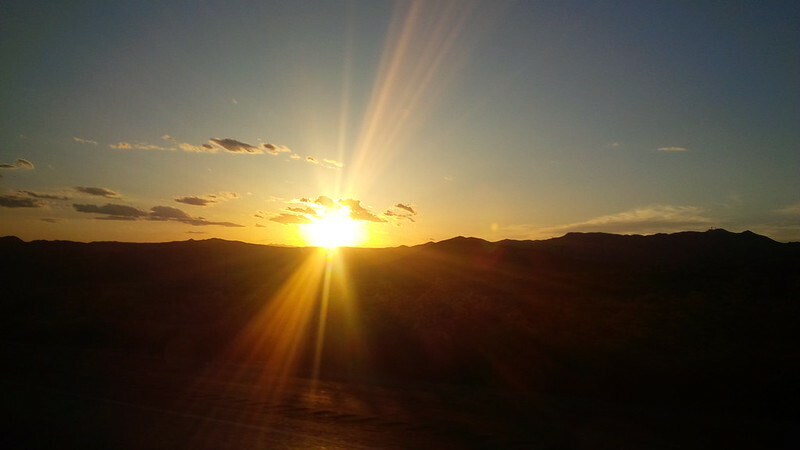 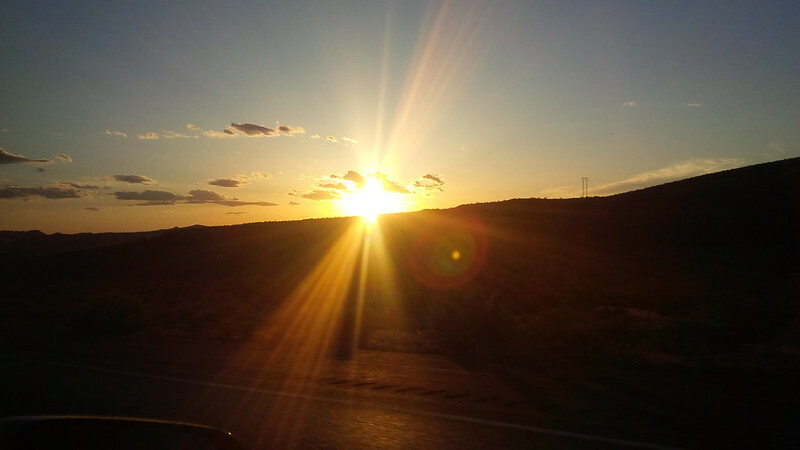 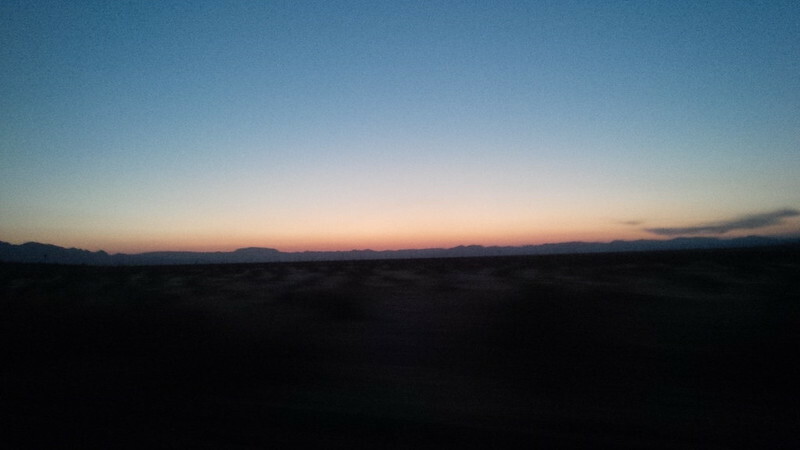 It’s my turn for the sunset pictures. 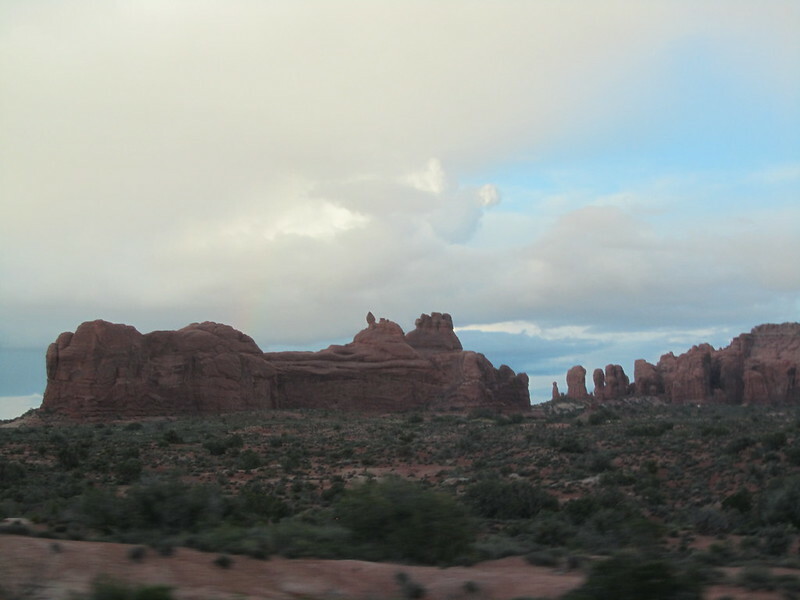 There are several more on Flickr, but these are the ones that I thought to share on the blog. 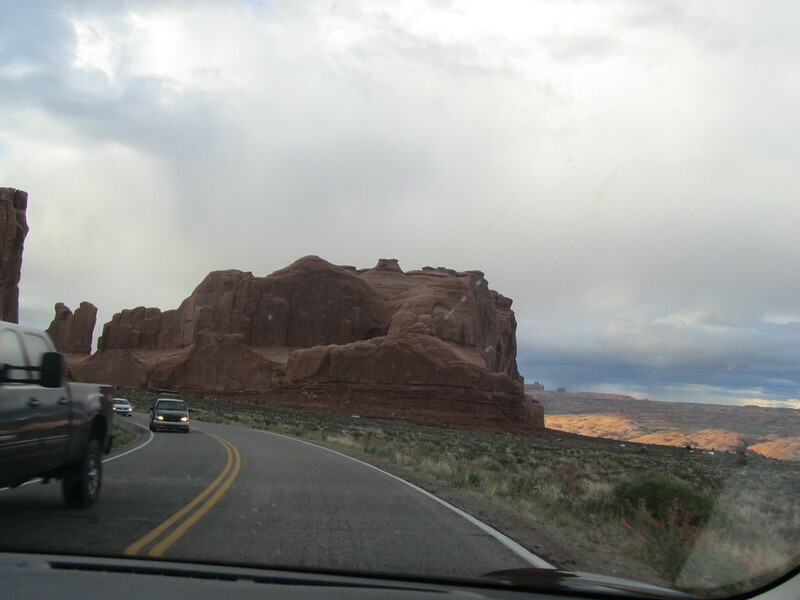 As we expected, the Sunday of a three day weekend usually shifts the traffic to Monday and the traffic this evening was quite moderate for this trip. 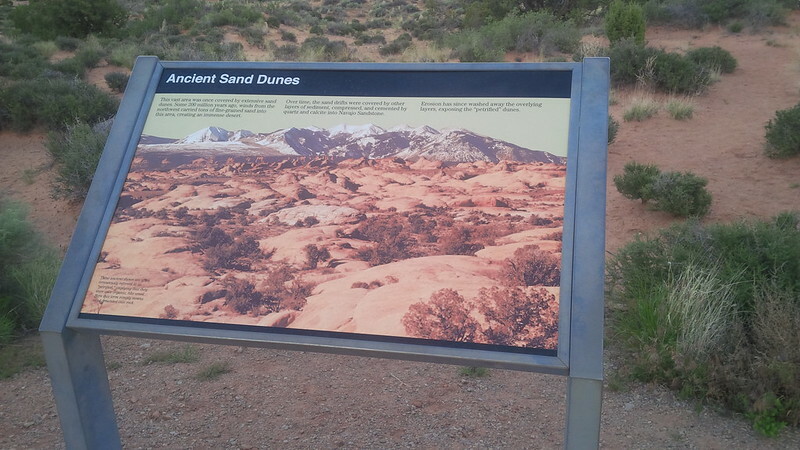 Back then film was expensive. 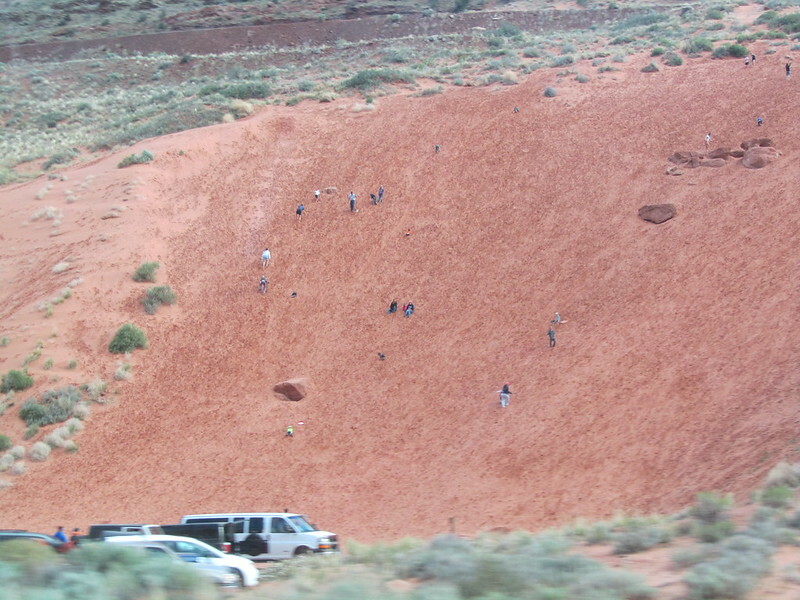 Additionally, I was barely an adult, and still needing assistance from my mom. 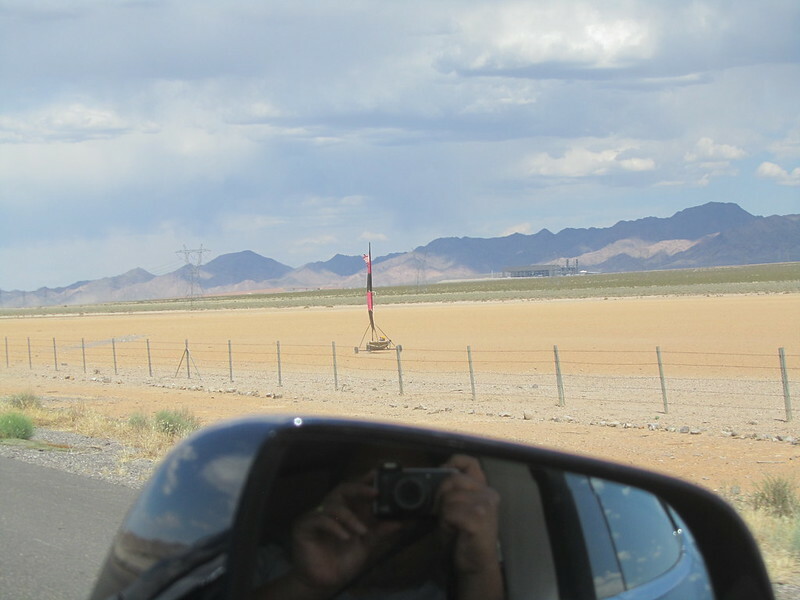 Her rule with photographs was that there better be someone we “know” in the shot. 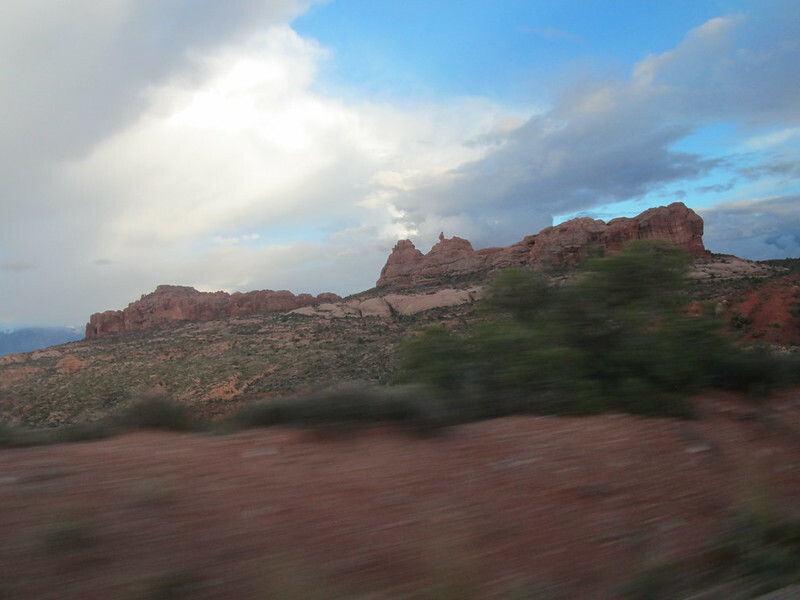 So, I wasn’t much for “nature” photography or anything like that. 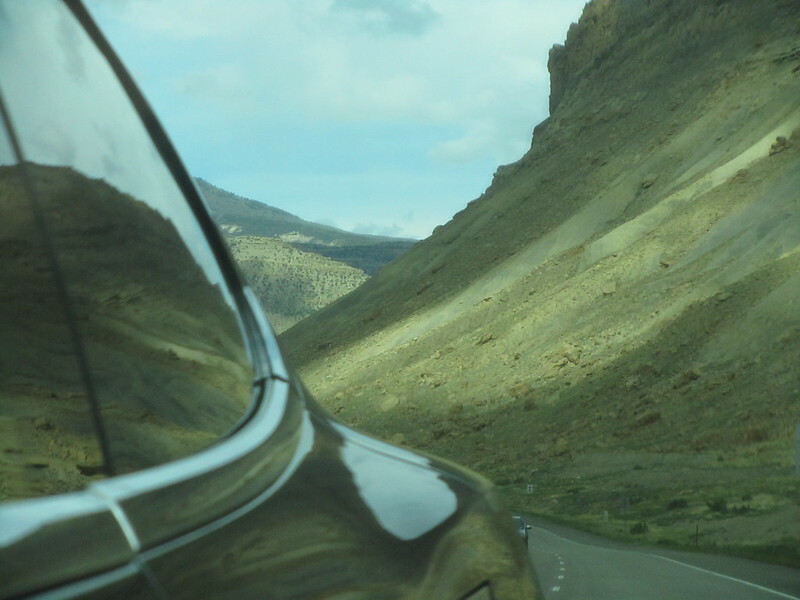 So, boy am I glad that digital photography is now the norm. 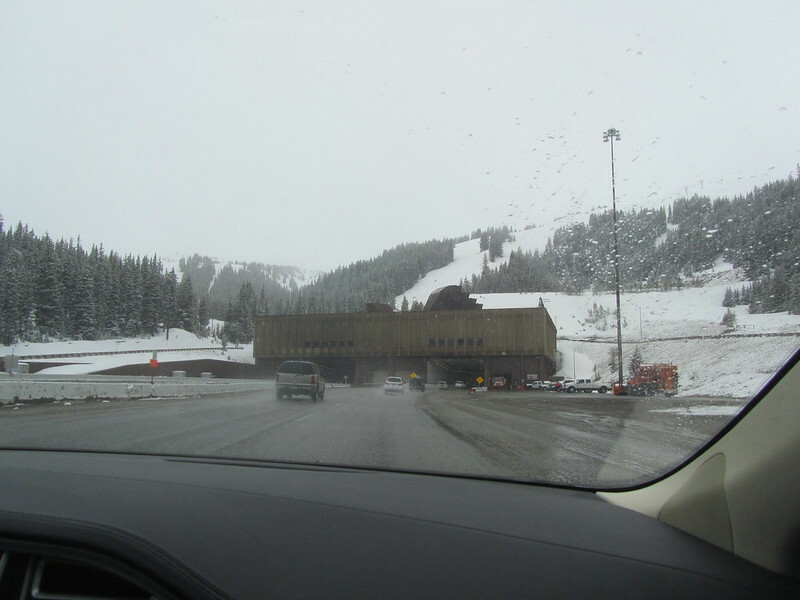 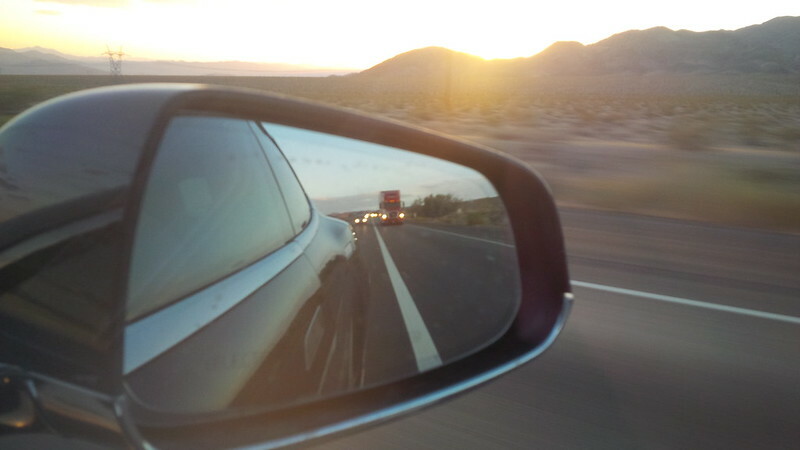 “Passing a Truck 2”. 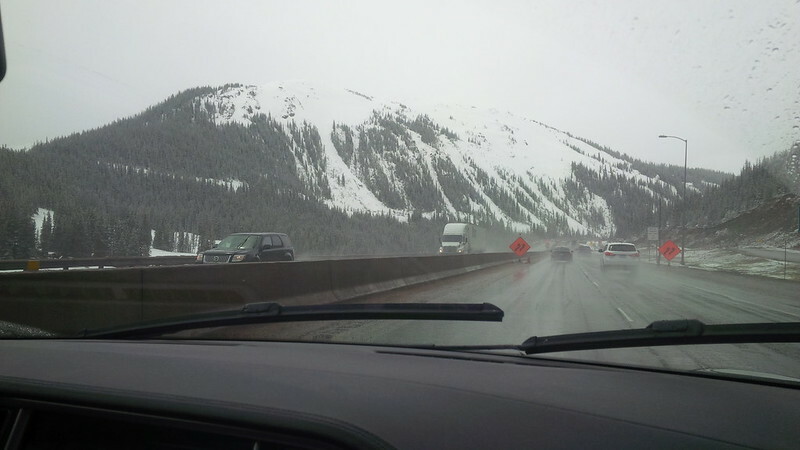 Yes, that’s the same truck. 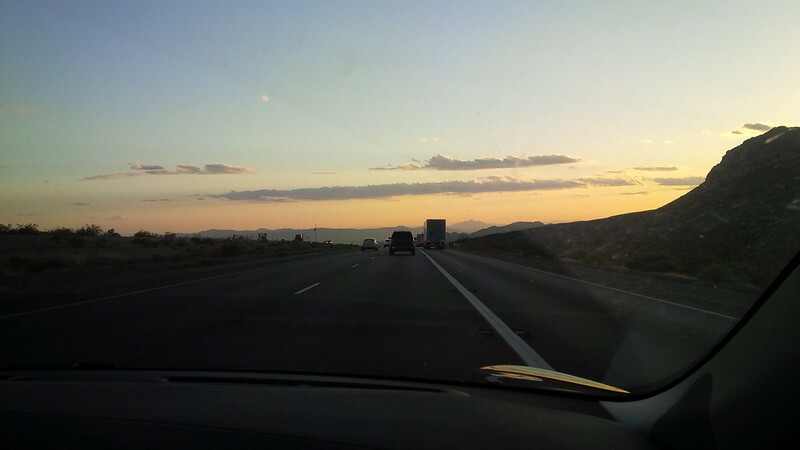 I had a LOT of time to snap away, I’m not driving this leg, remember. 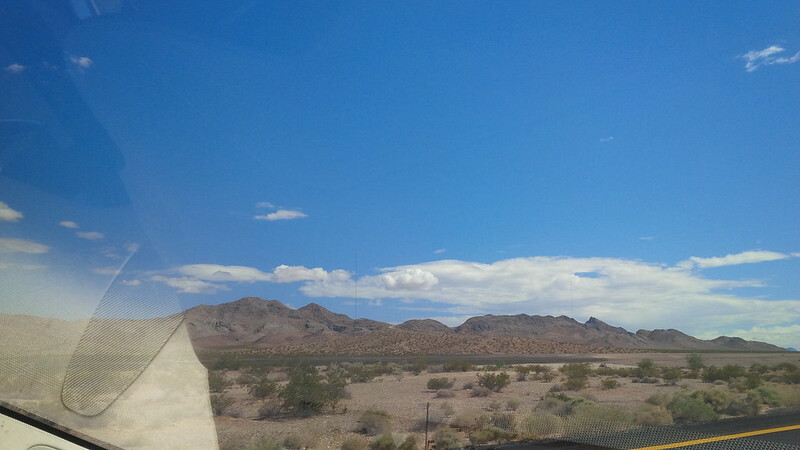 I was supposed to rest and nap, but I couldn’t. 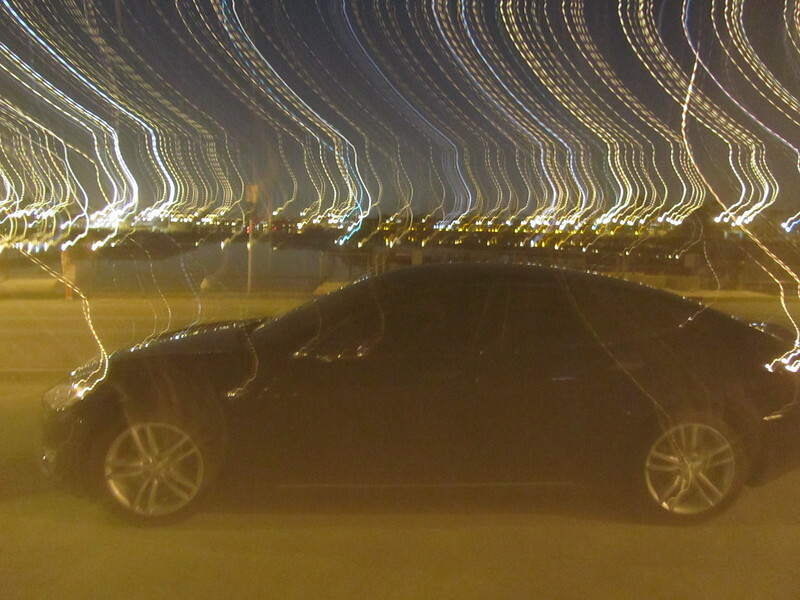 I was having too much fun taking pictures. 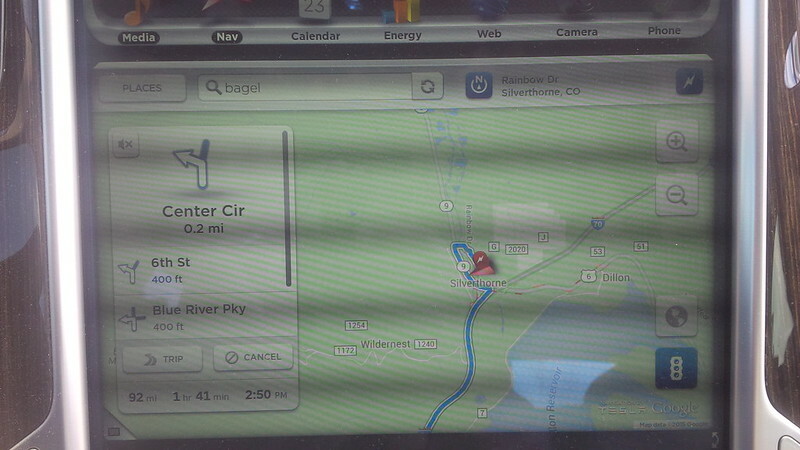 And getting loopy as we got closer to home. 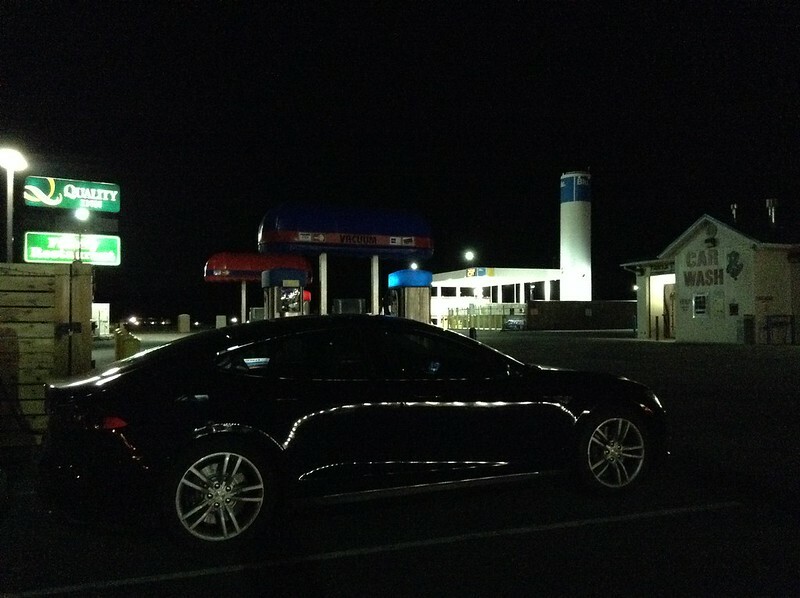 And just after sunset we reached the Barstow Supercharger. 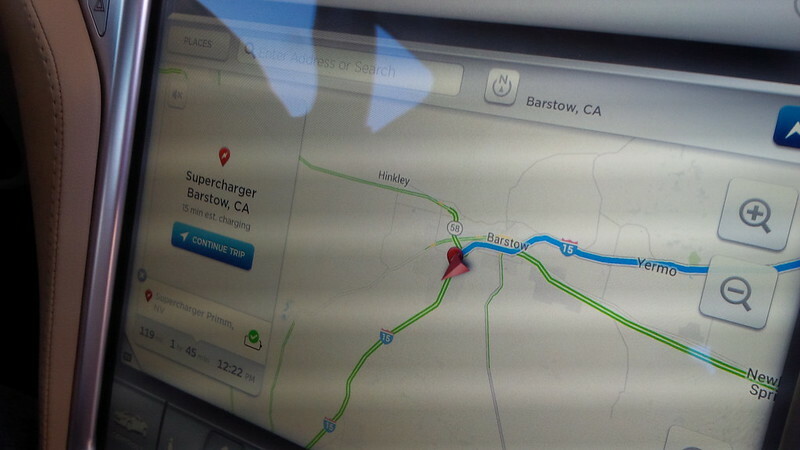 Now, the handy-dandy navigation trip planner originally had us routing to the Rancho Cucamonga Supercharger, but we know from experience that we can make it home on a full charge in Barstow, so we ignored the beta software again and just charged up. 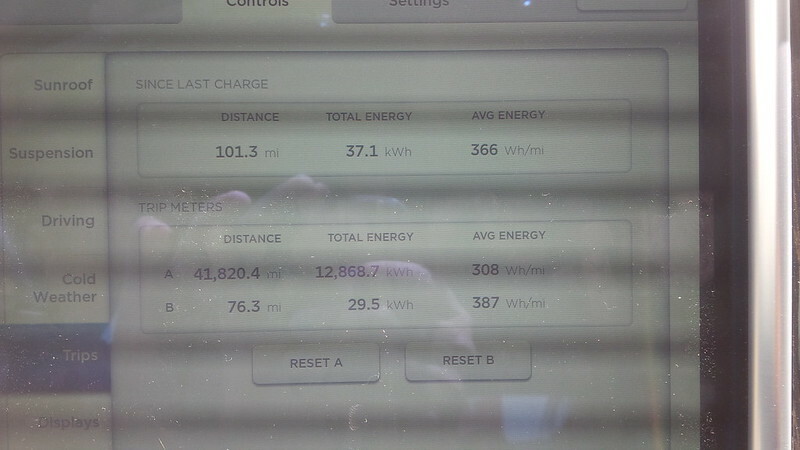 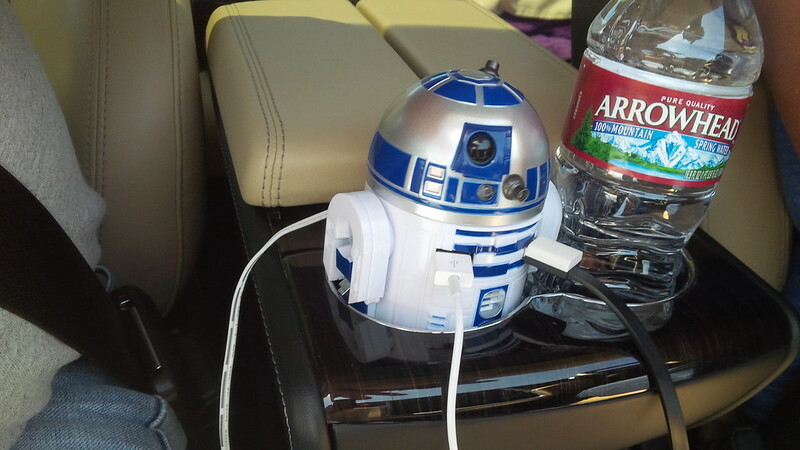 We arrived in Barstow with plenty to spare and plenty of time to charge. 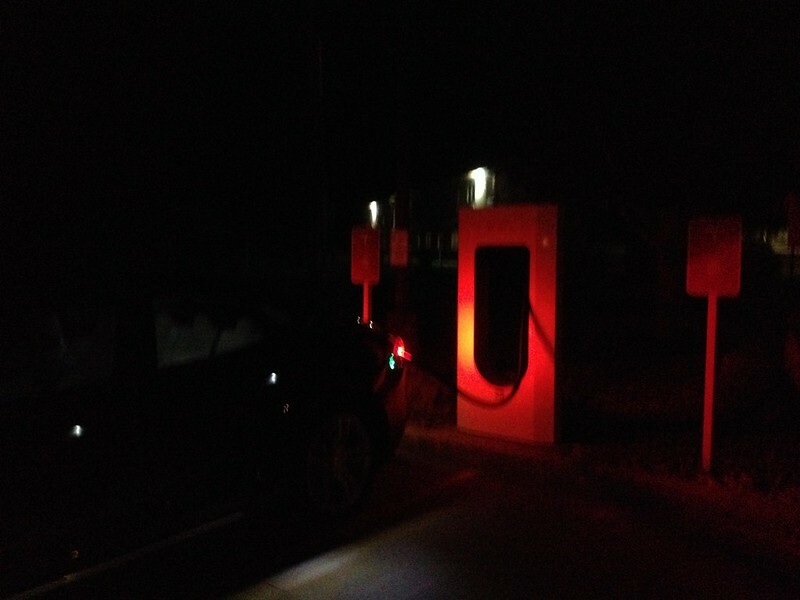 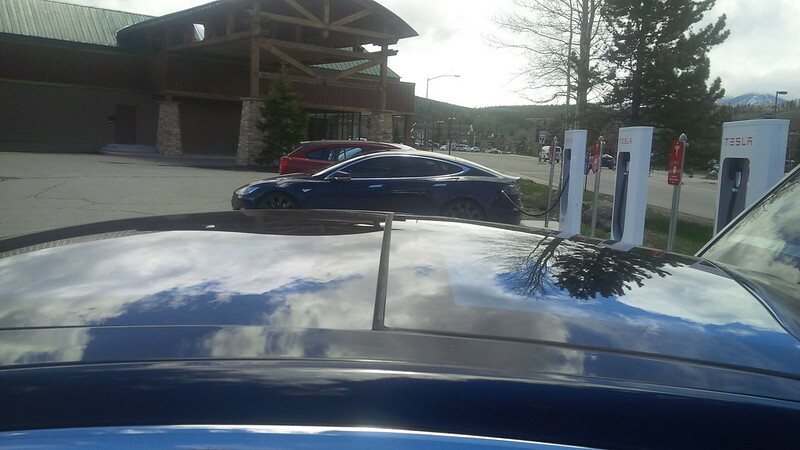 As we charged away at the site, another Model S pulled up to the hotel next door and was letting its passengers out for the night before he pulled into a couple of stalls over from us. 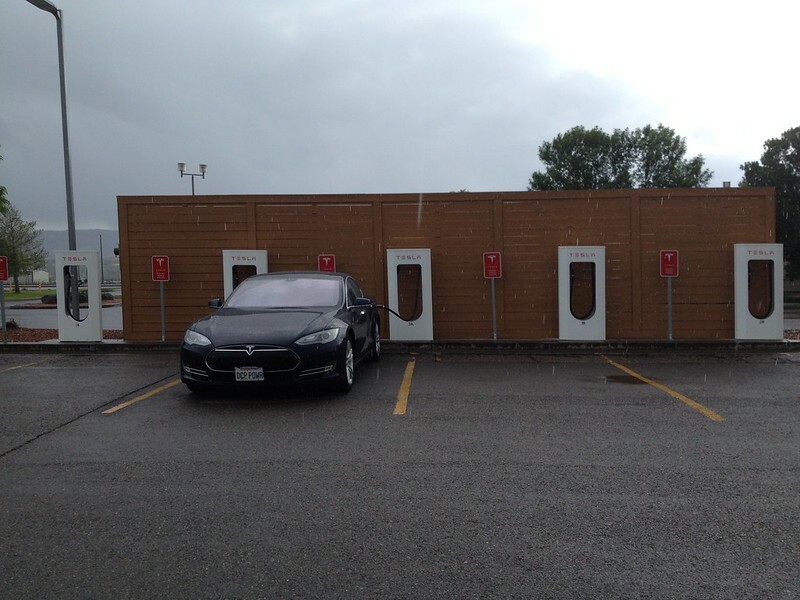 In the meantime, a new brown 70D pulled up on the newer stalls (not covered by the solar canopy.) 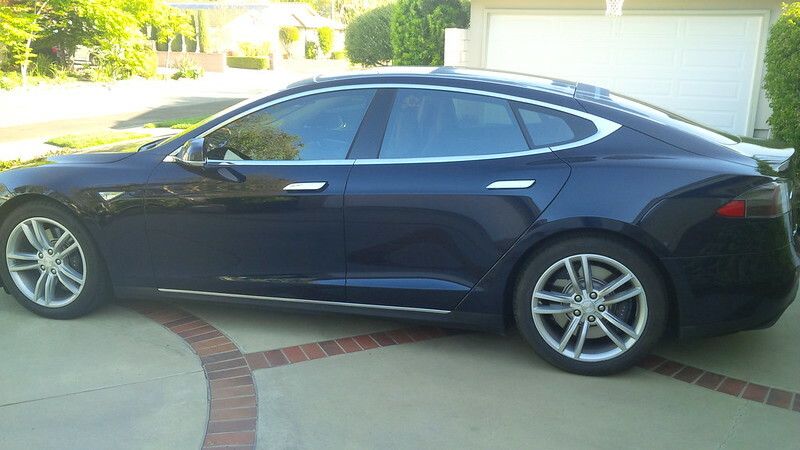 Since we haven’t seen that color before, I stepped out and introduced myself and my wife and had a pleasant conversation with the father and son that arrived in the 70D. 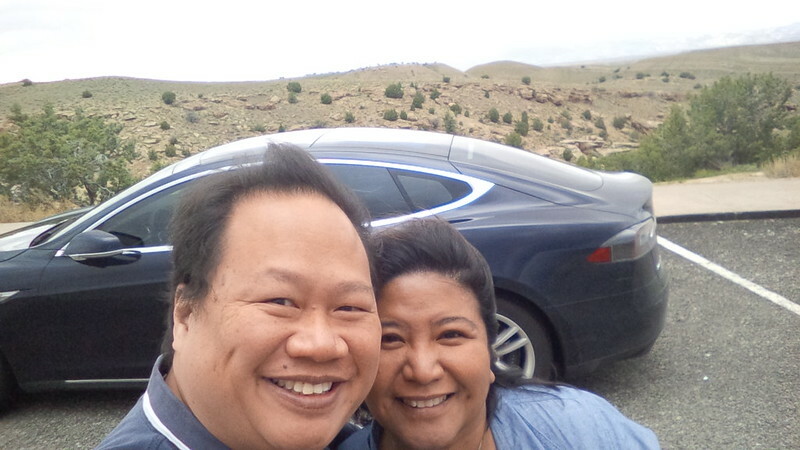 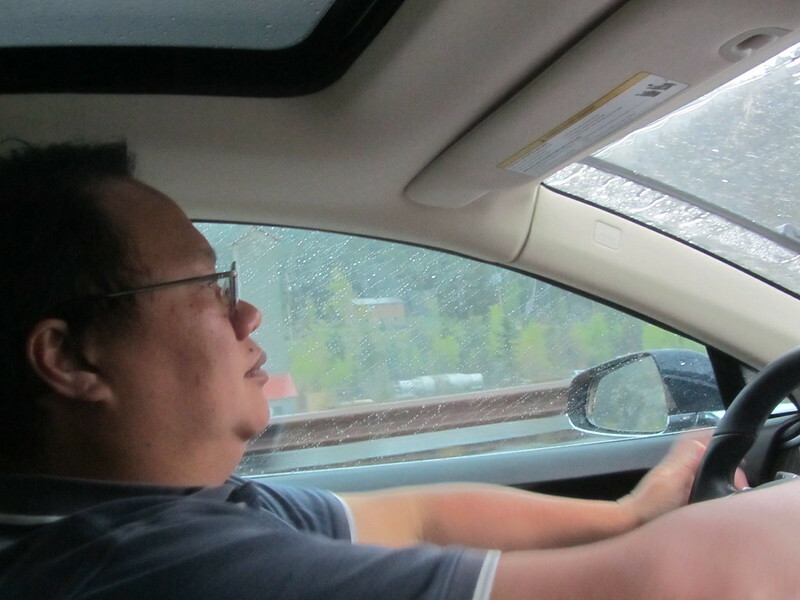 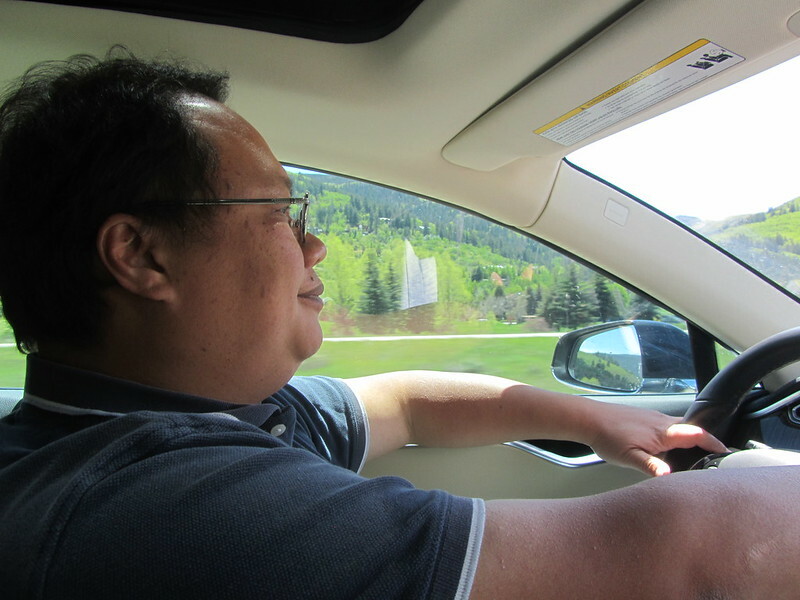 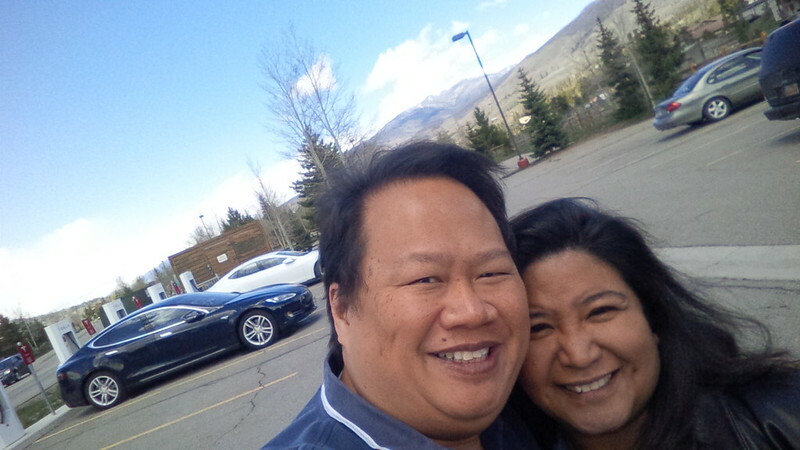 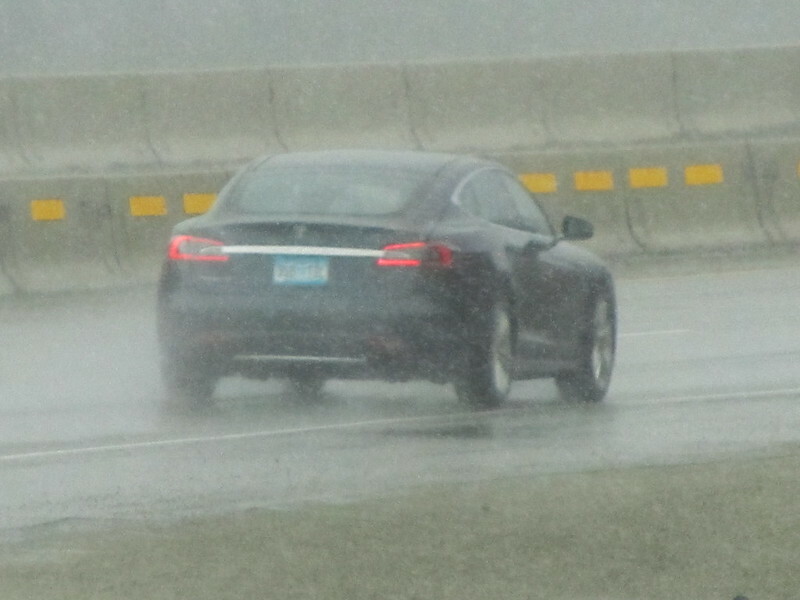 They were on a long Sunday drive that the son was using to convince his dad to go Tesla. 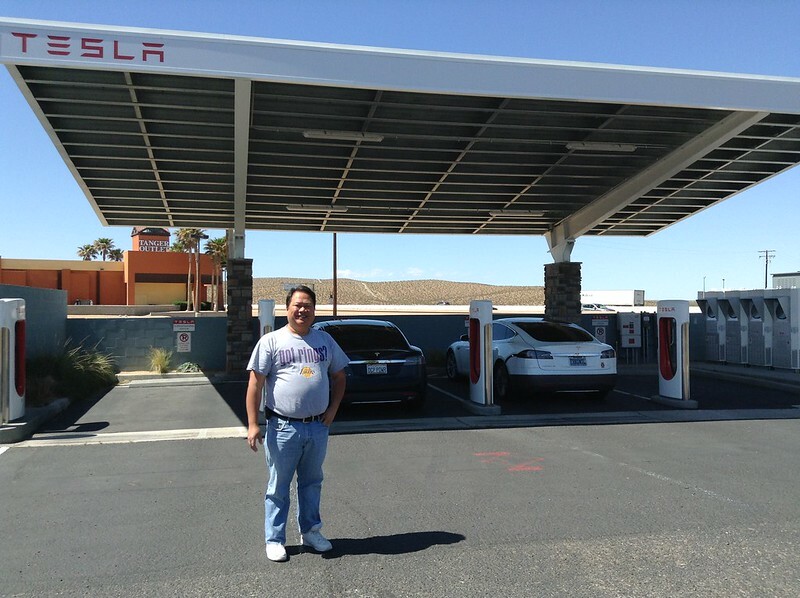 The son is a Service Concierge at the Palm Springs Tesla location and they took some back way to the supercharger from there. 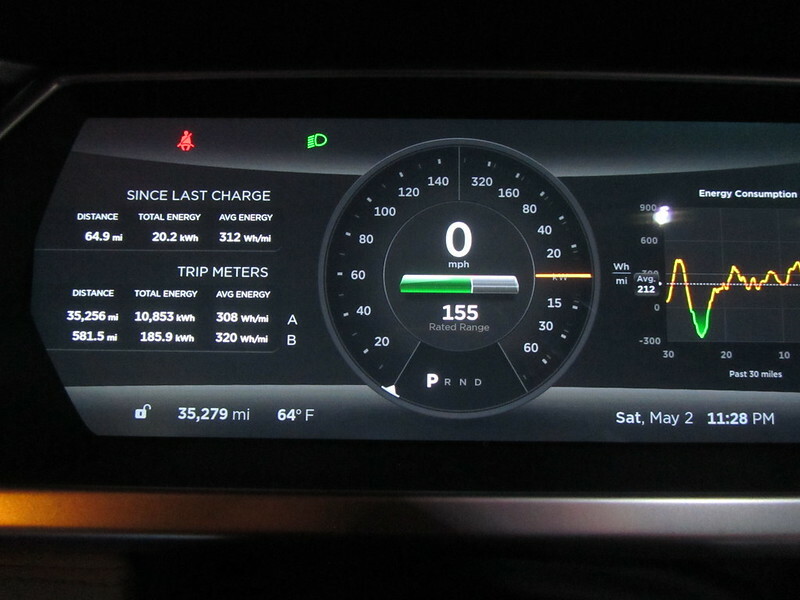 We spent the time helping the son make the case for Tesla before we wished them well as they were on their way to dinner. 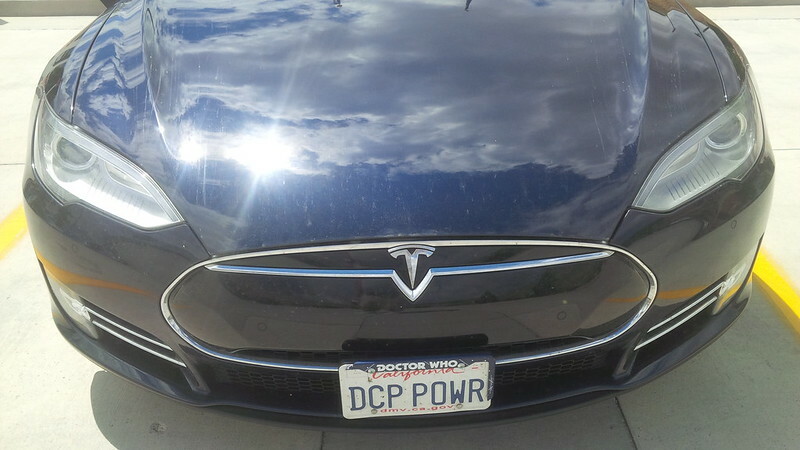 Here’s to hoping that the dad followed his son’s advice. 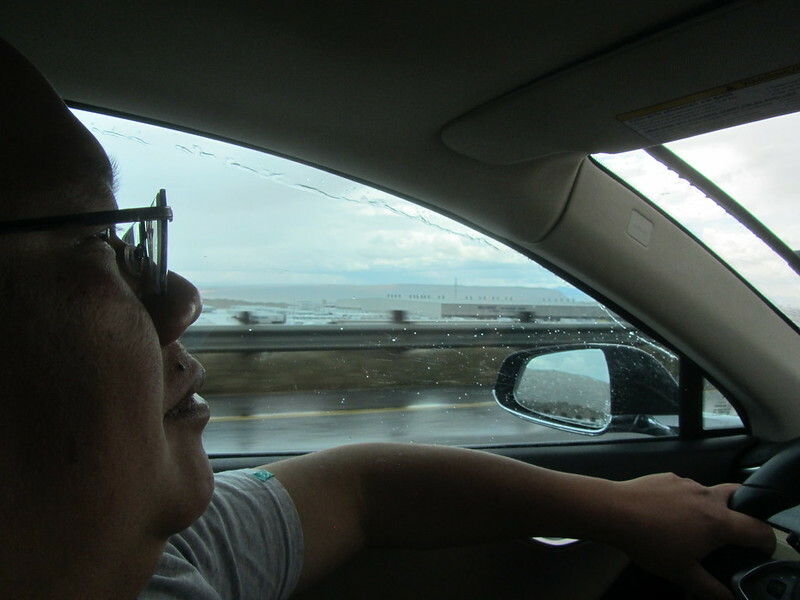 We arrived in our home city just passed 11:00 PM and decided to counter our Atlantic Ocean view with a photo of the car by the Pacific. 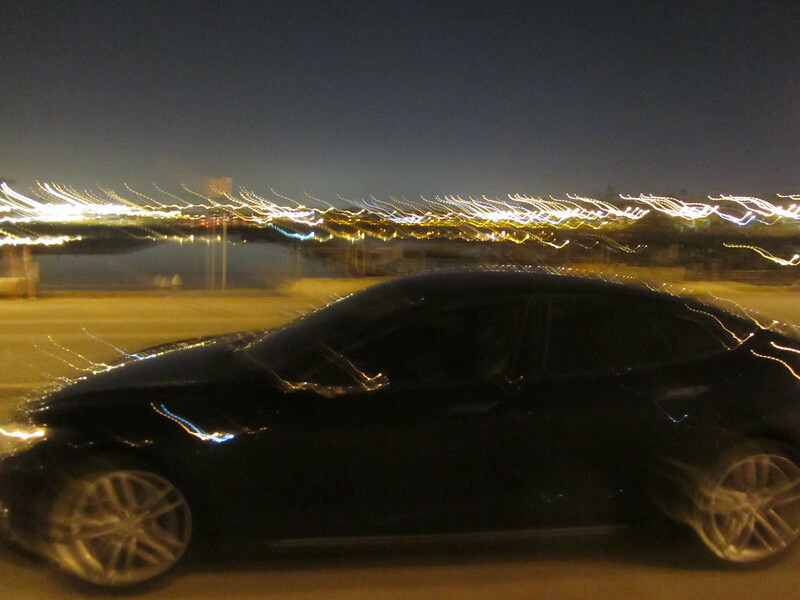 We headed to Seal Beach for the beach parking lot shot, but it was too late and dark. 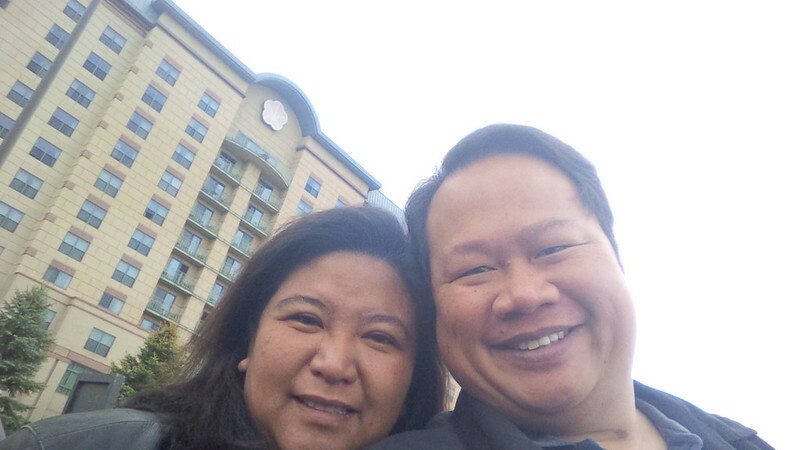 So, we opted for a Marina shot in Long Beach for our arrival night. 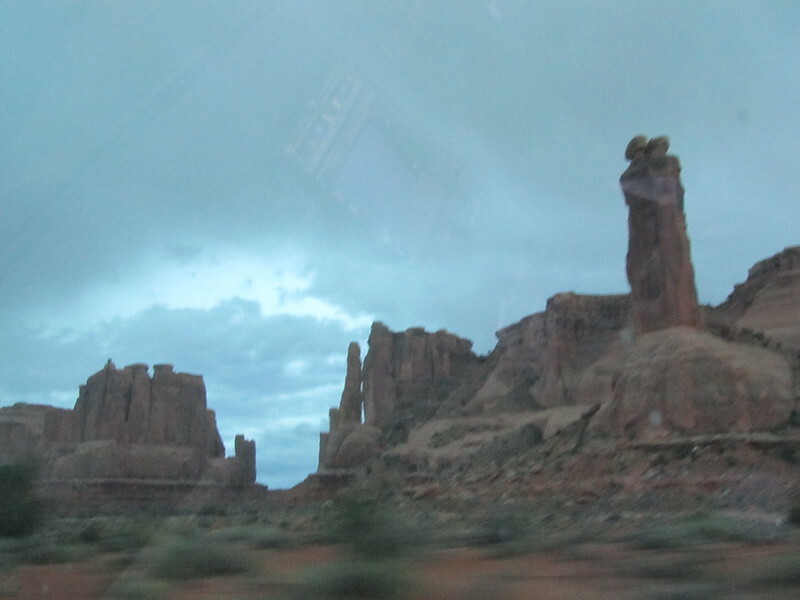 Besides, readers of previous days of this blog know what time it is when our shots are REALLY blurry. 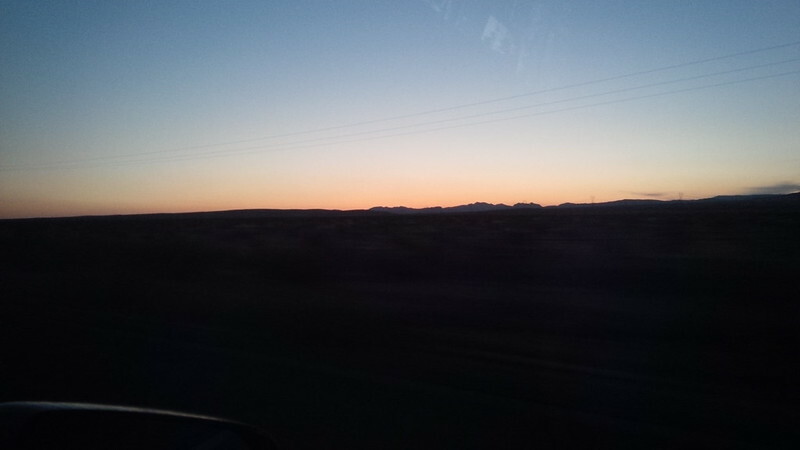 And after 23 days on the road, it is definitely time to get to sleep. 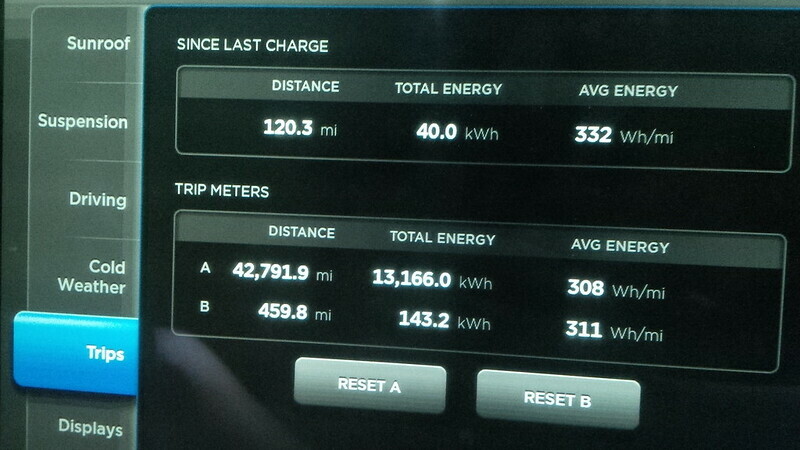 After 23 days on the road. 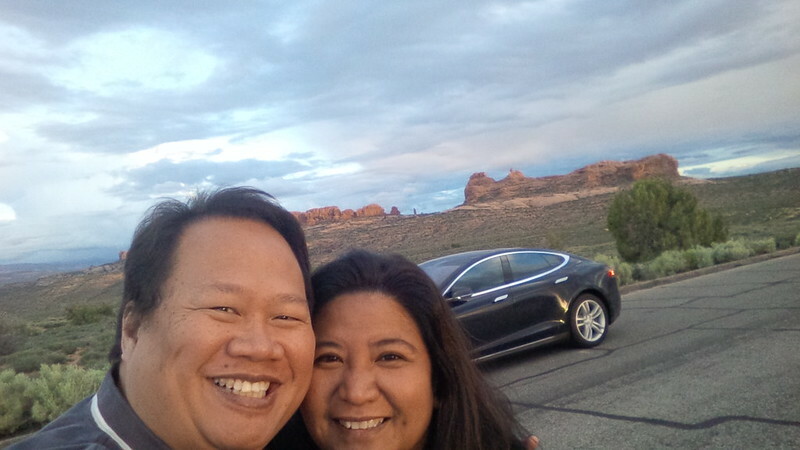 25 other states visited. 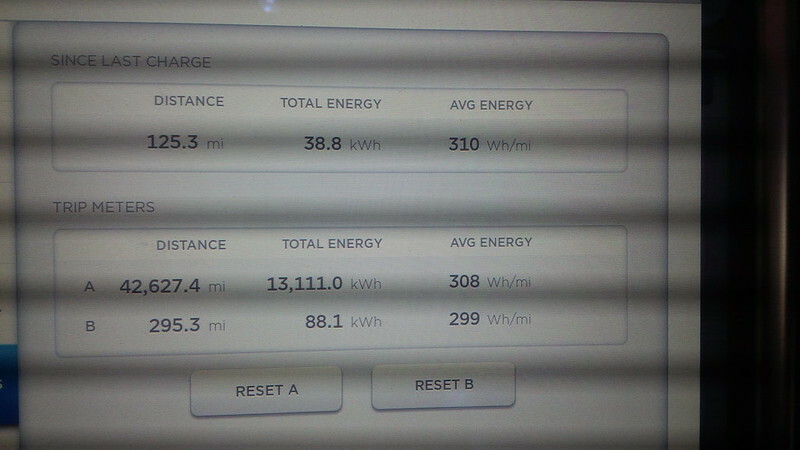 8,245 miles. 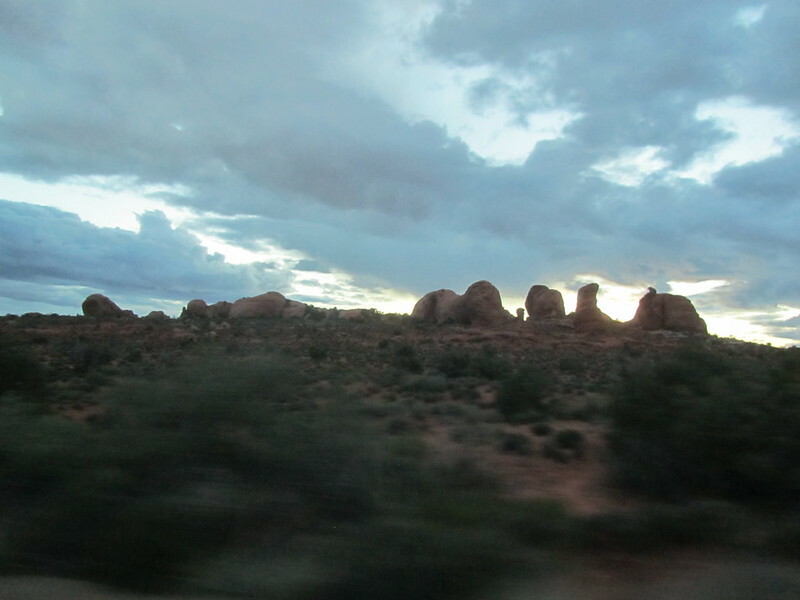 As varied an experience that we’ve had in our various hotels, it was great to once again sleep on our bed and be home. 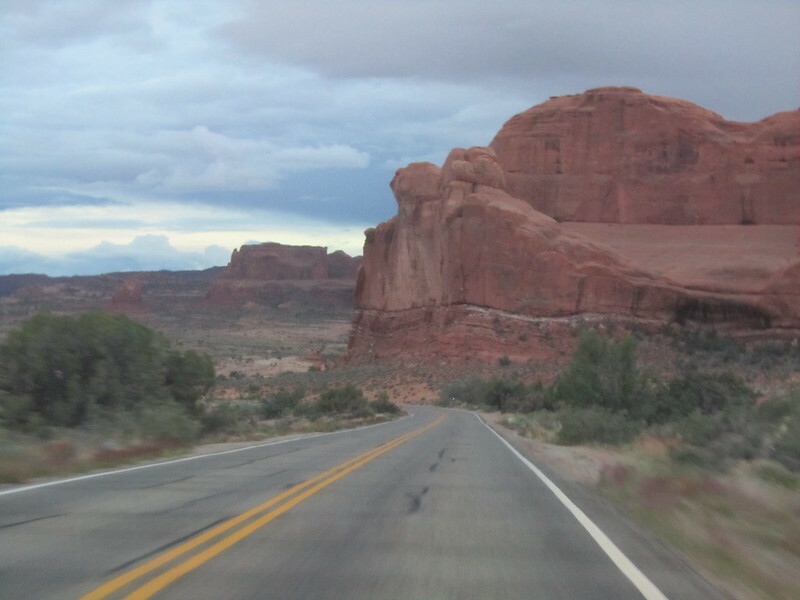 We’re taking tomorrow off, it’s a Holiday after all, and publish our trip conclusions and such on Tuesday, three hours later than we’ve been publishing. 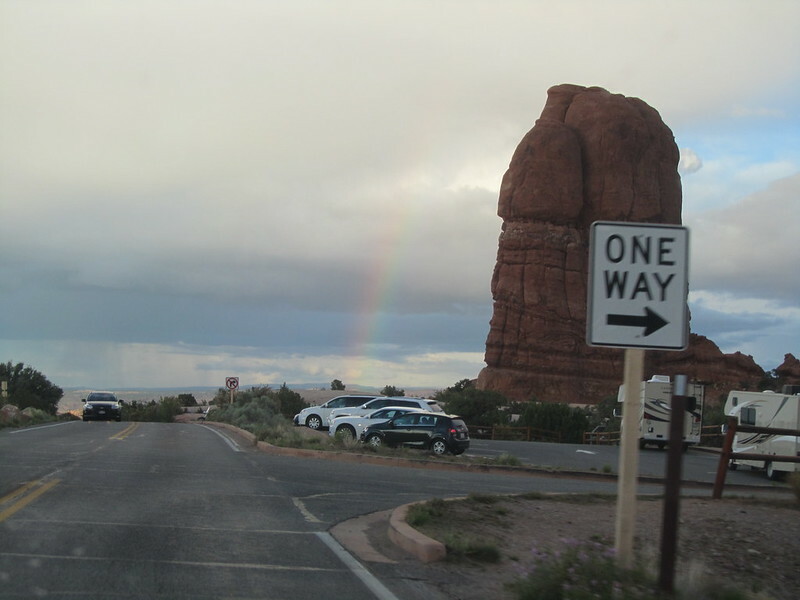 So, come back and join us for that, will you? 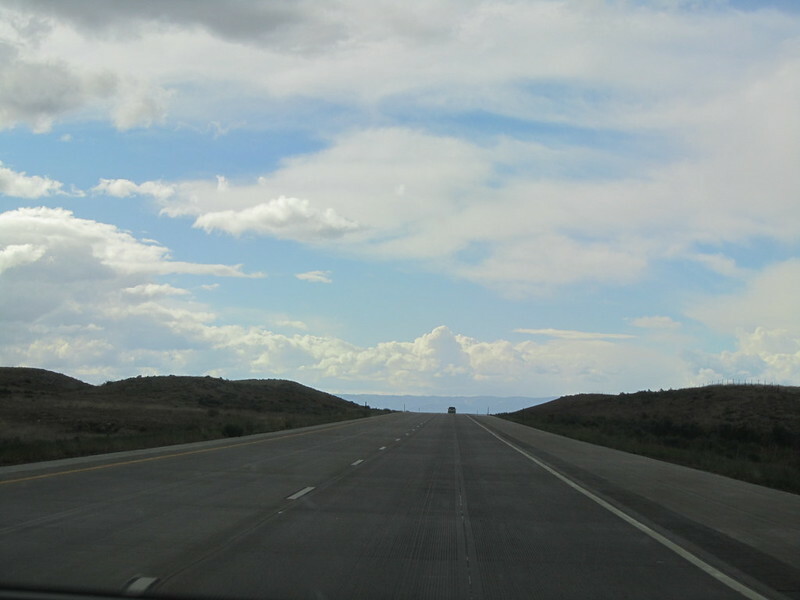 As we’ve neared the end of this series of posts, after the post on Tuesday, I will be updating the blog somewhat randomly. 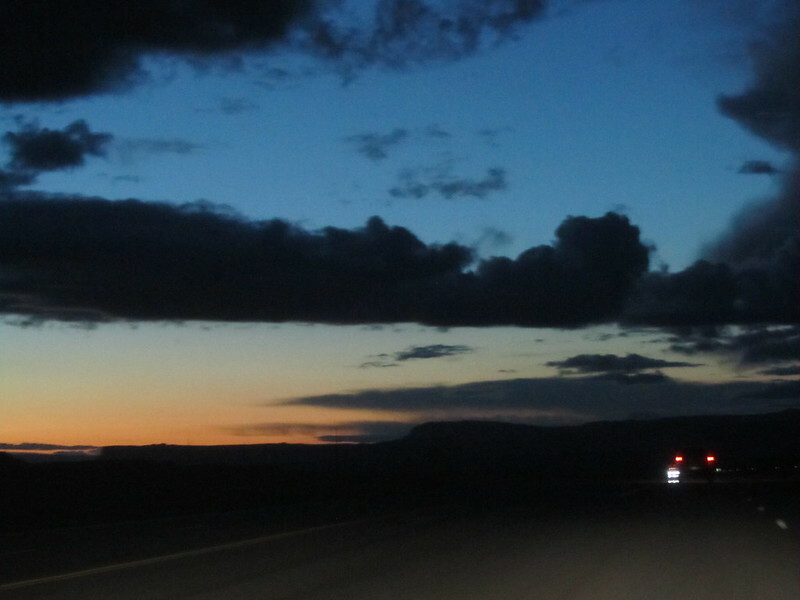 So, if you’re interested in being notified, just subscribe to the blog (there’s a choice to do so in the sidebar) or follow me on Twitter, I tend to auto-tweet new posts there. 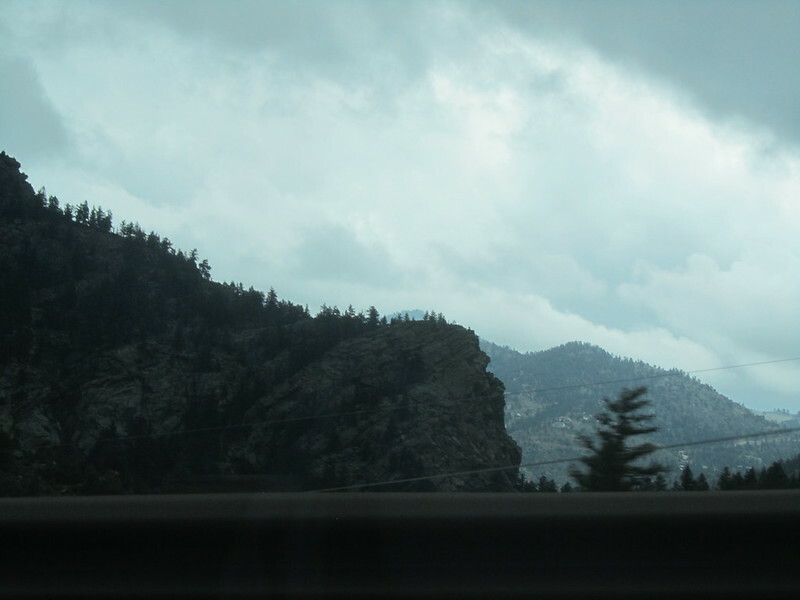 Go on to Lessons Learned.